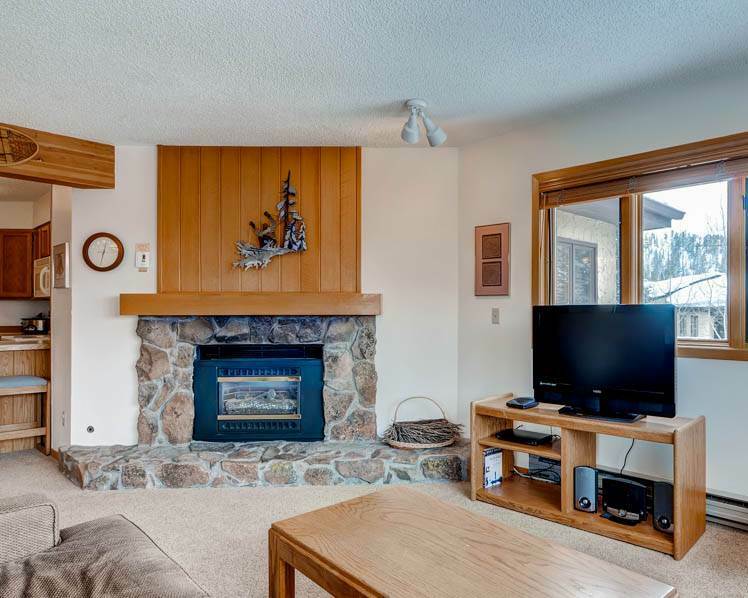 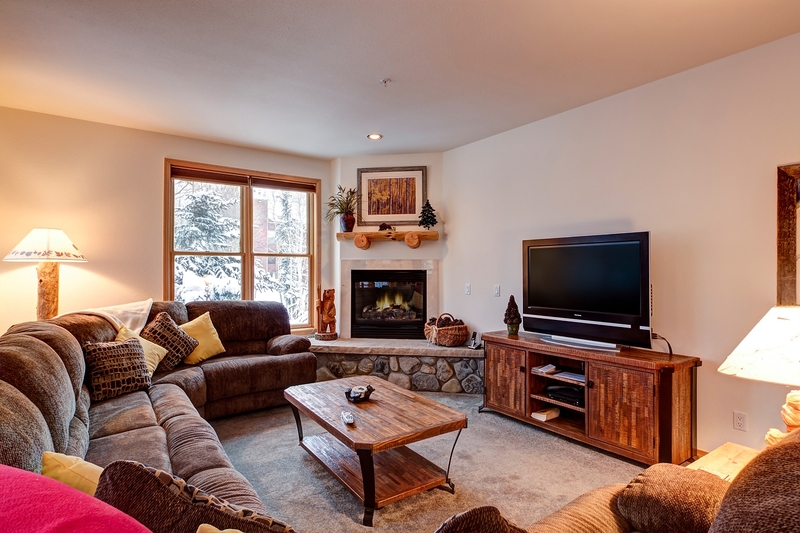 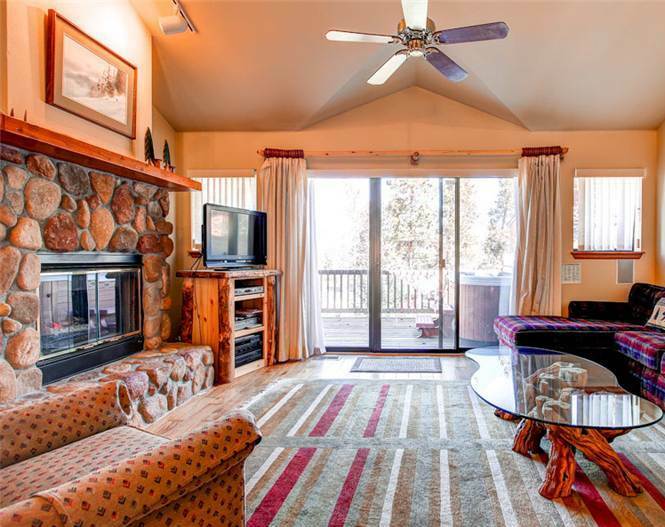 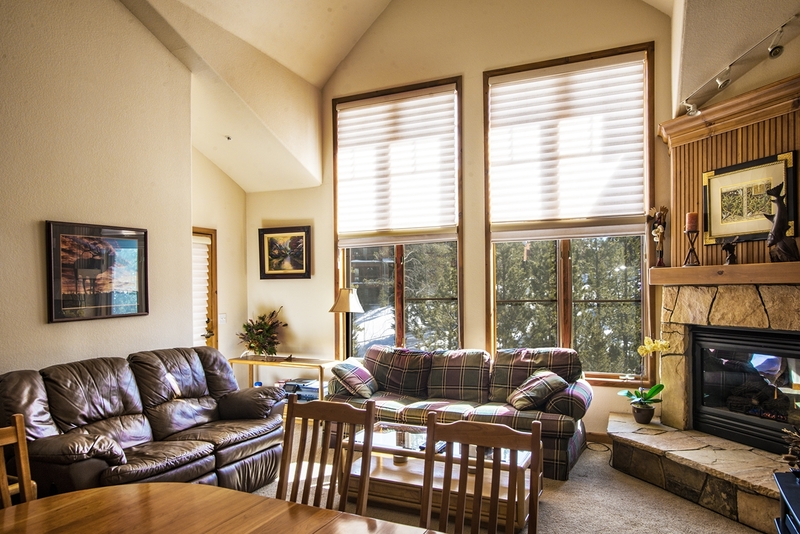 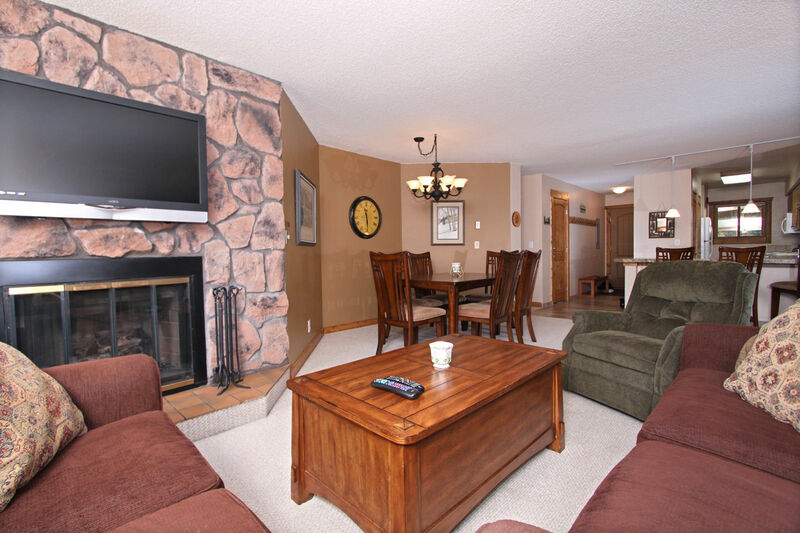 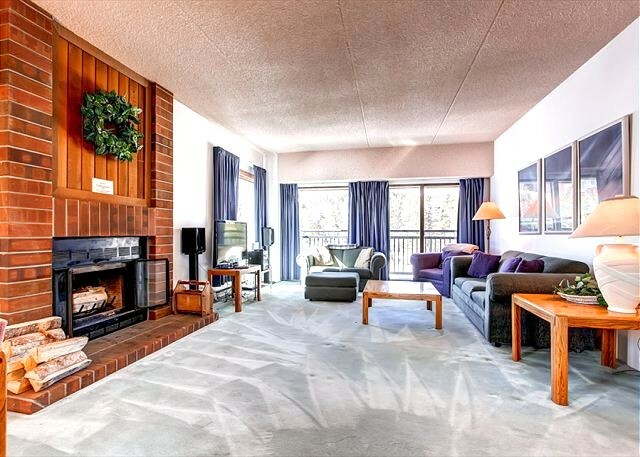 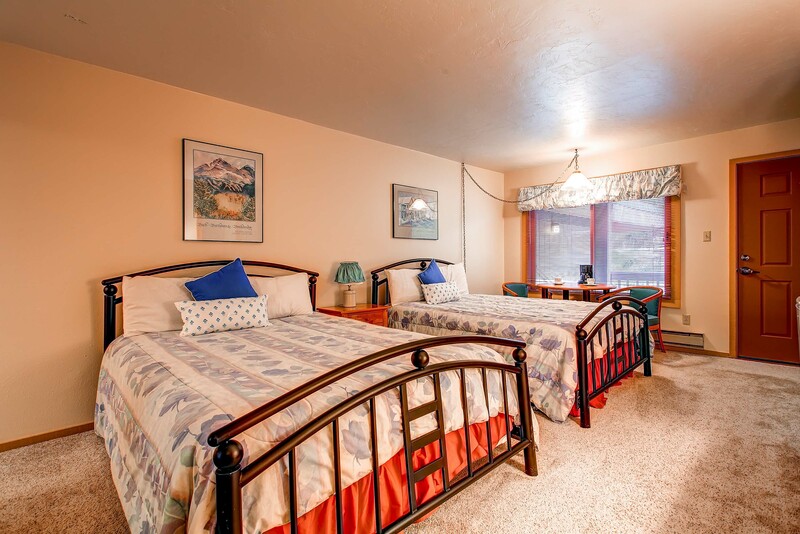 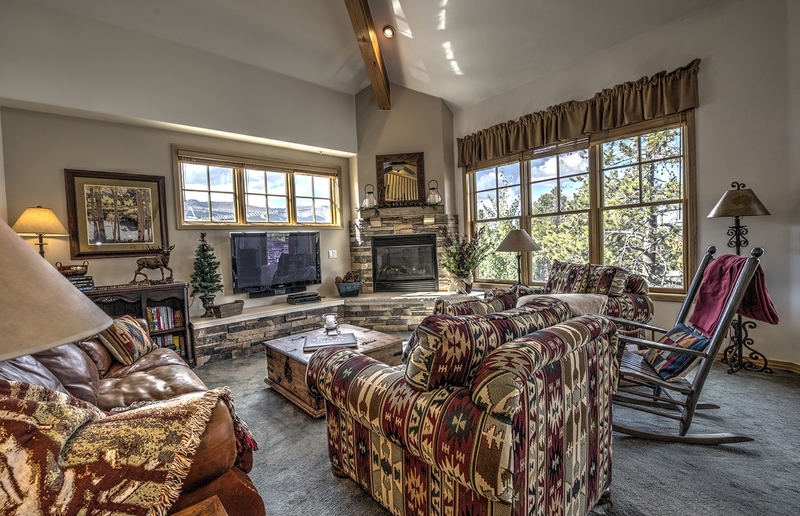 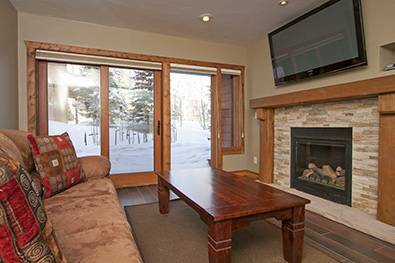 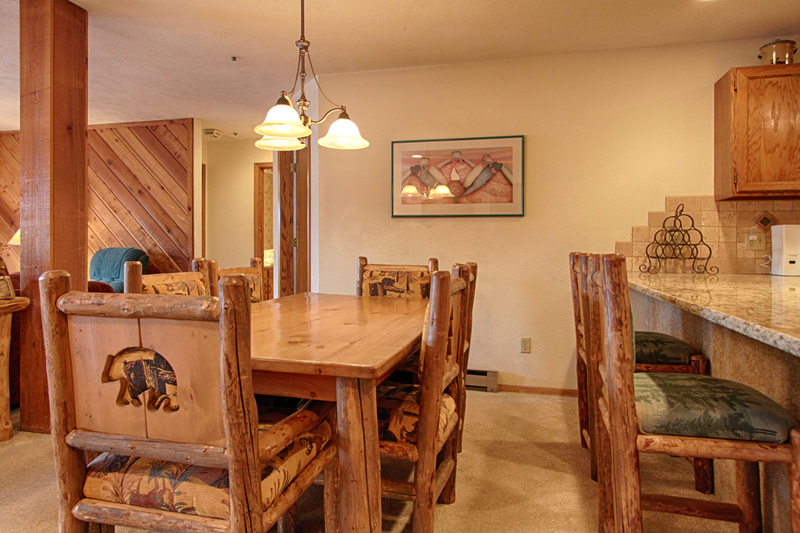 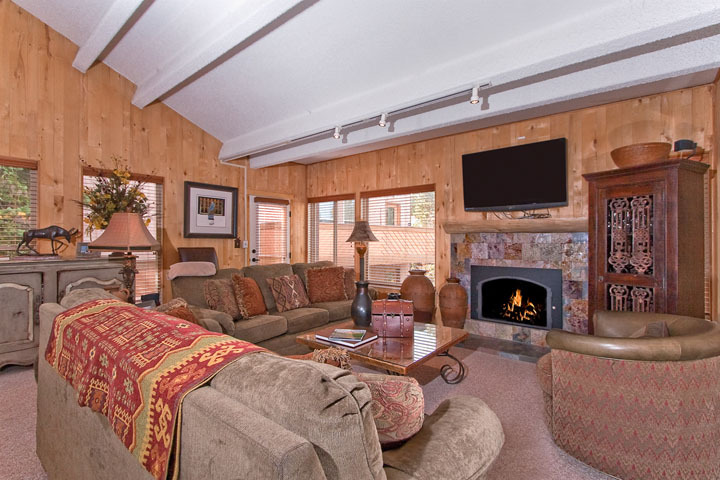 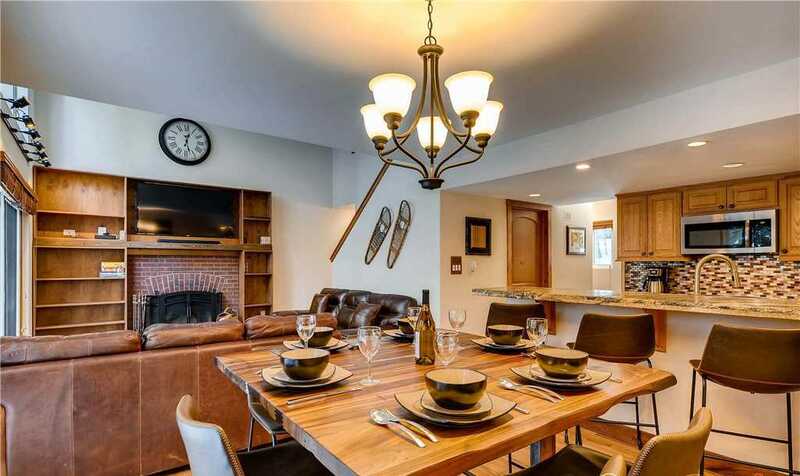 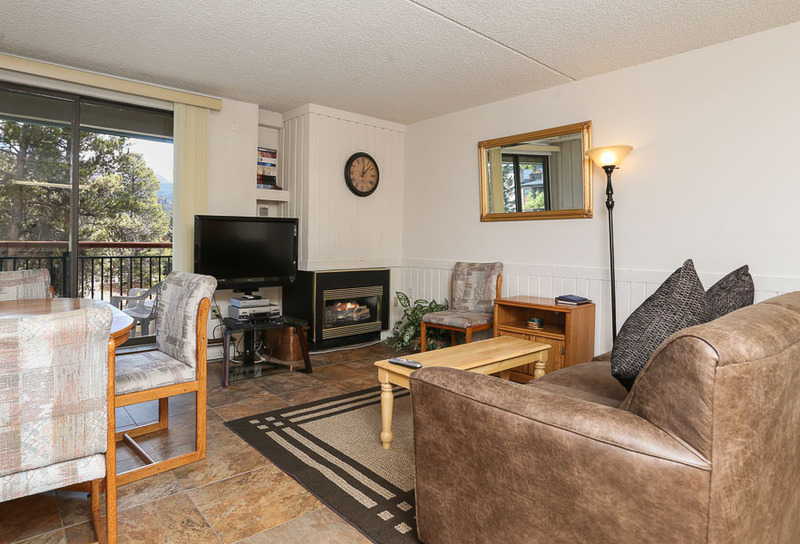 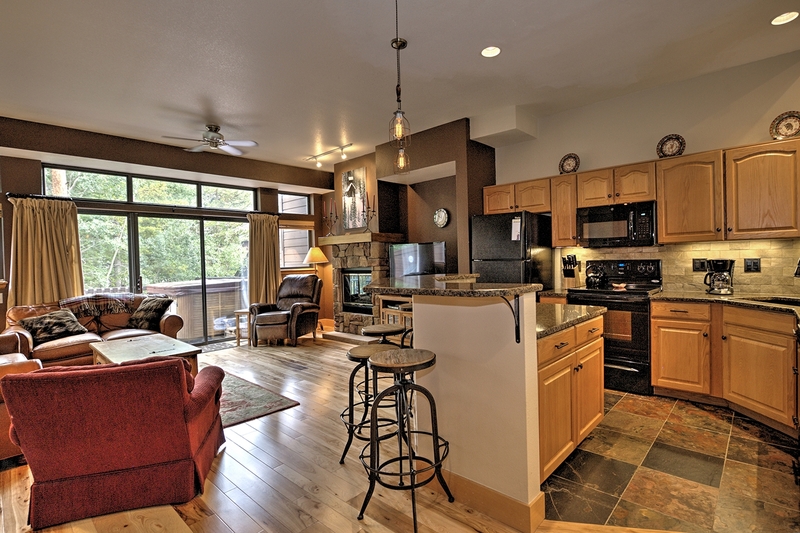 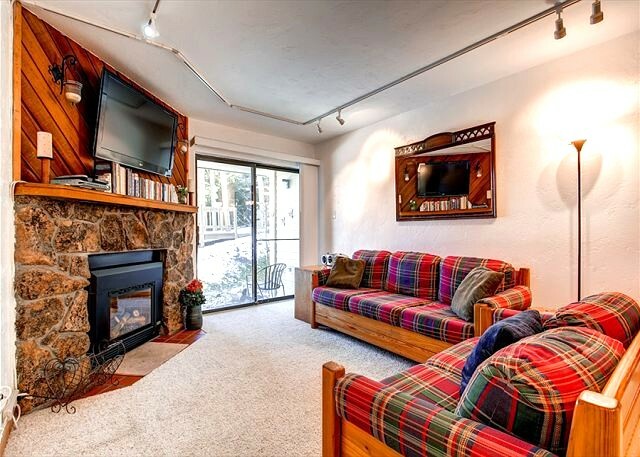 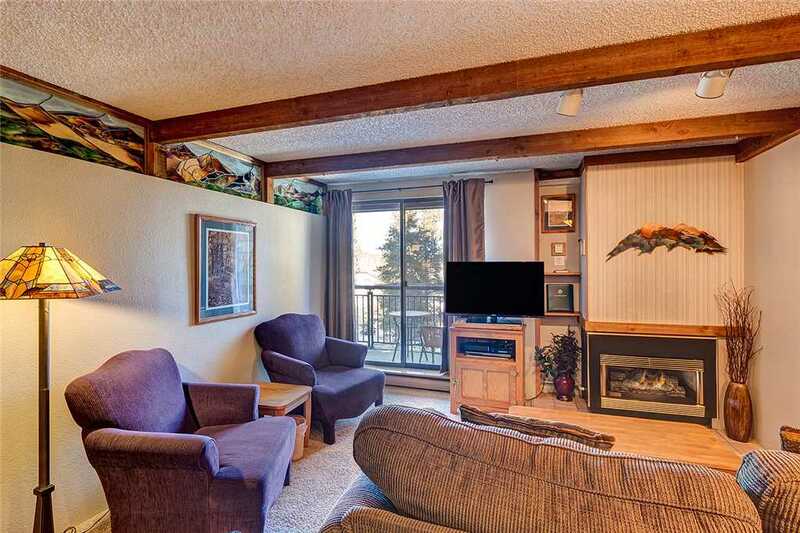 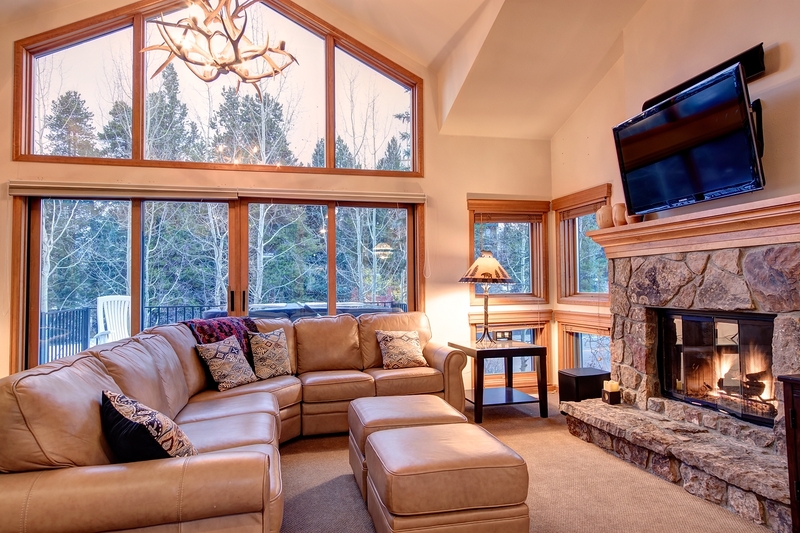 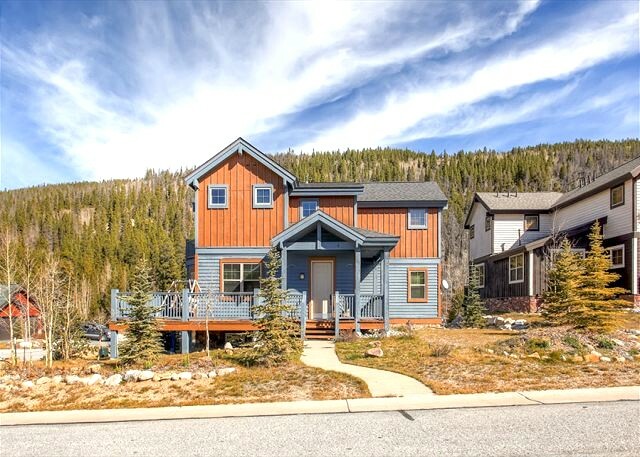 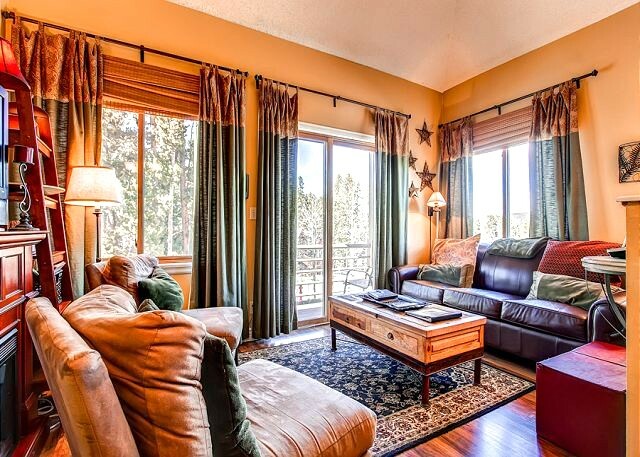 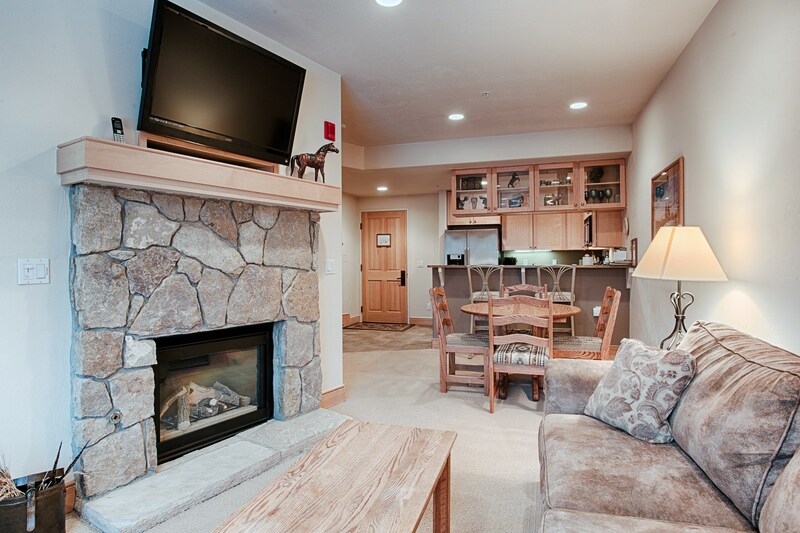 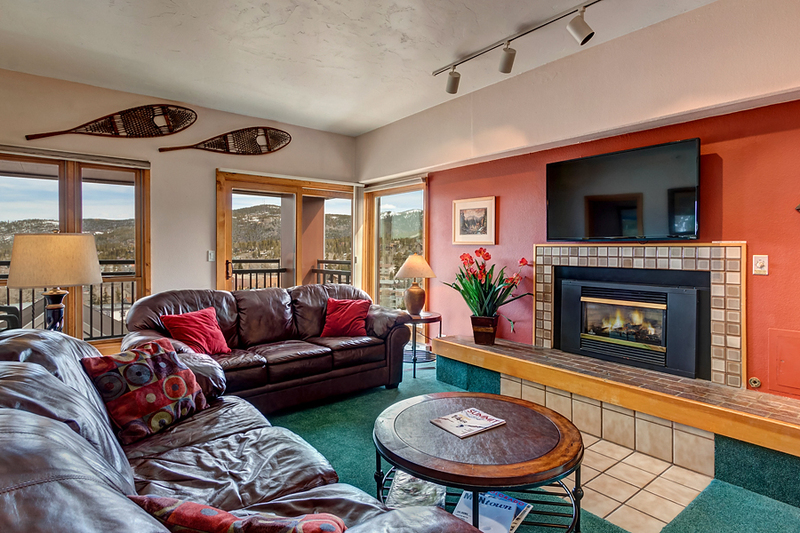 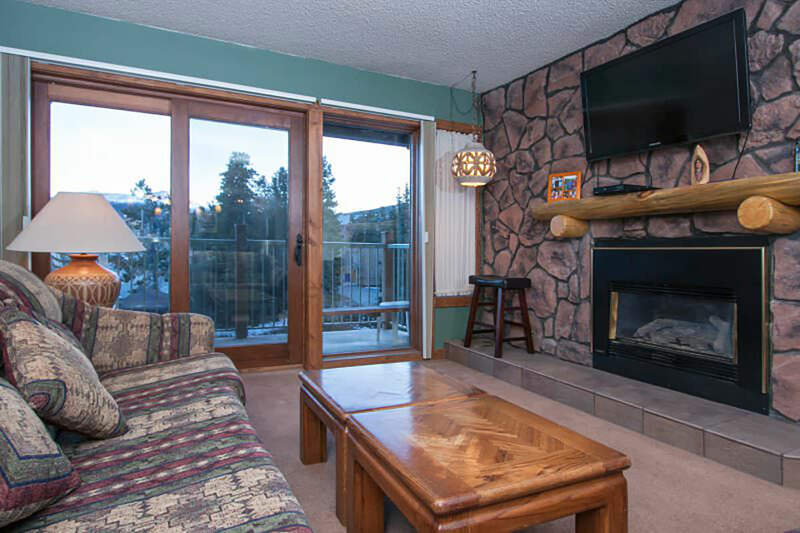 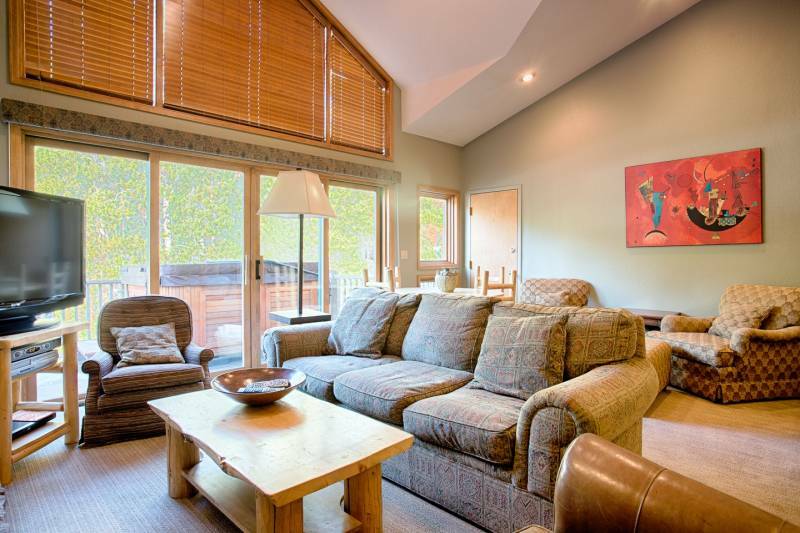 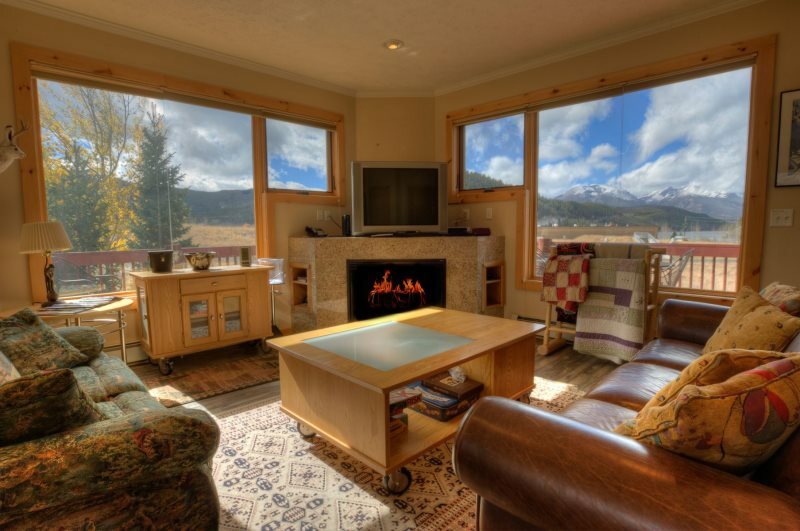 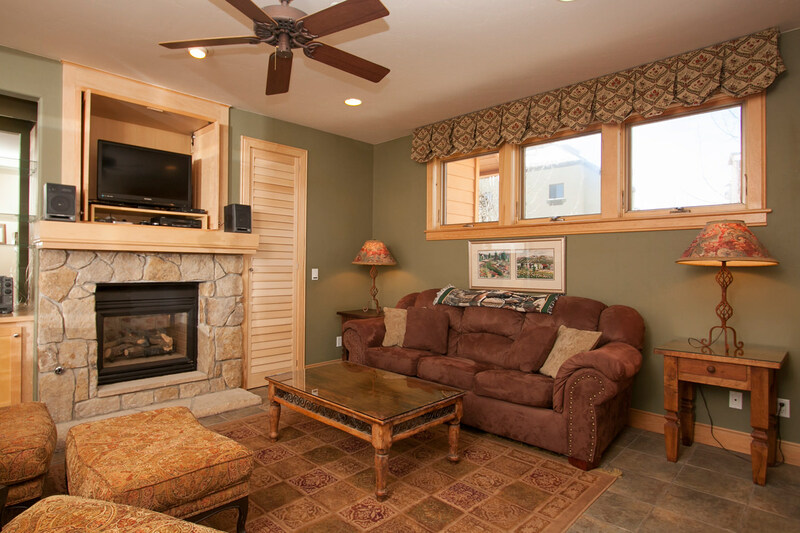 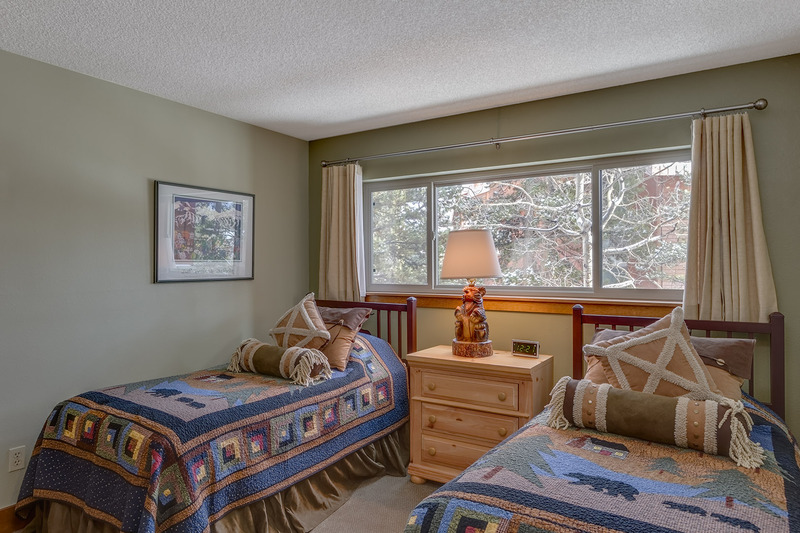 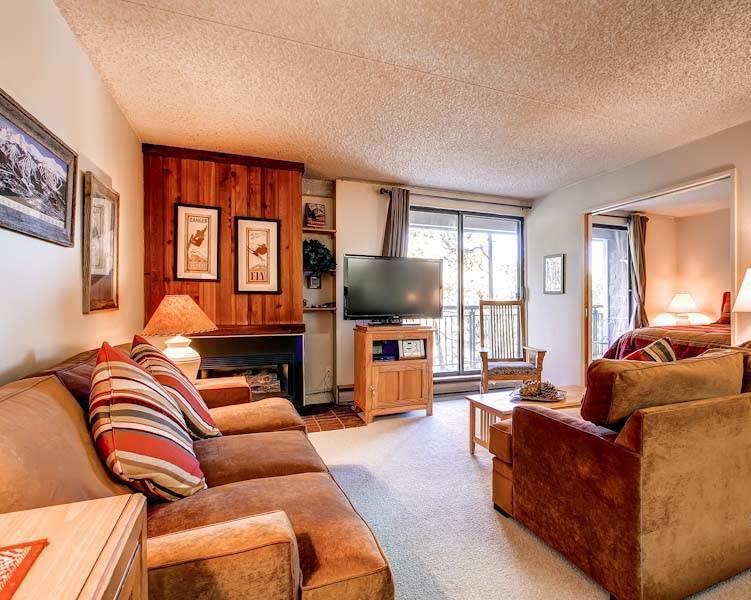 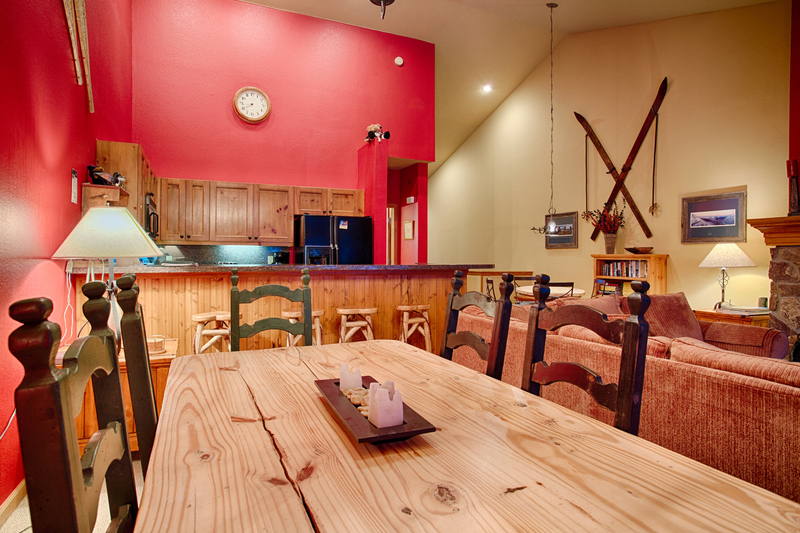 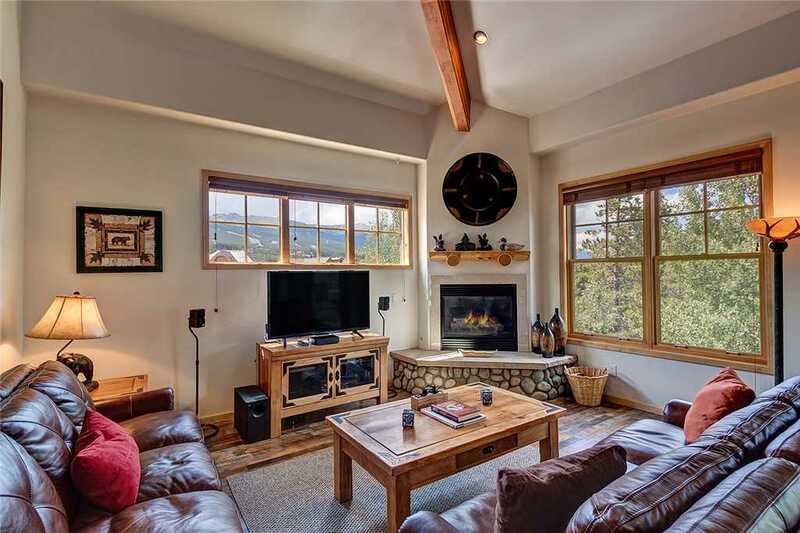 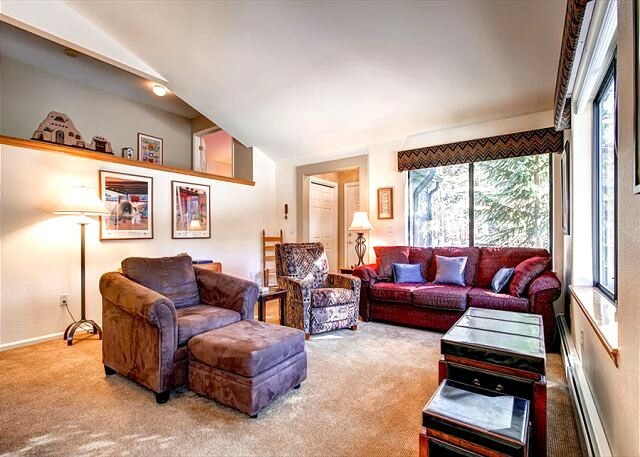 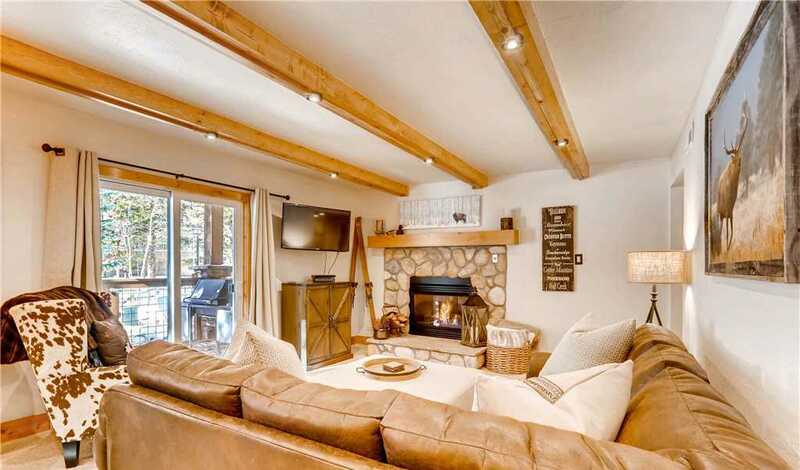 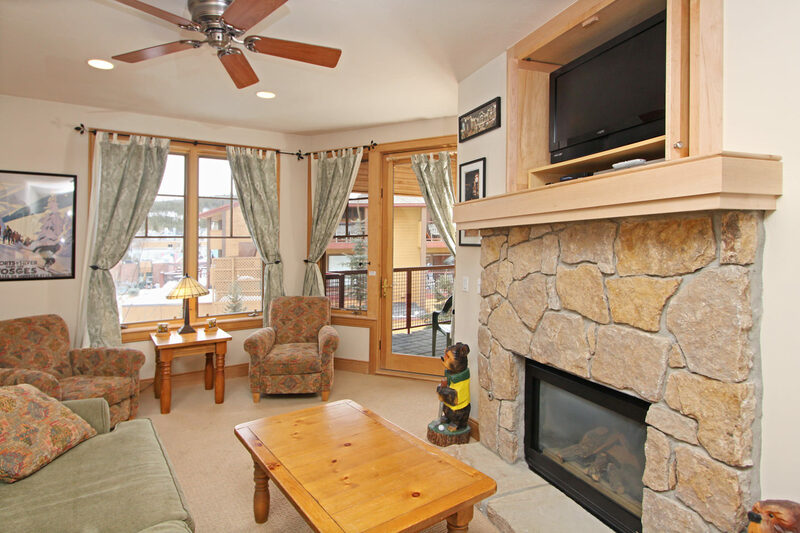 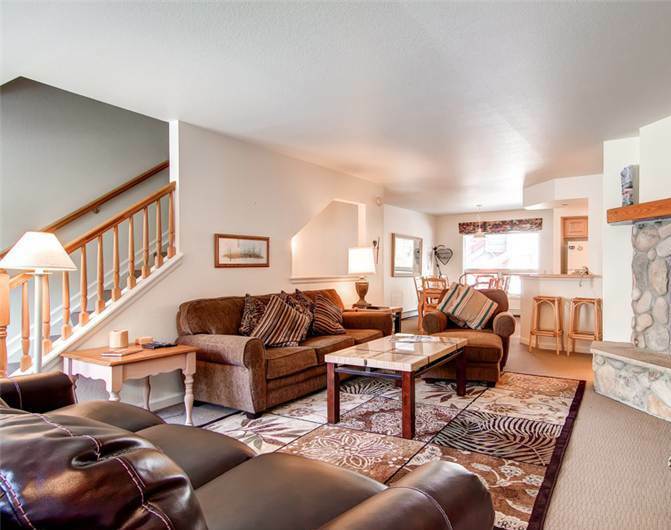 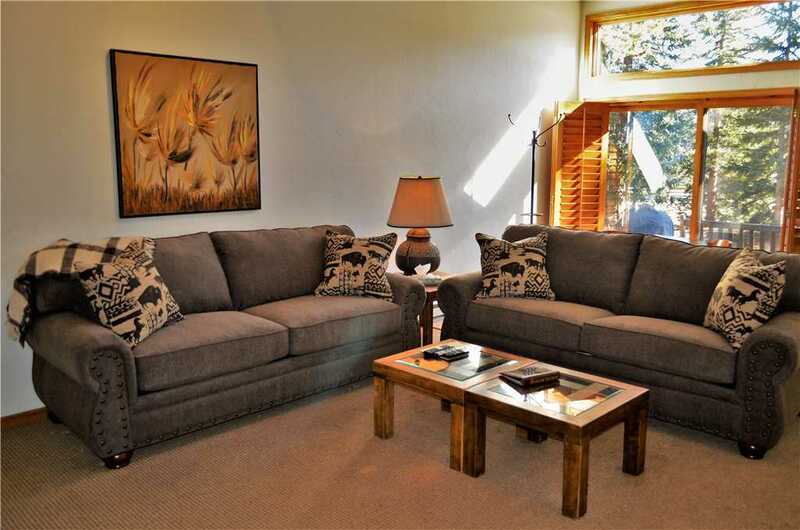 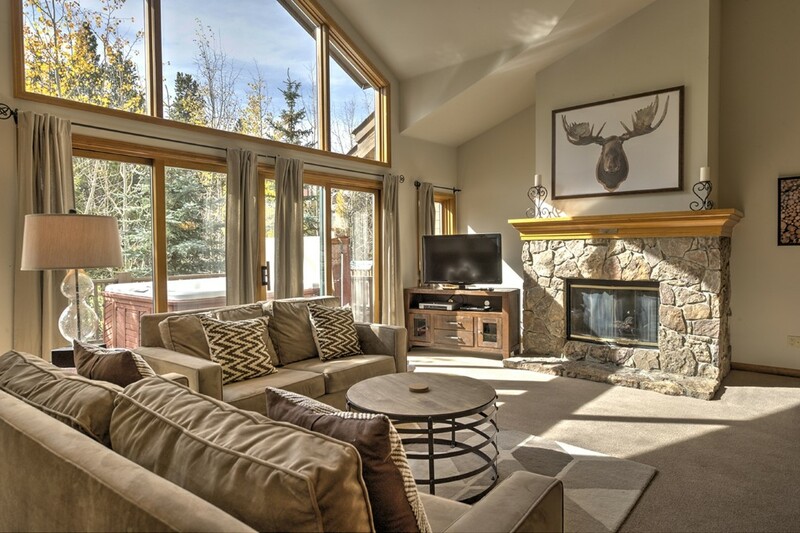 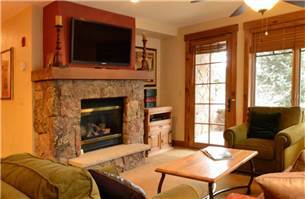 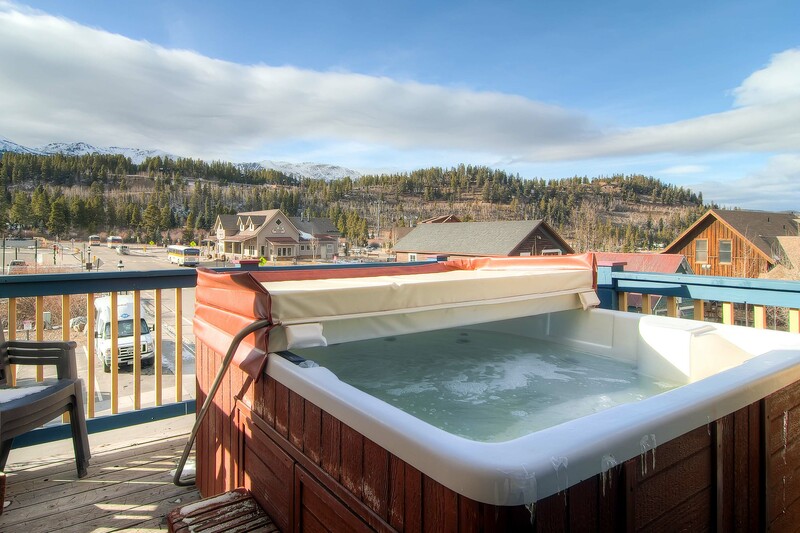 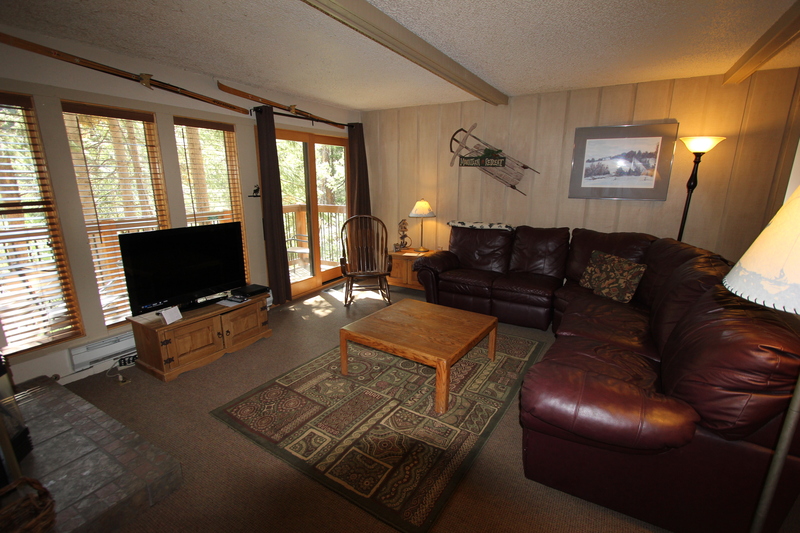 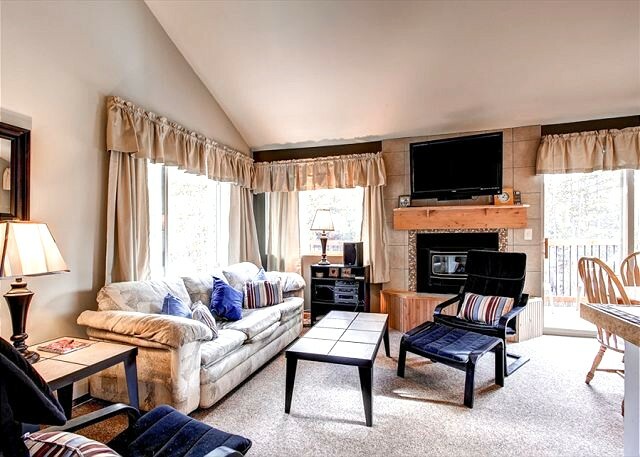 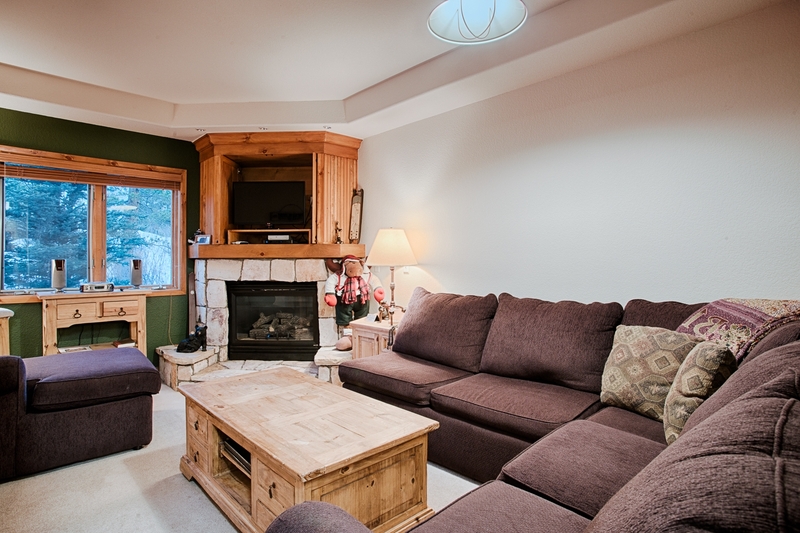 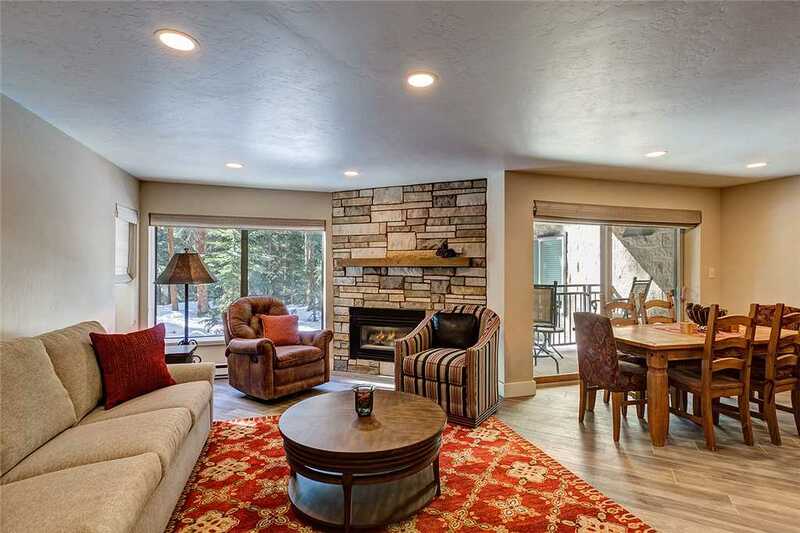 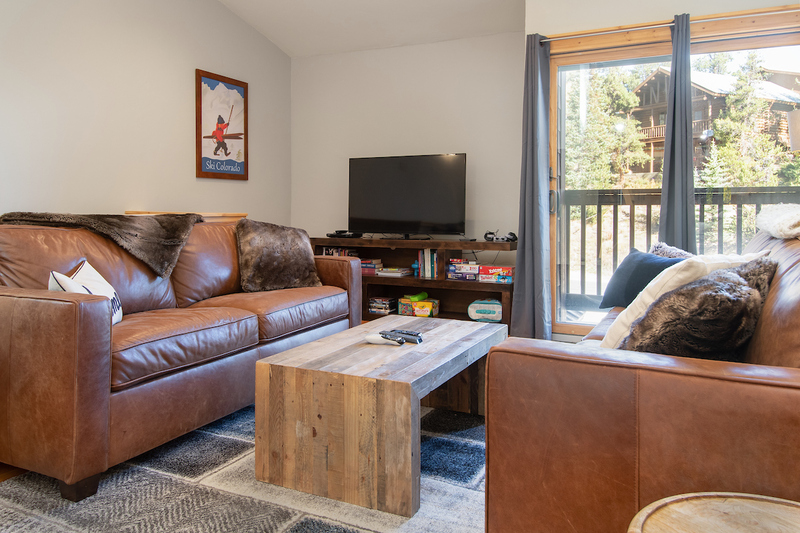 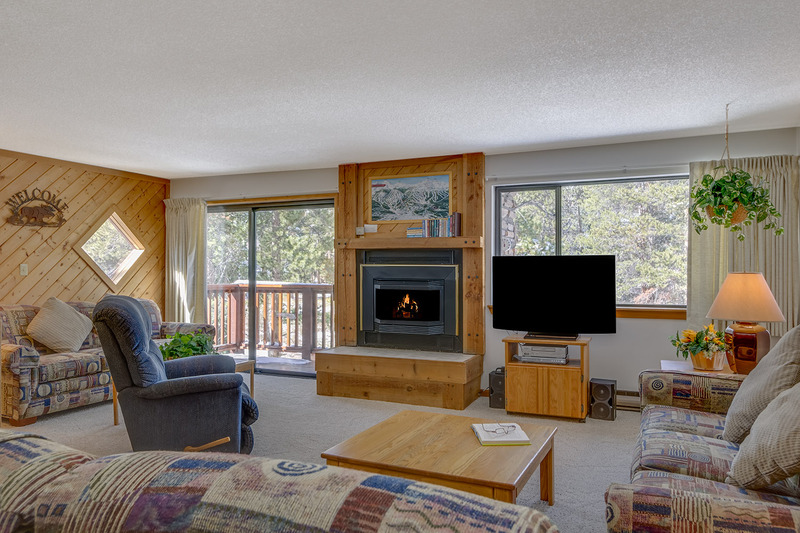 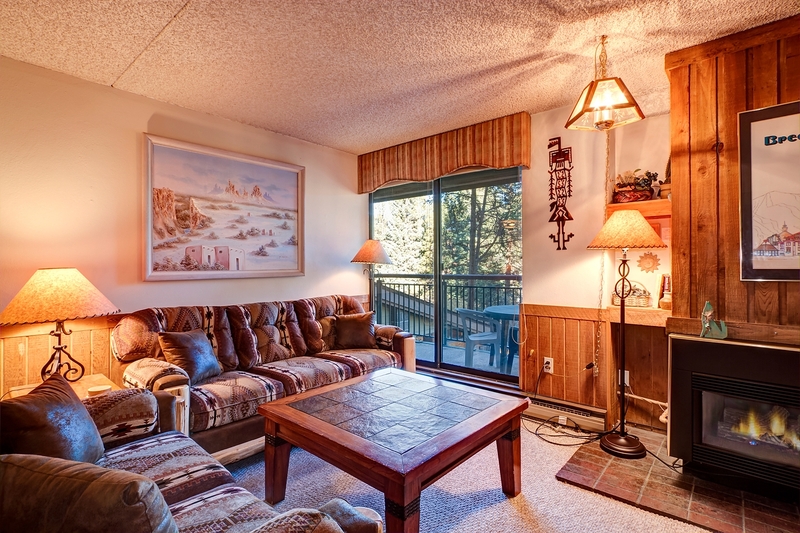 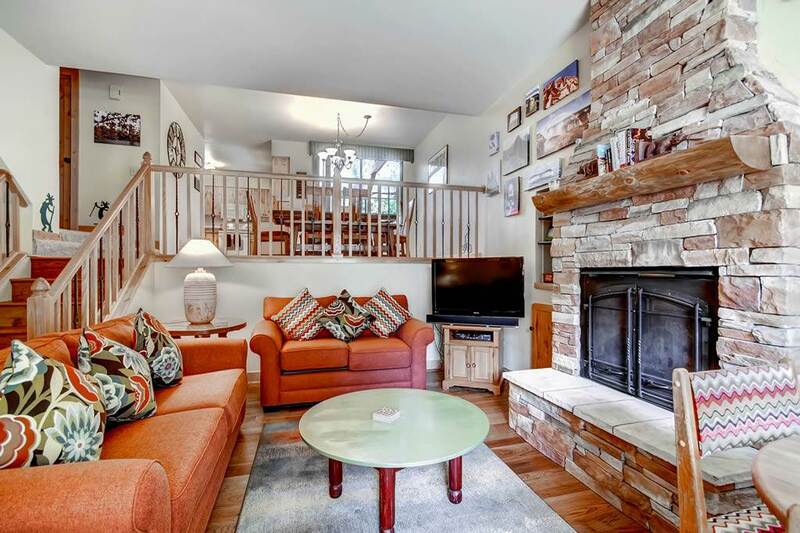 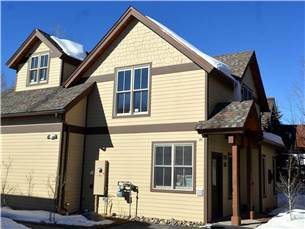 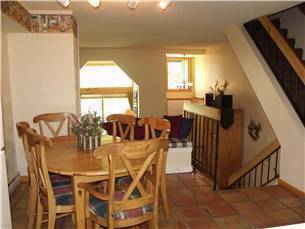 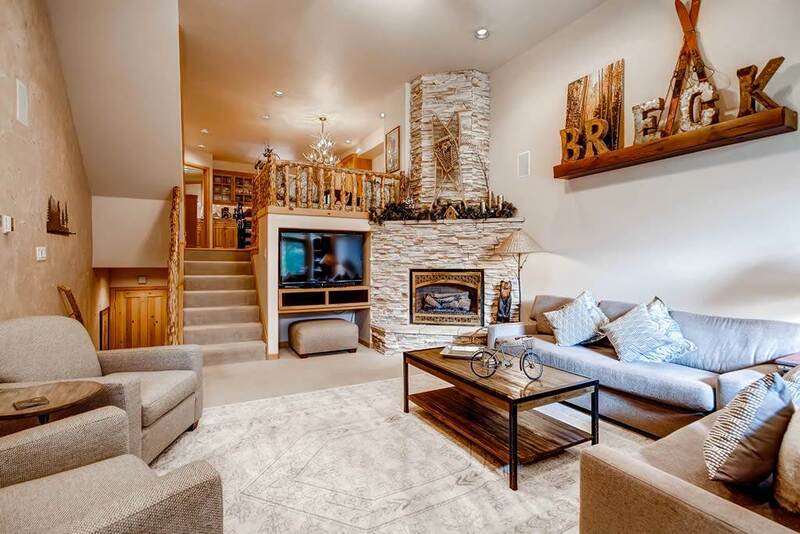 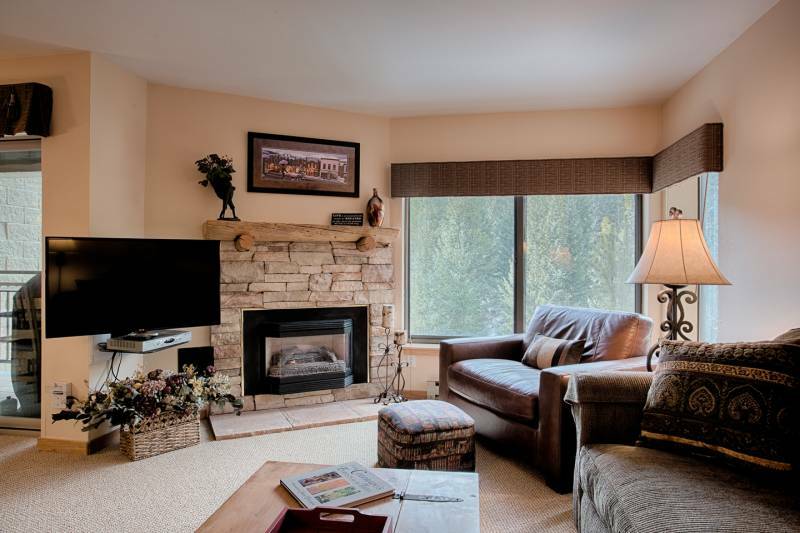 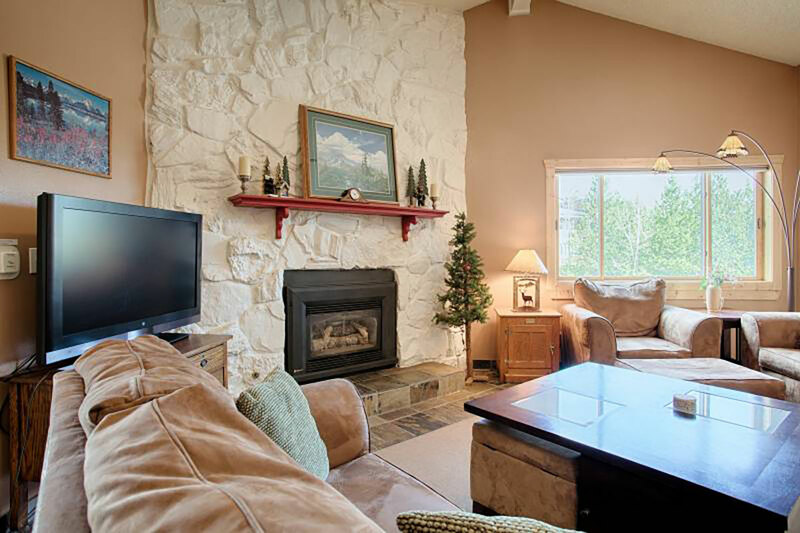 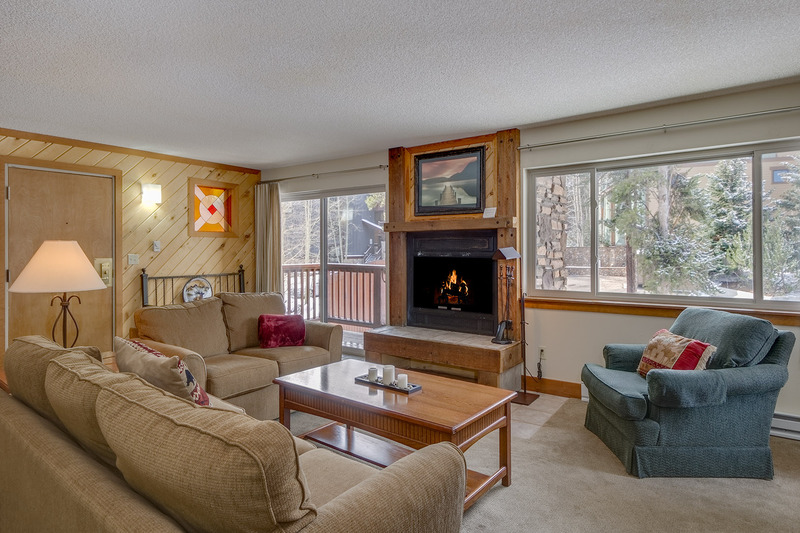 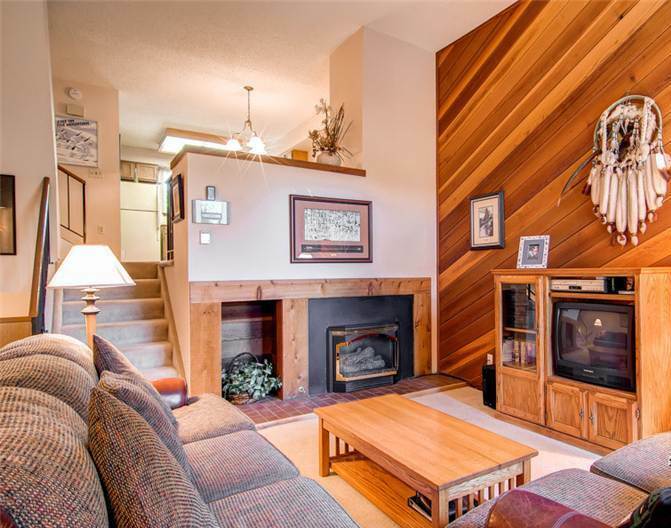 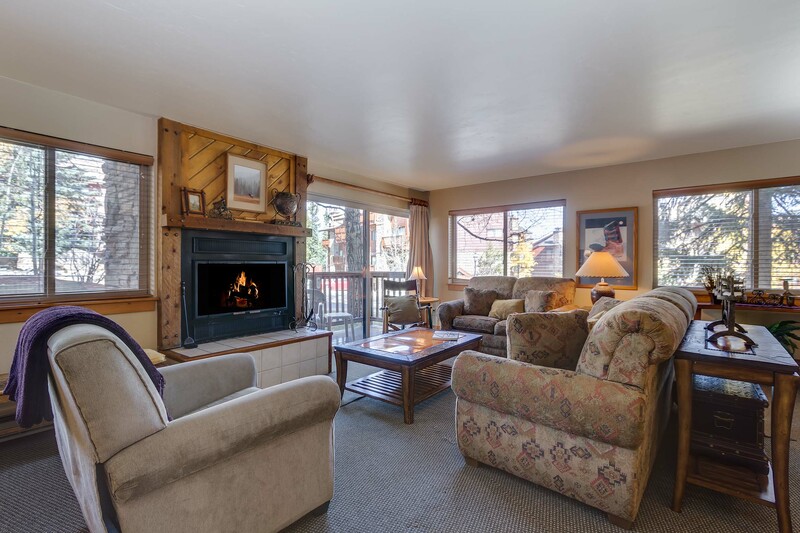 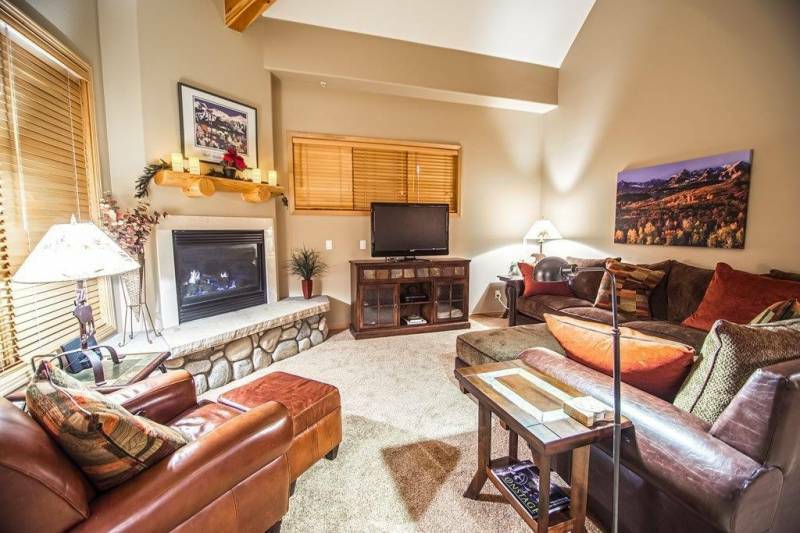 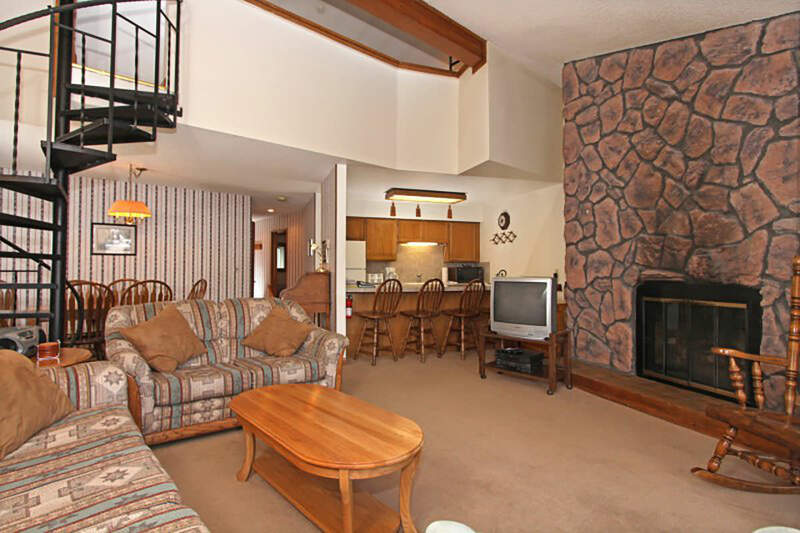 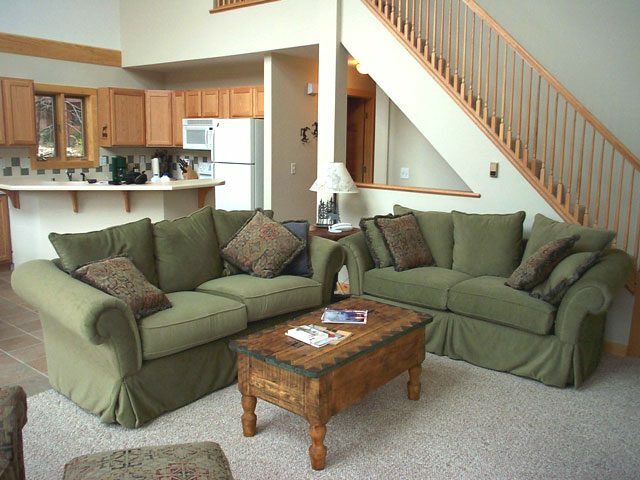 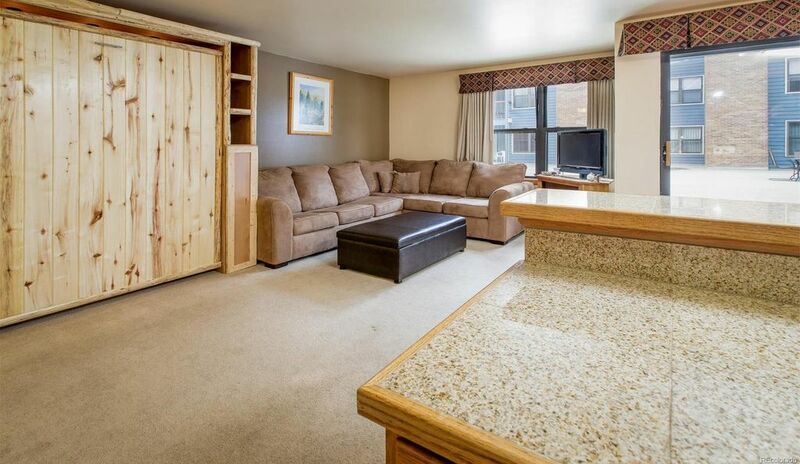 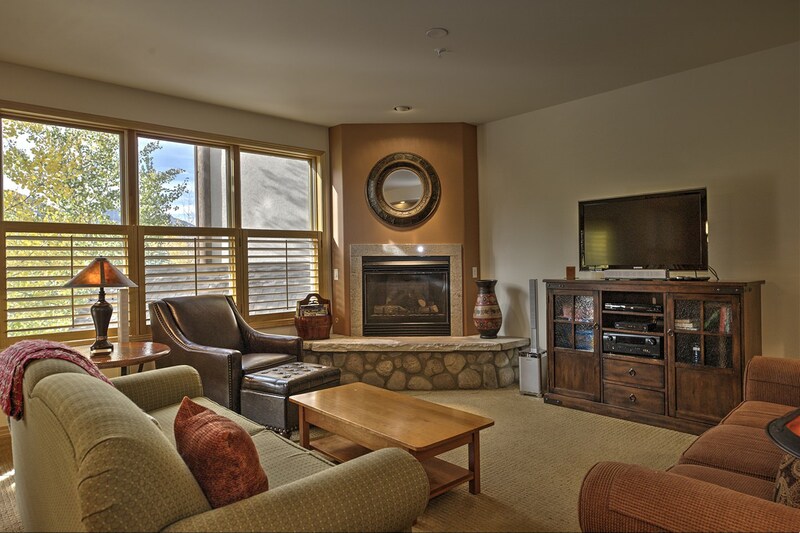 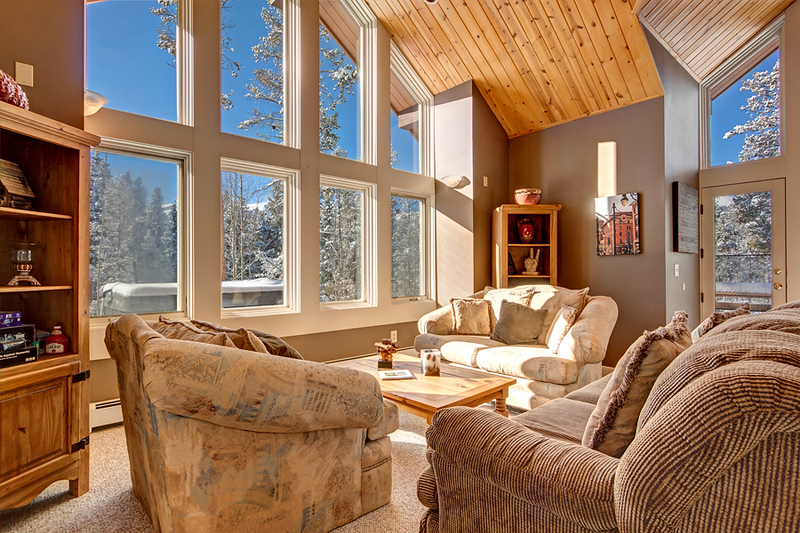 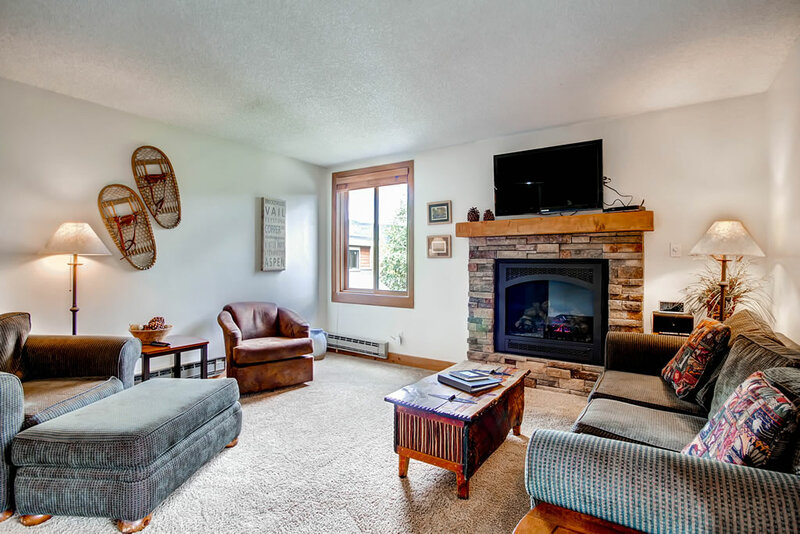 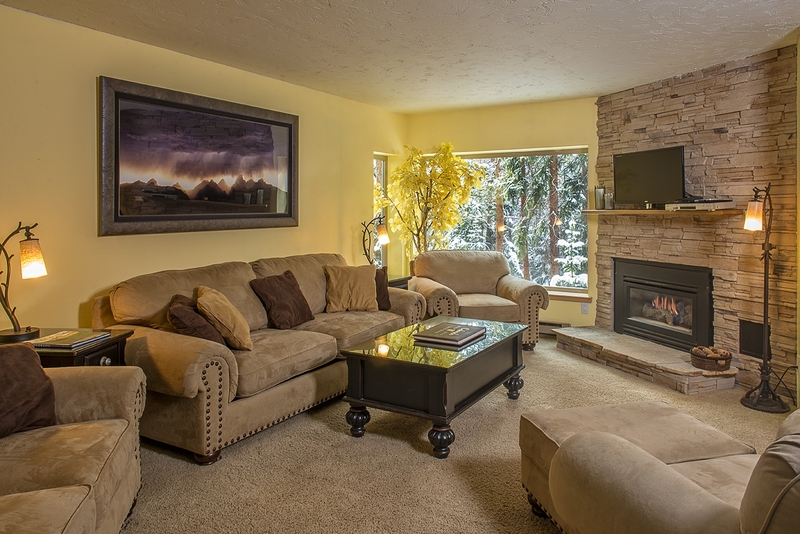 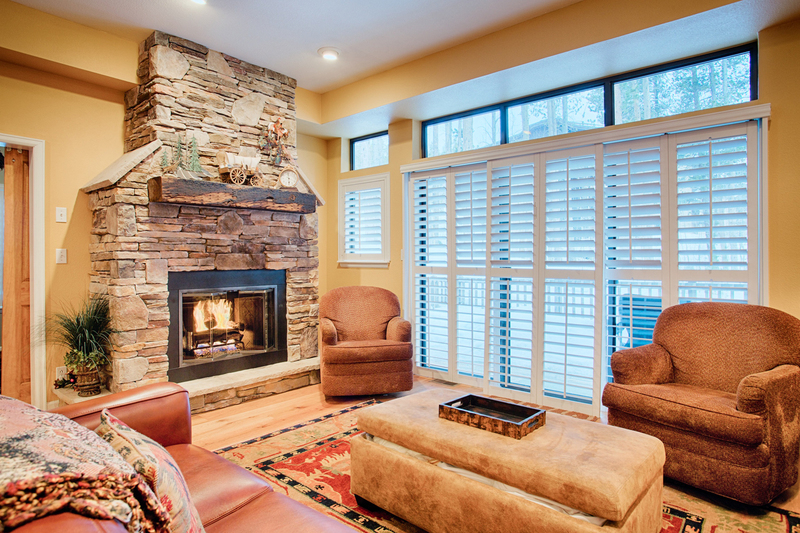 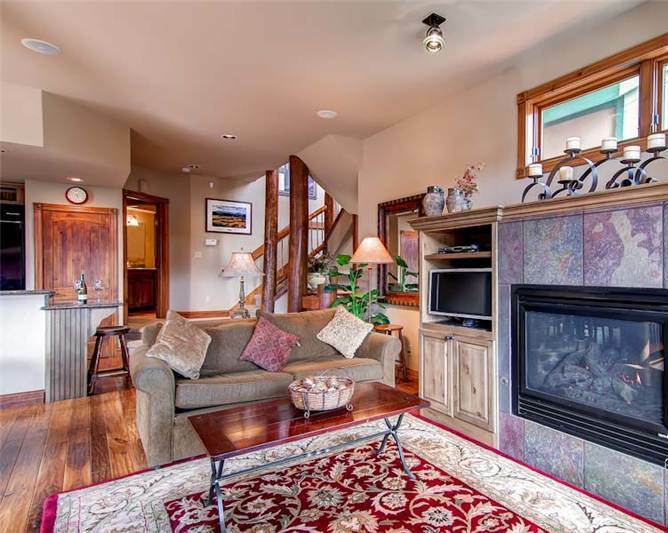 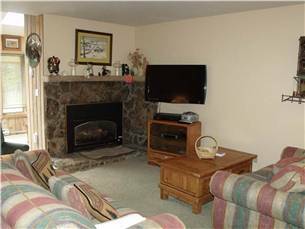 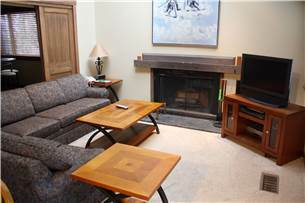 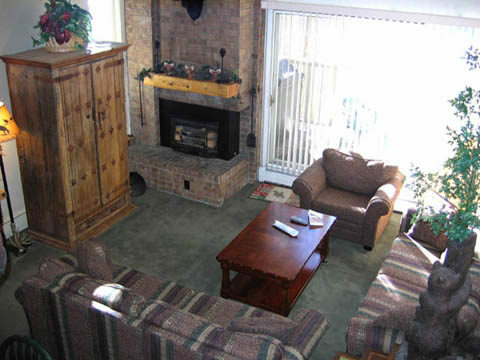 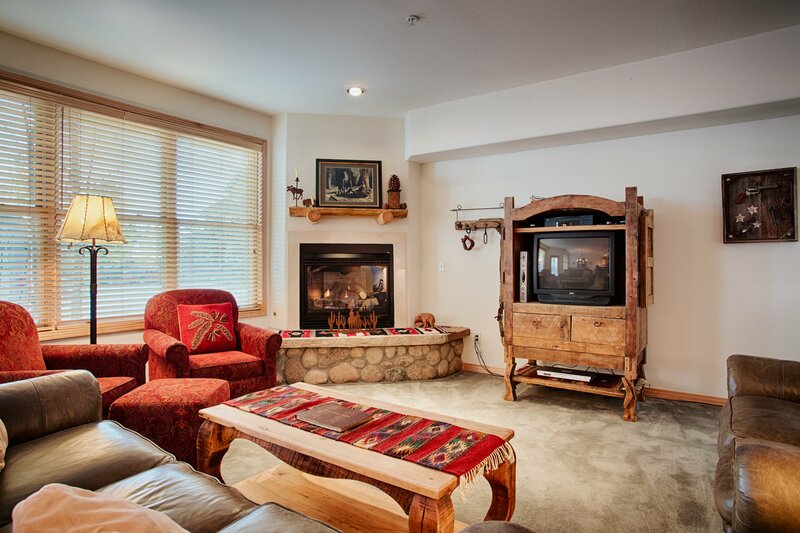 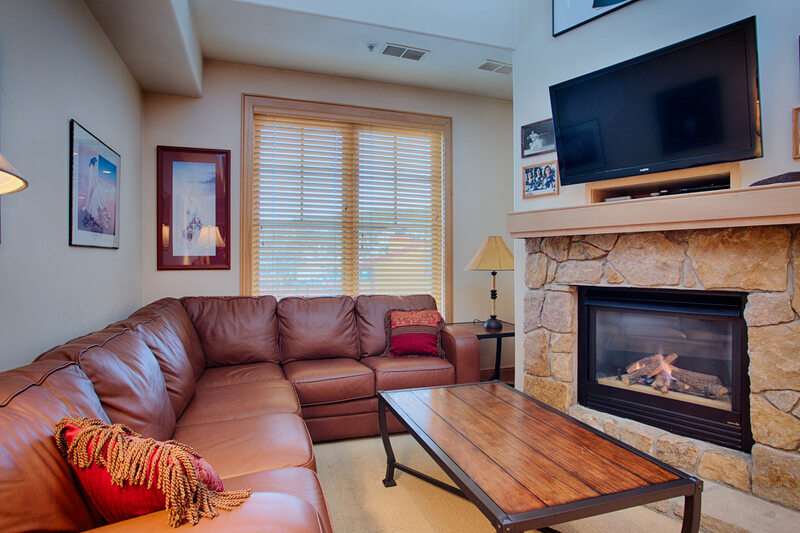 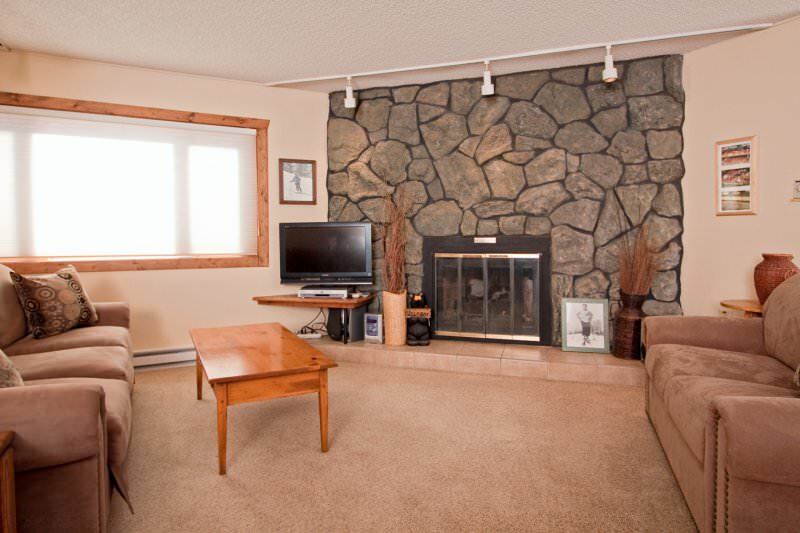 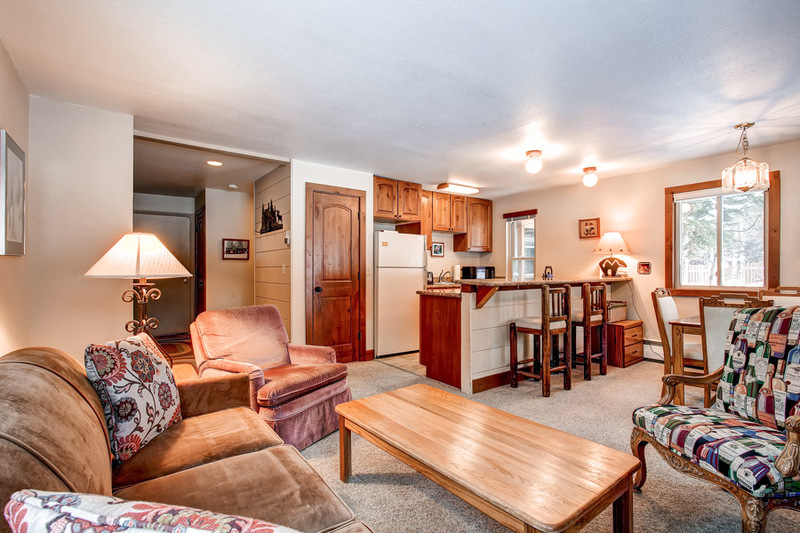 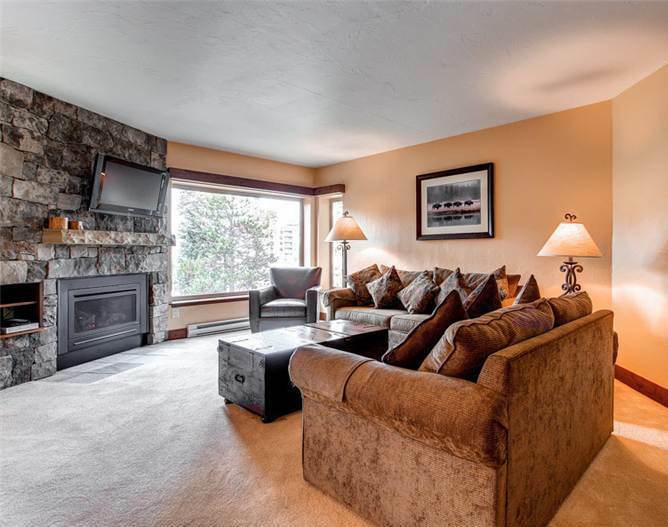 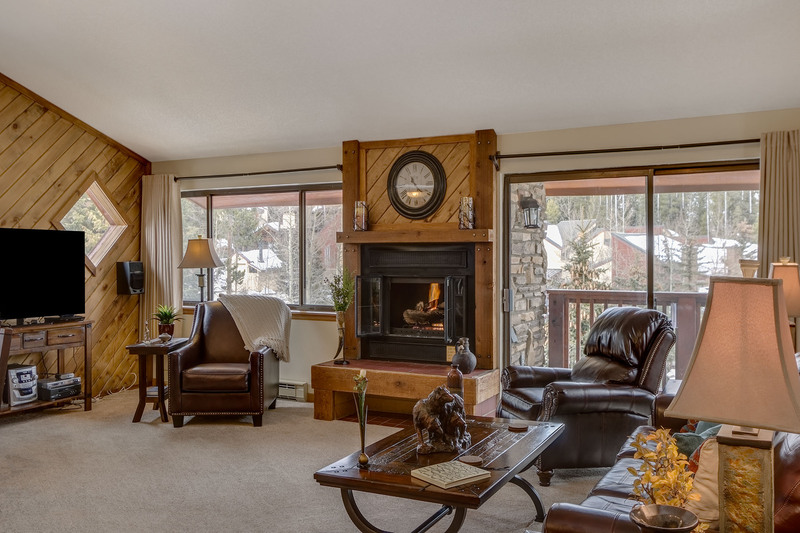 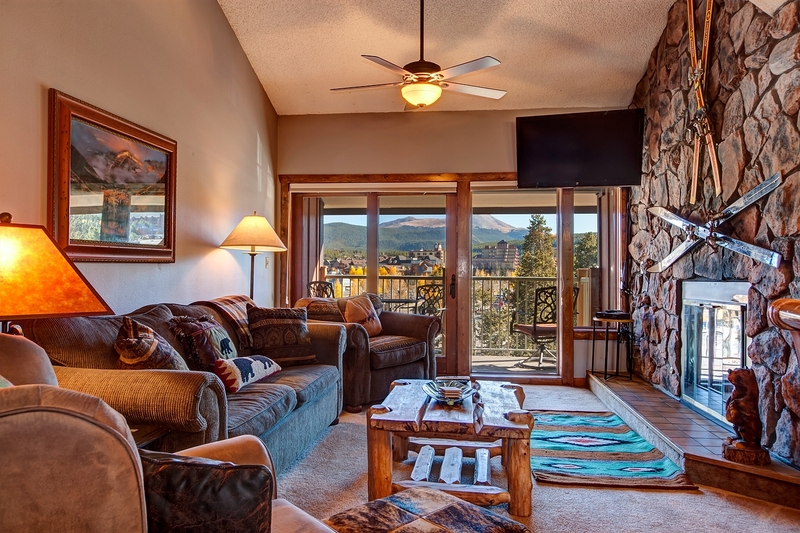 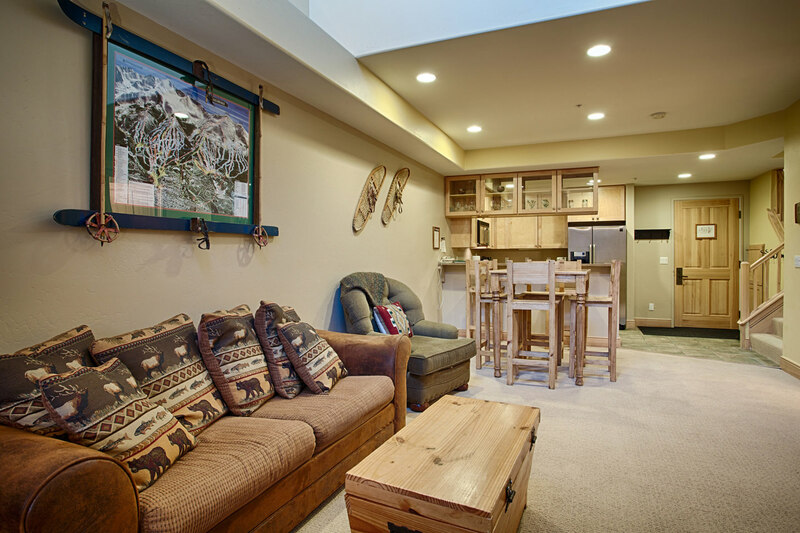 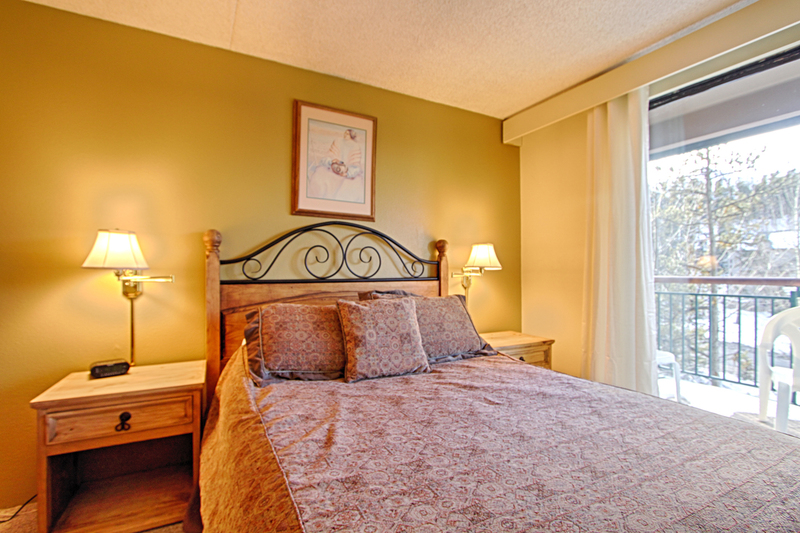 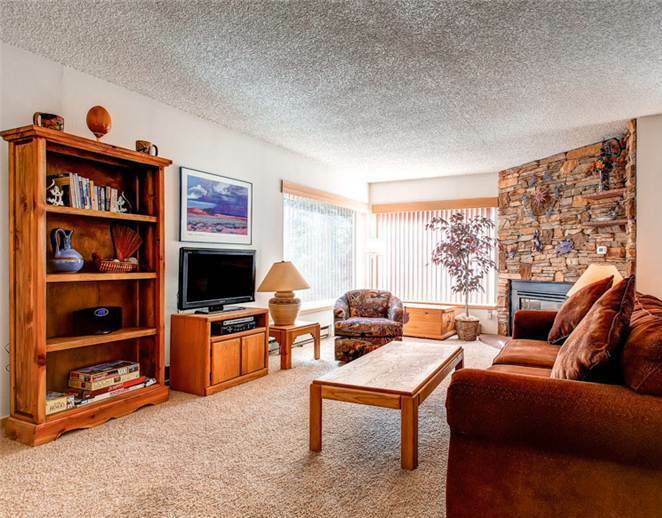 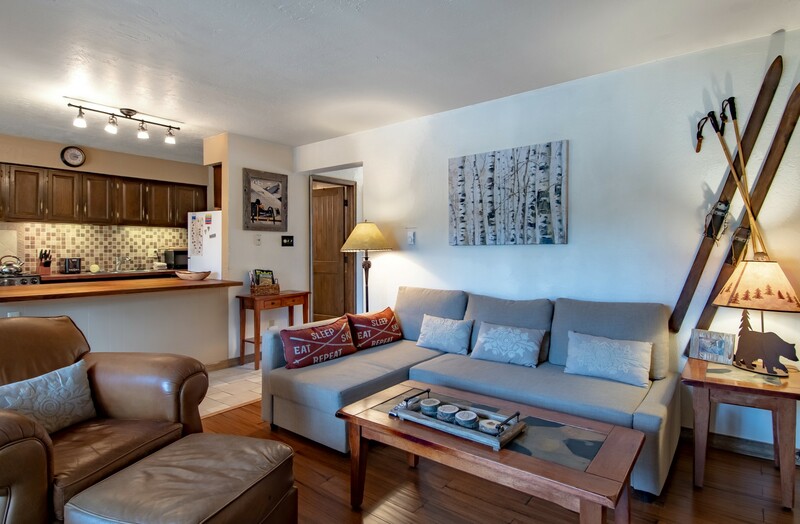 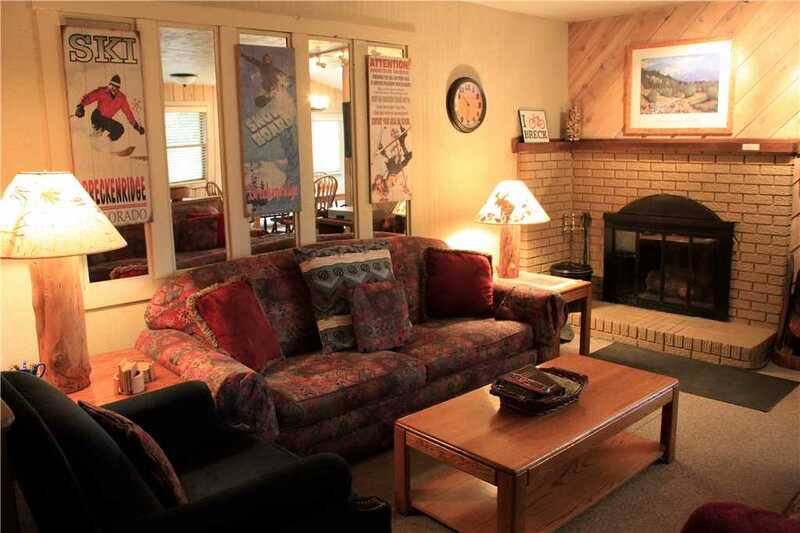 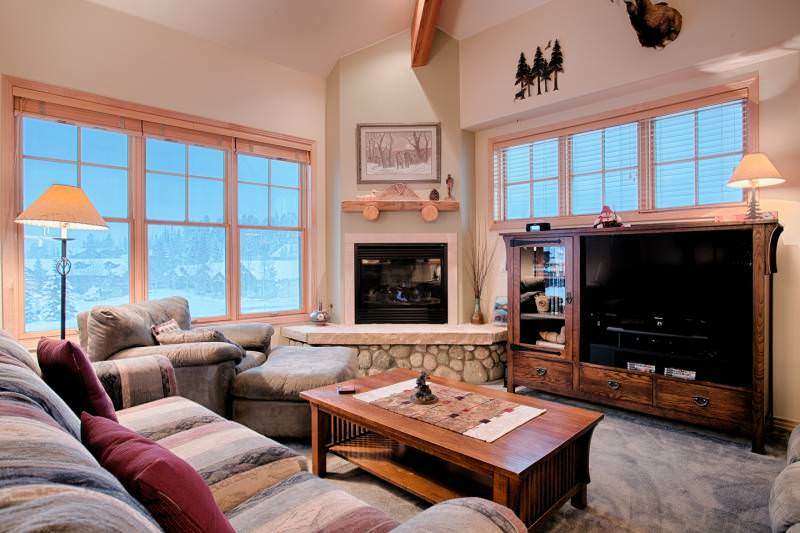 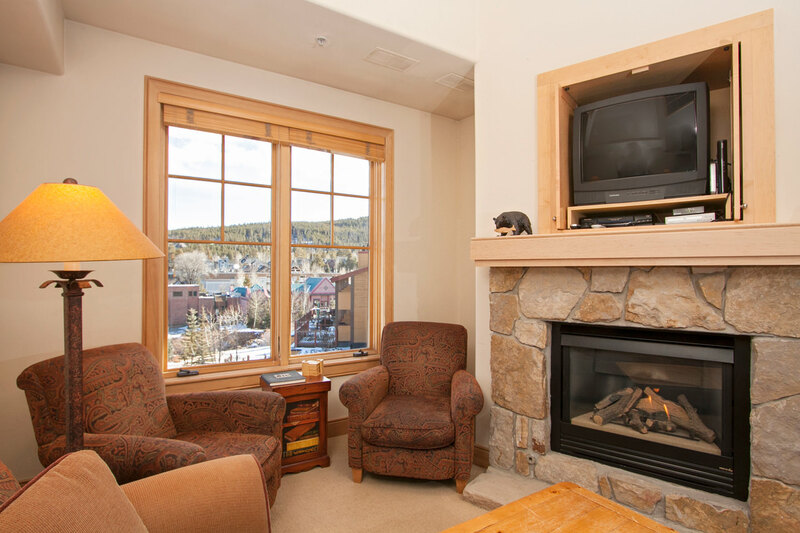 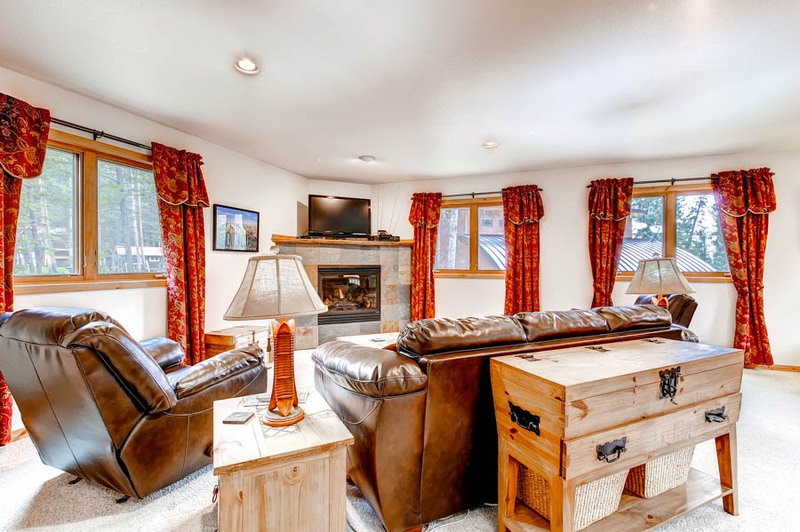 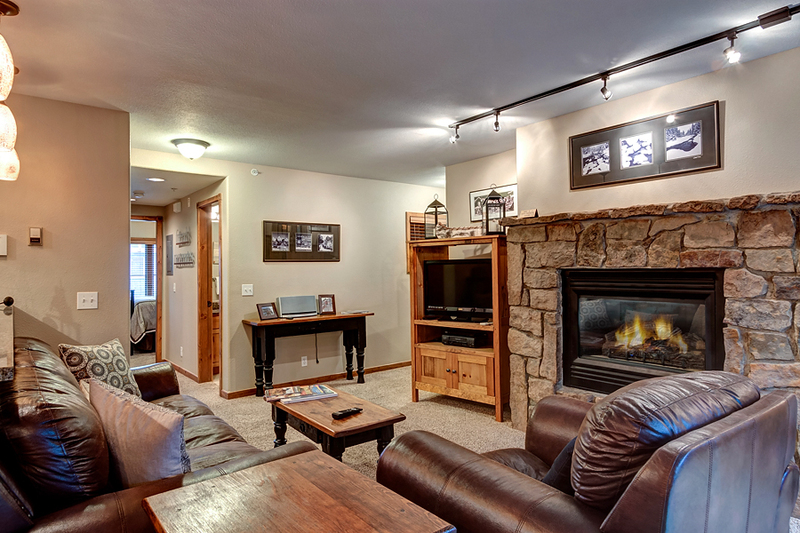 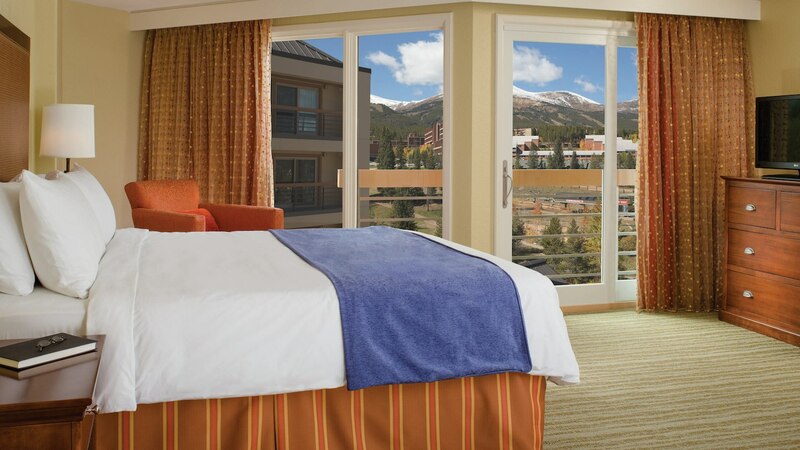 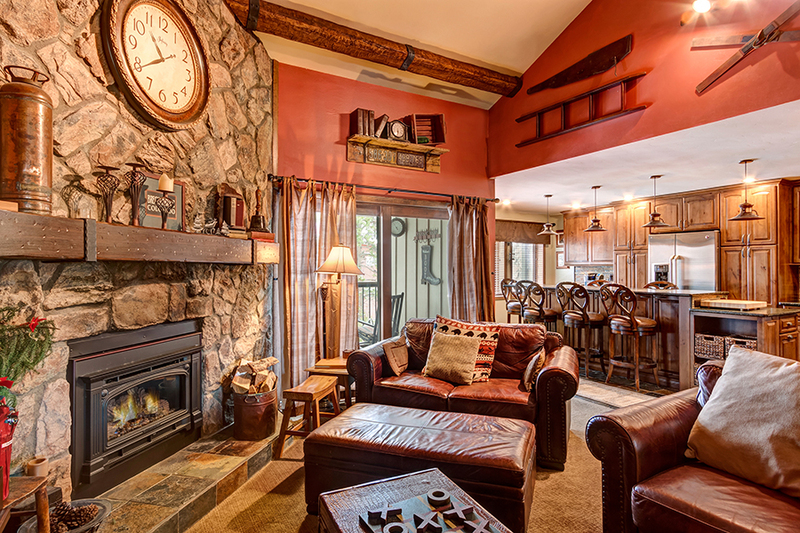 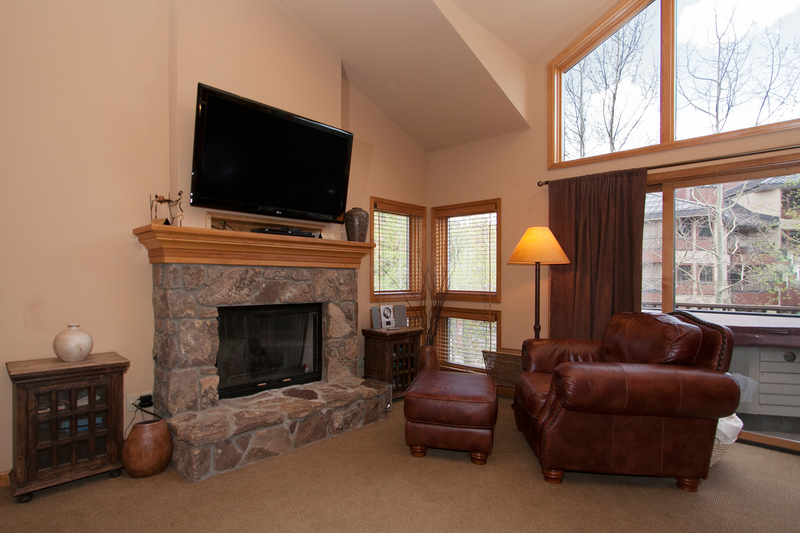 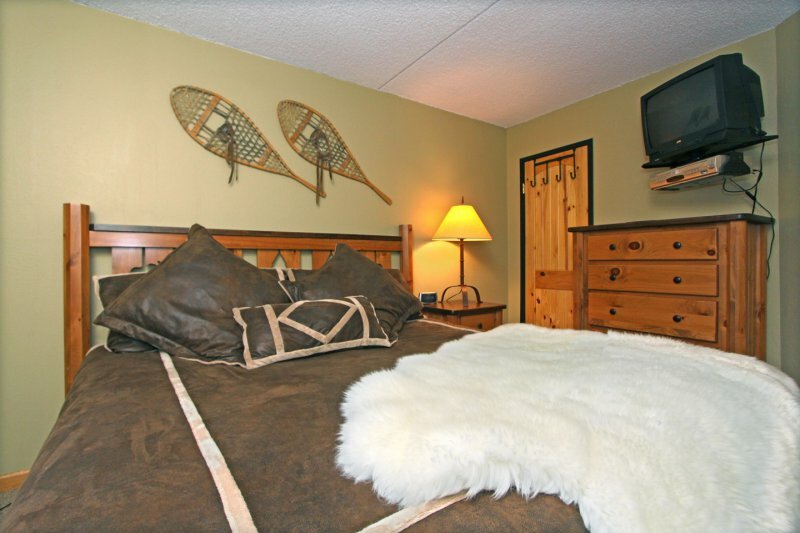 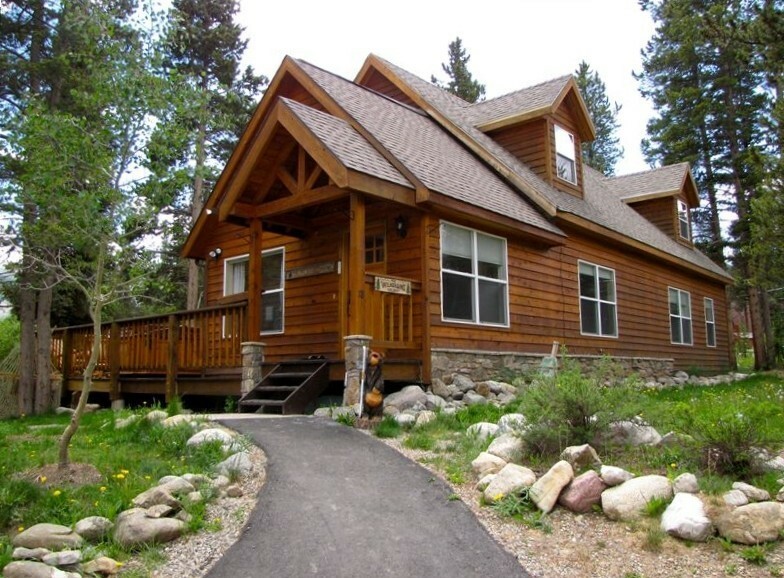 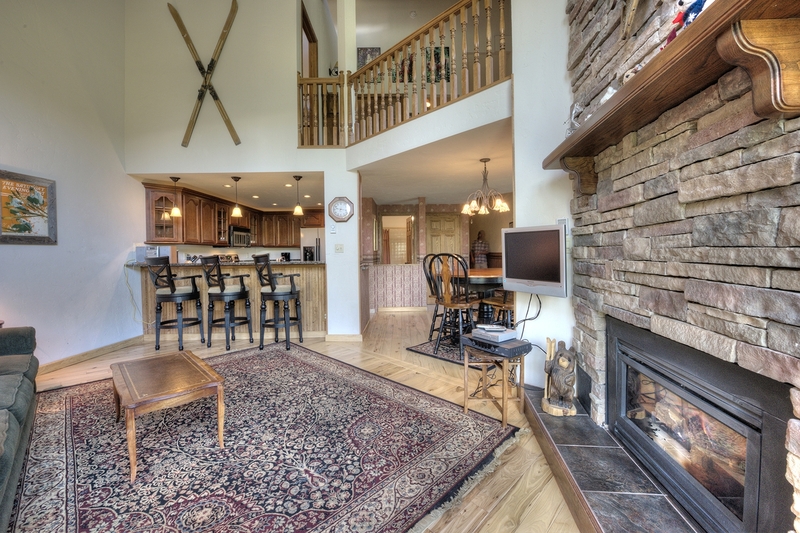 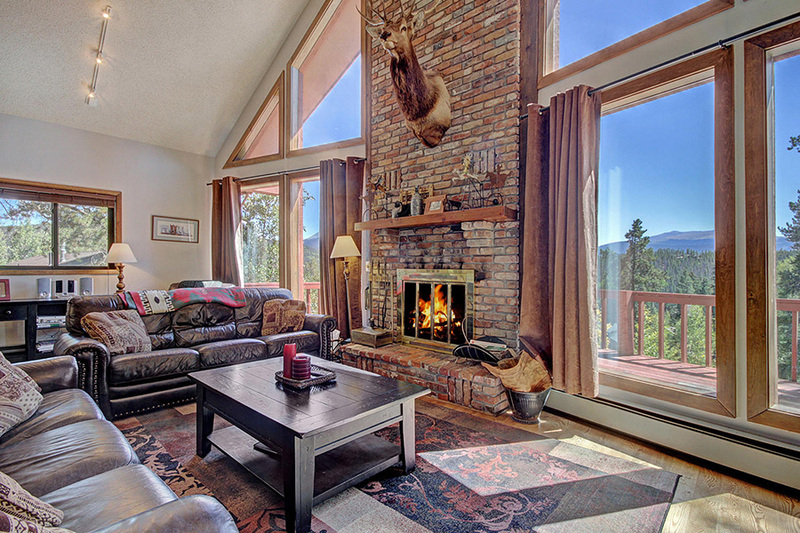 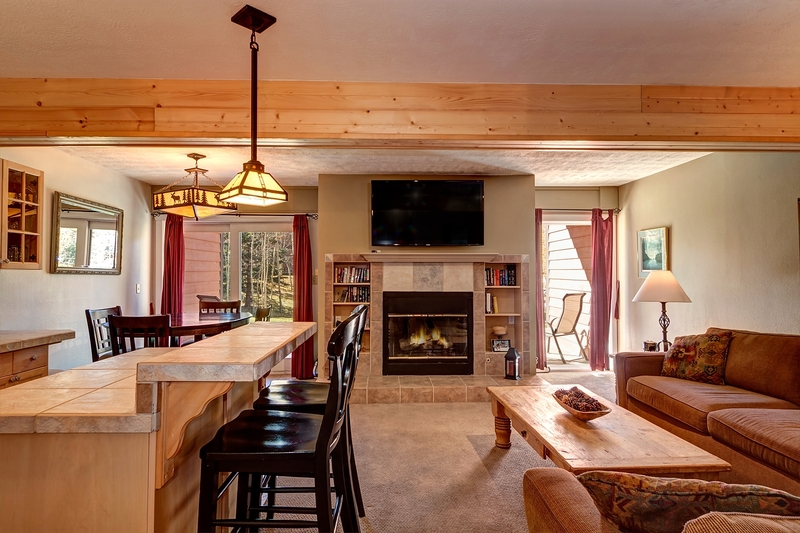 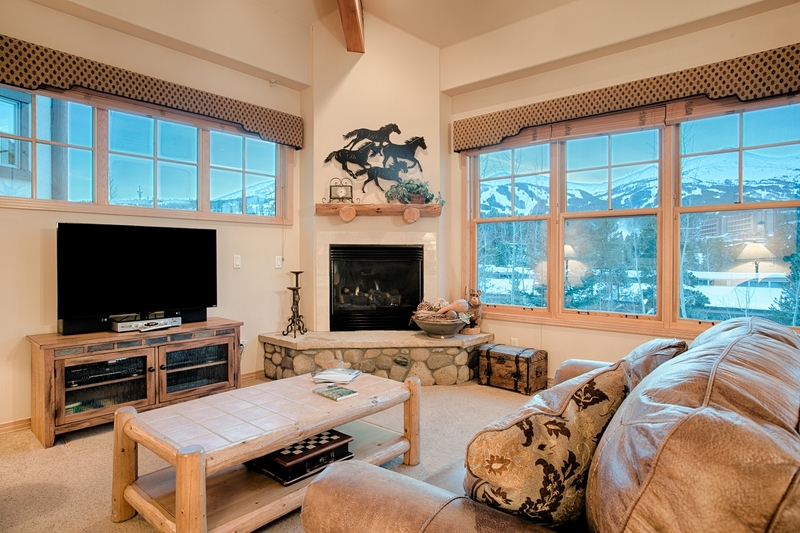 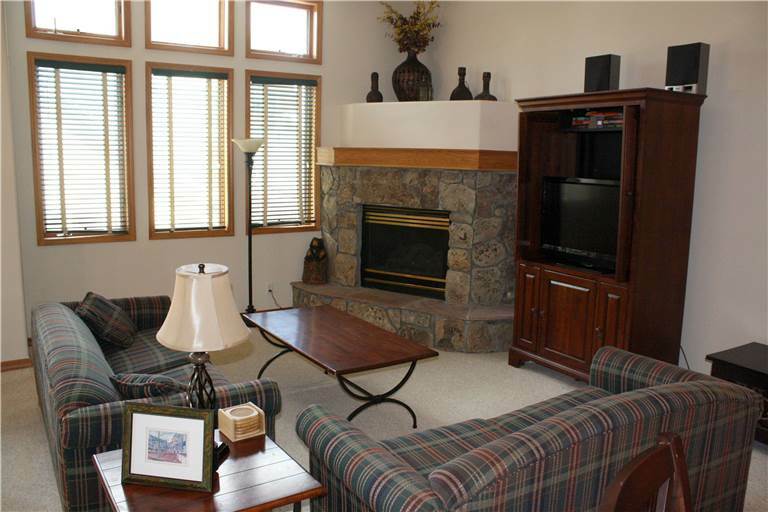 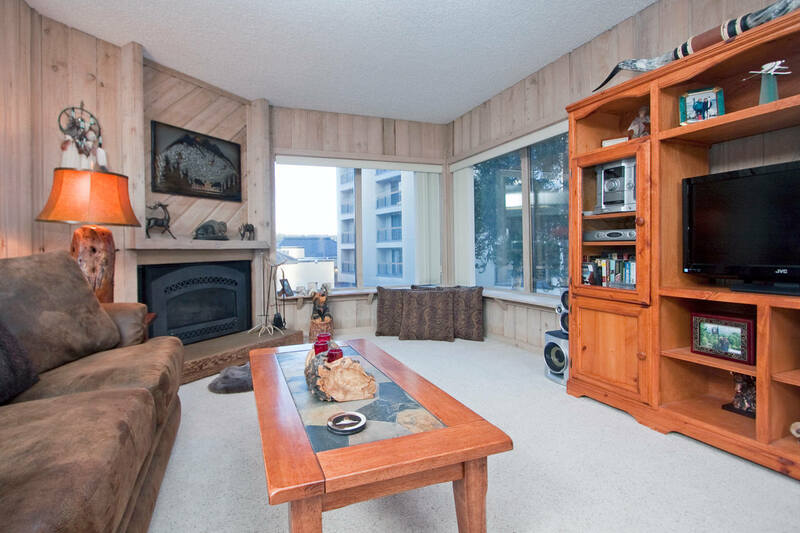 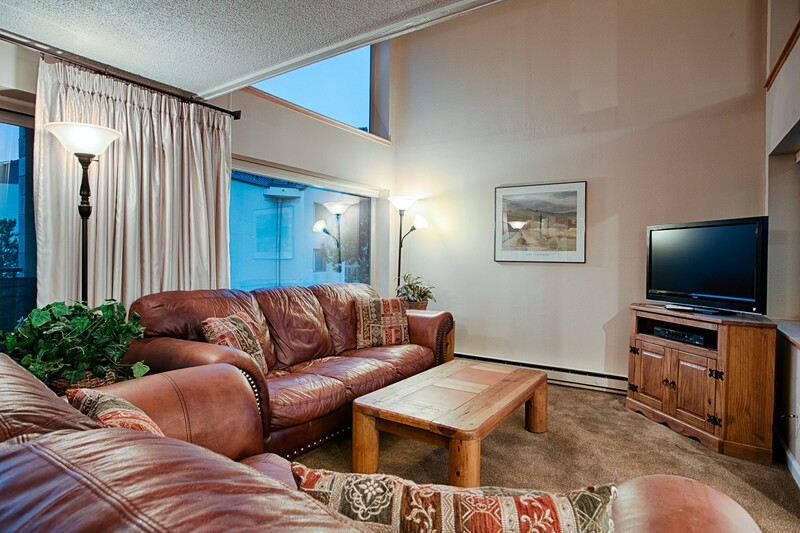 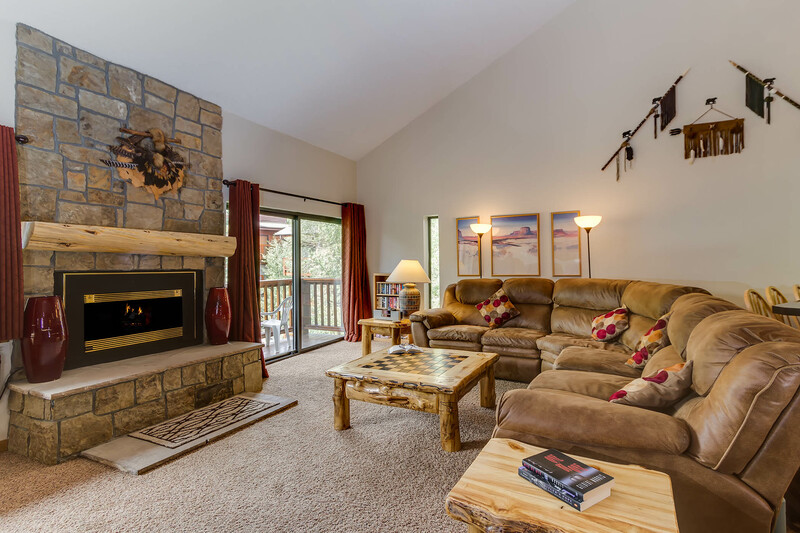 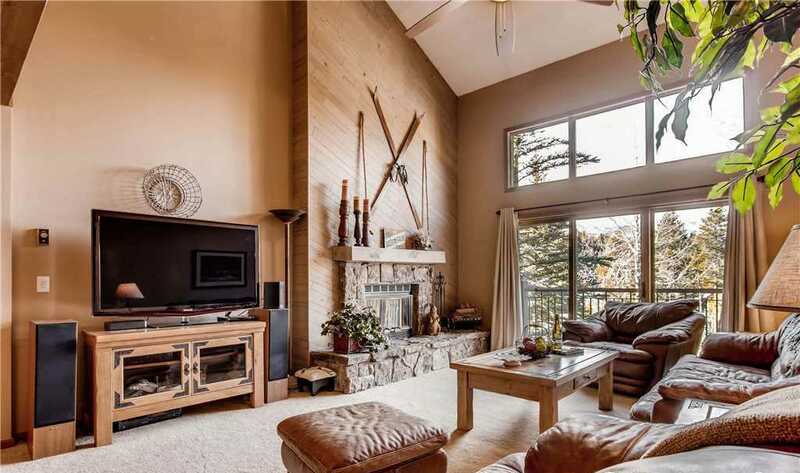 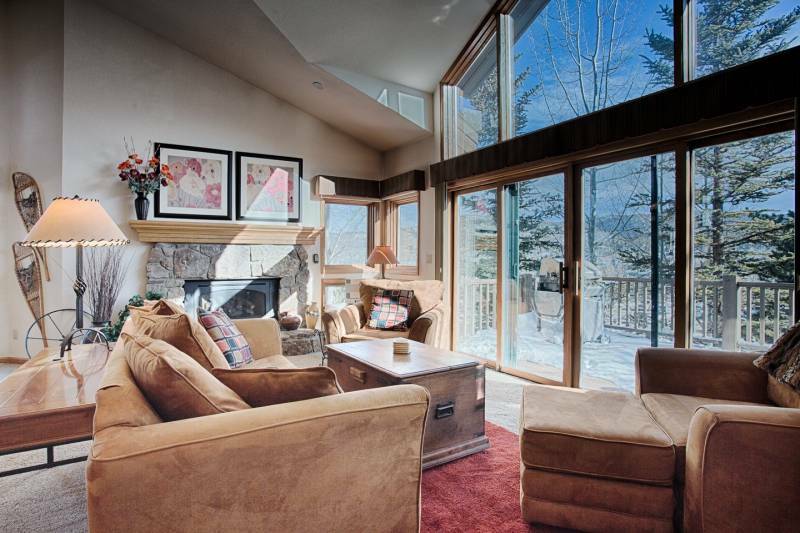 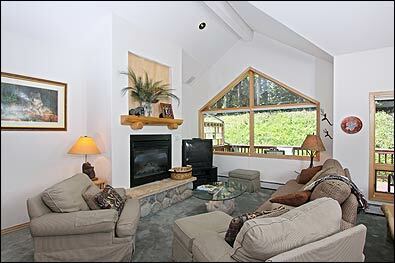 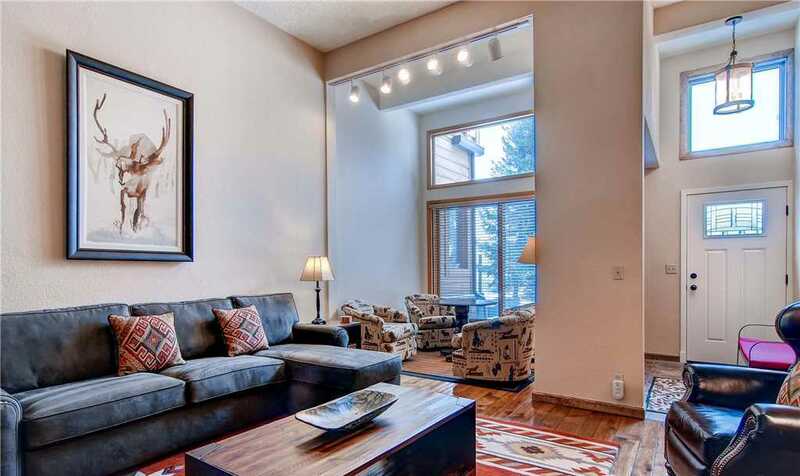 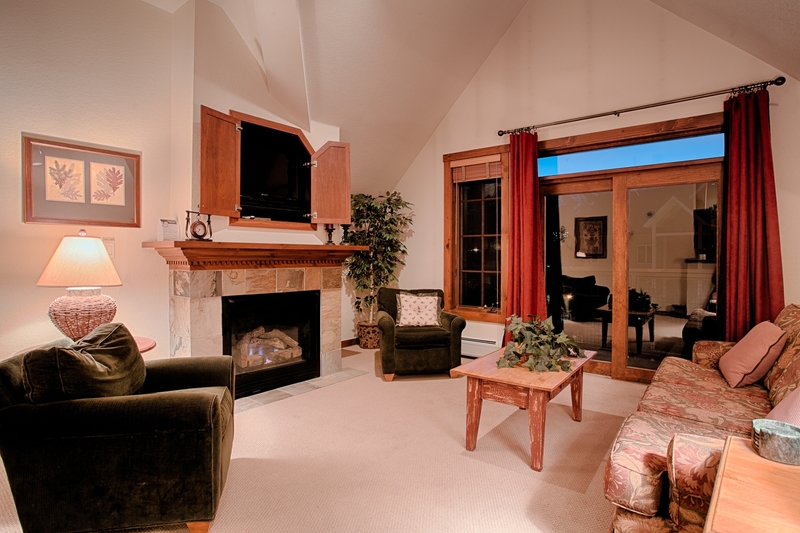 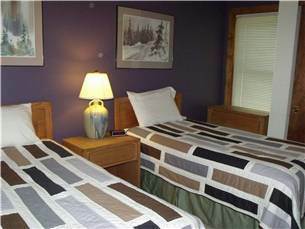 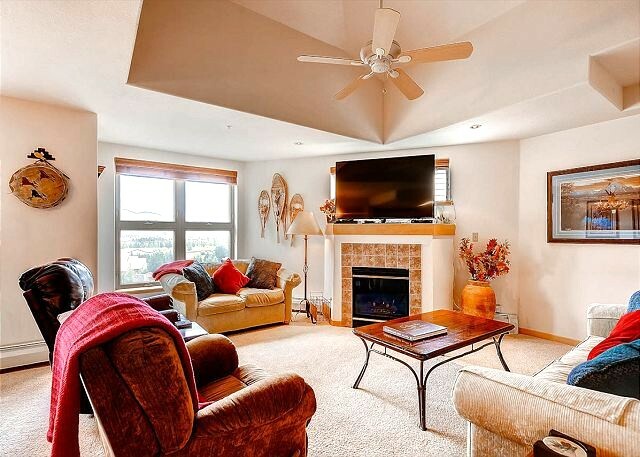 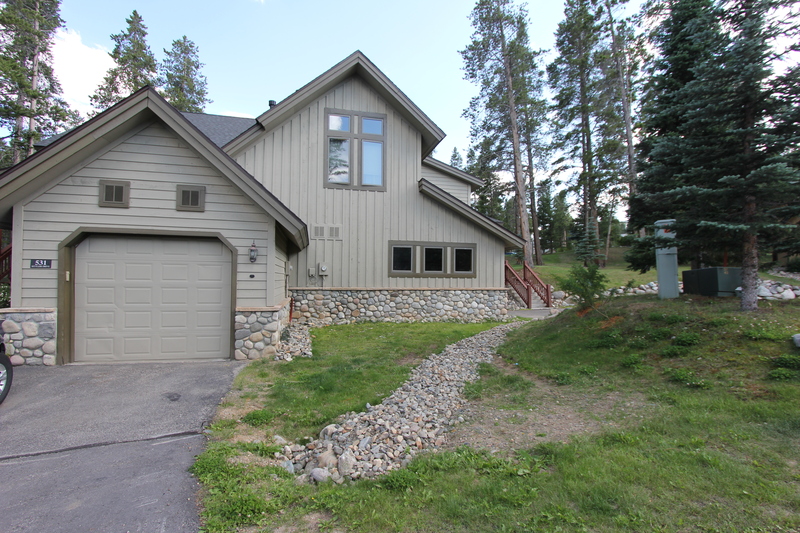 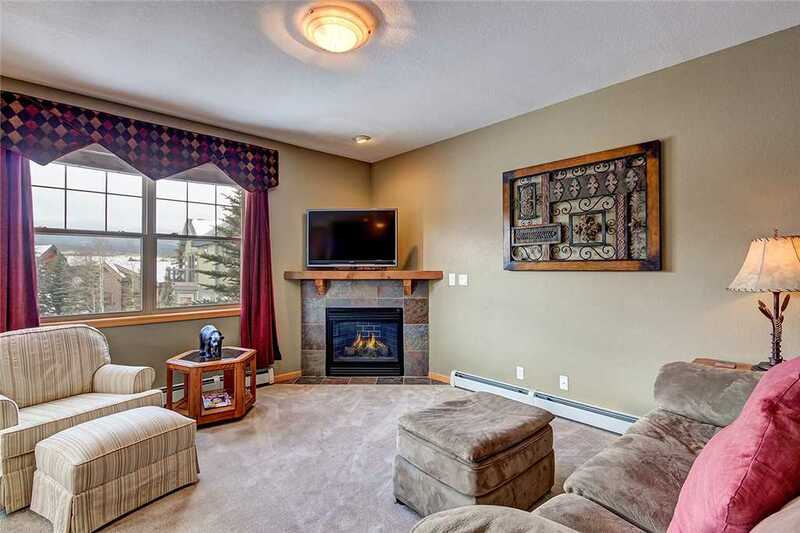 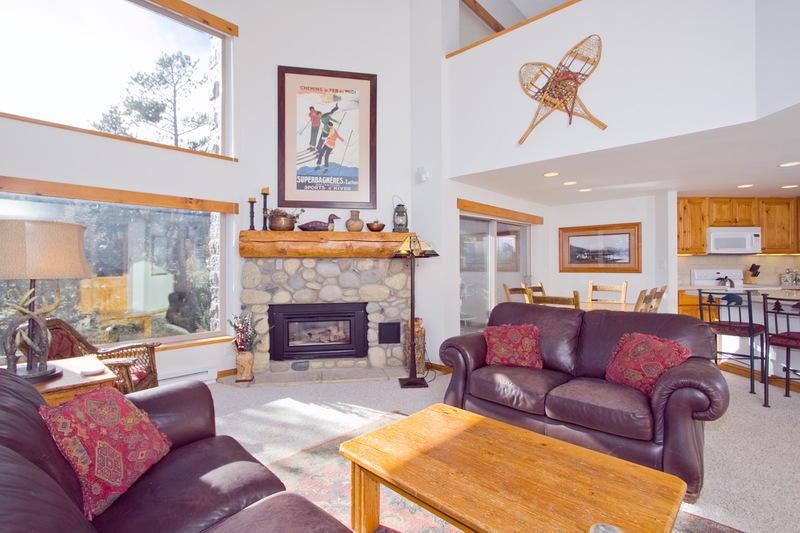 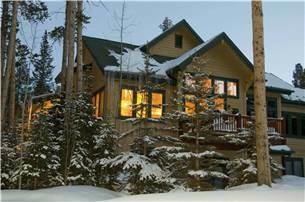 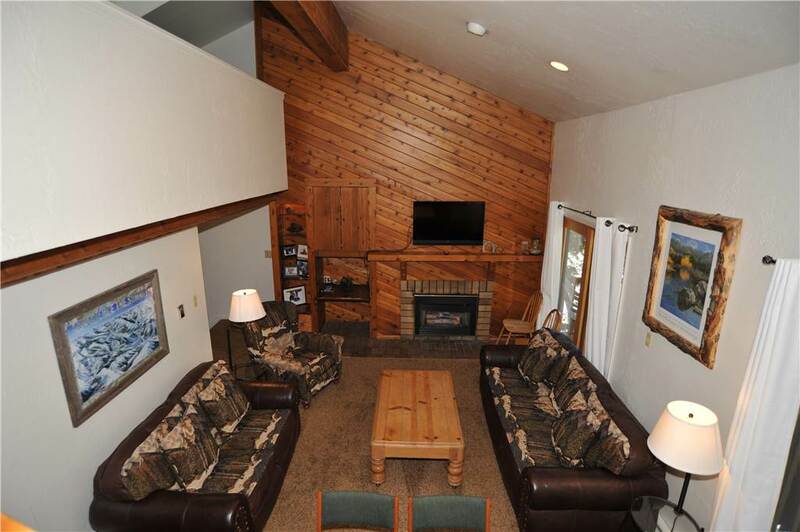 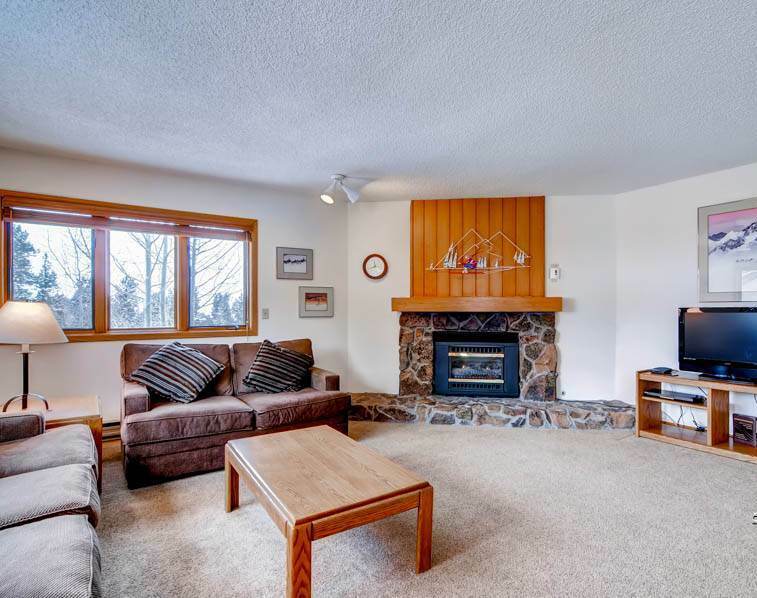 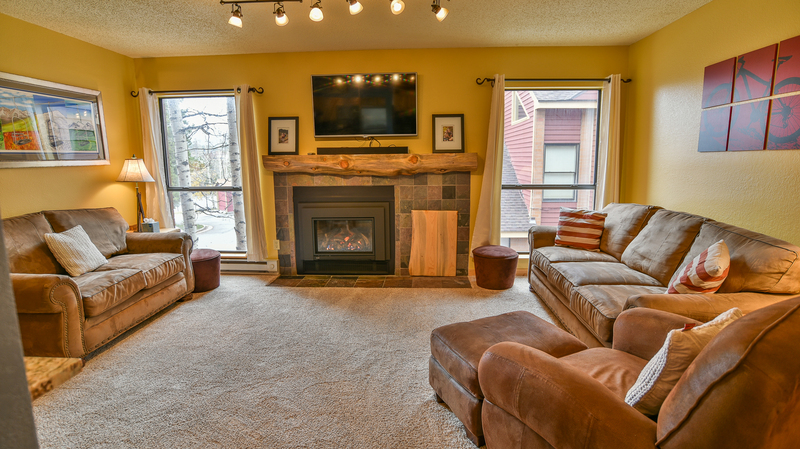 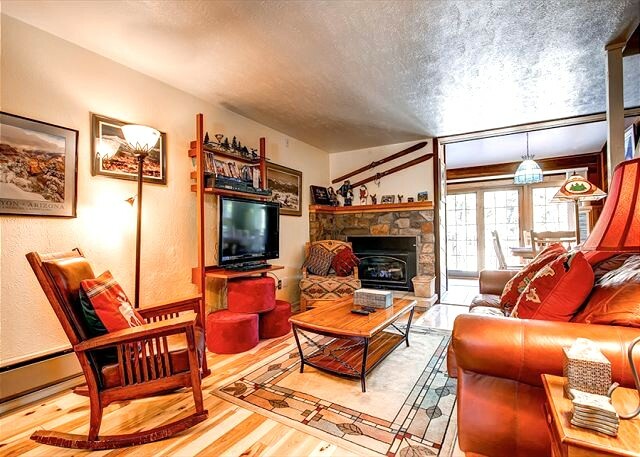 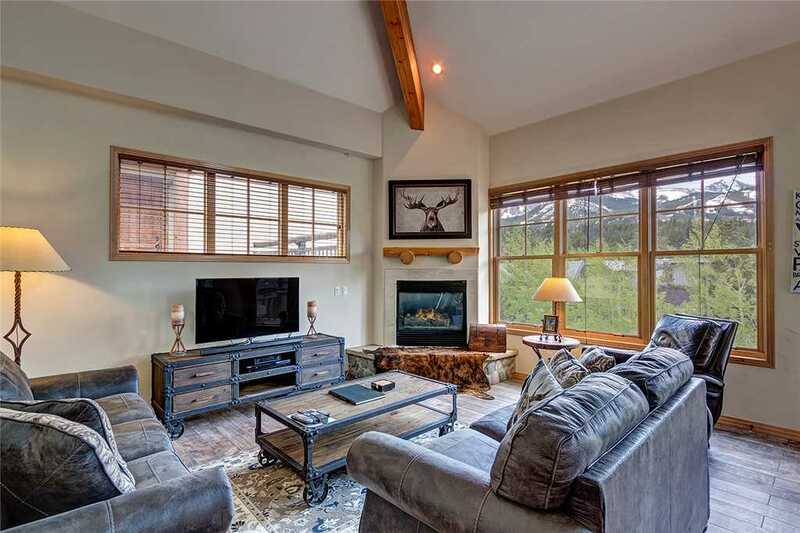 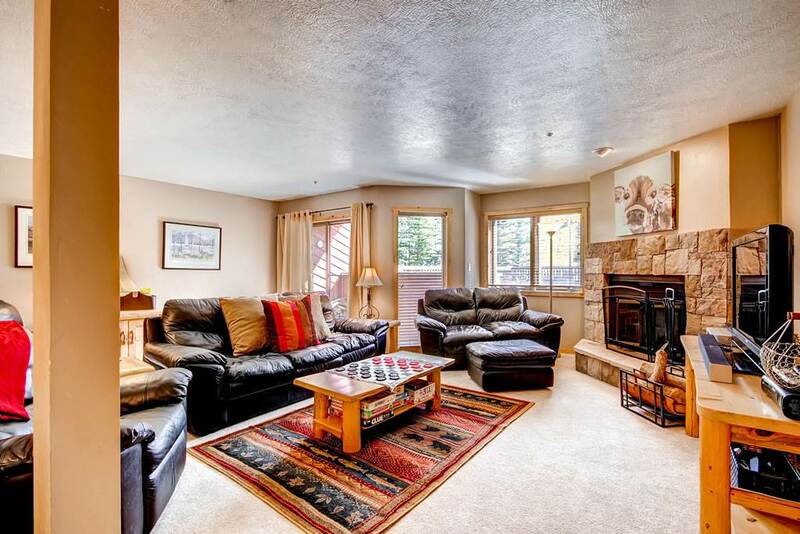 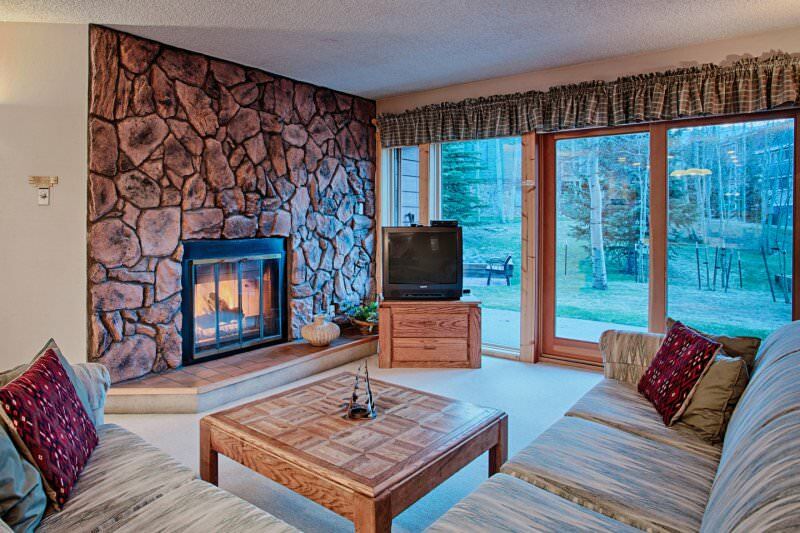 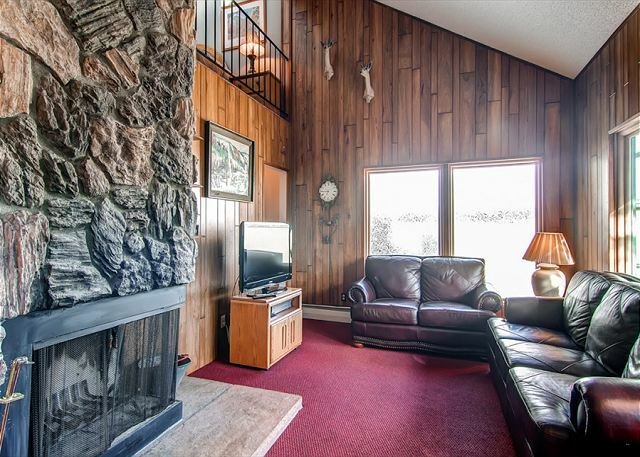 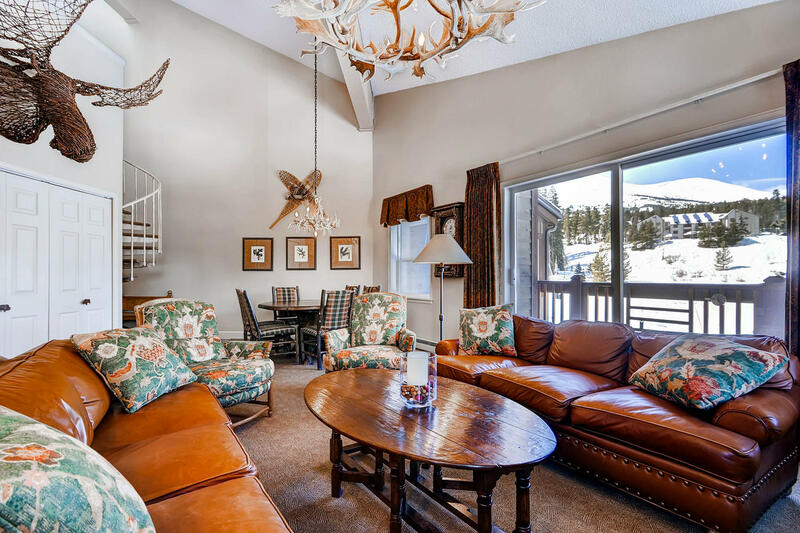 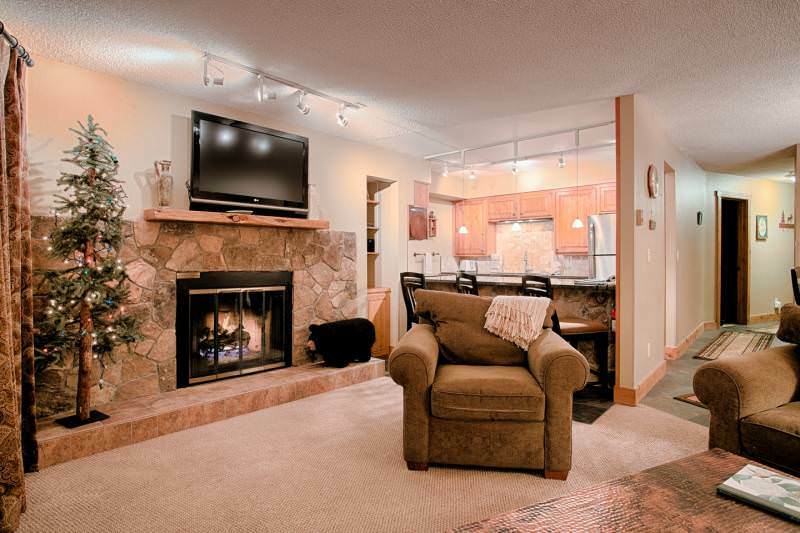 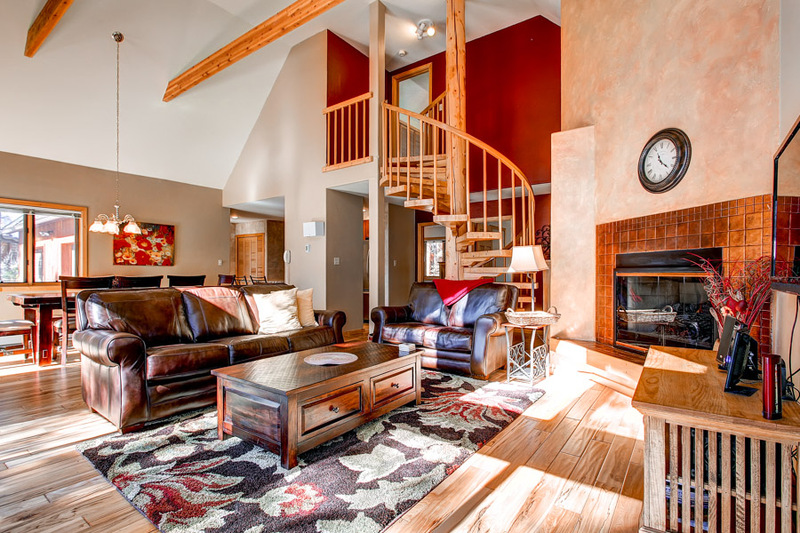 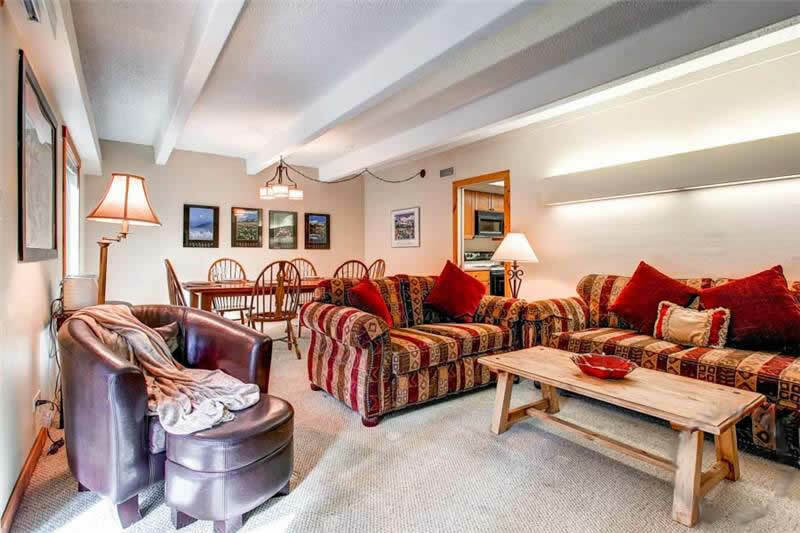 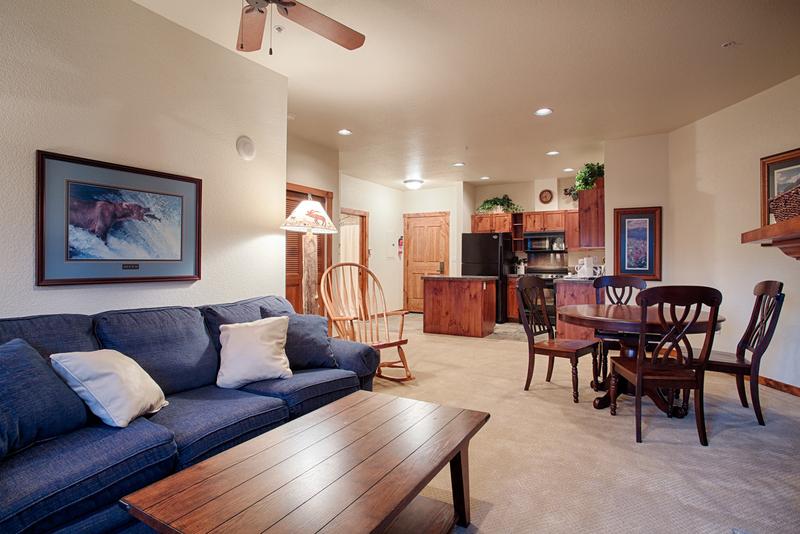 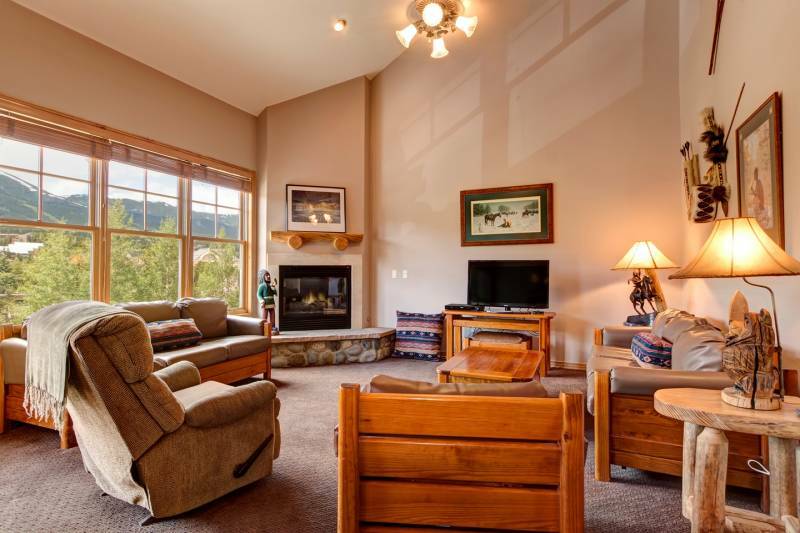 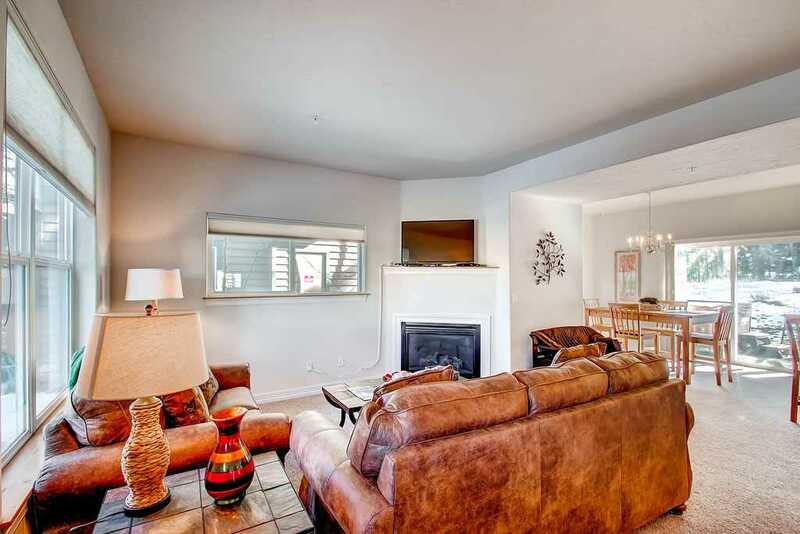 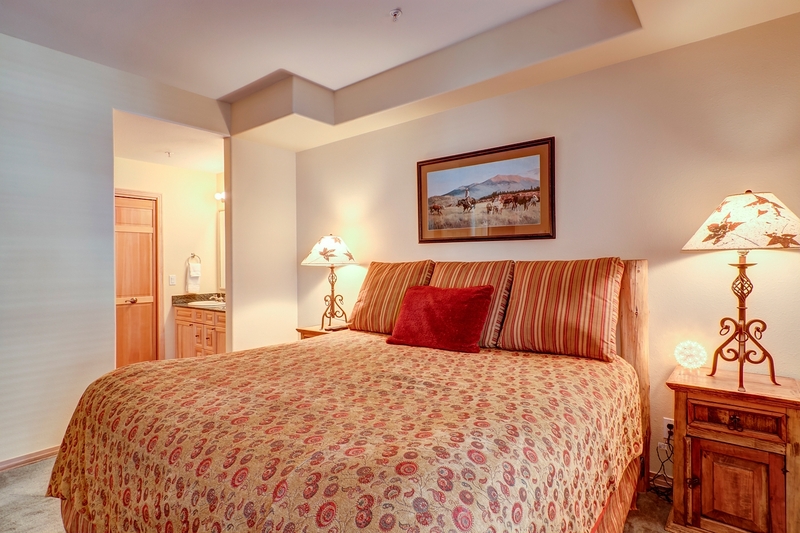 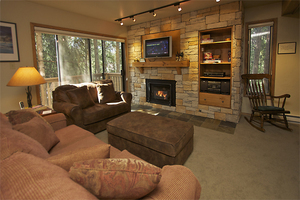 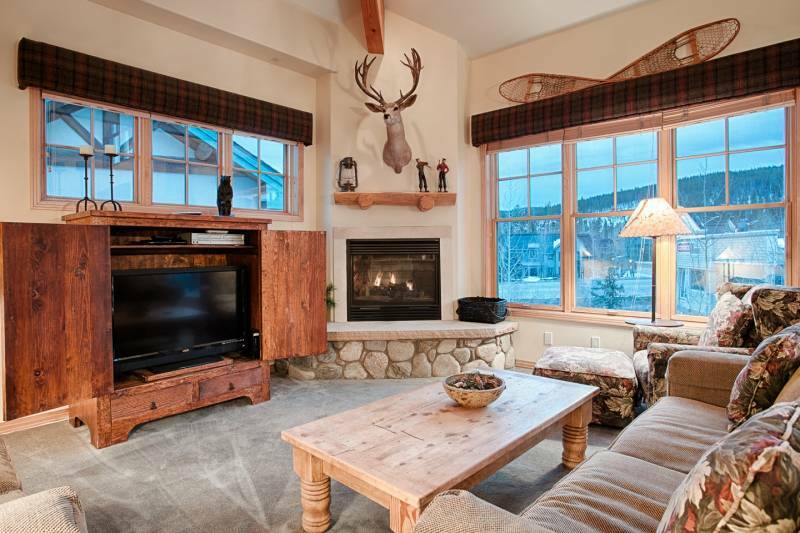 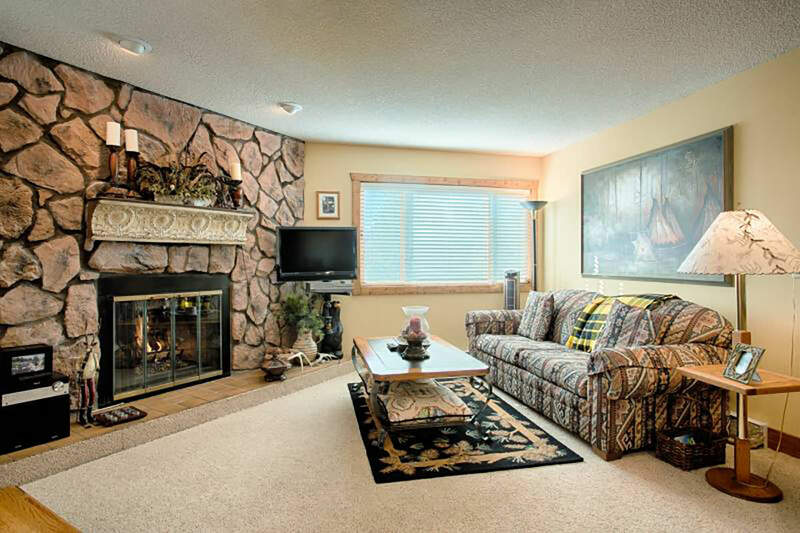 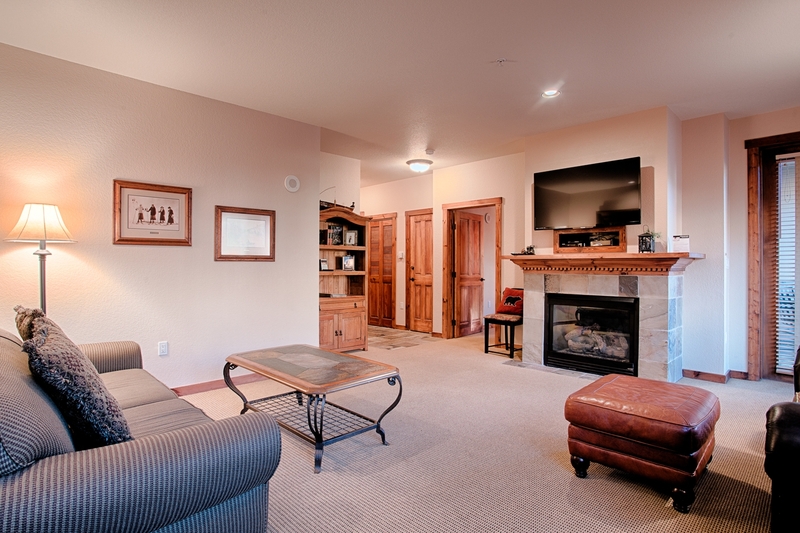 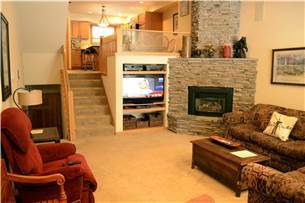 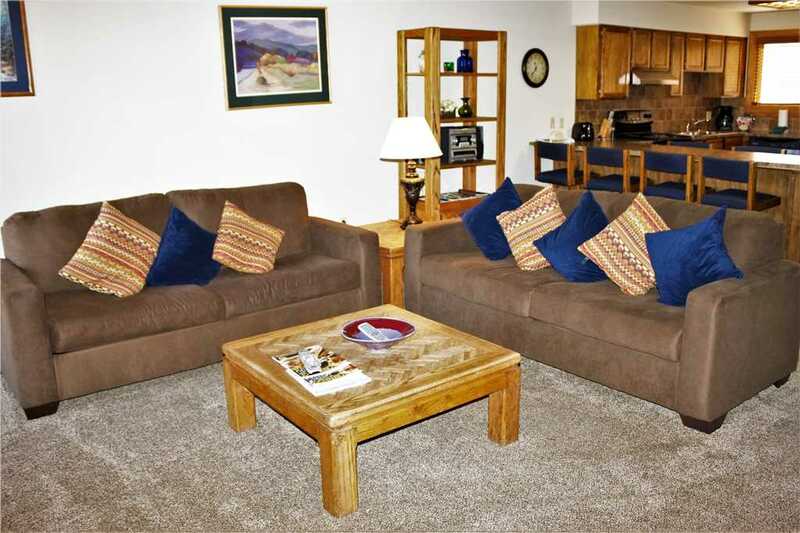 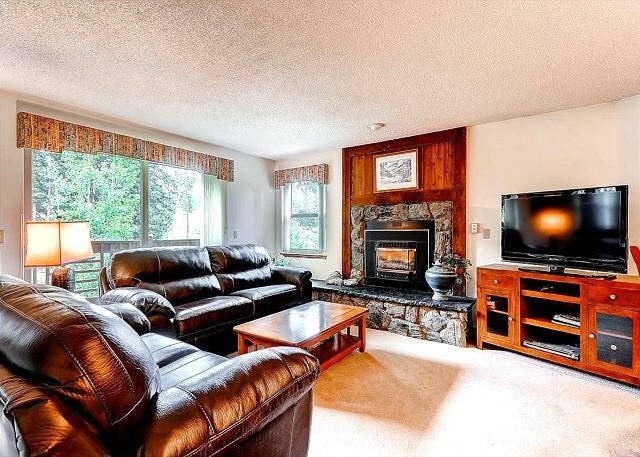 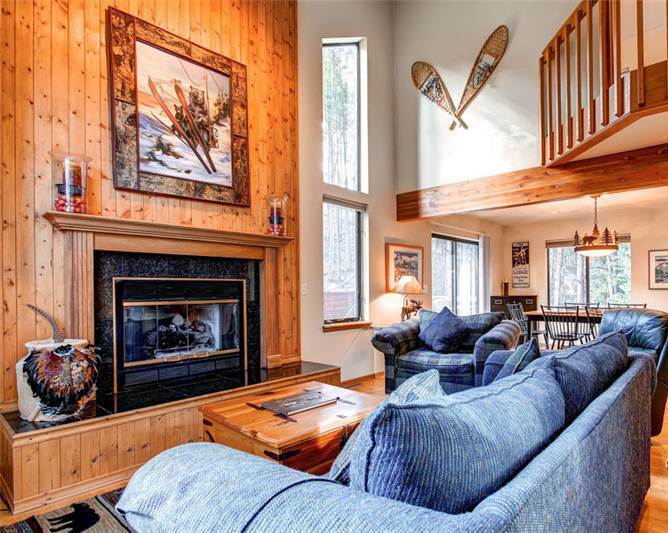 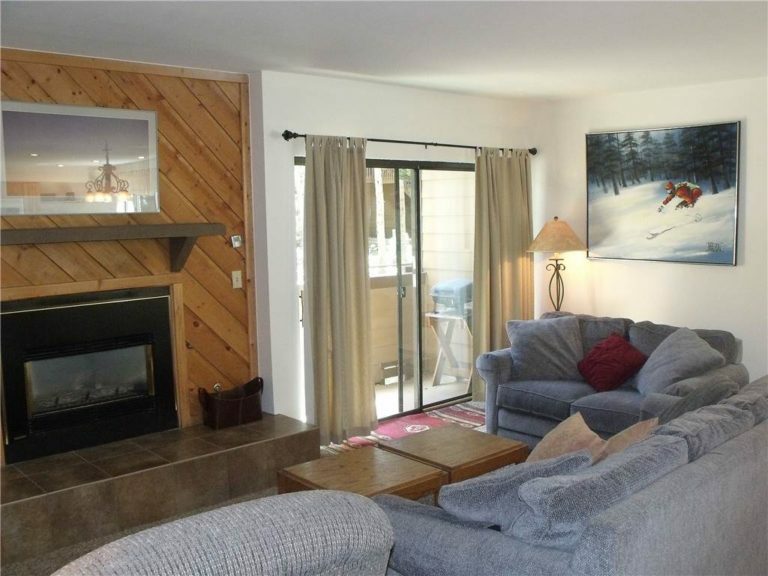 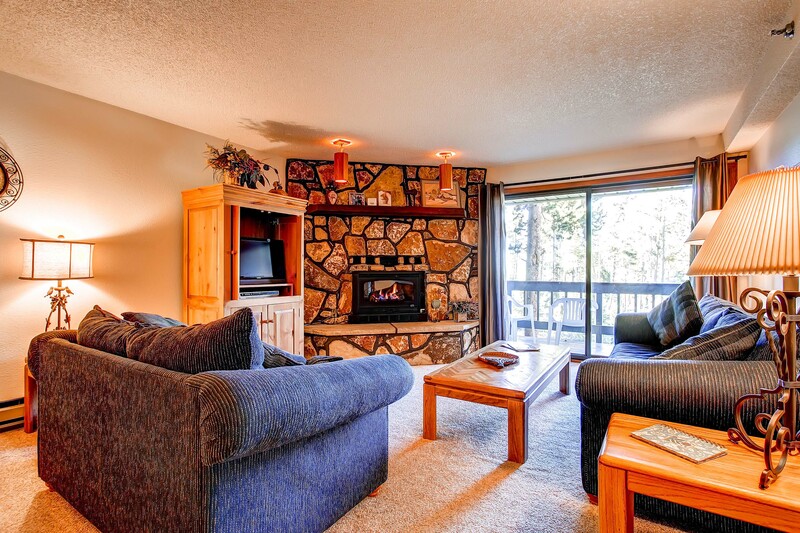 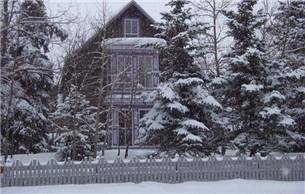 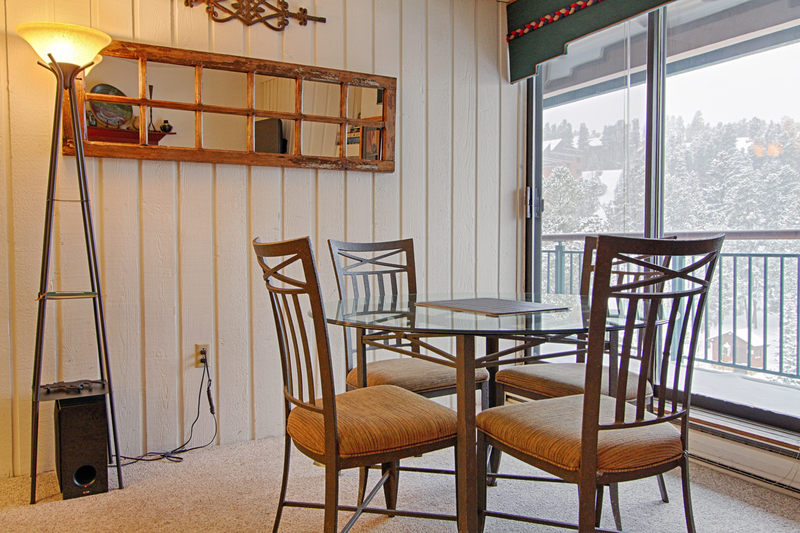 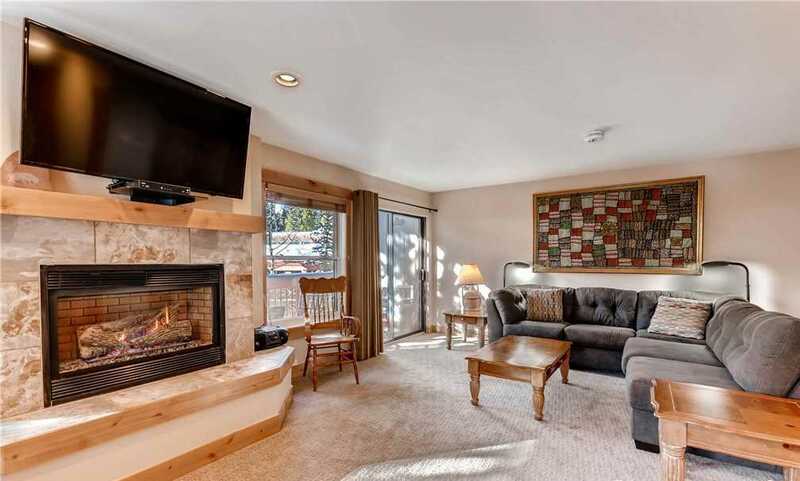 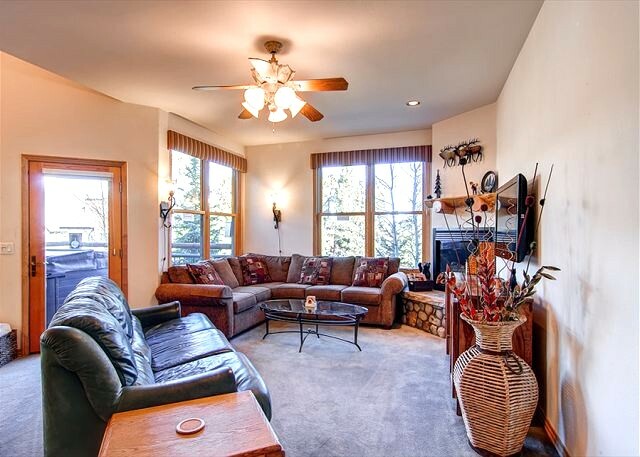 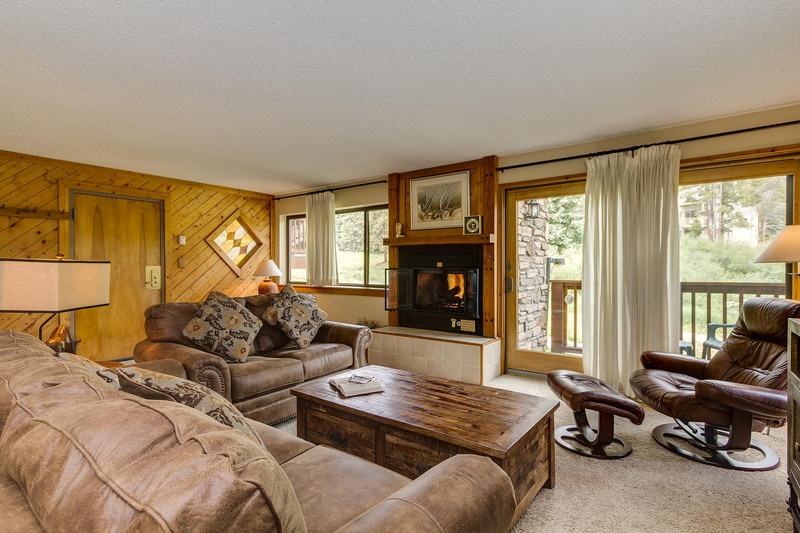 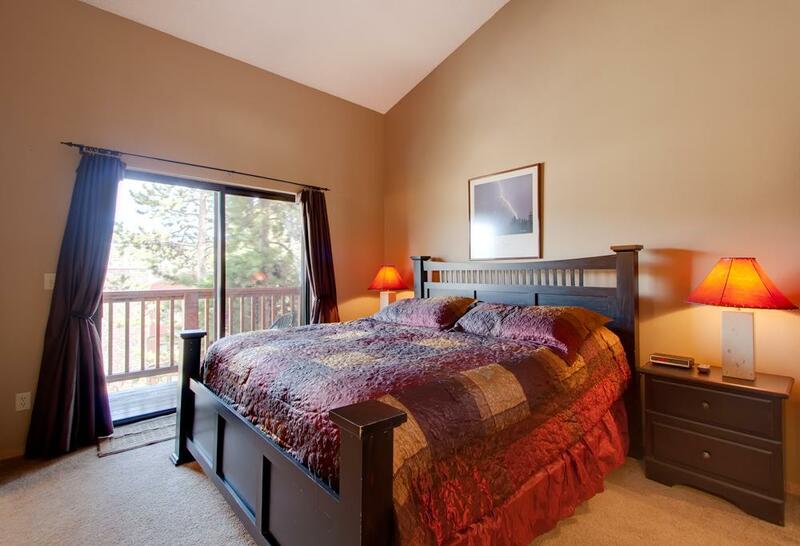 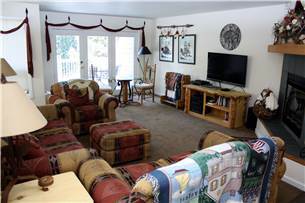 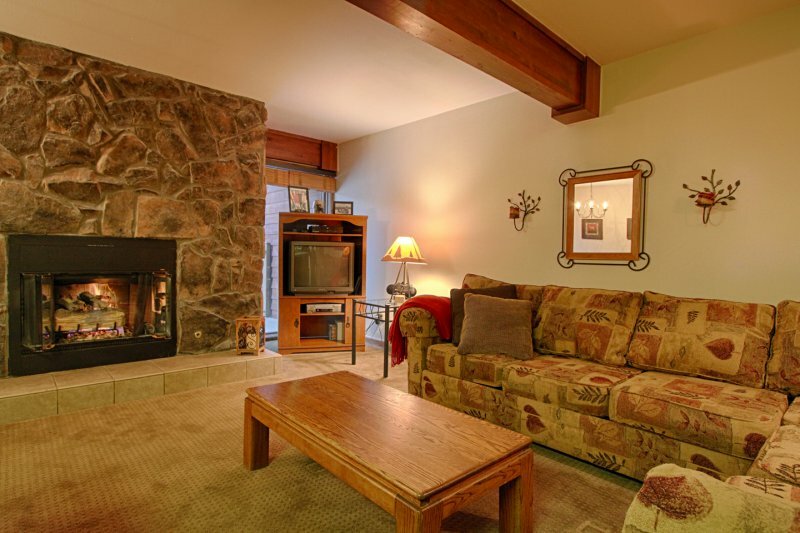 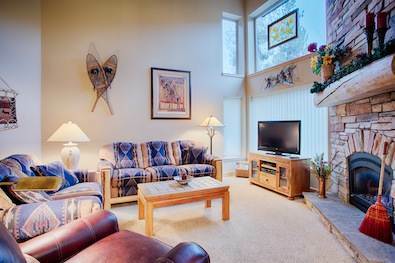 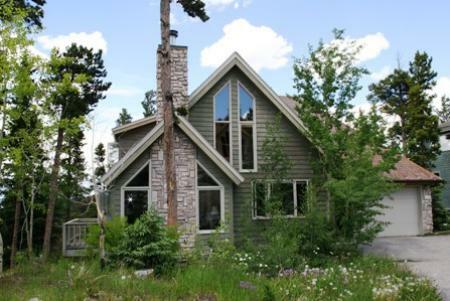 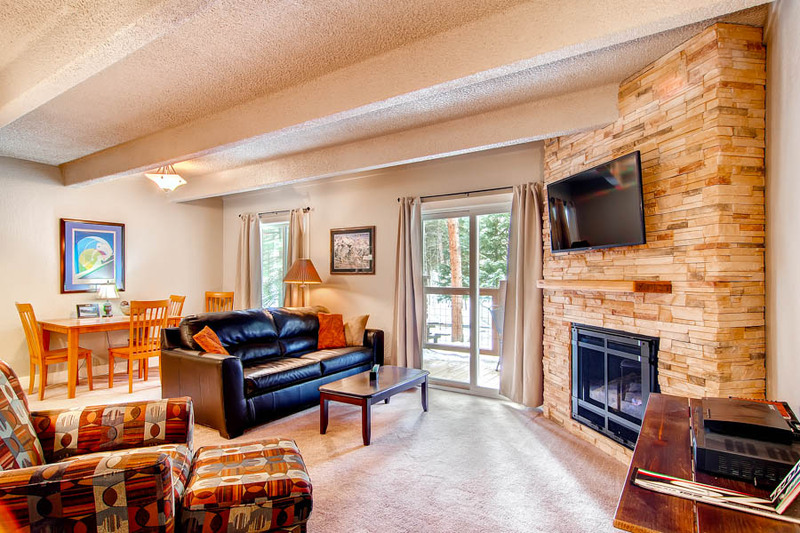 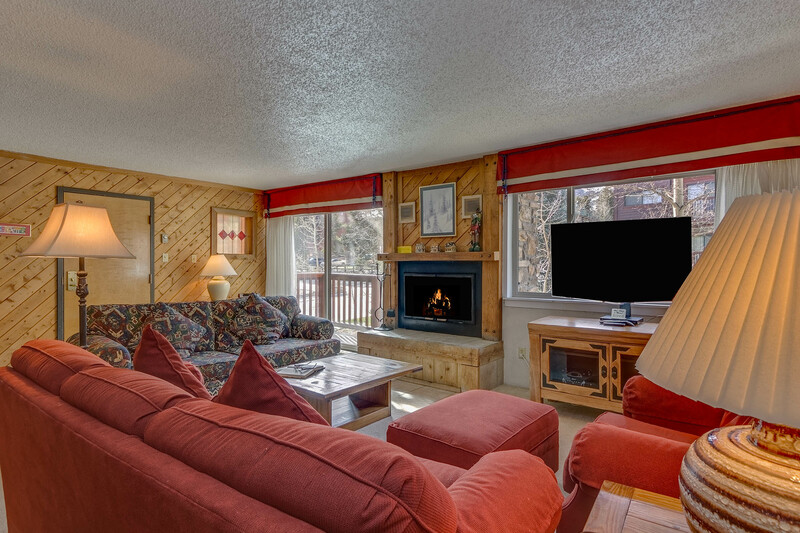 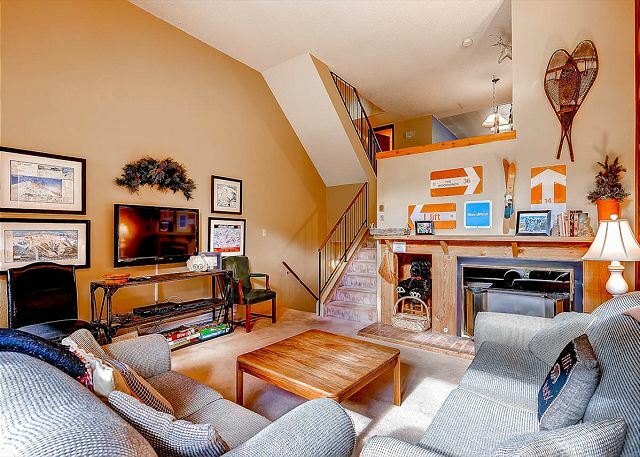 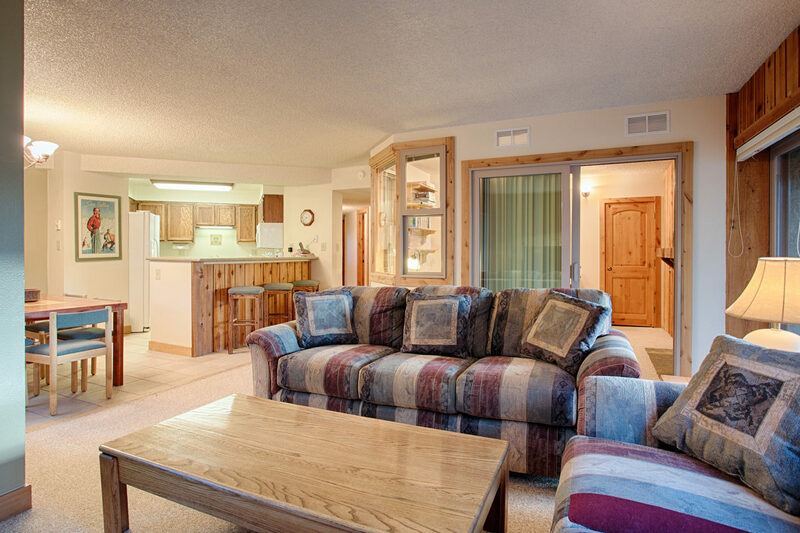 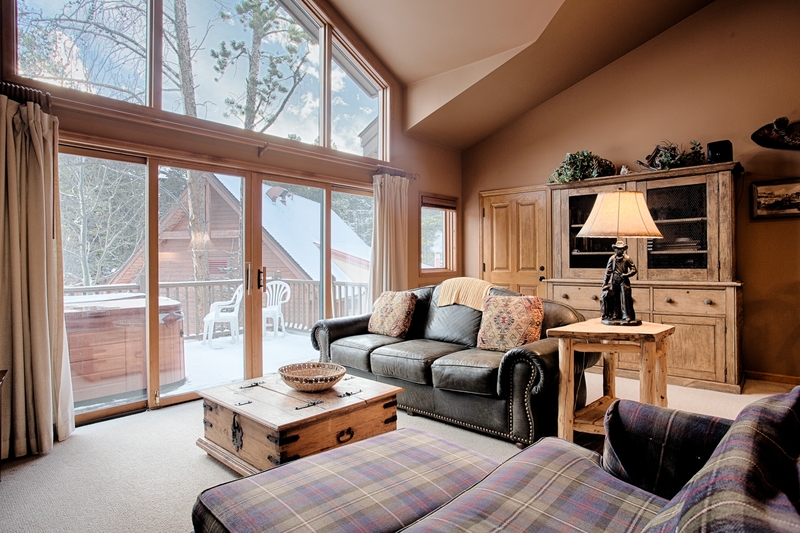 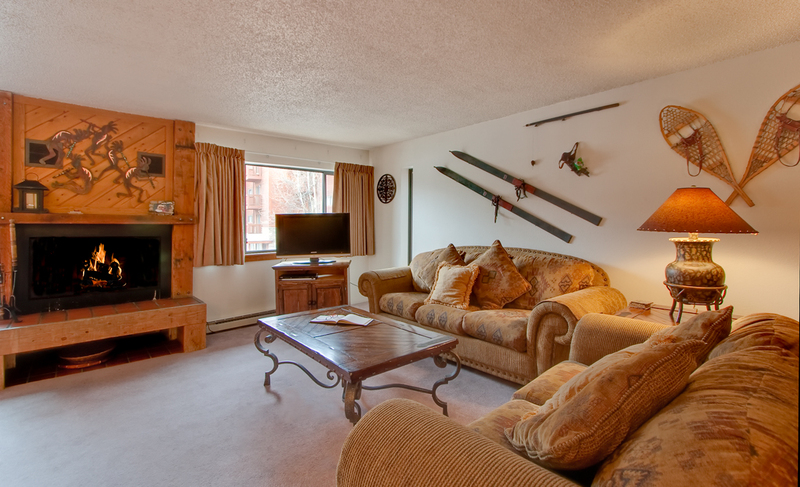 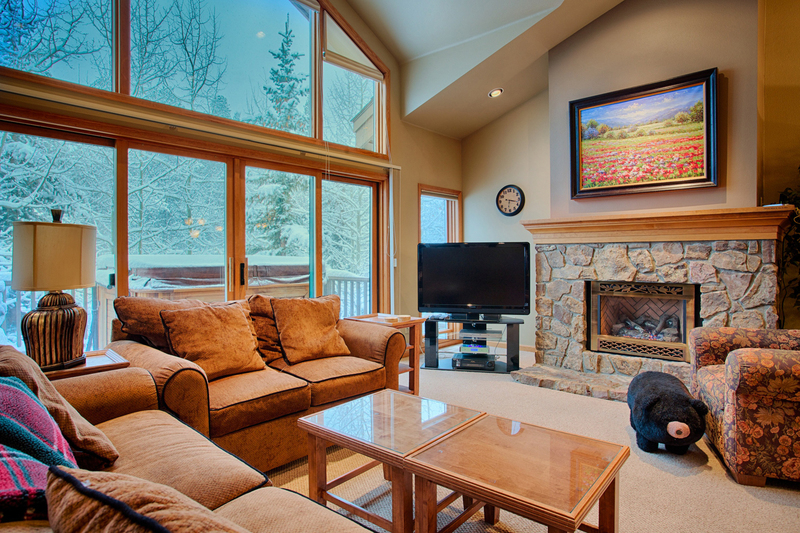 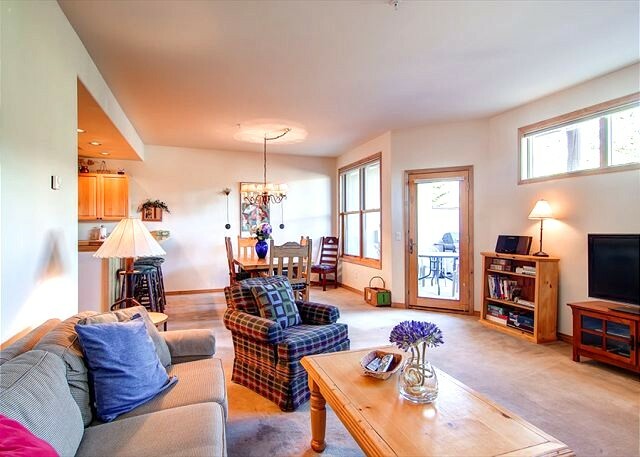 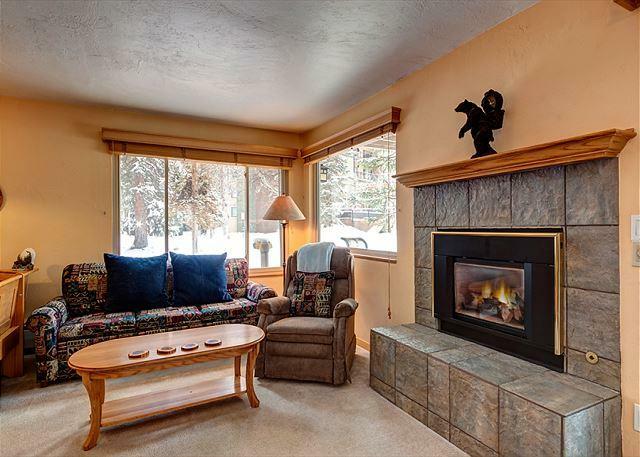 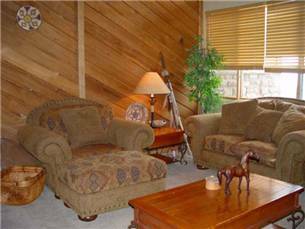 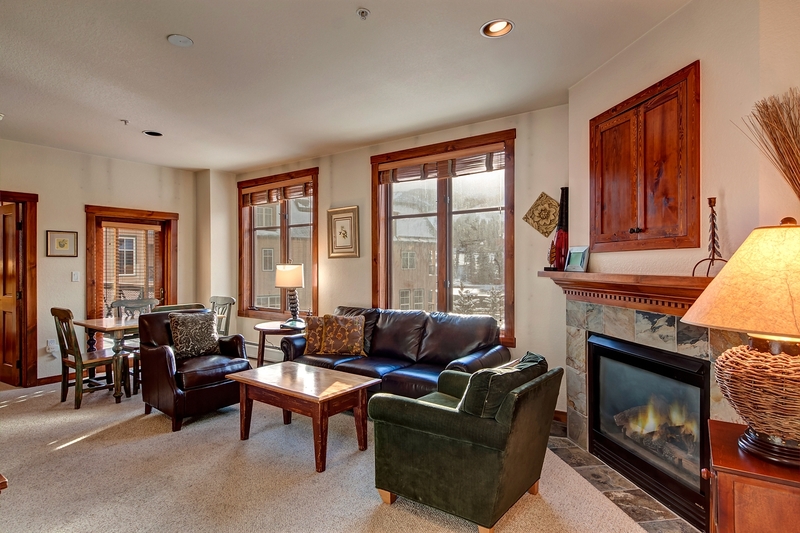 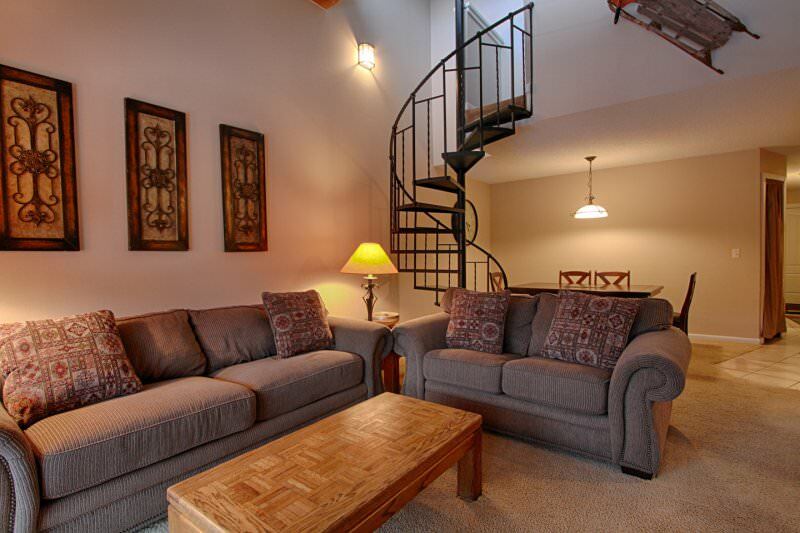 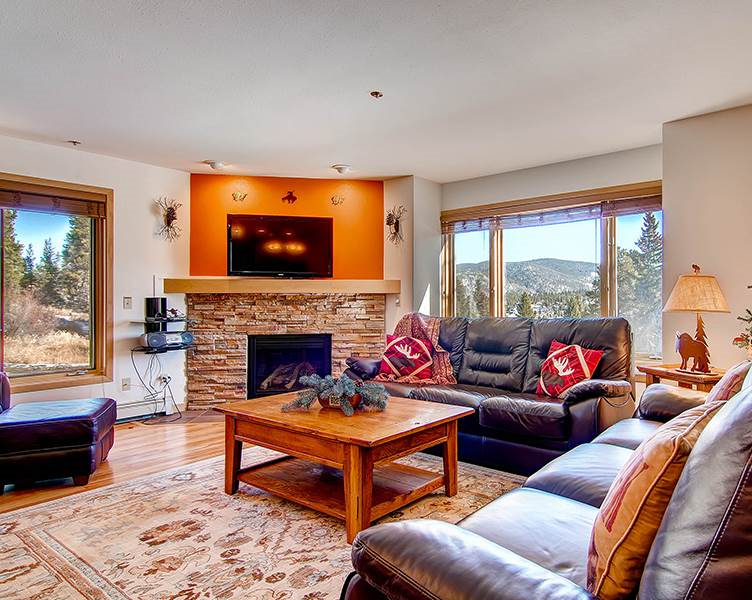 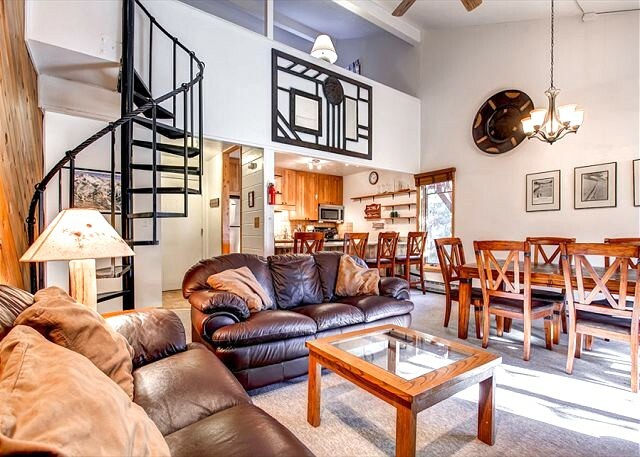 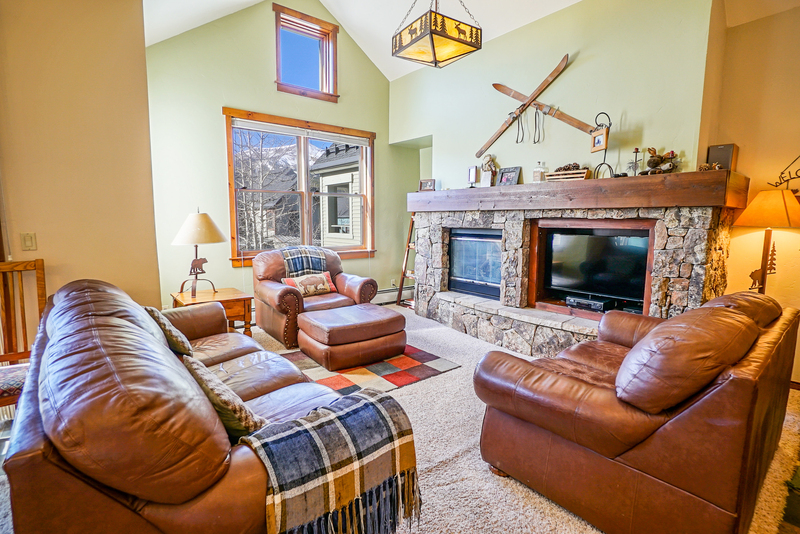 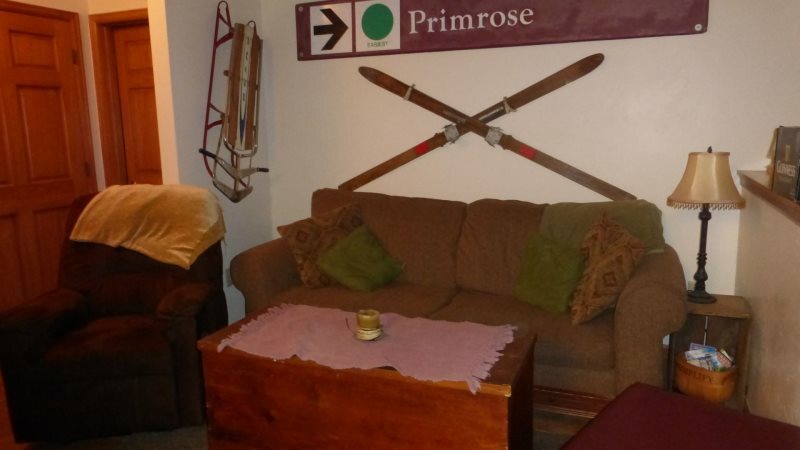 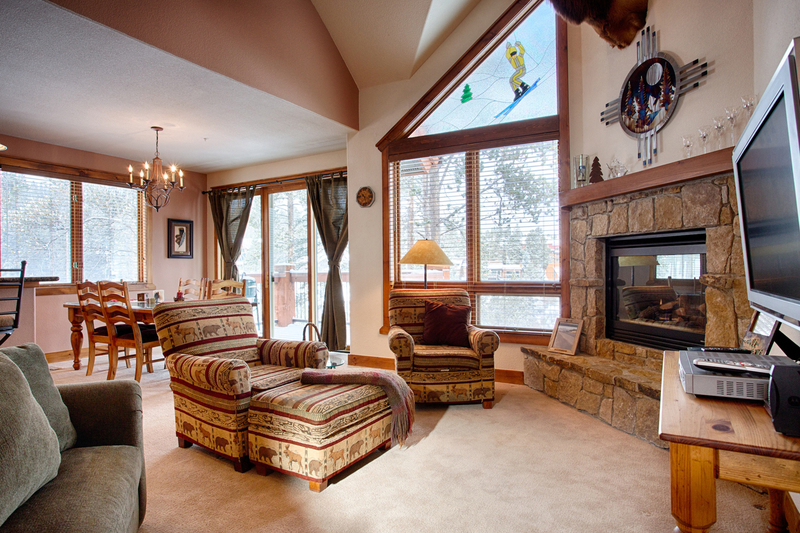 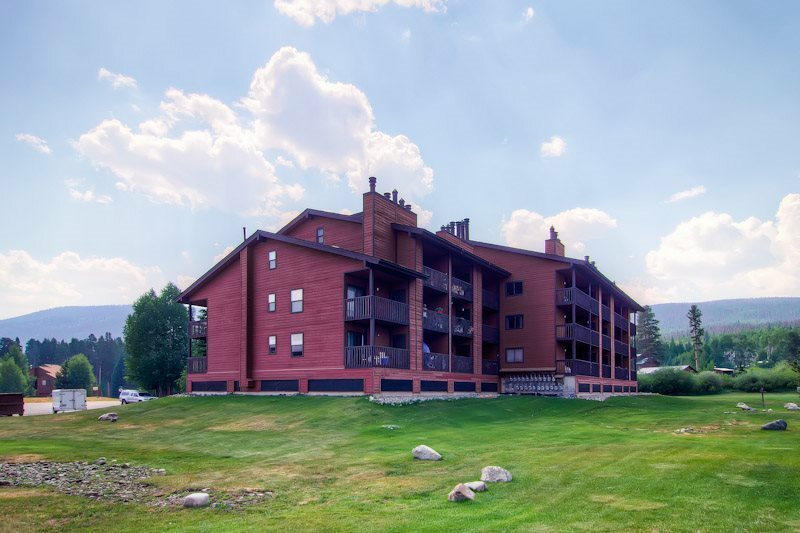 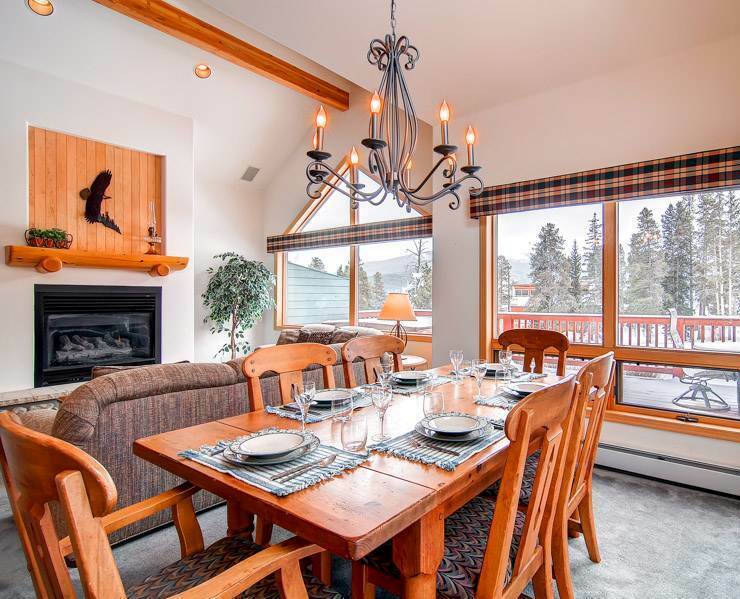 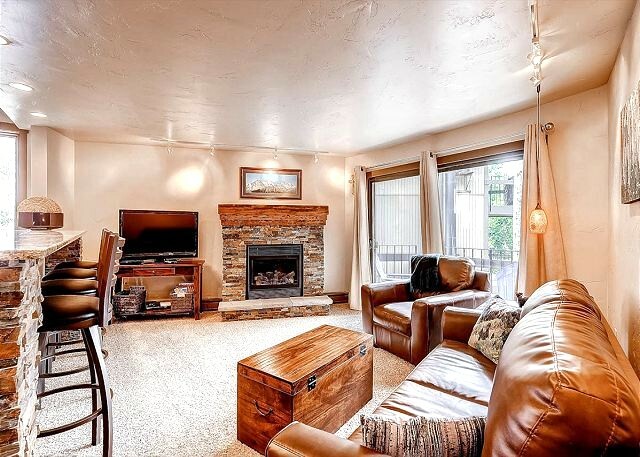 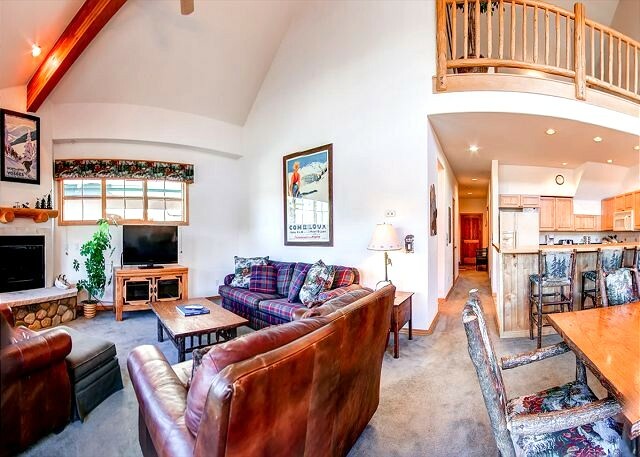 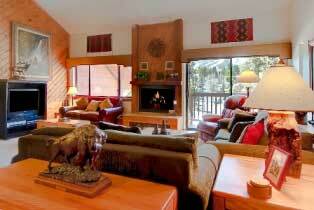 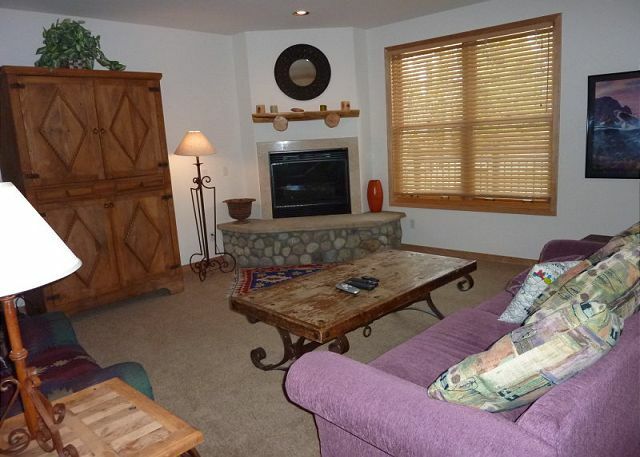 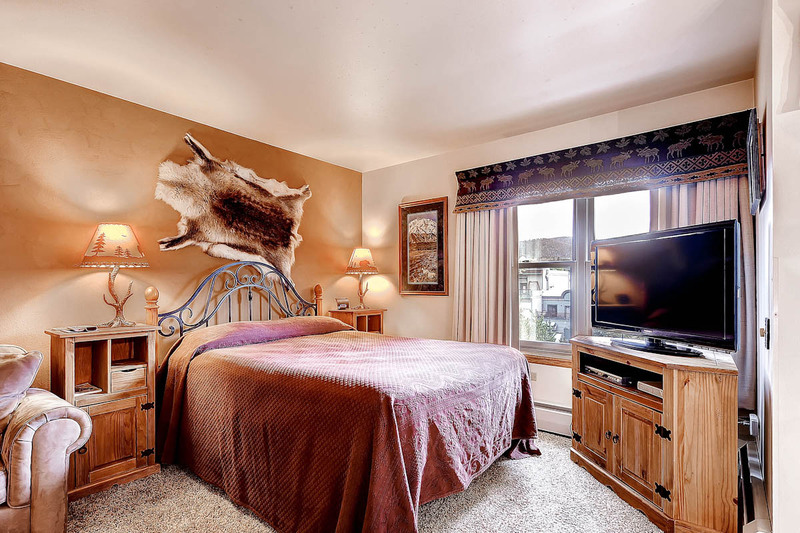 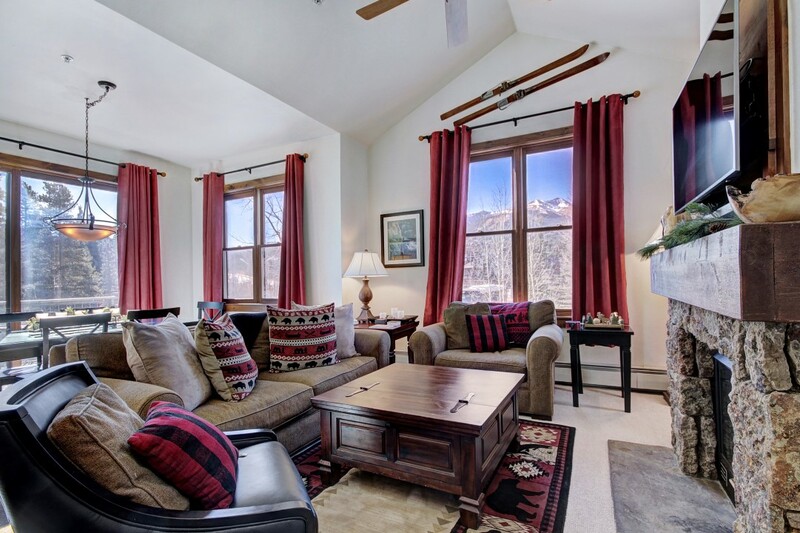 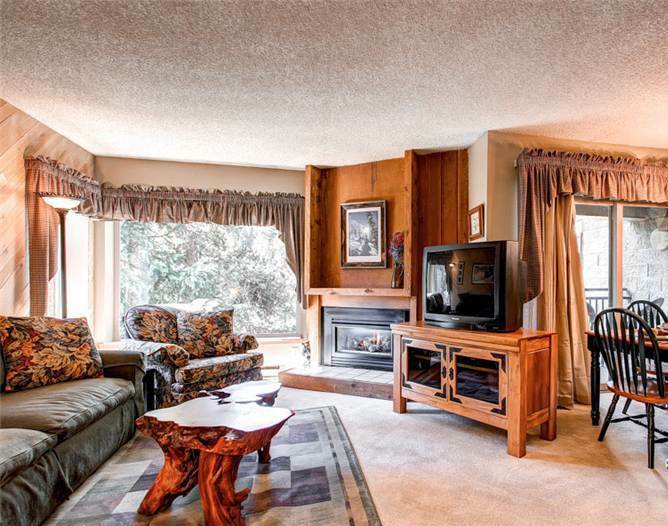 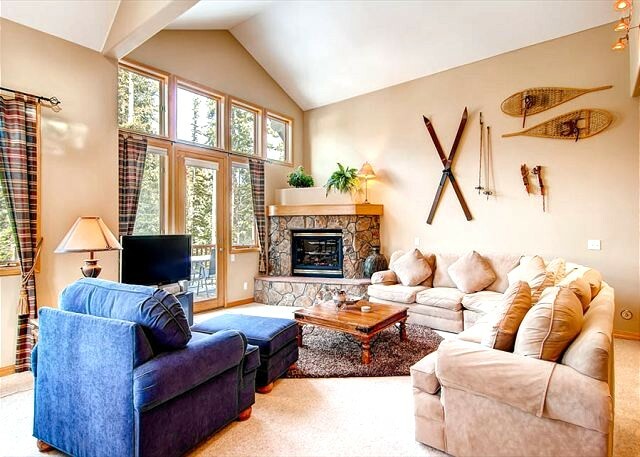 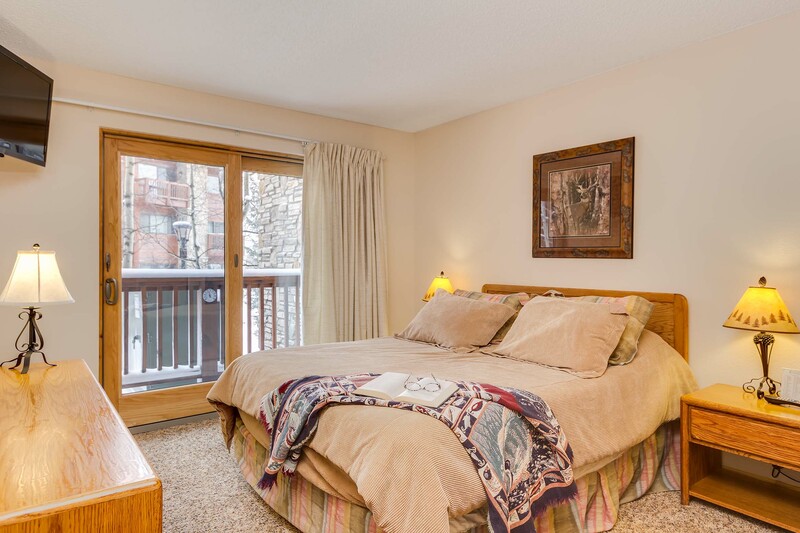 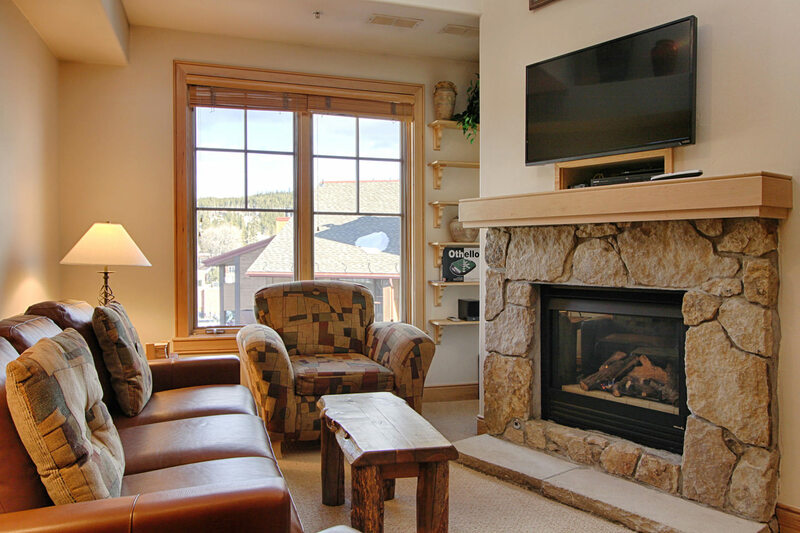 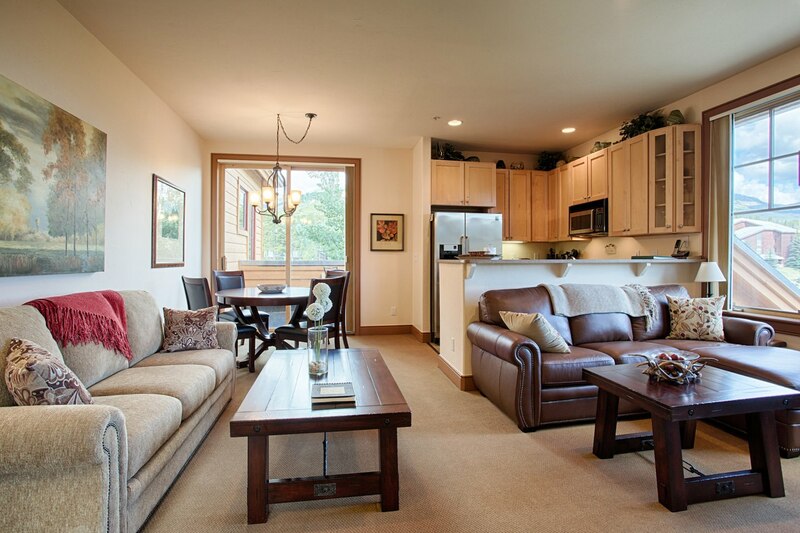 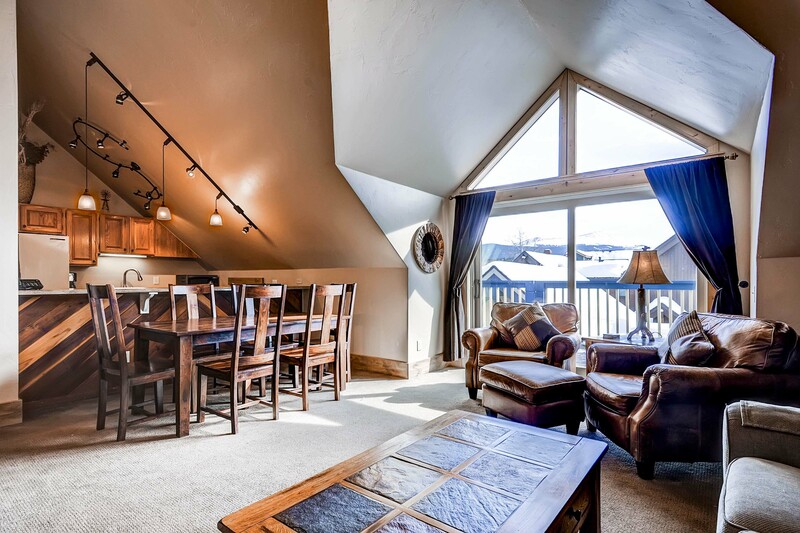 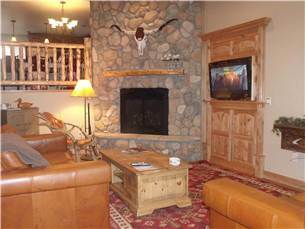 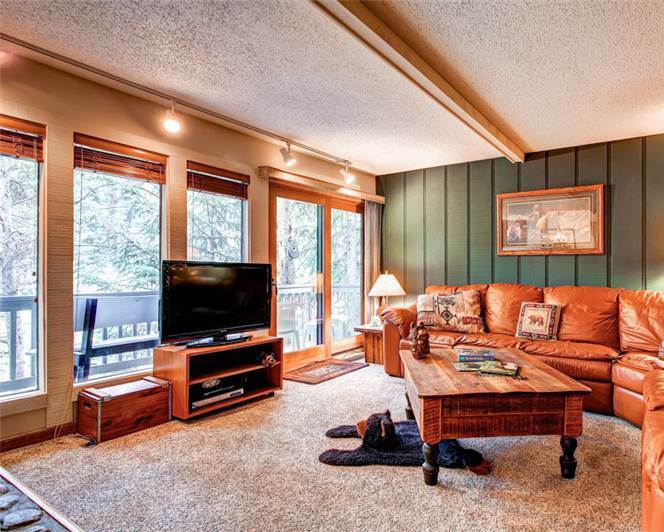 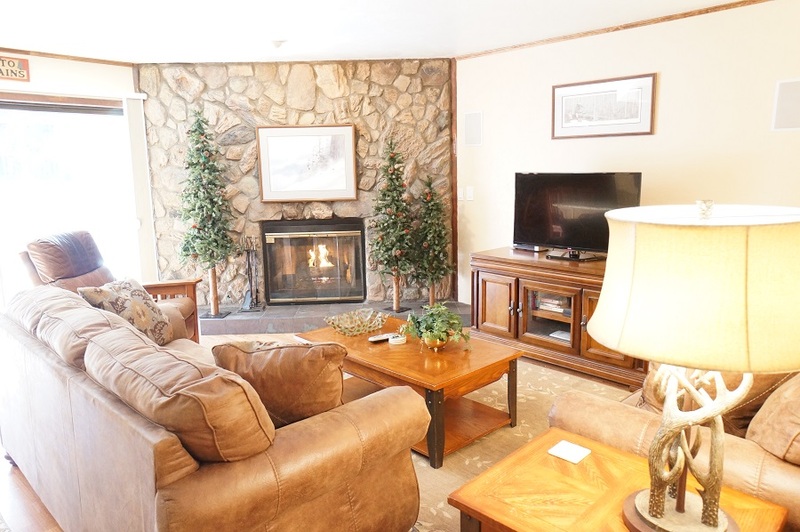 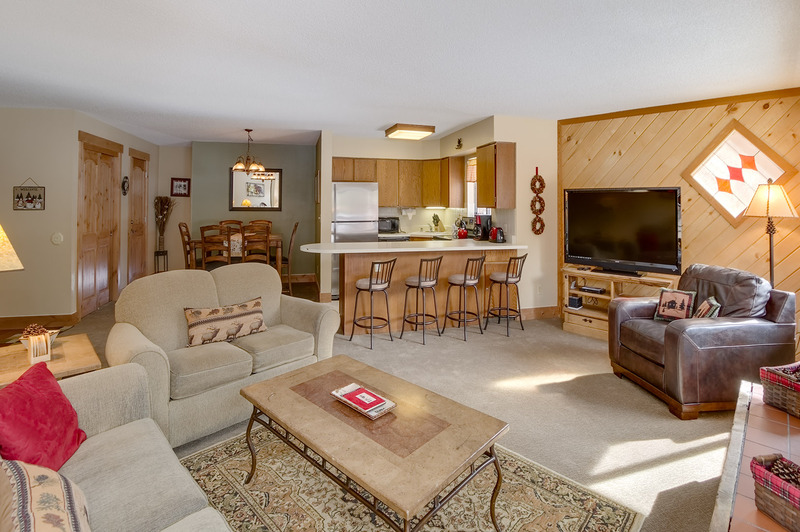 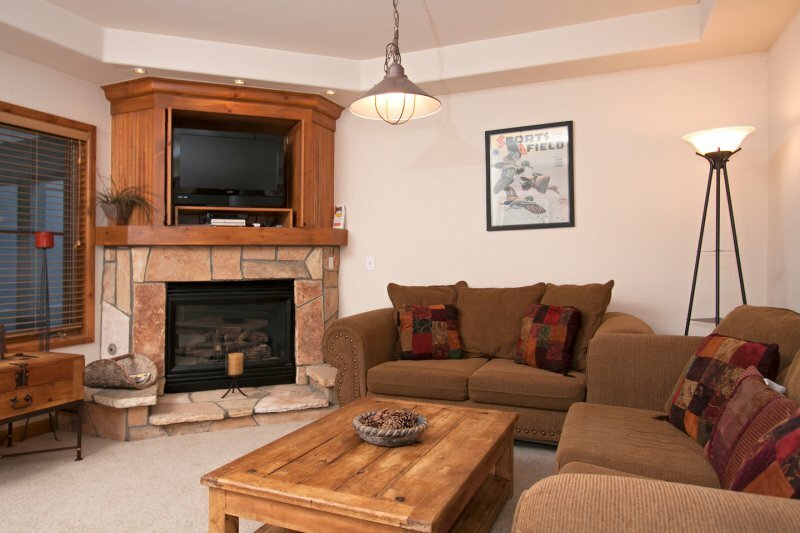 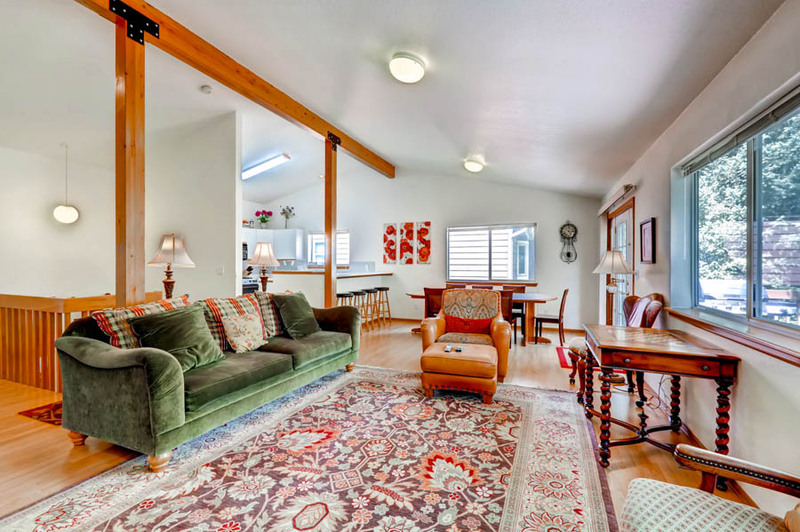 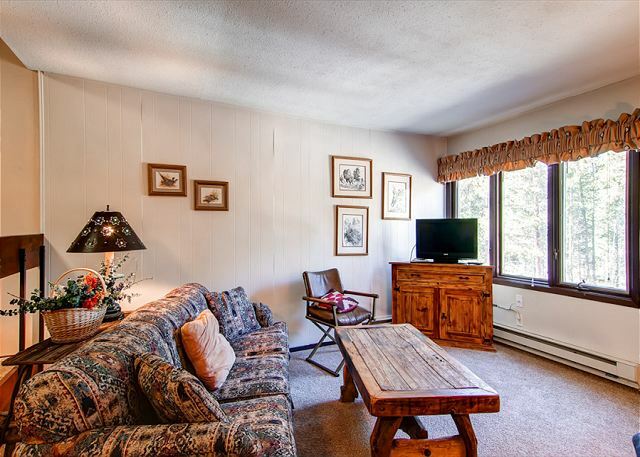 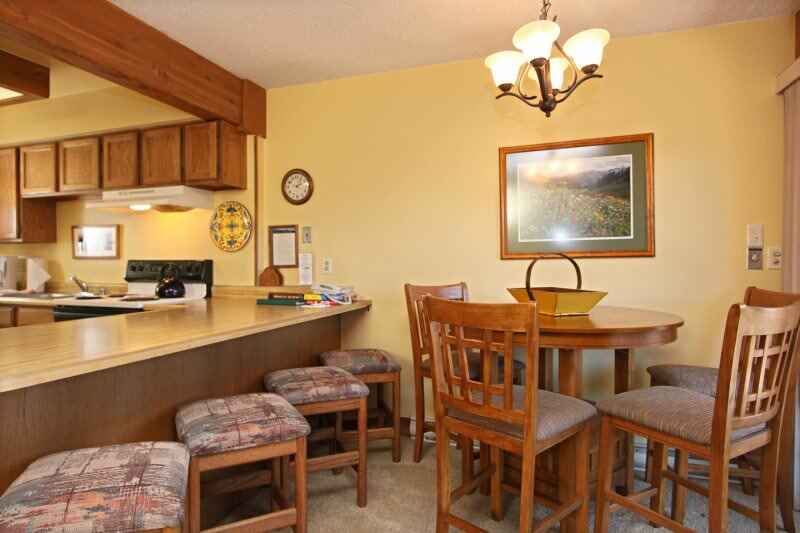 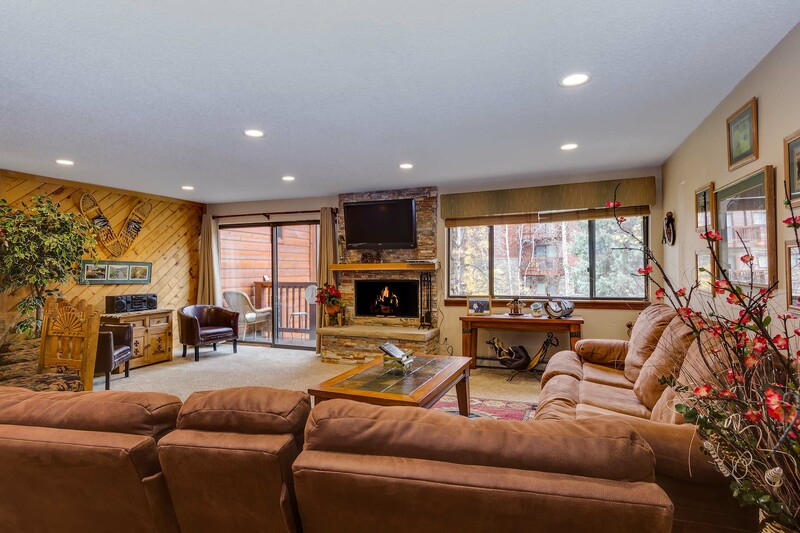 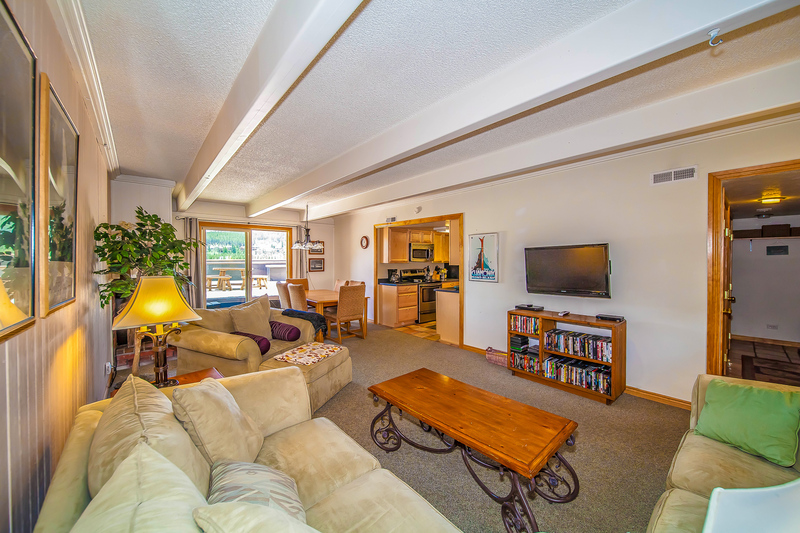 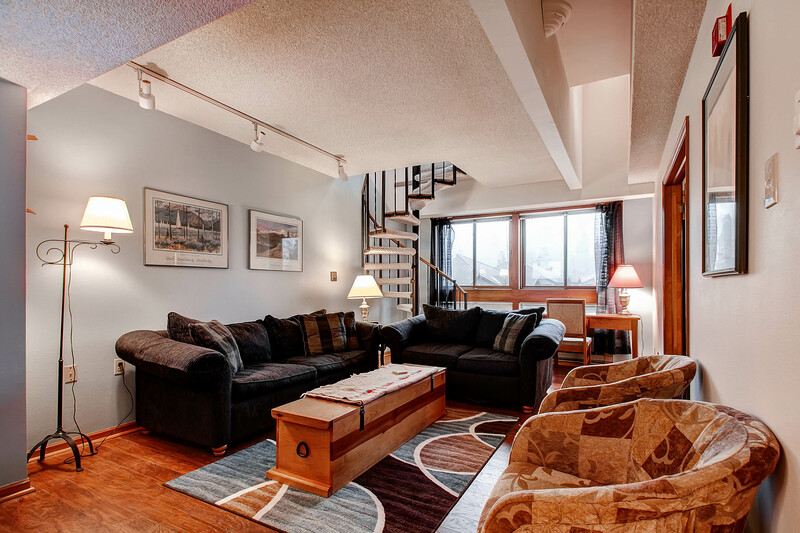 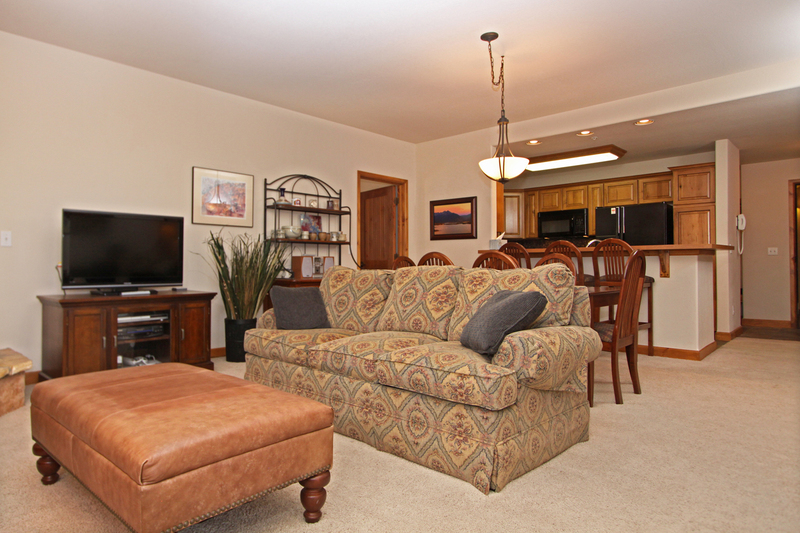 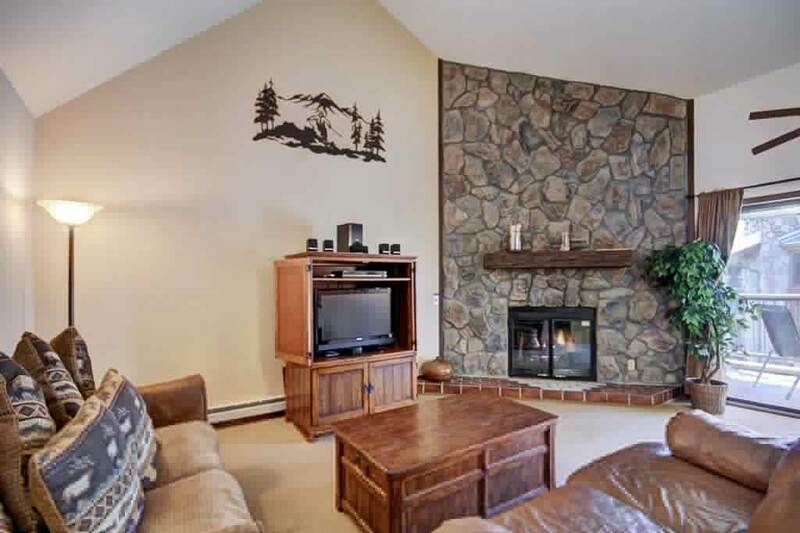 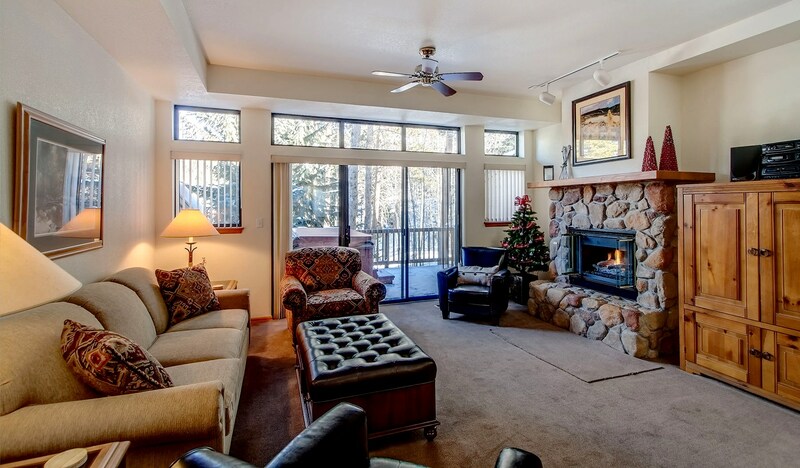 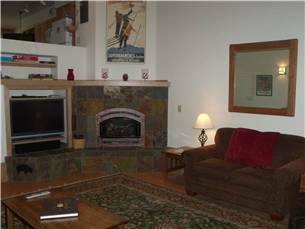 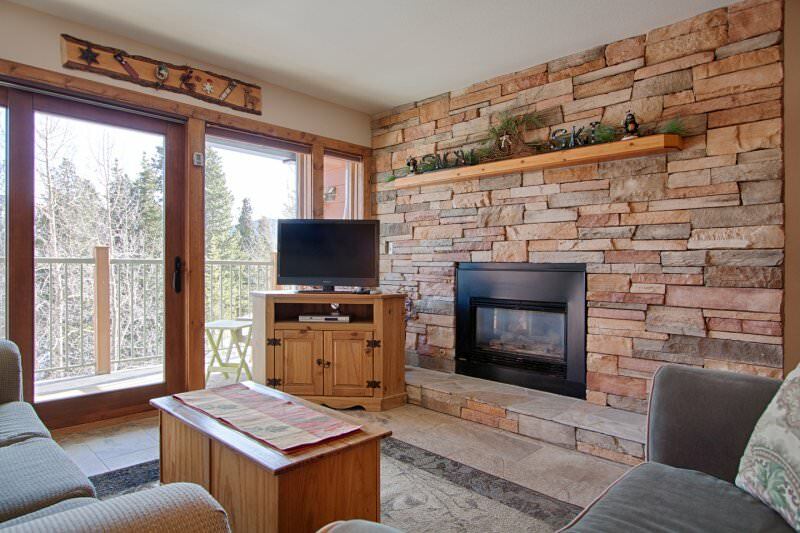 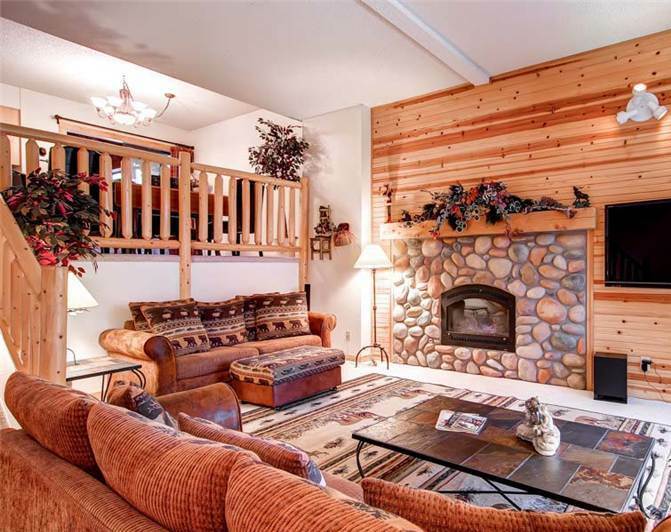 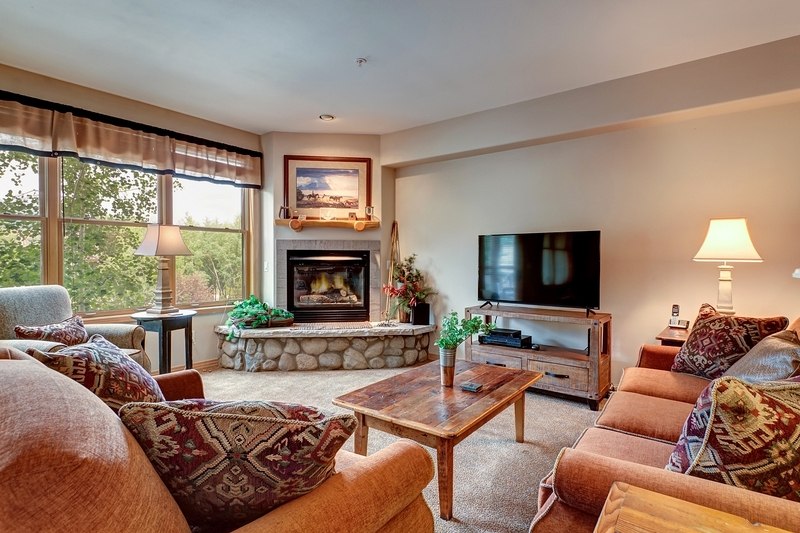 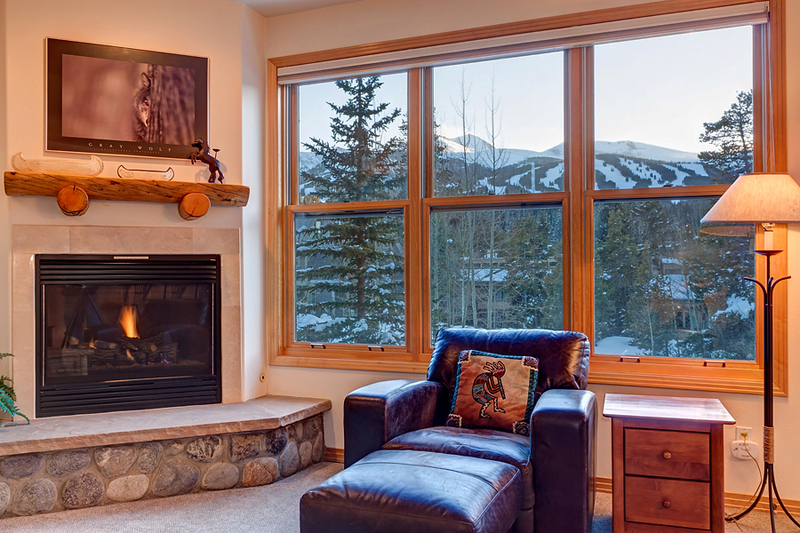 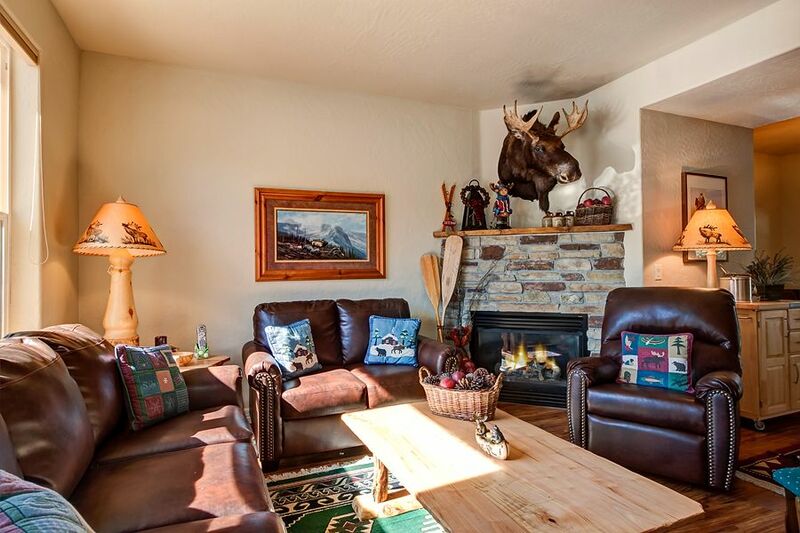 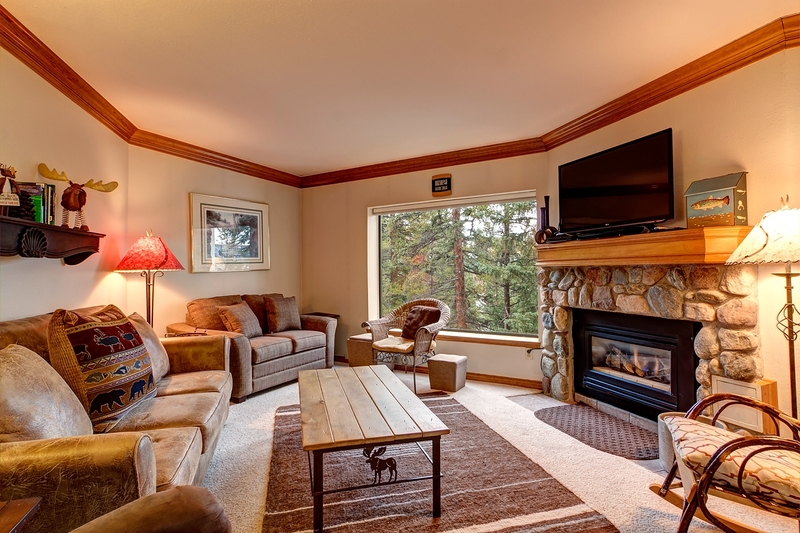 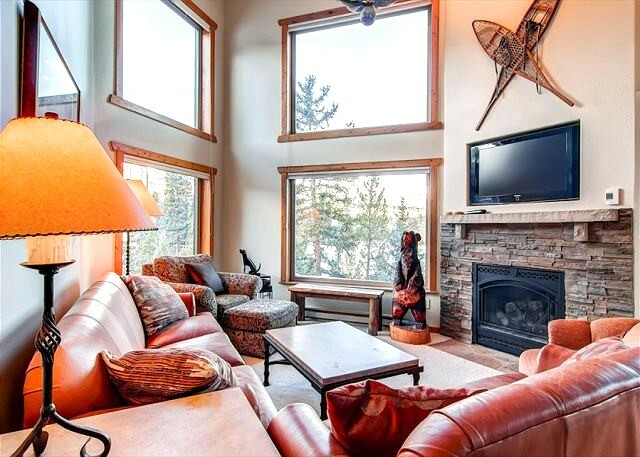 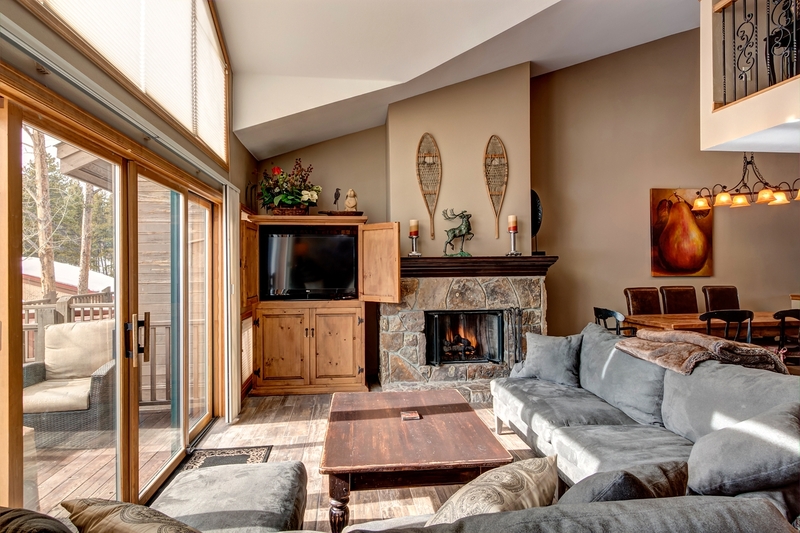 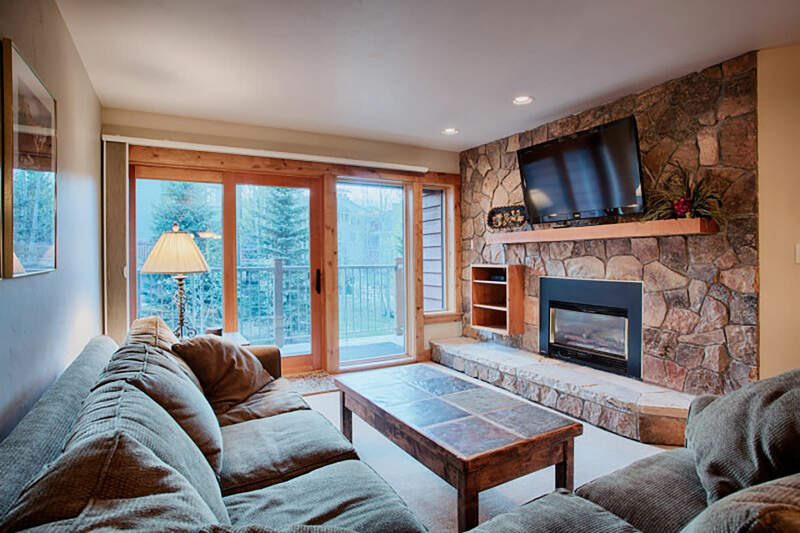 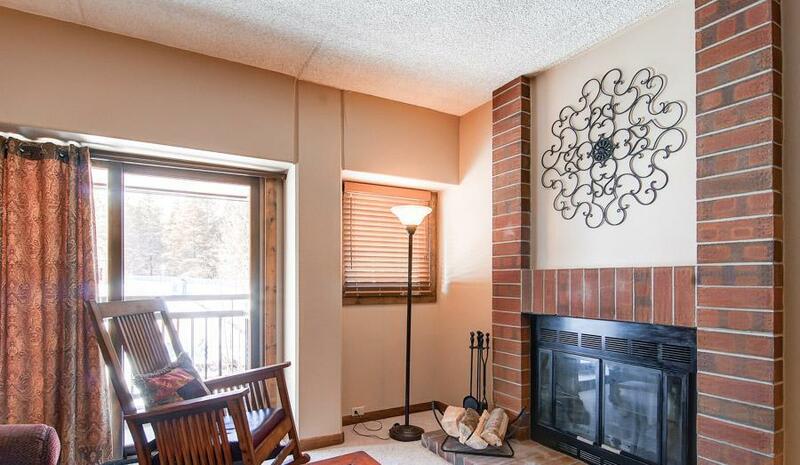 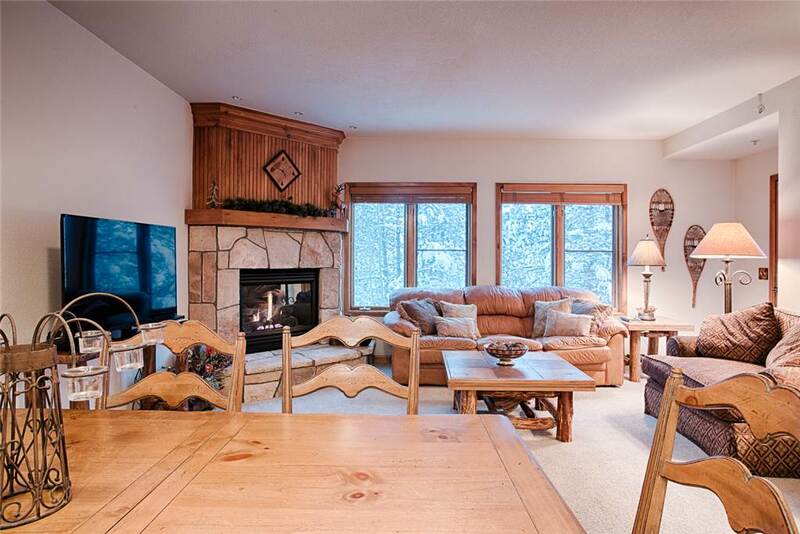 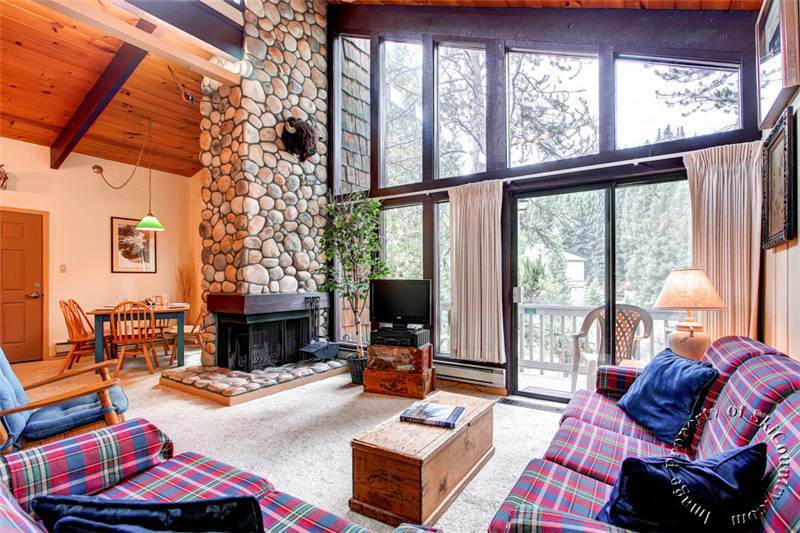 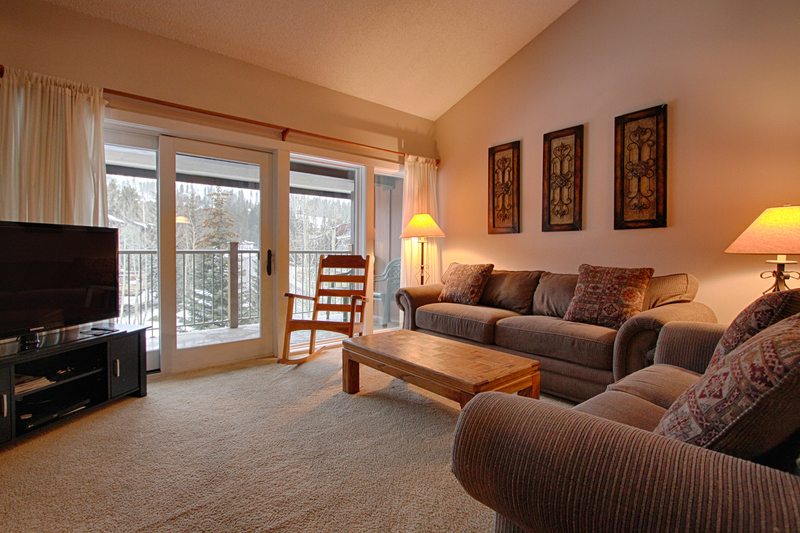 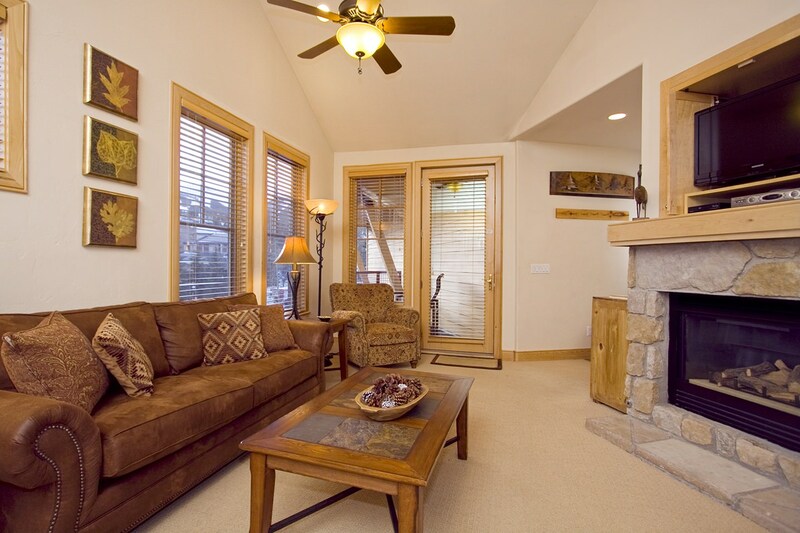 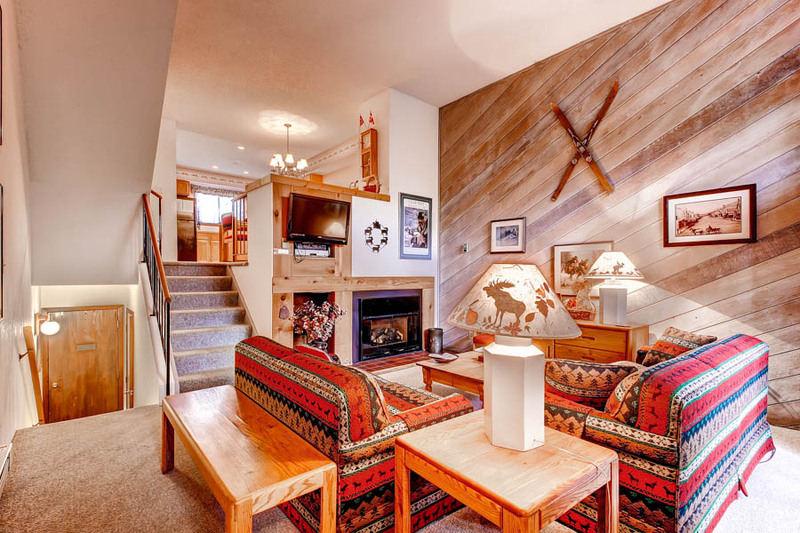 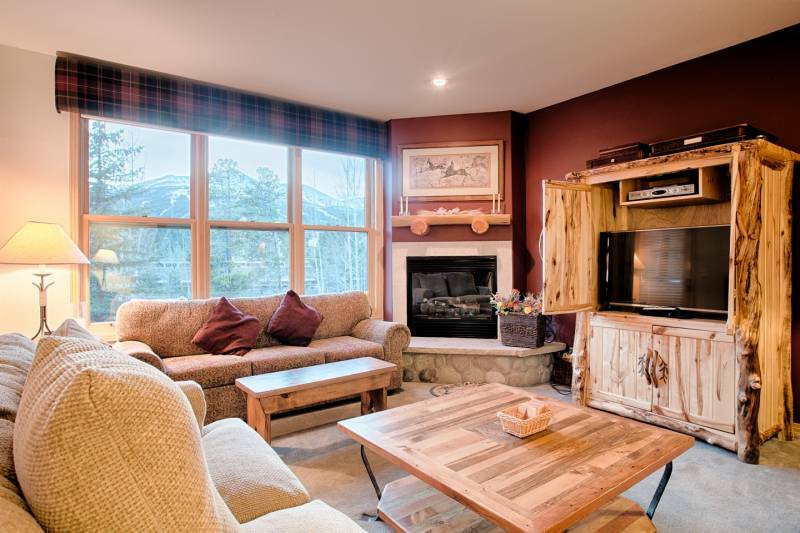 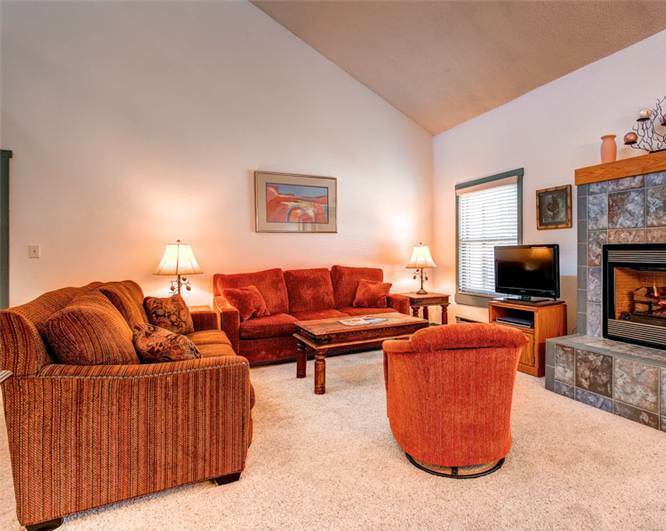 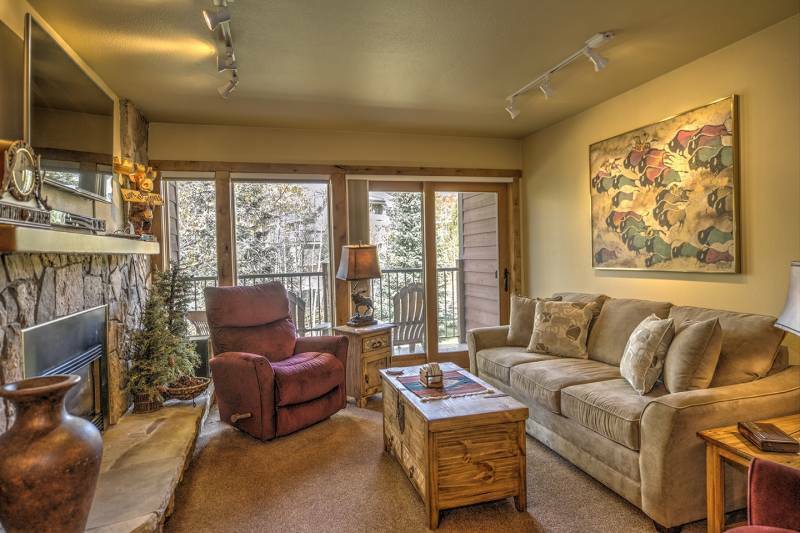 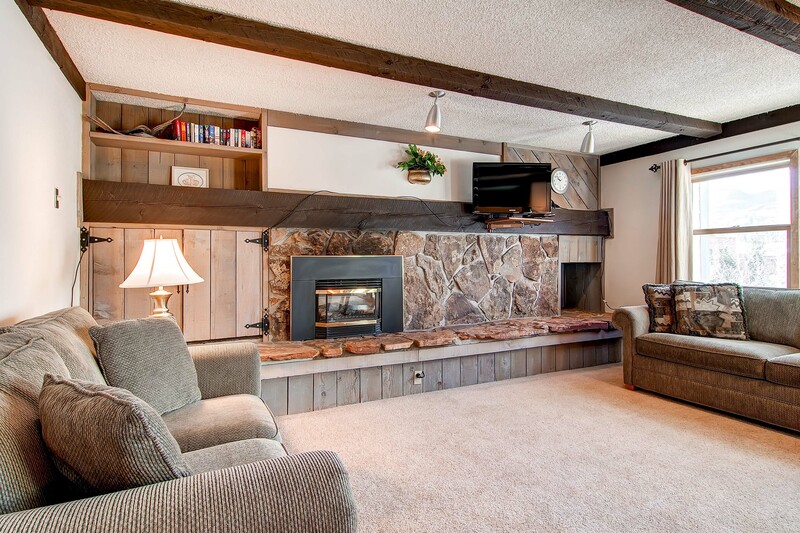 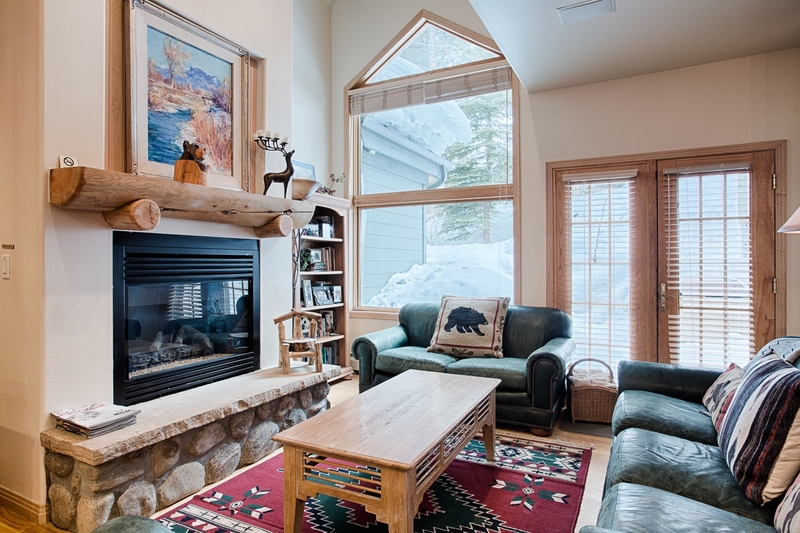 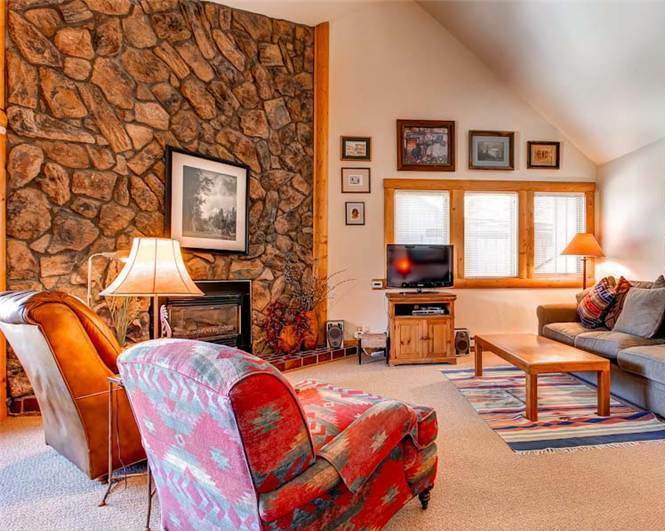 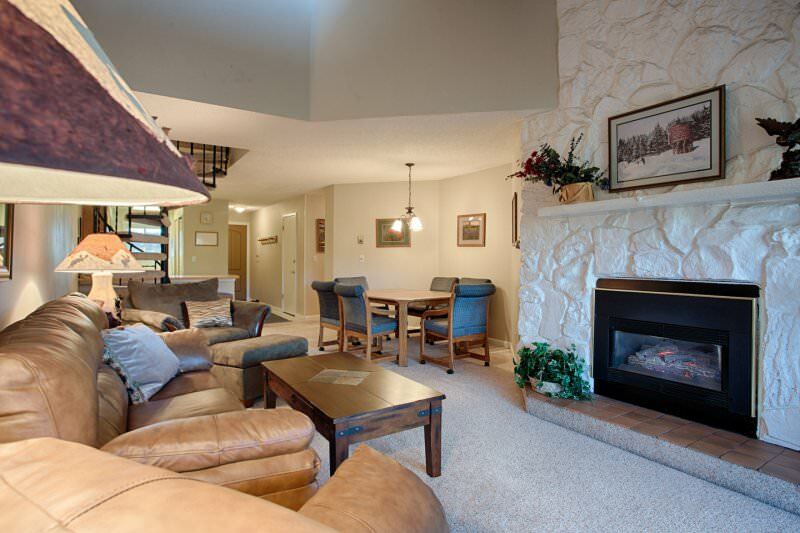 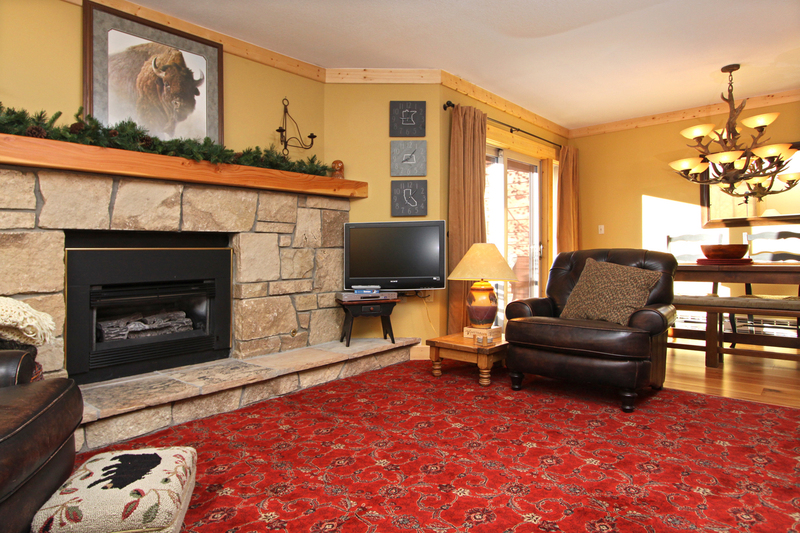 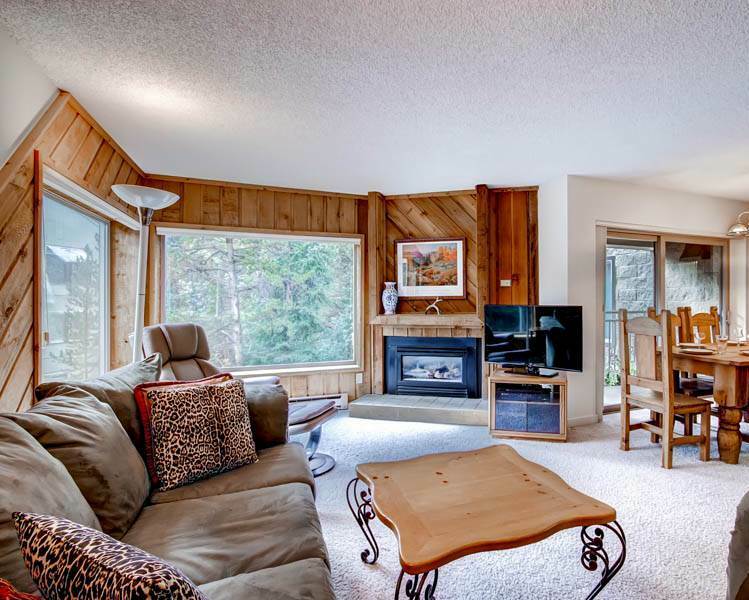 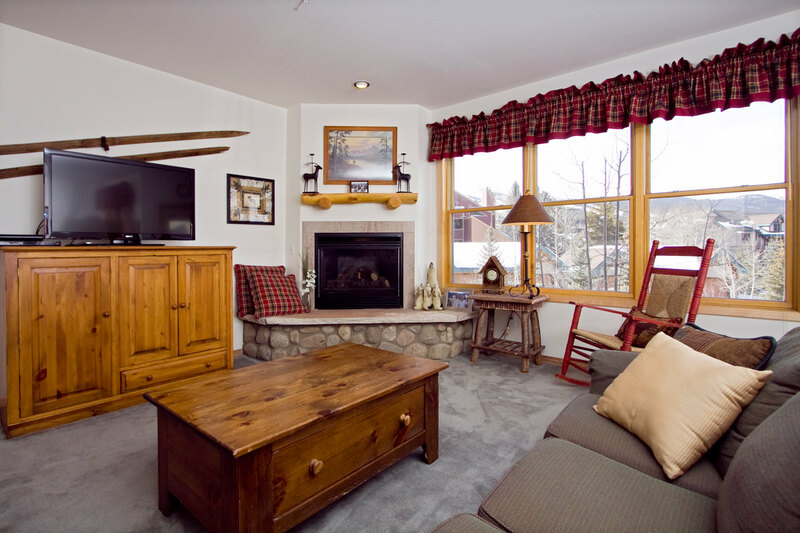 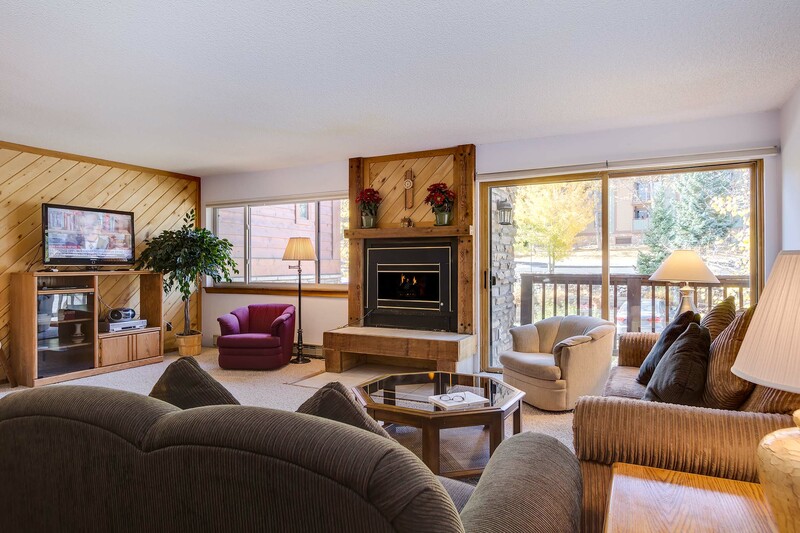 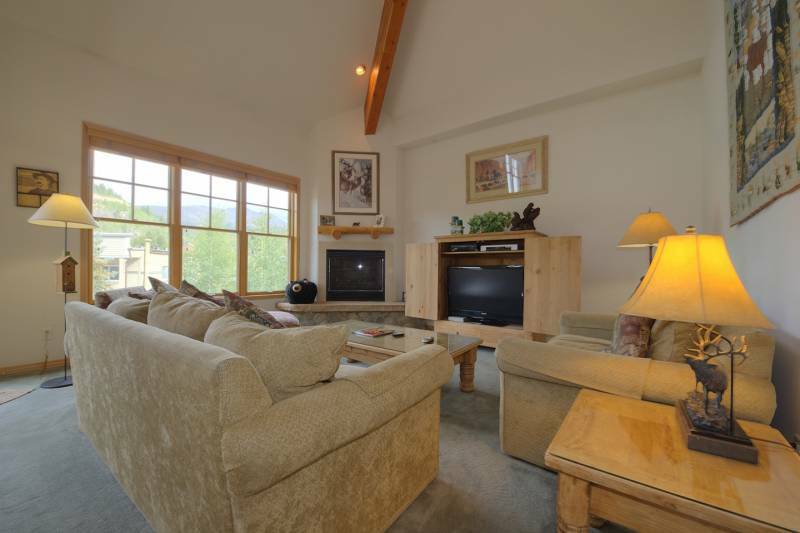 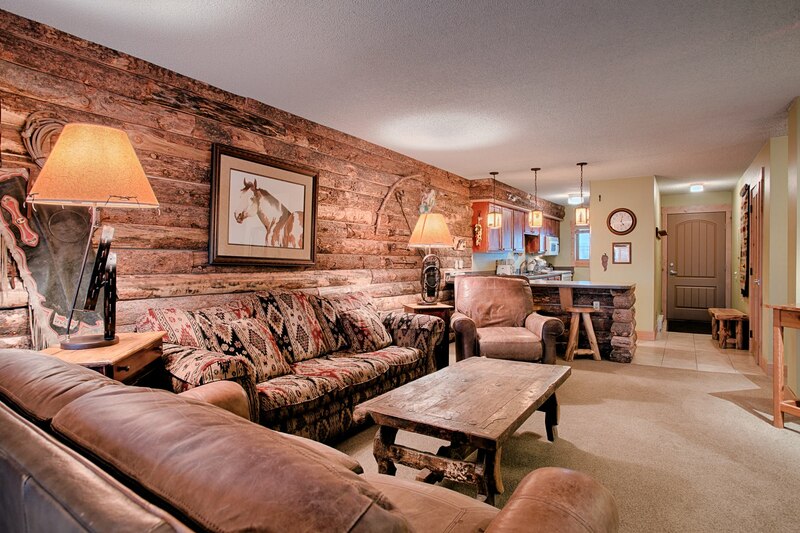 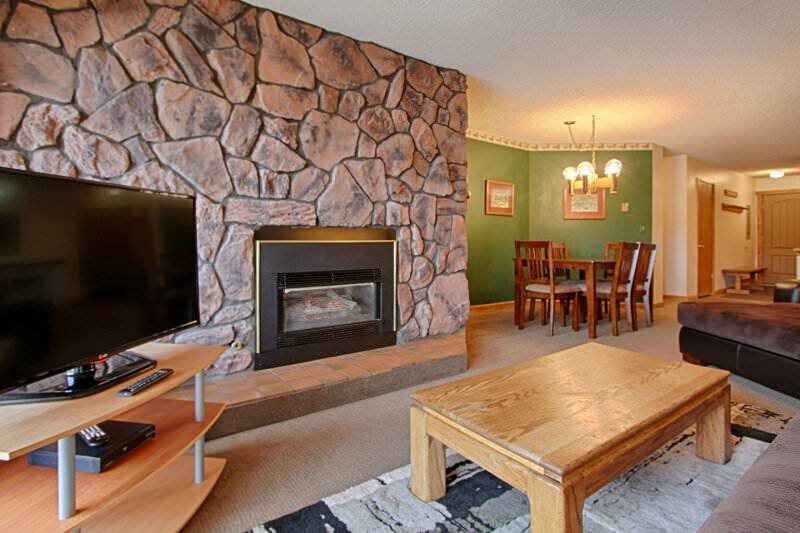 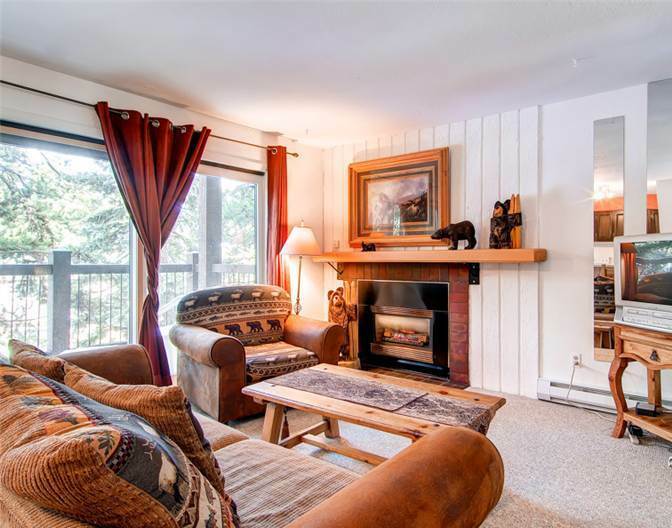 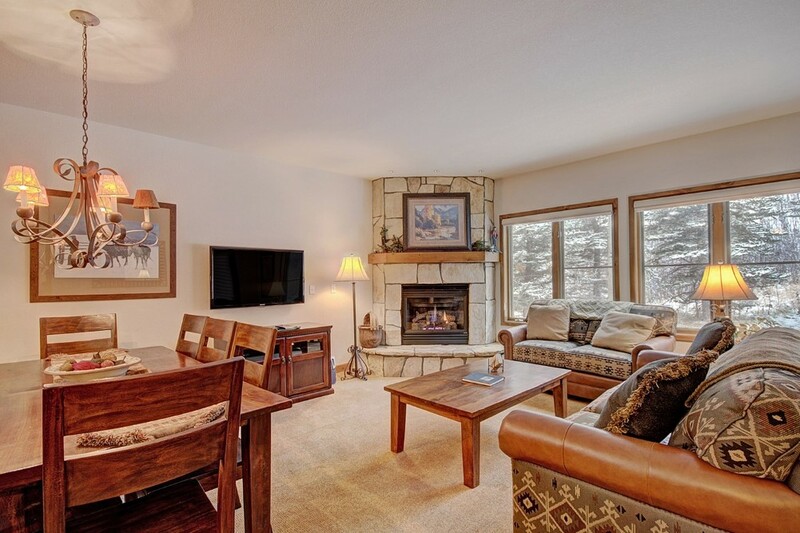 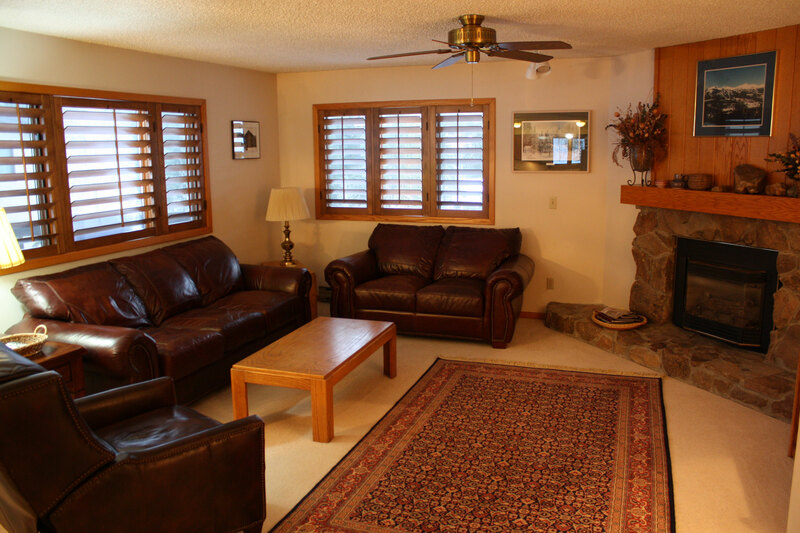 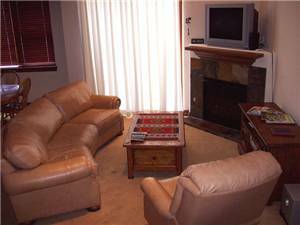 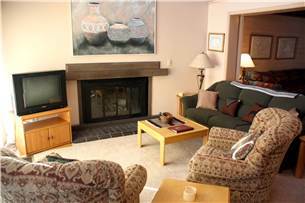 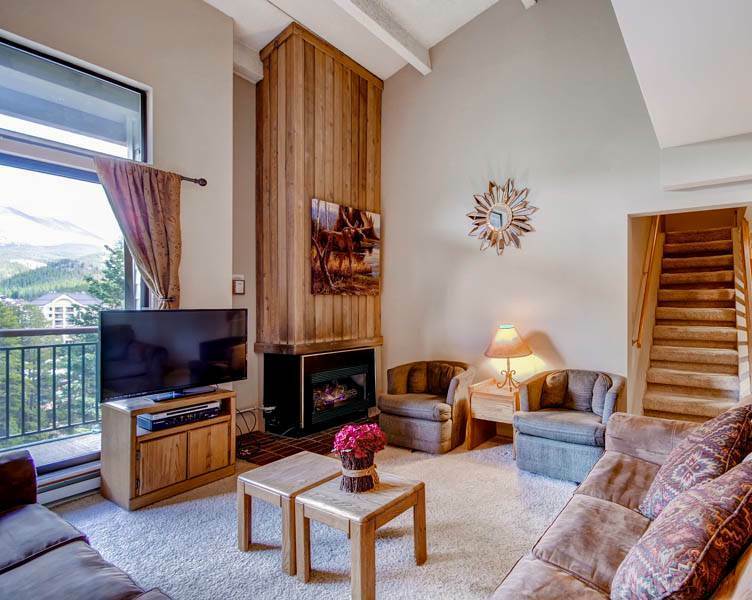 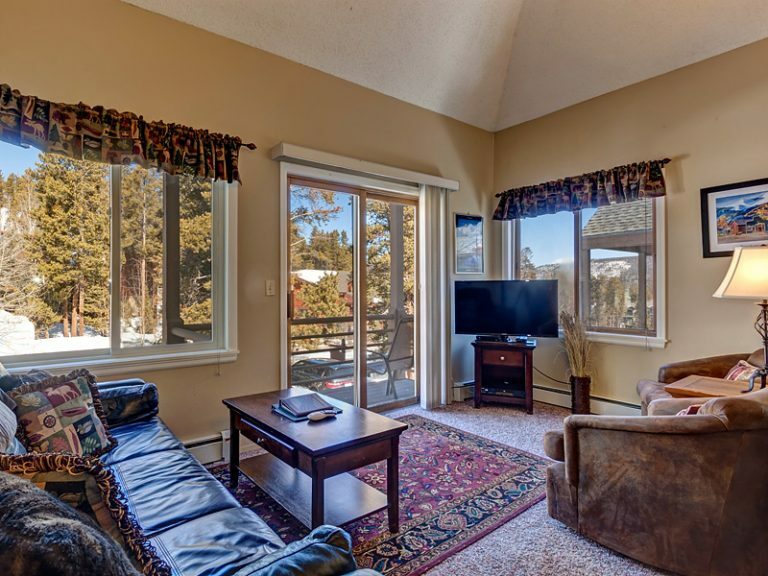 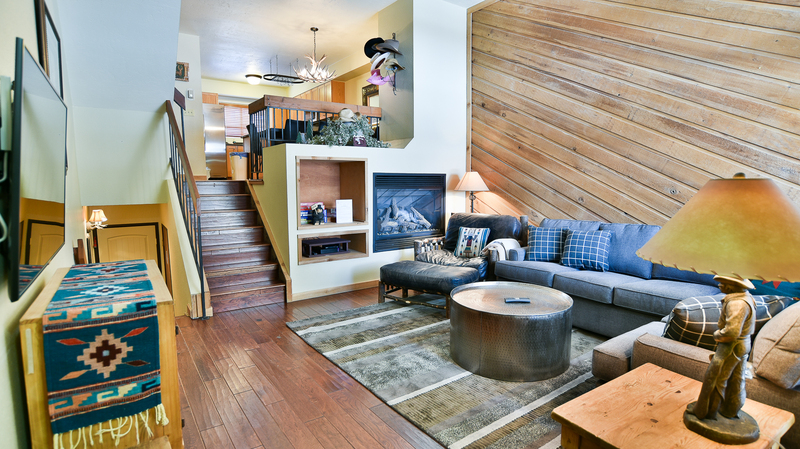 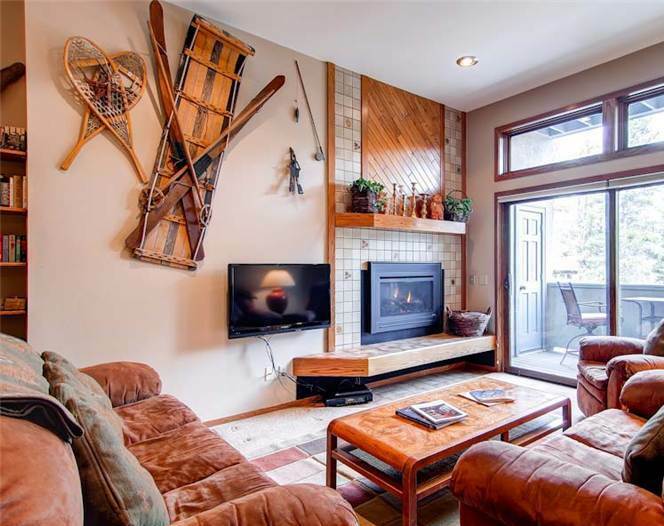 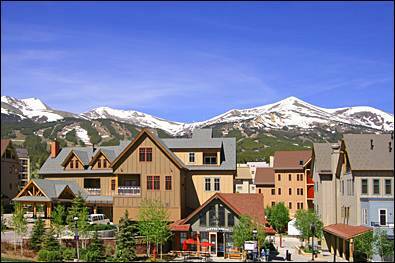 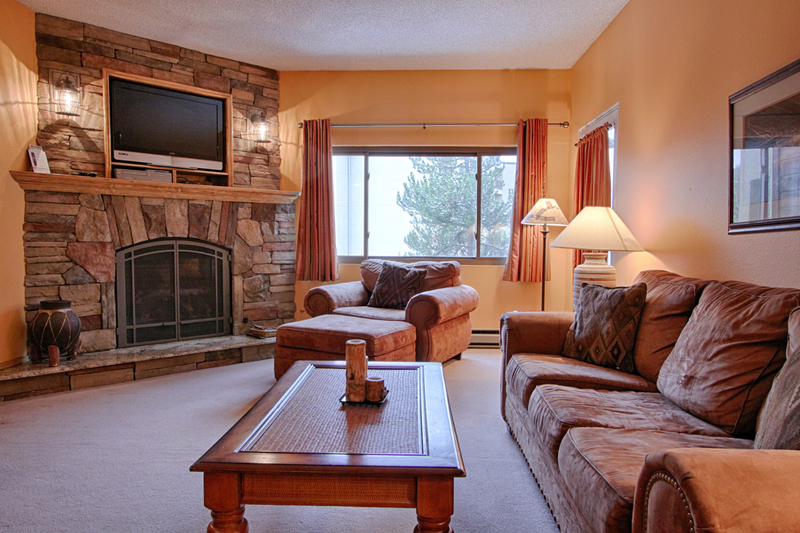 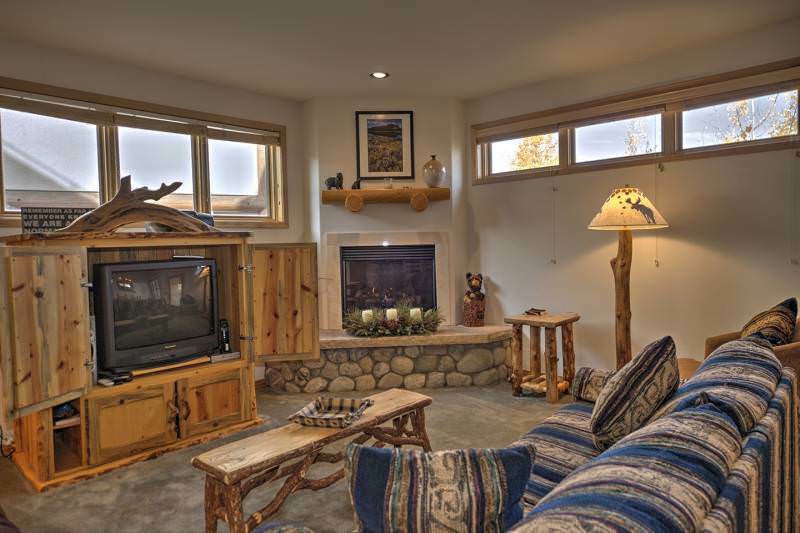 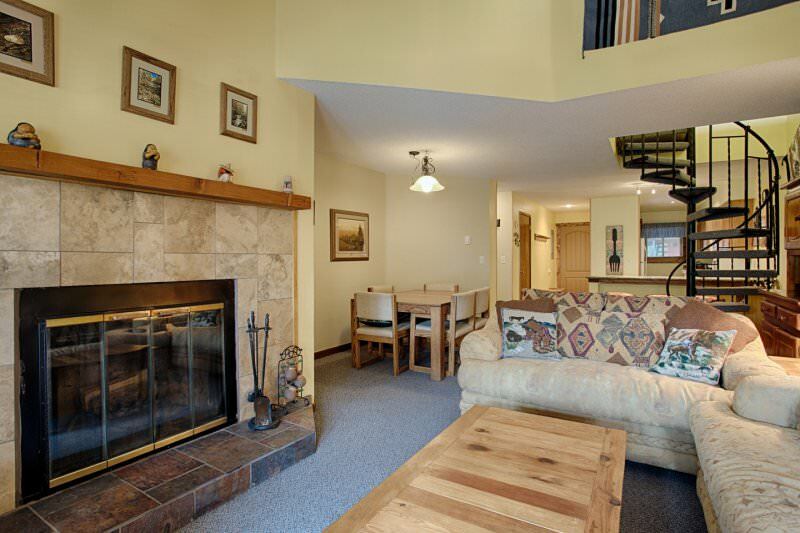 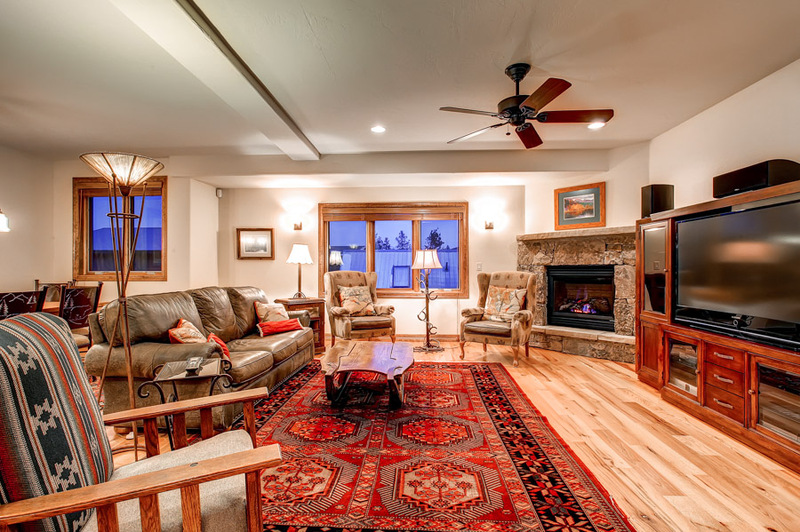 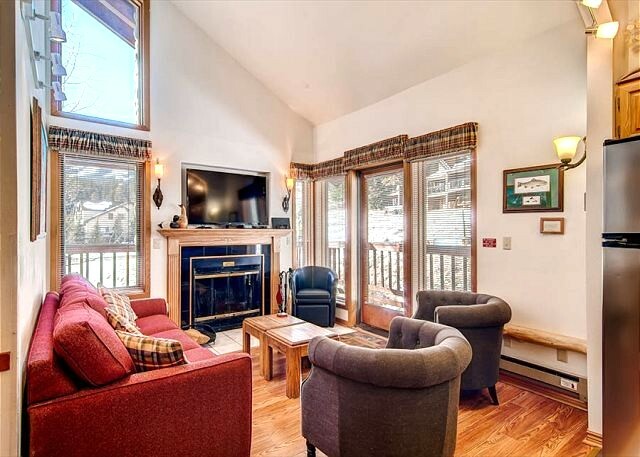 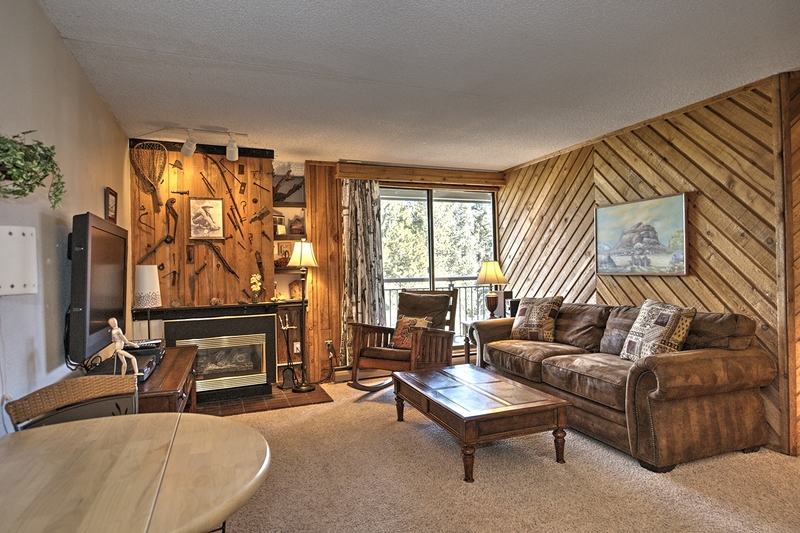 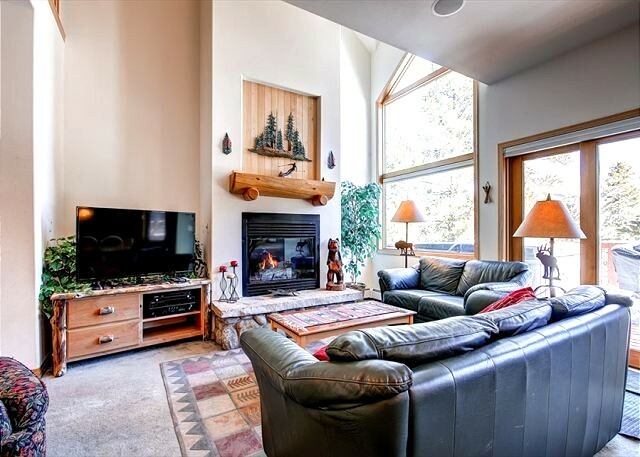 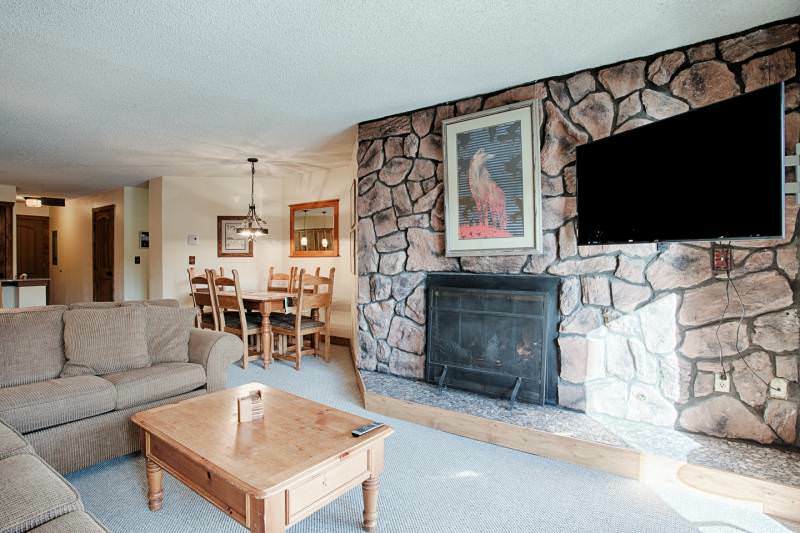 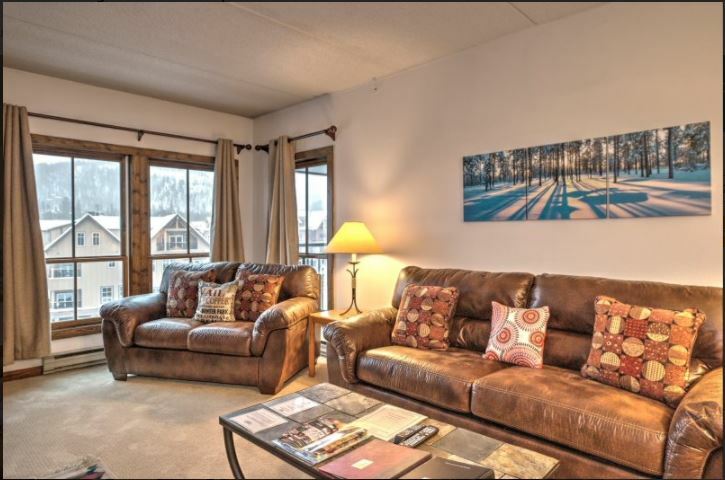 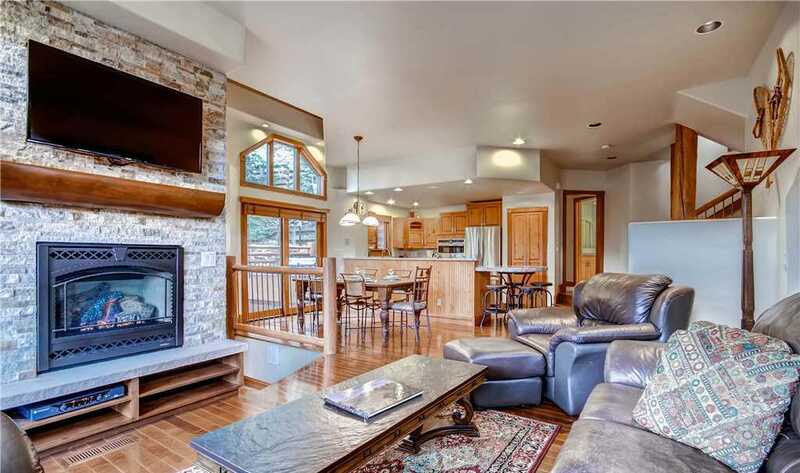 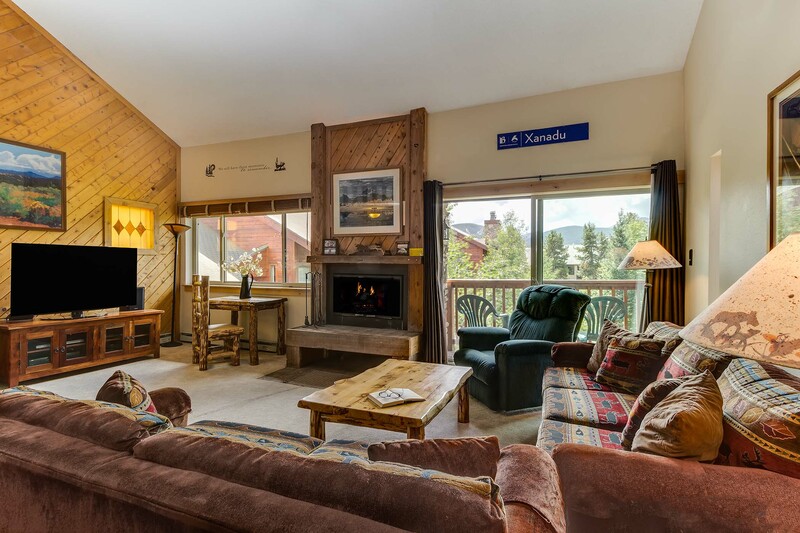 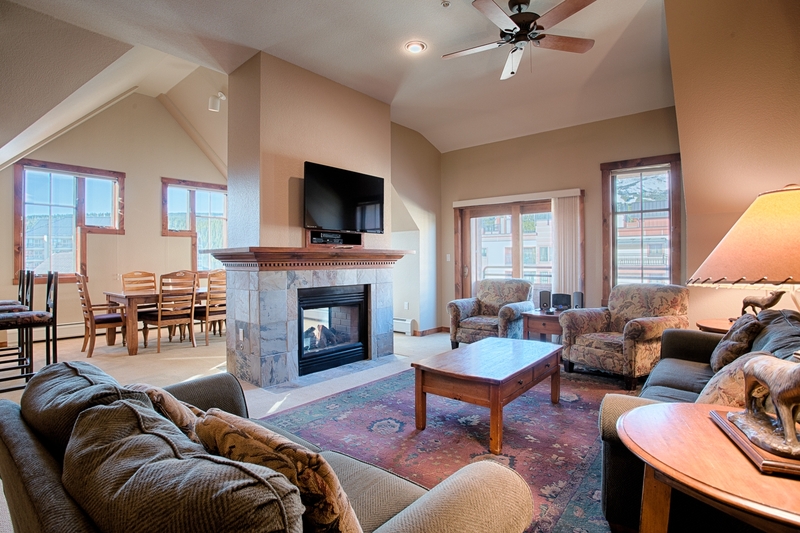 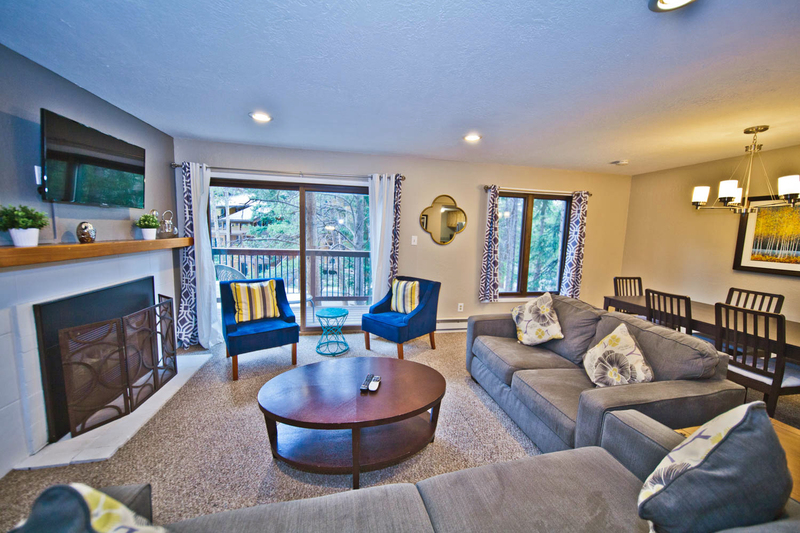 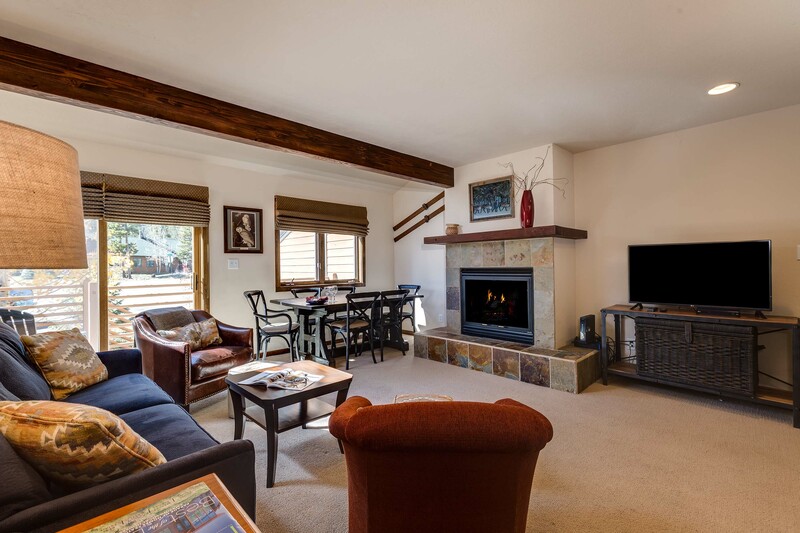 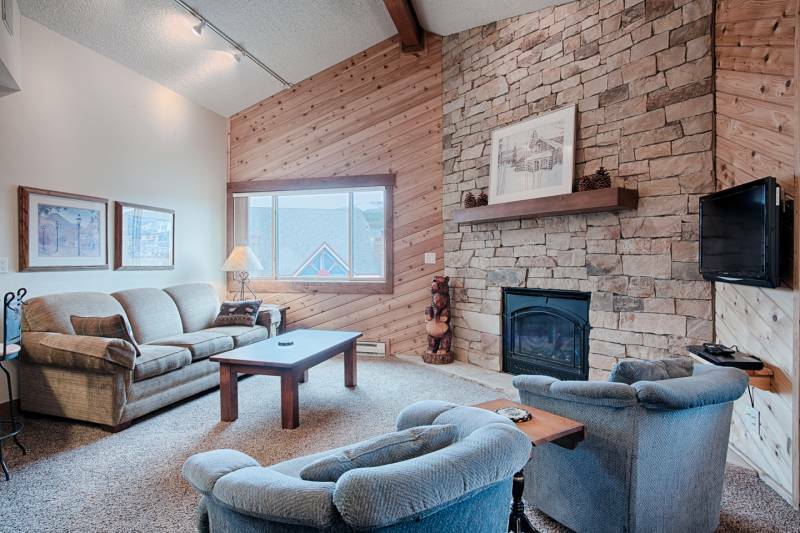 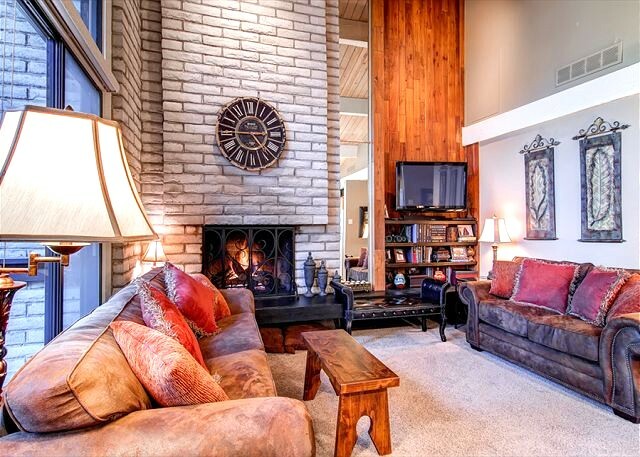 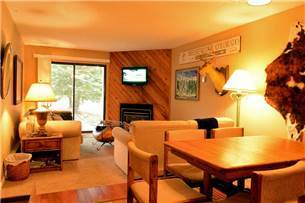 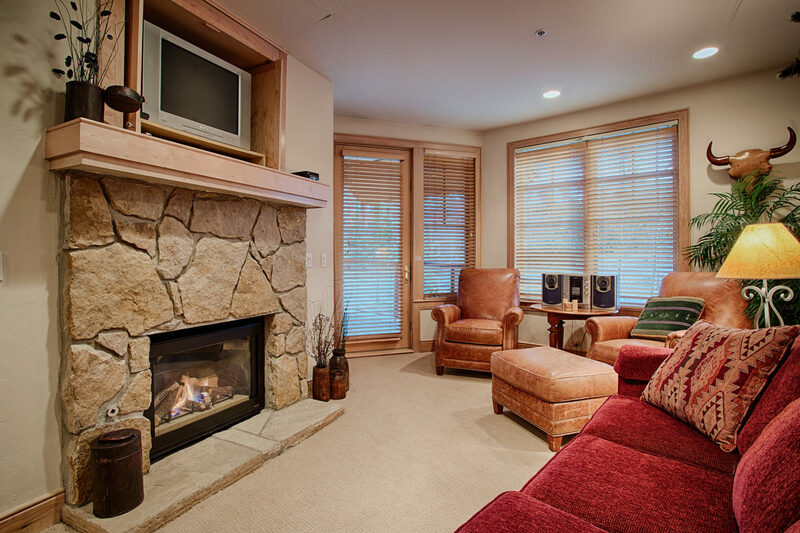 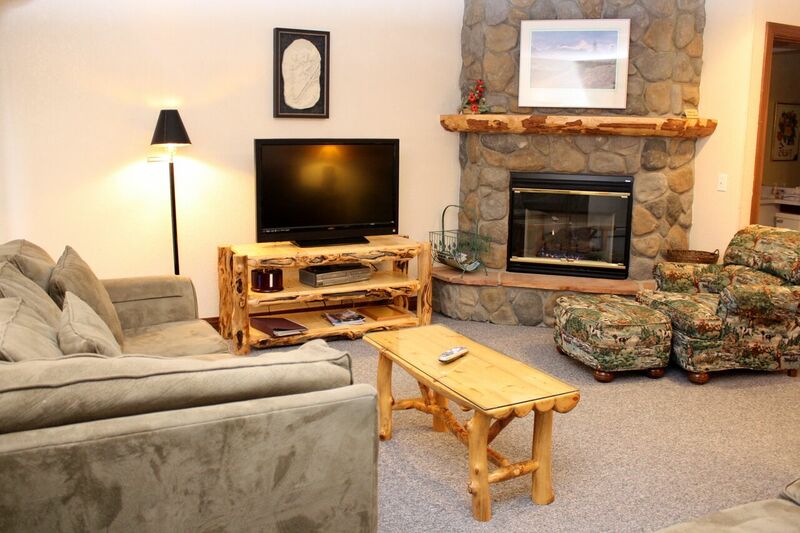 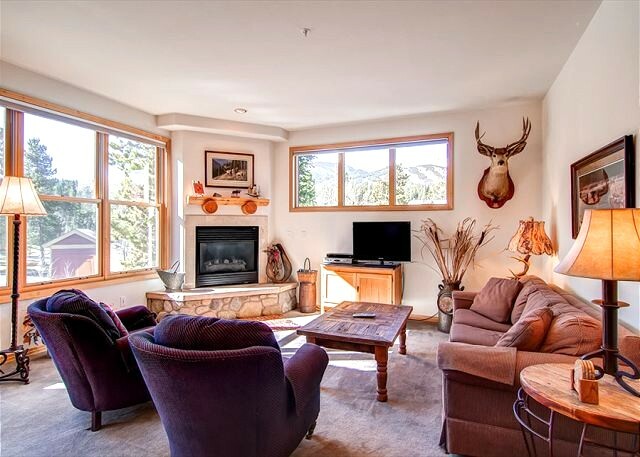 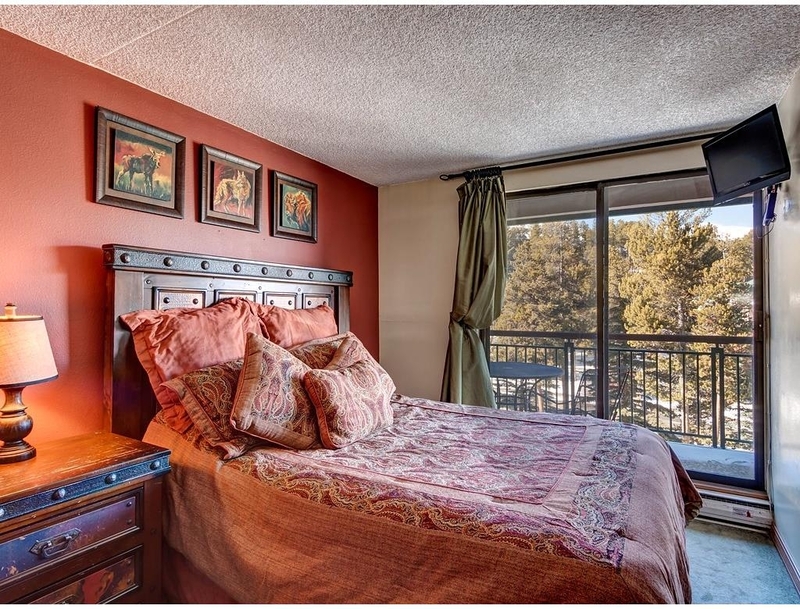 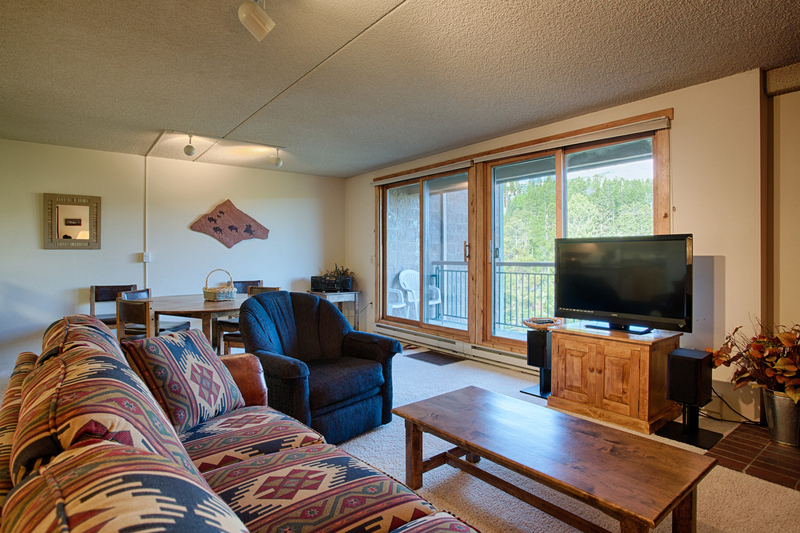 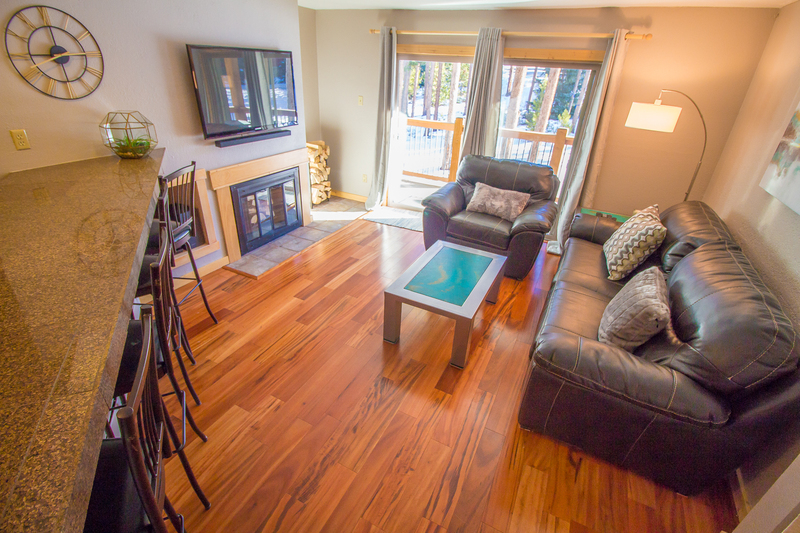 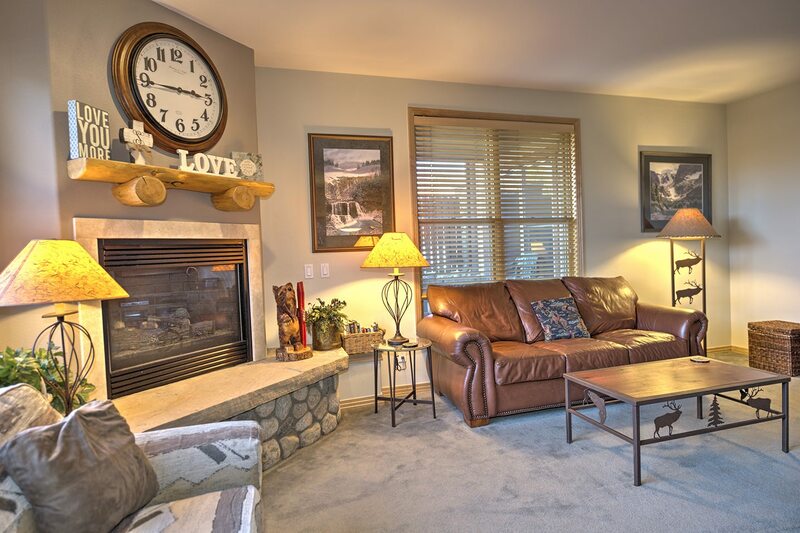 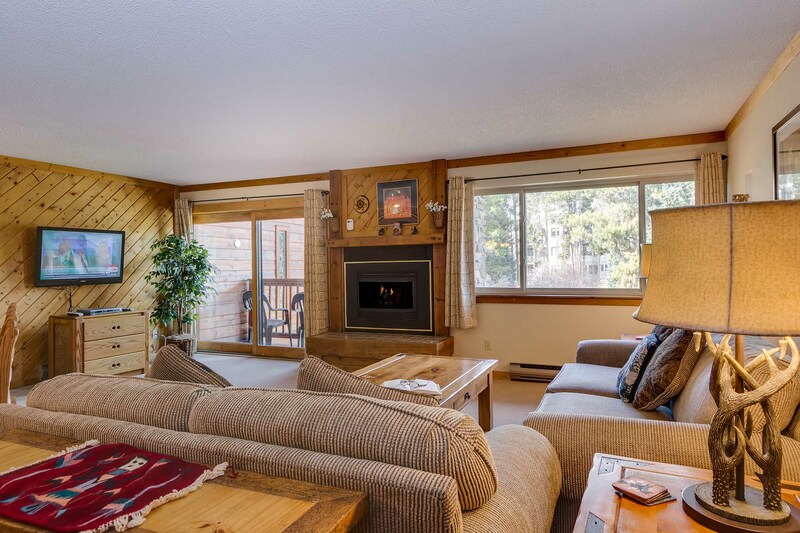 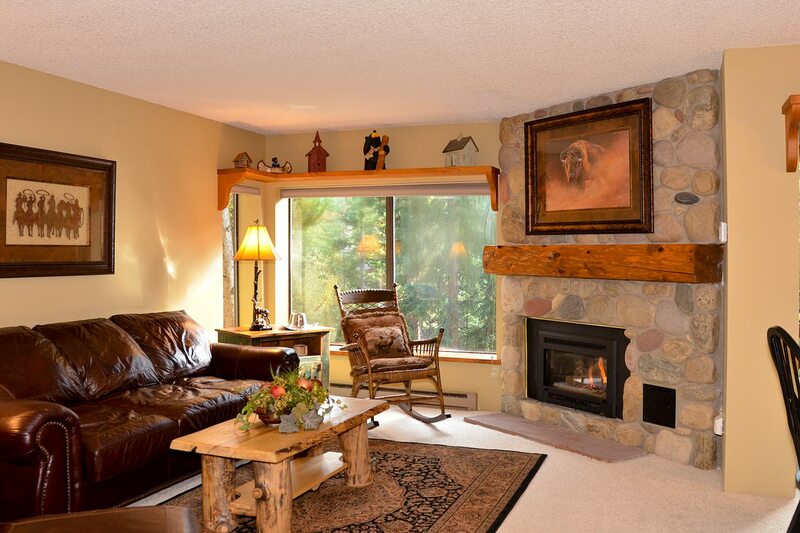 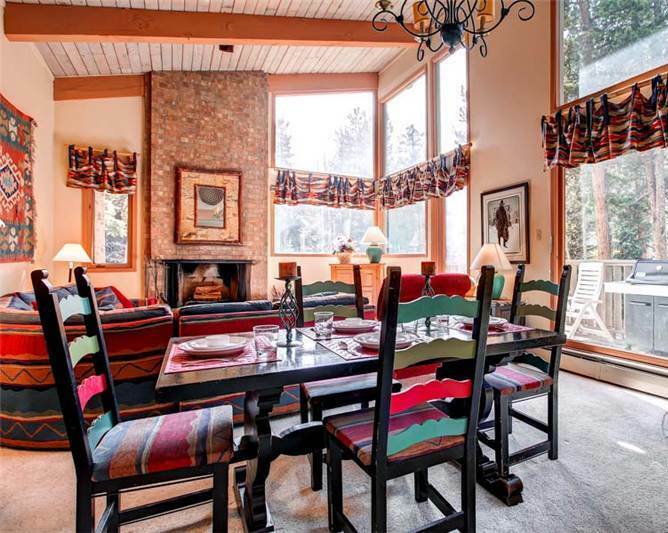 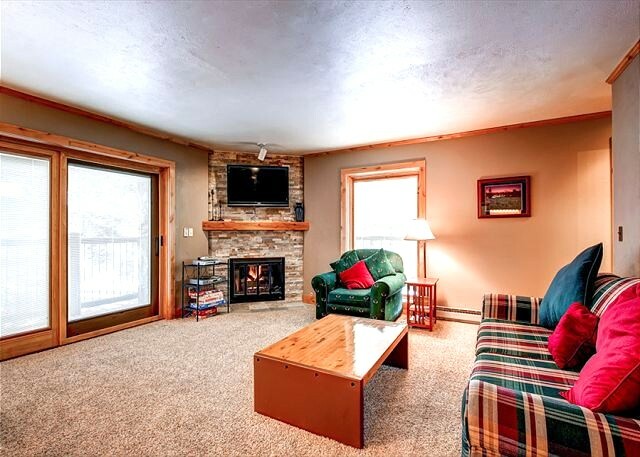 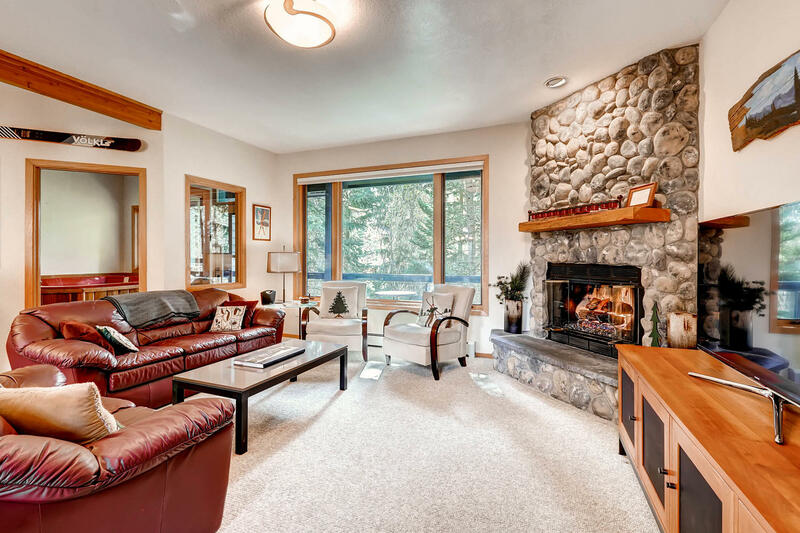 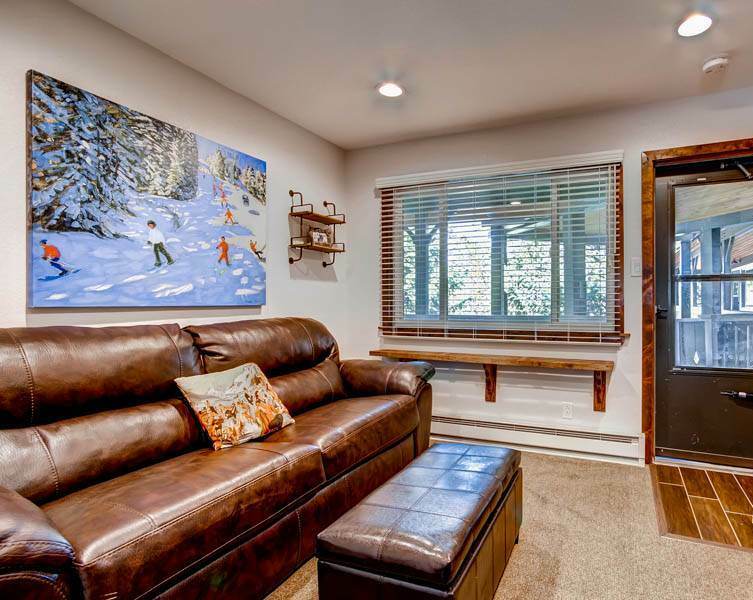 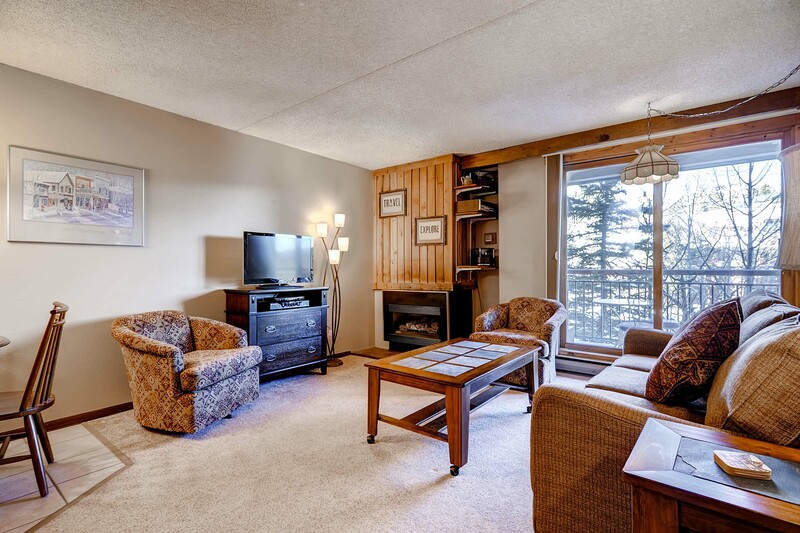 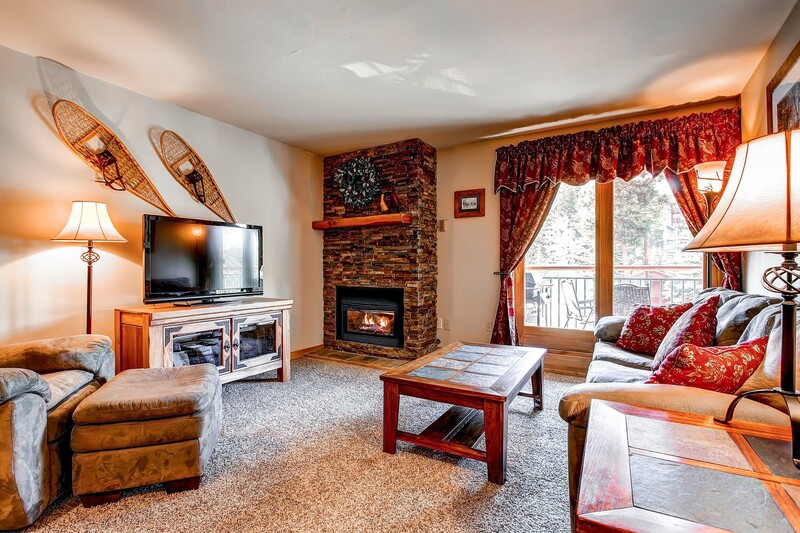 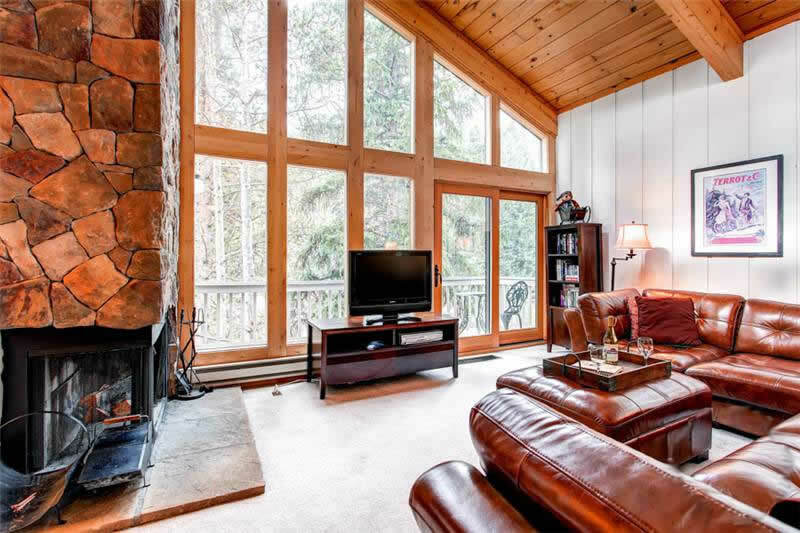 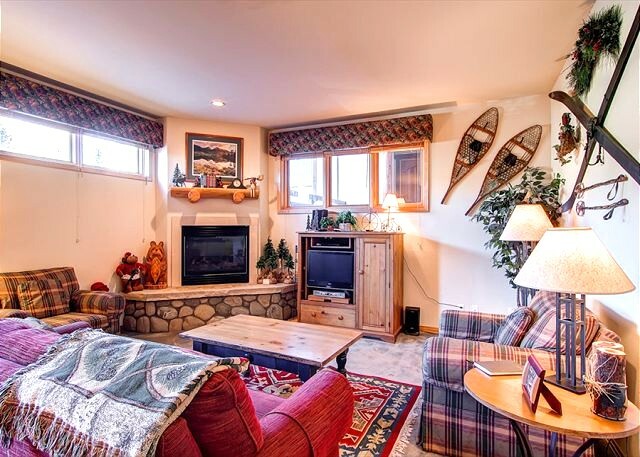 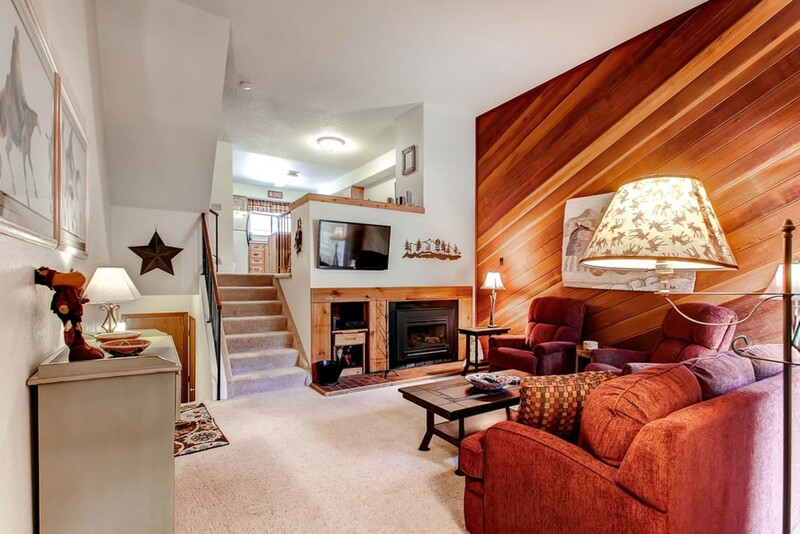 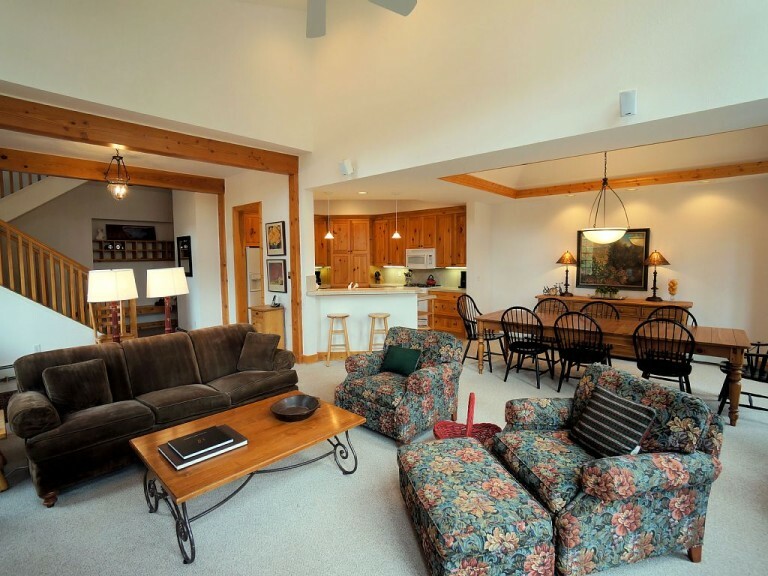 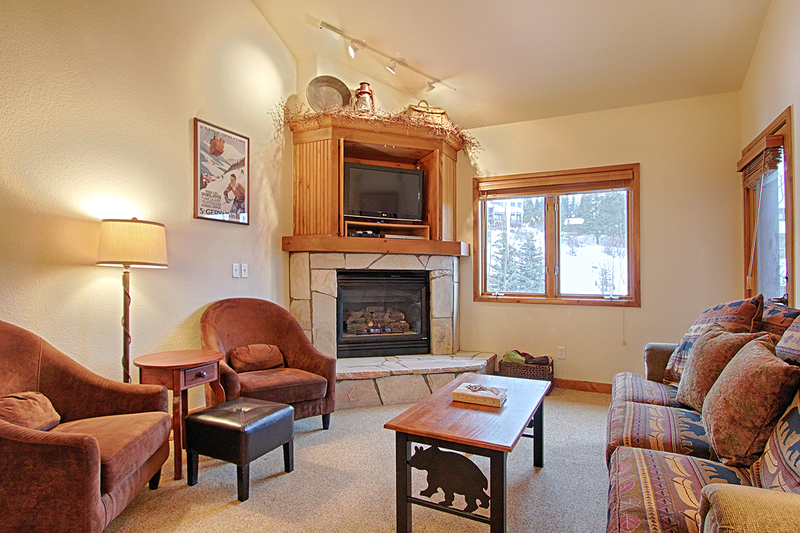 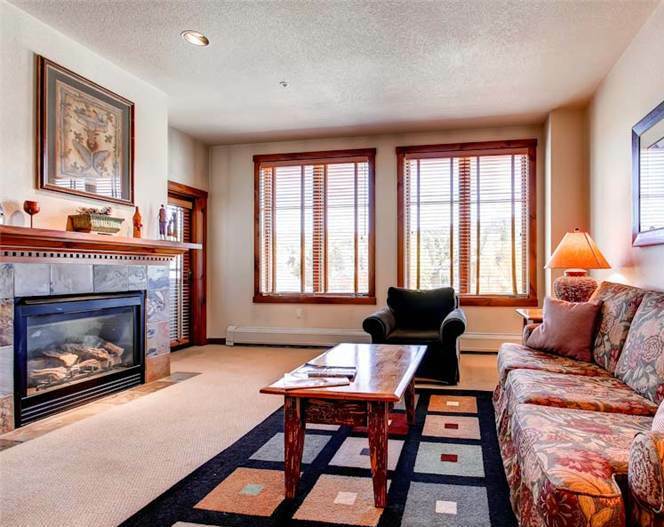 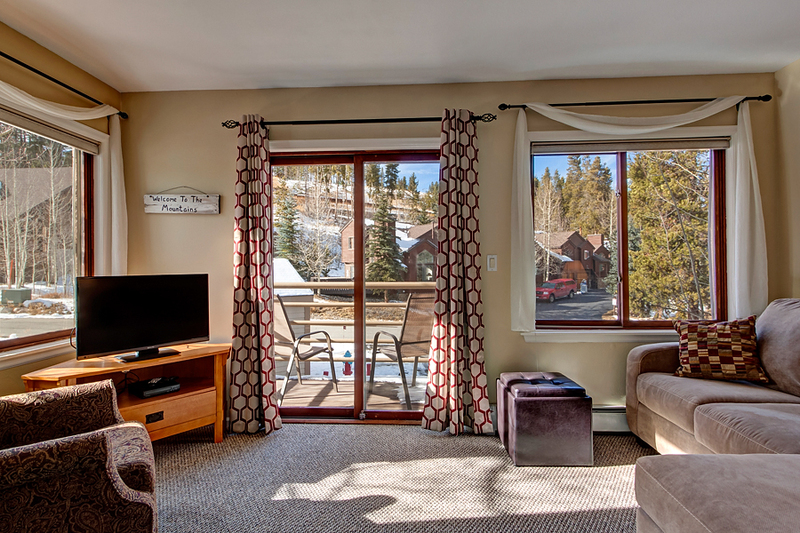 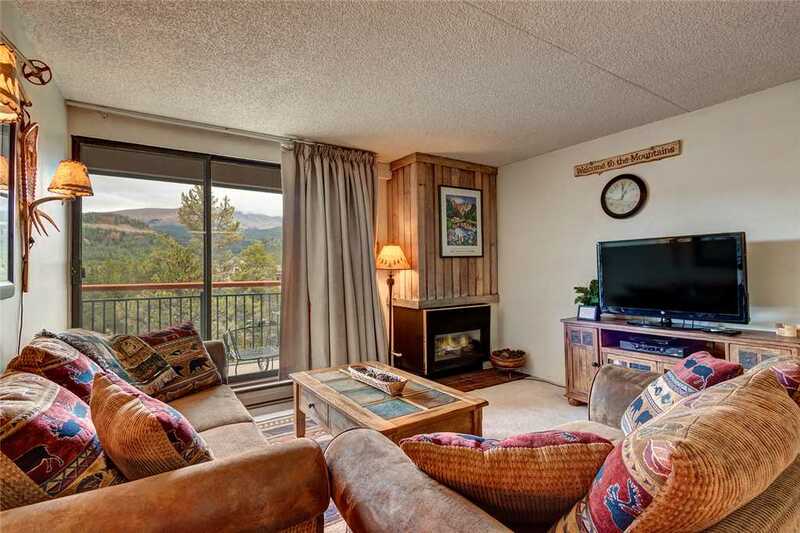 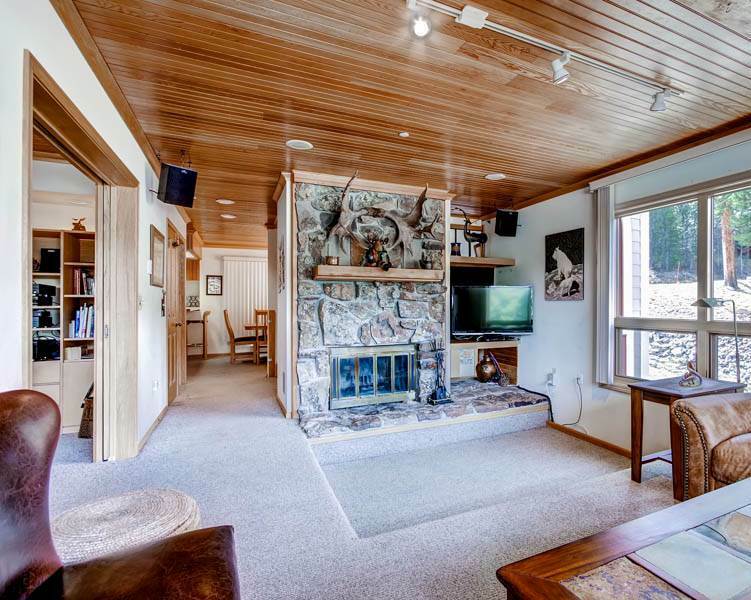 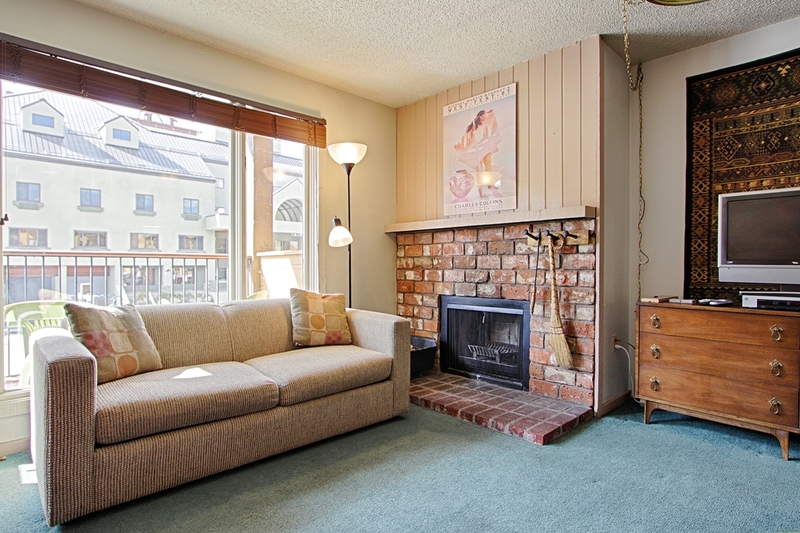 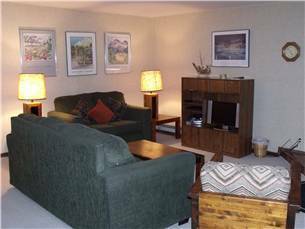 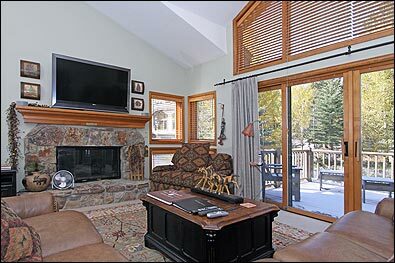 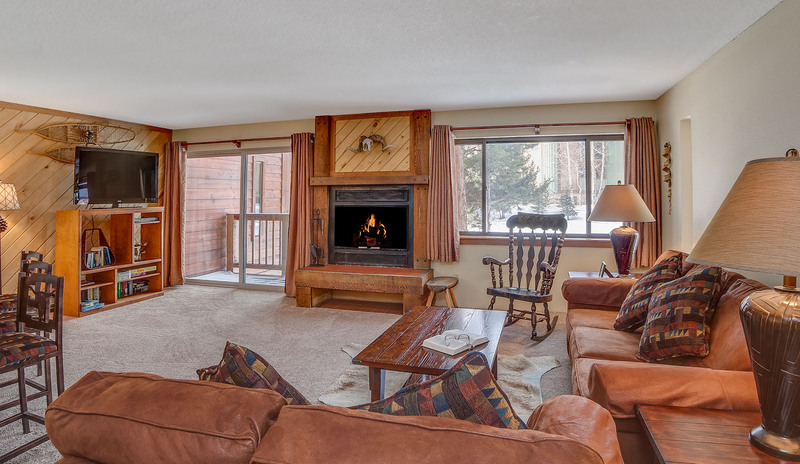 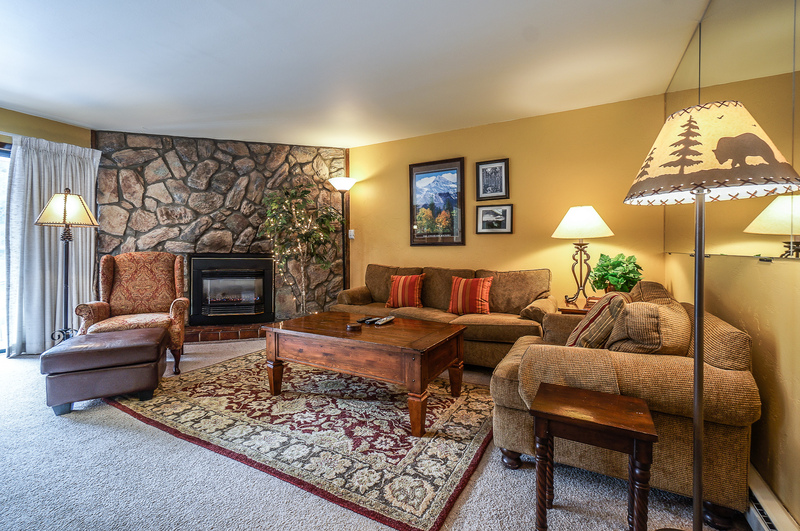 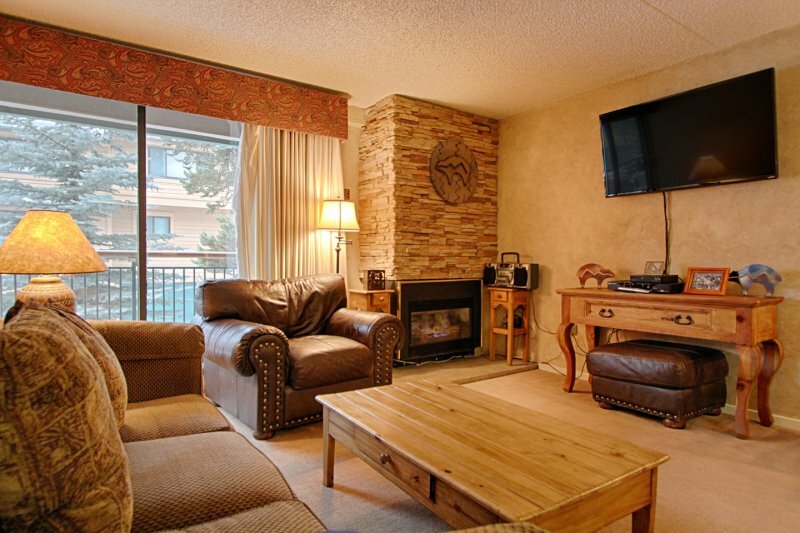 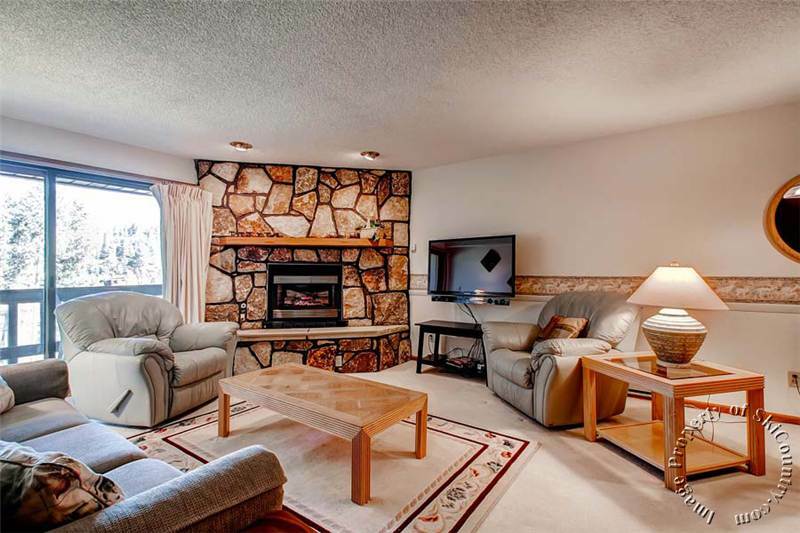 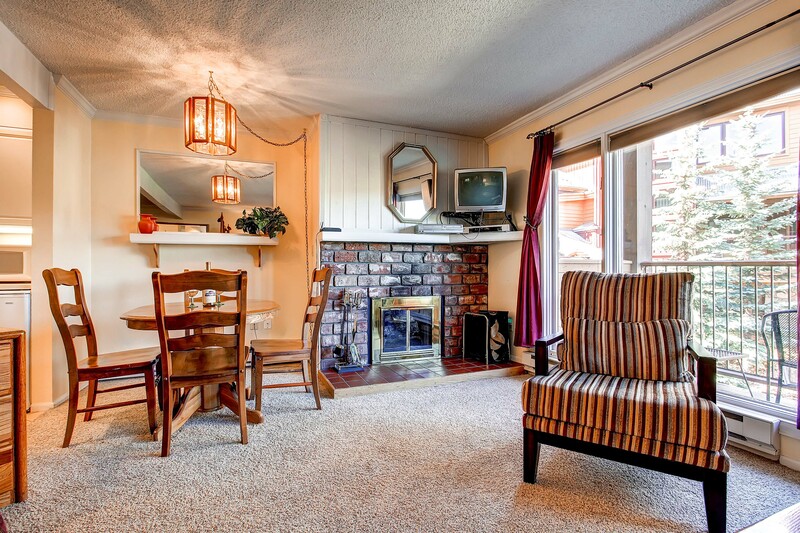 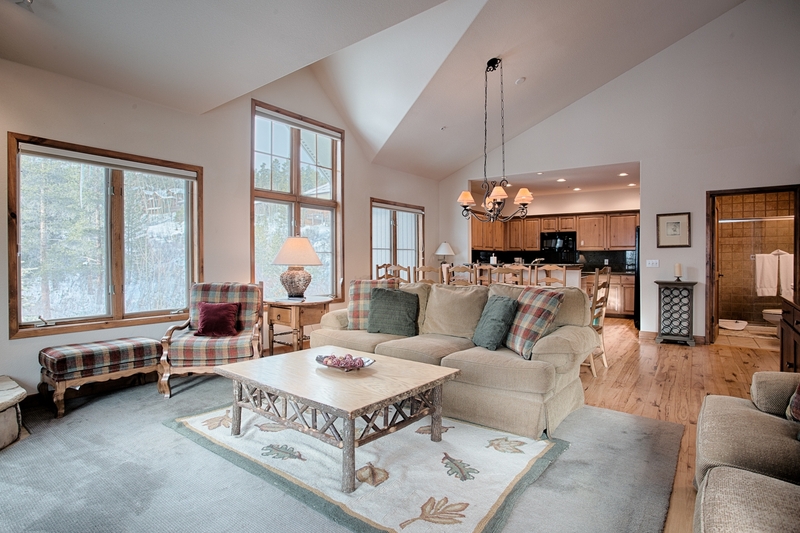 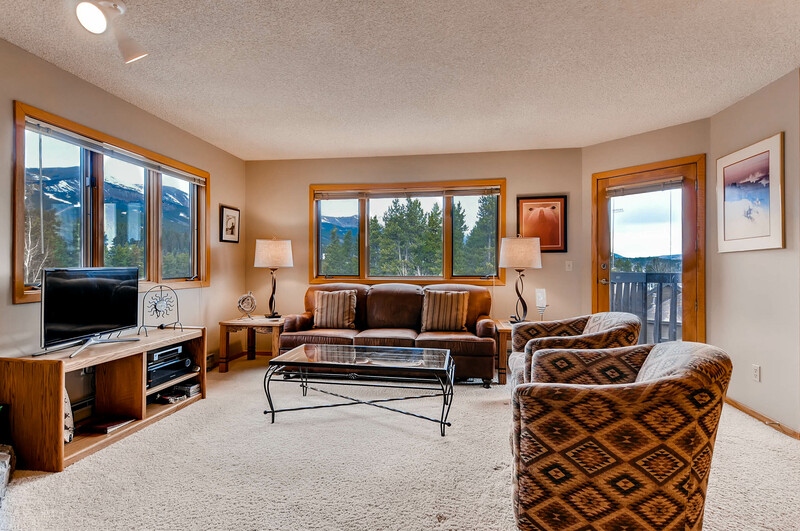 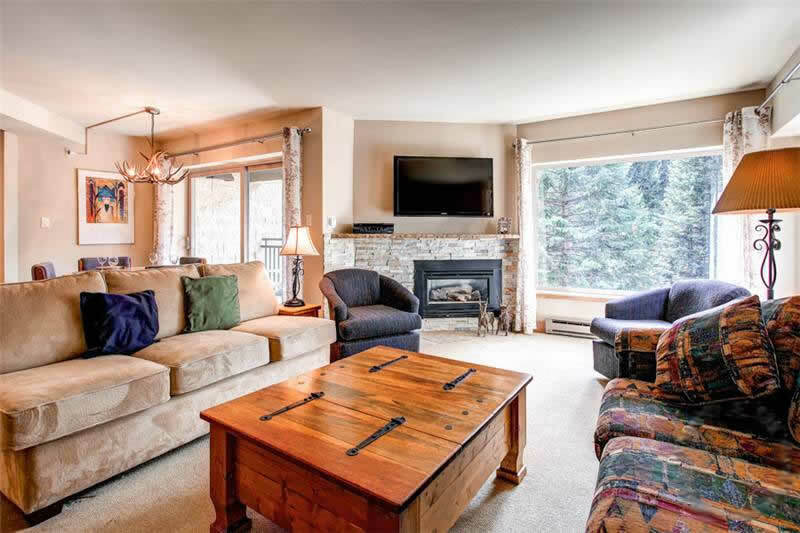 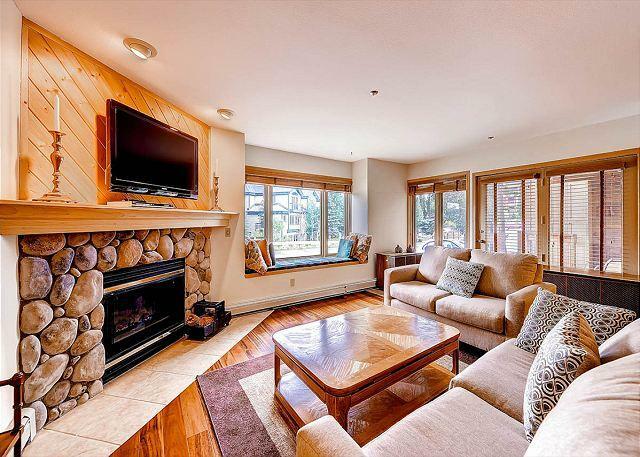 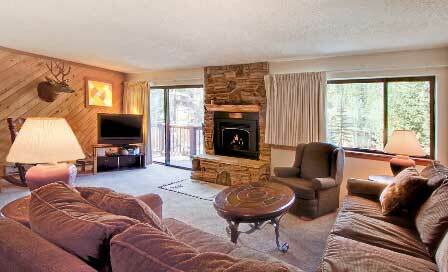 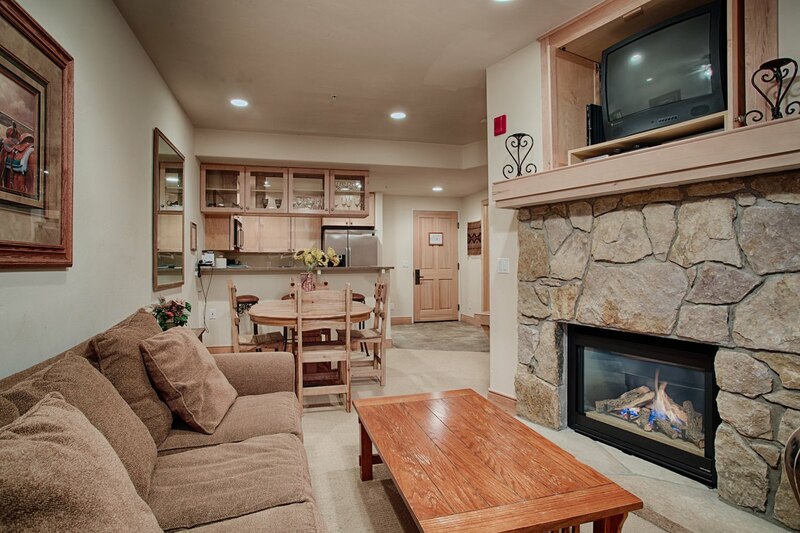 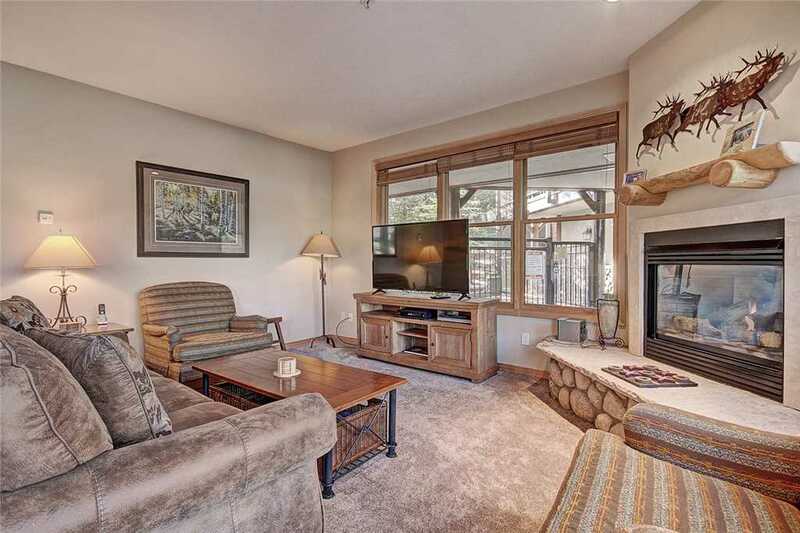 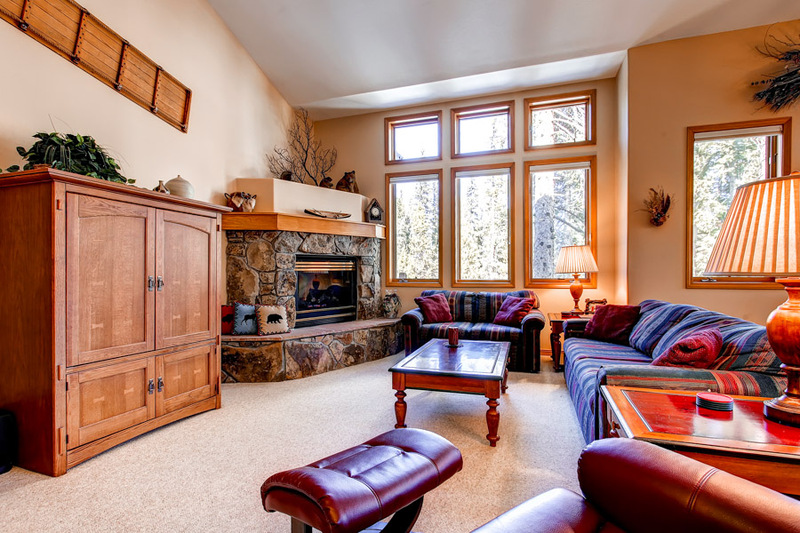 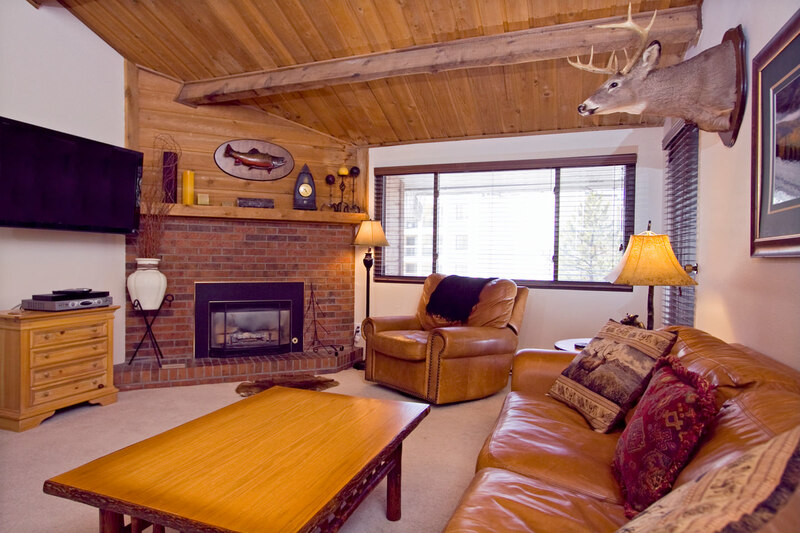 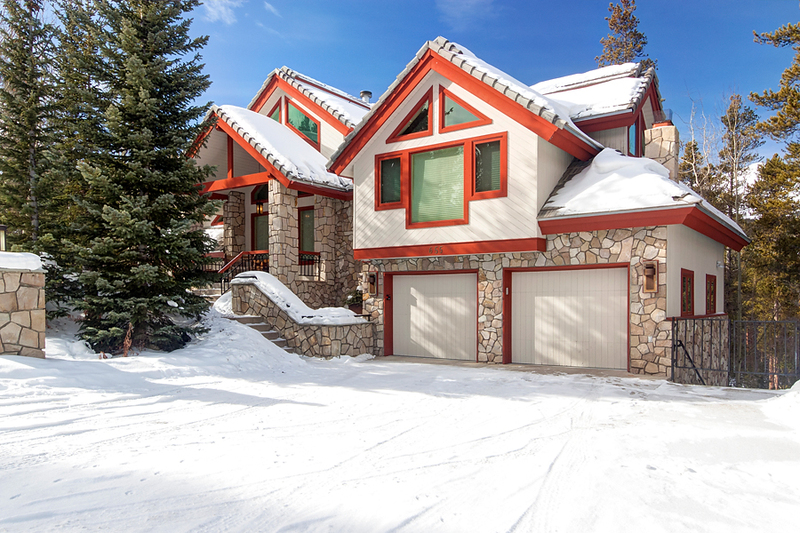 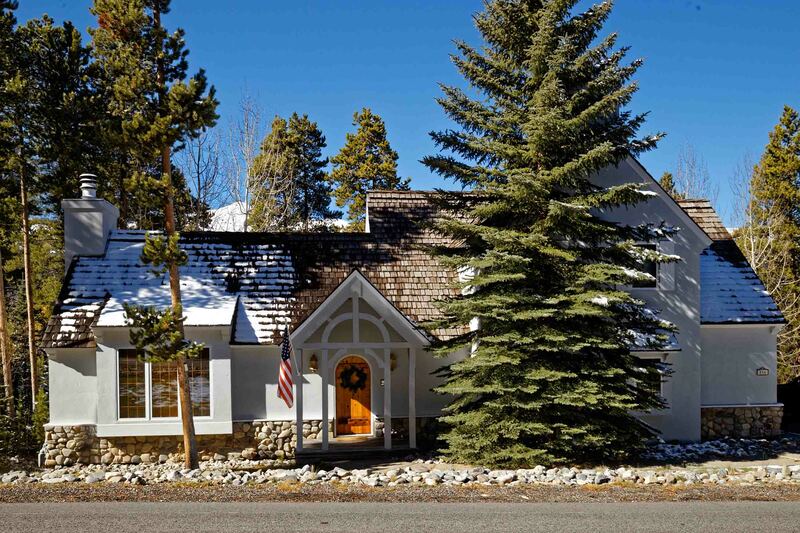 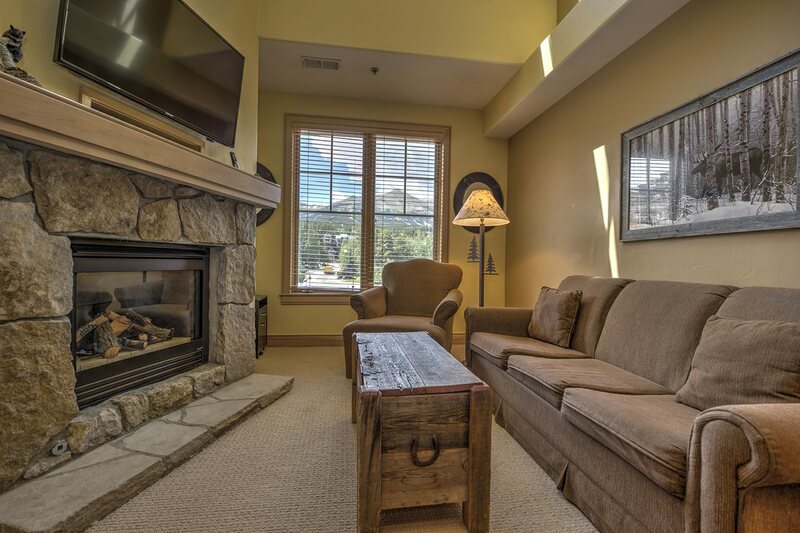 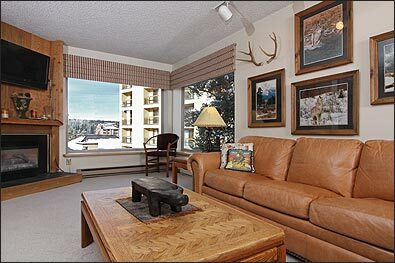 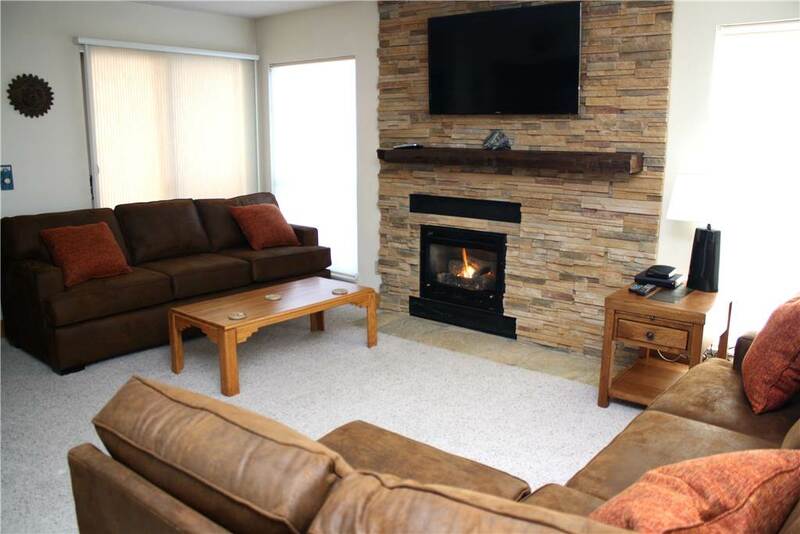 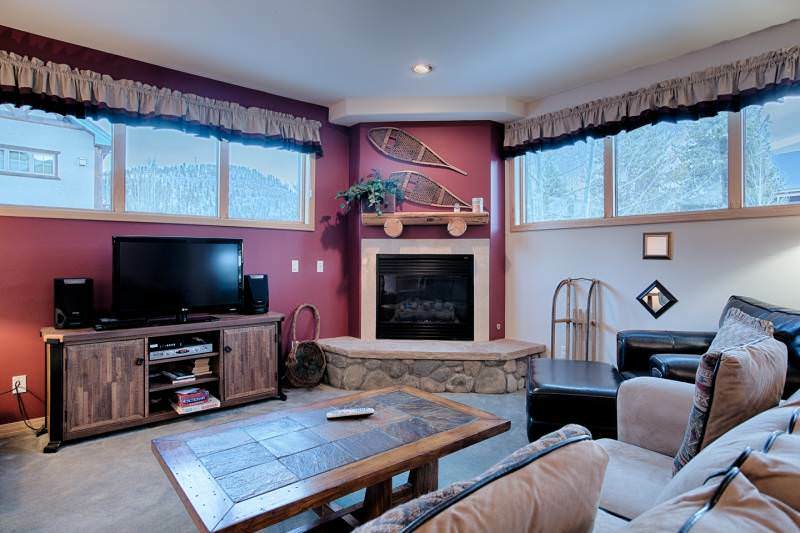 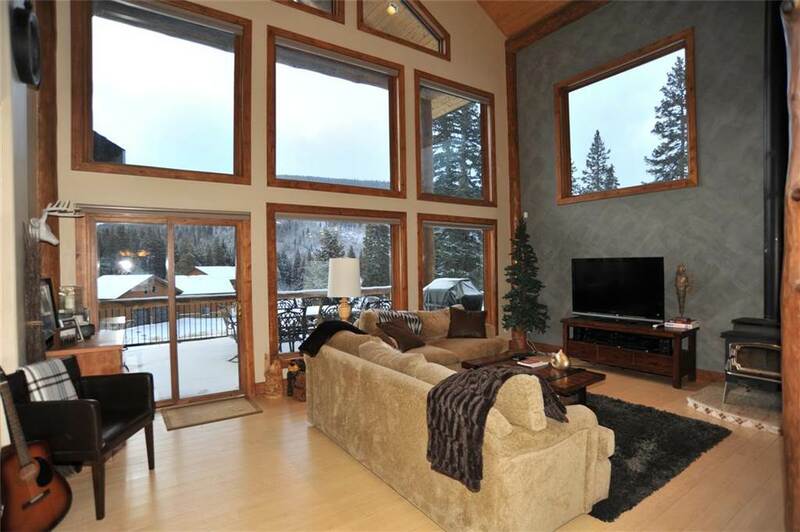 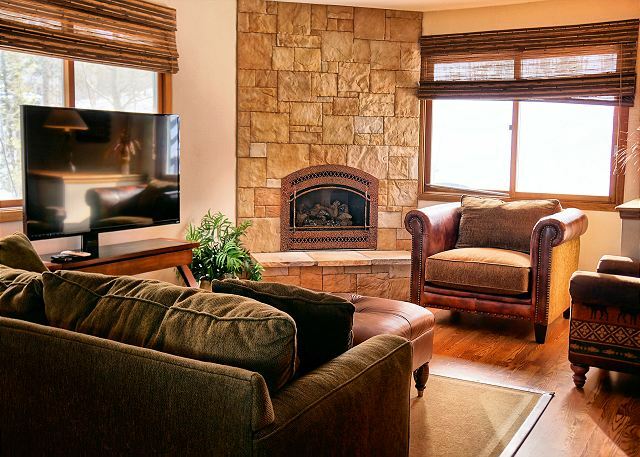 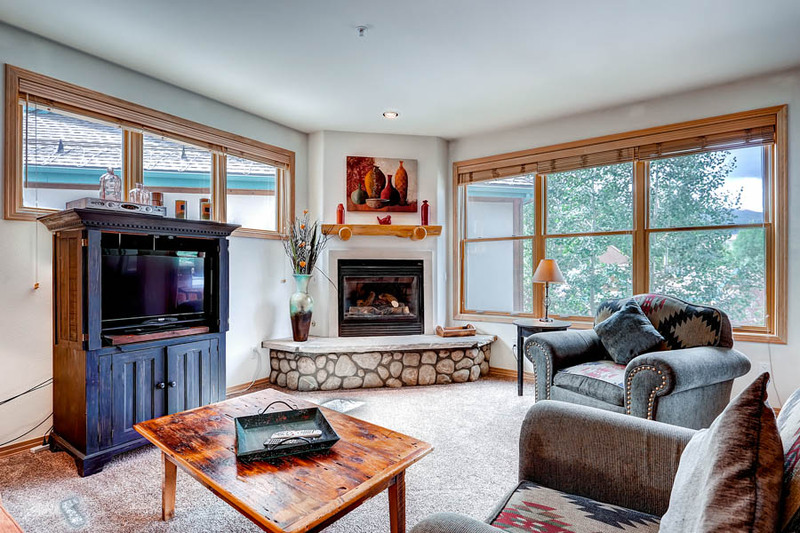 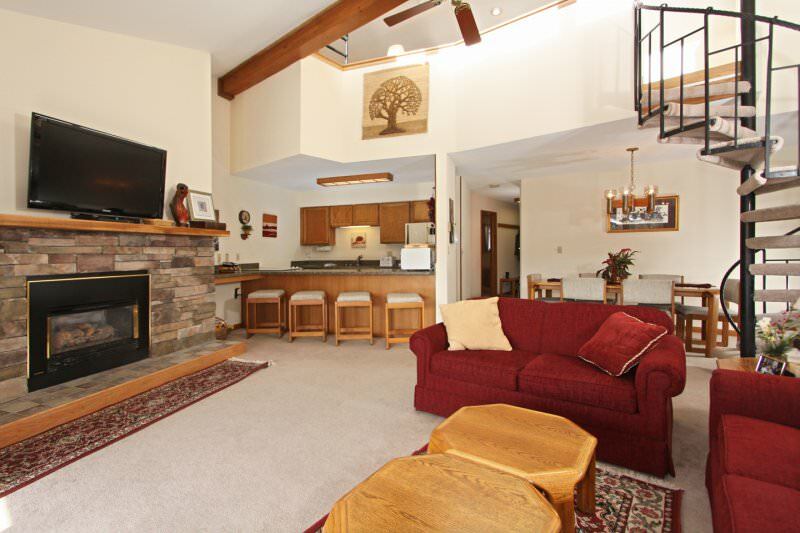 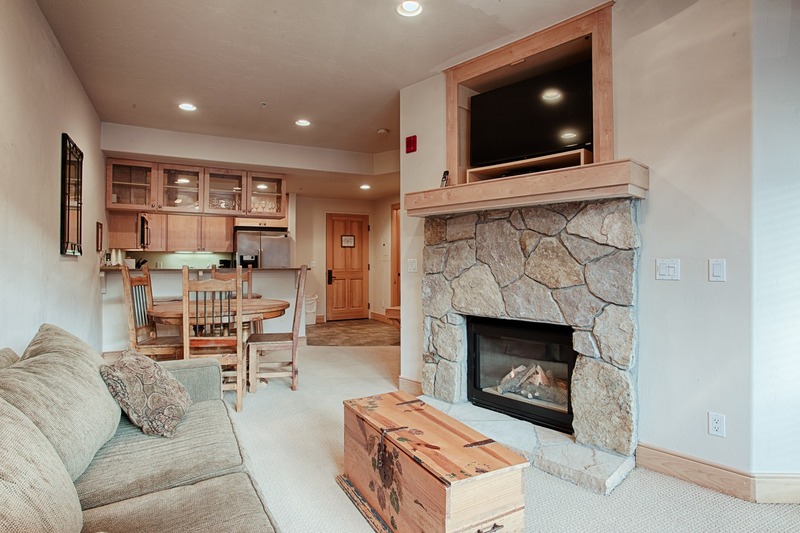 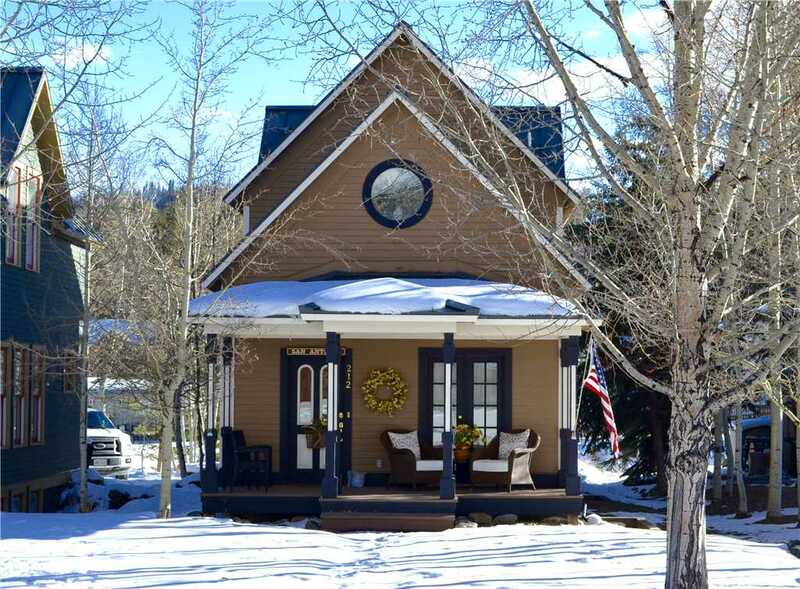 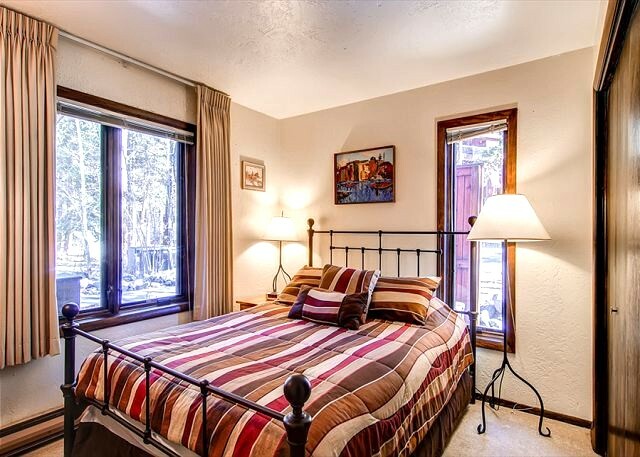 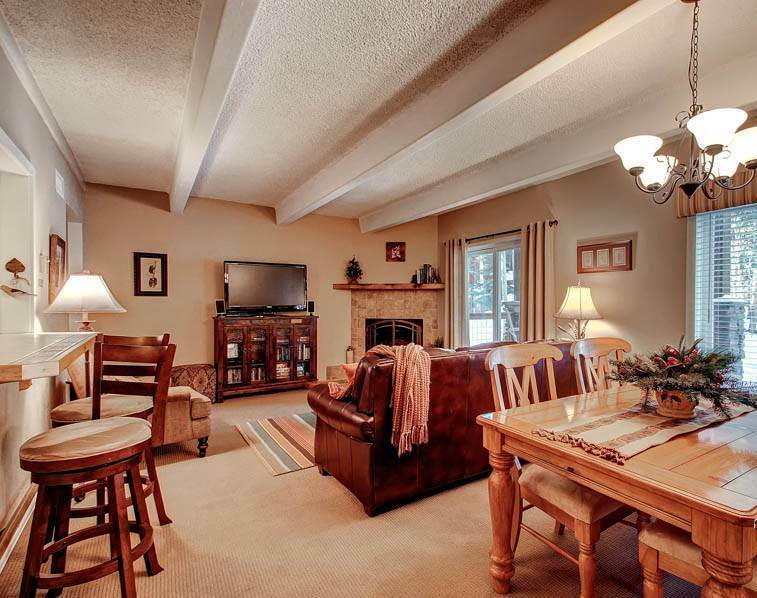 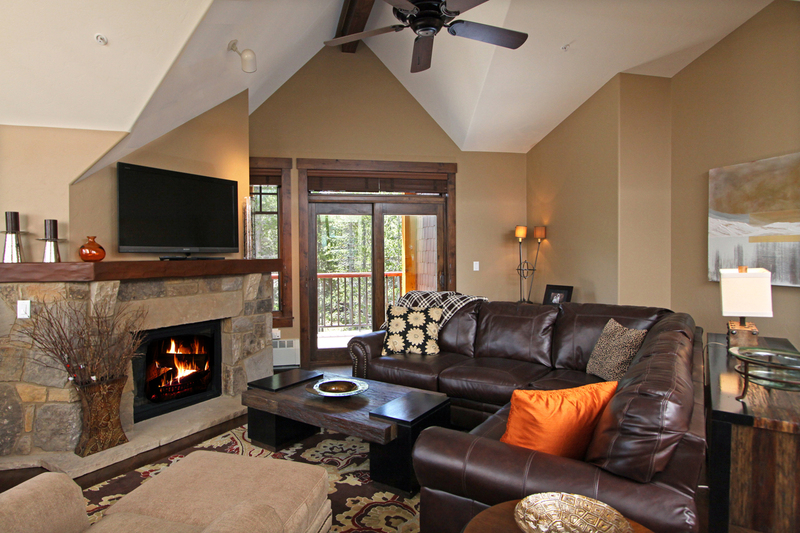 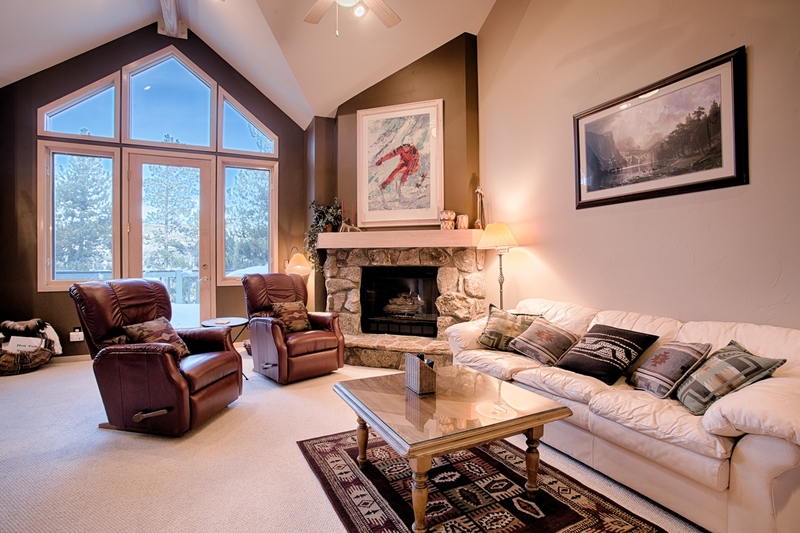 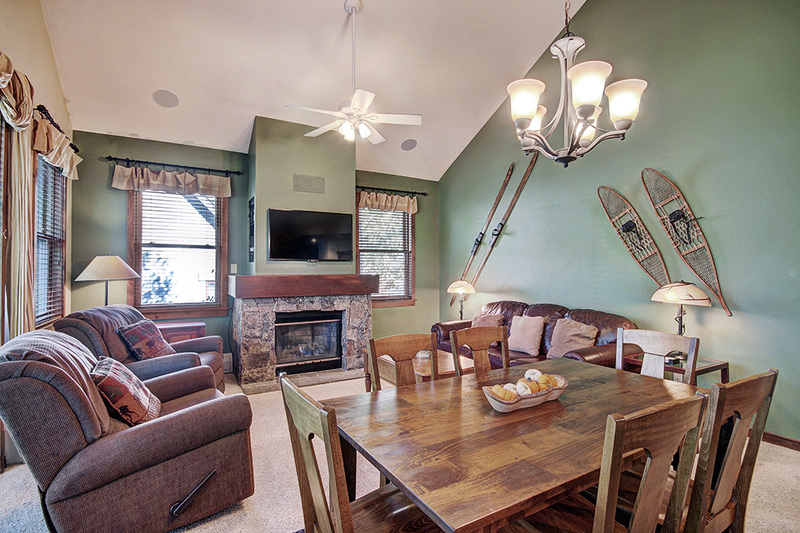 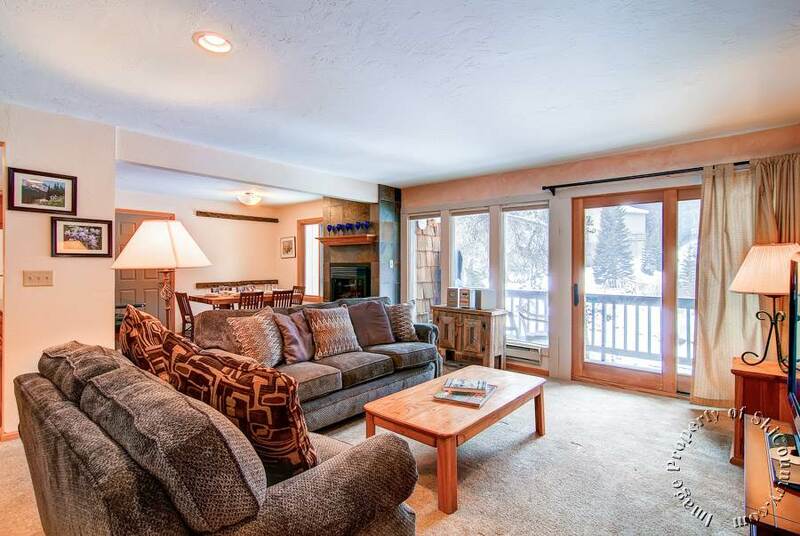 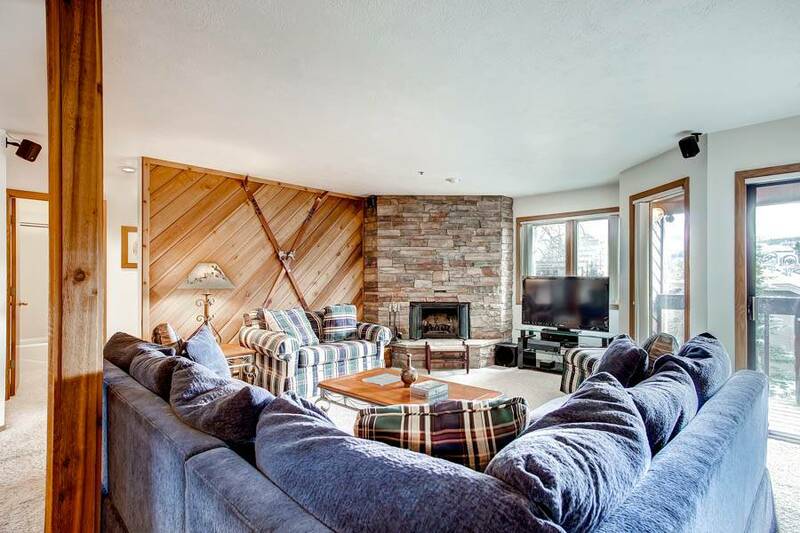 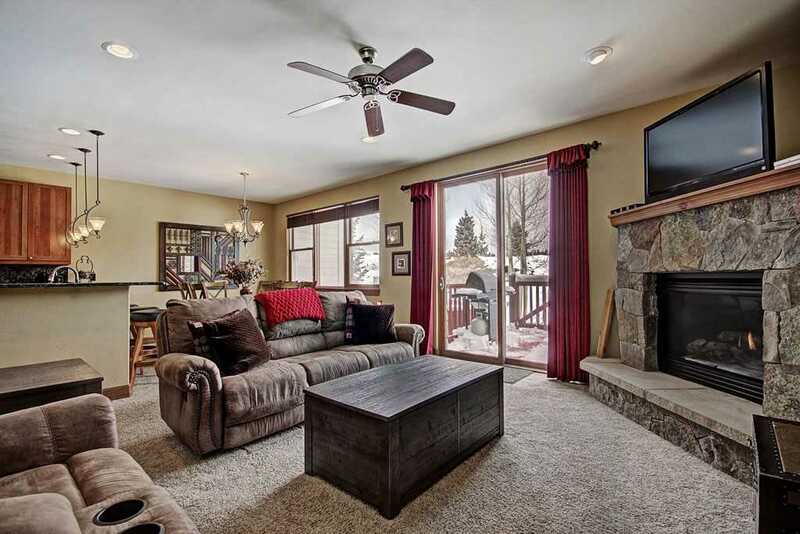 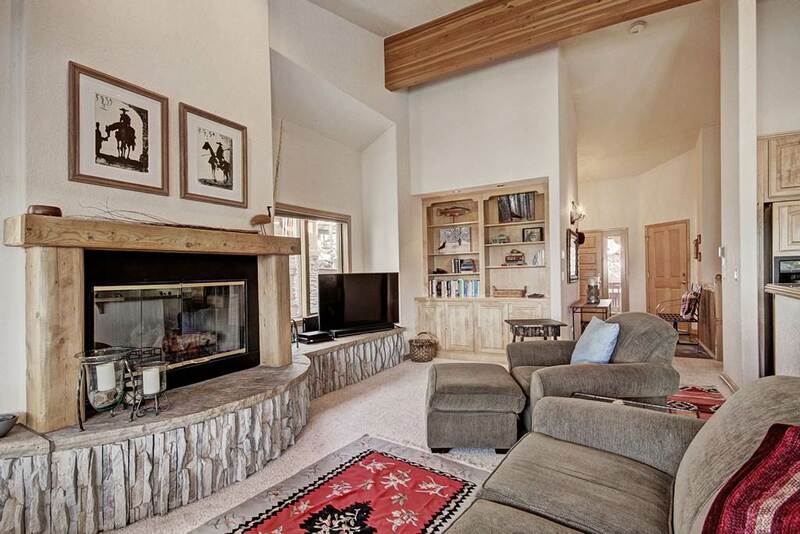 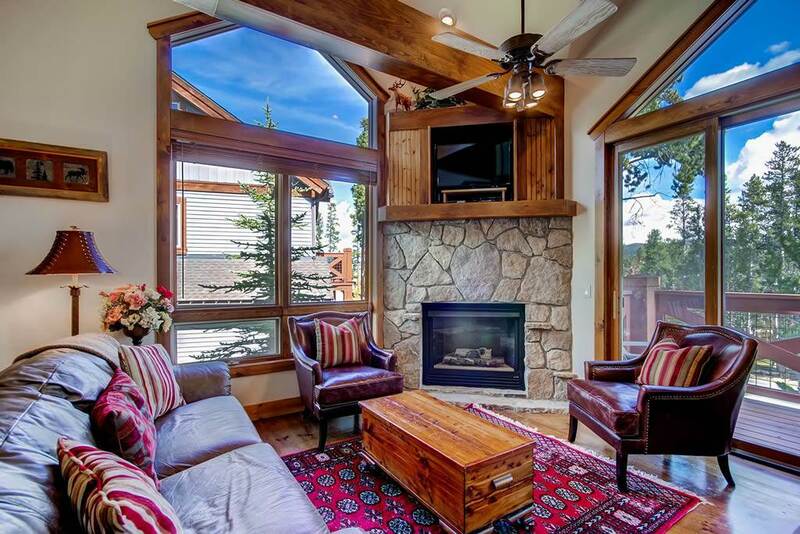 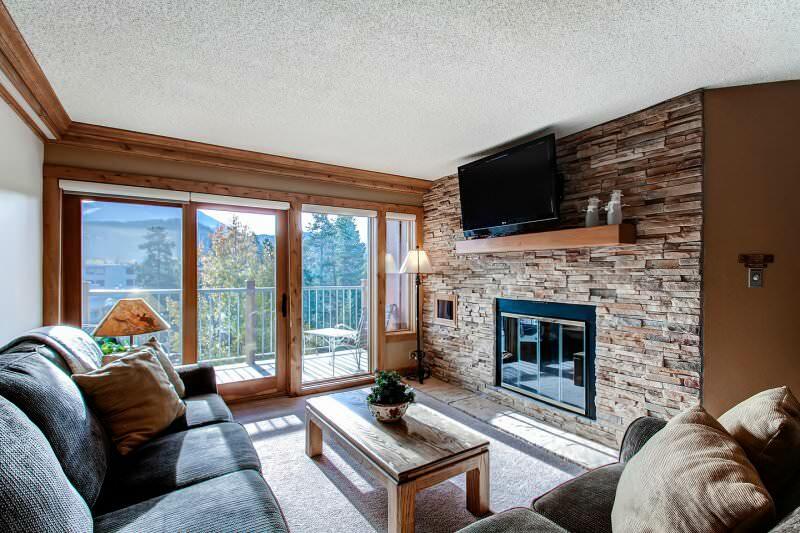 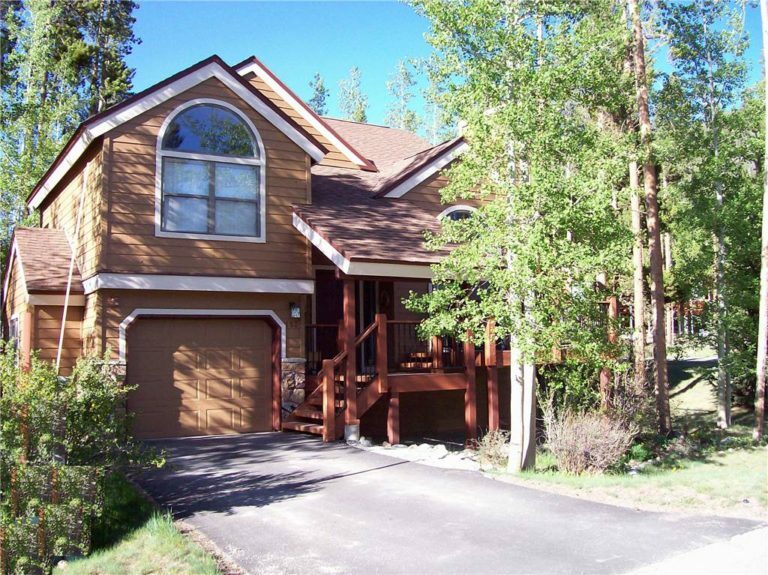 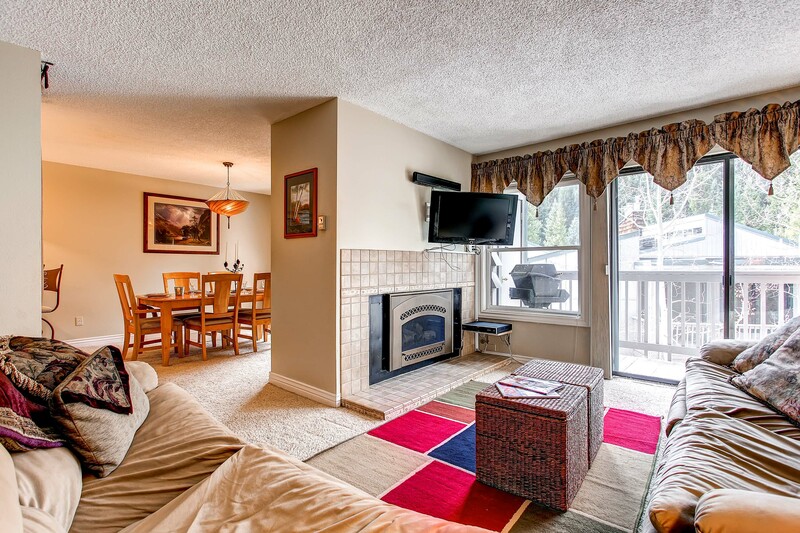 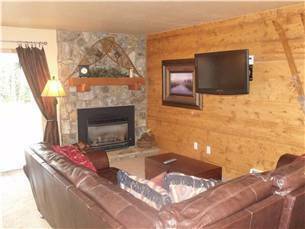 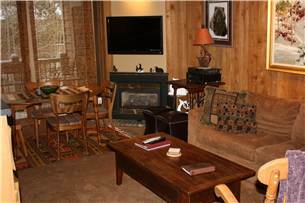 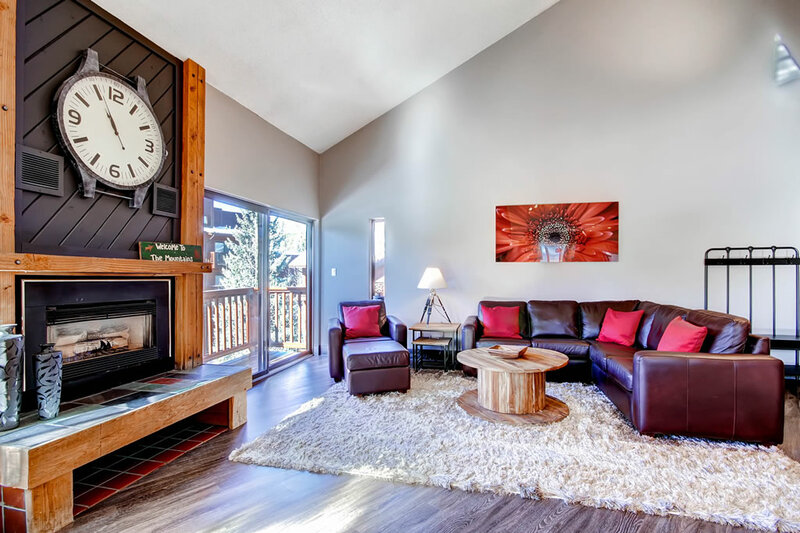 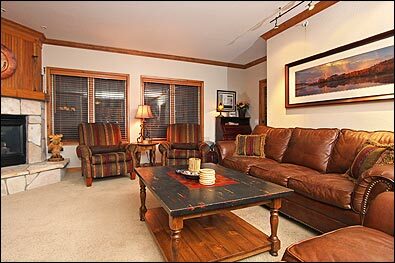 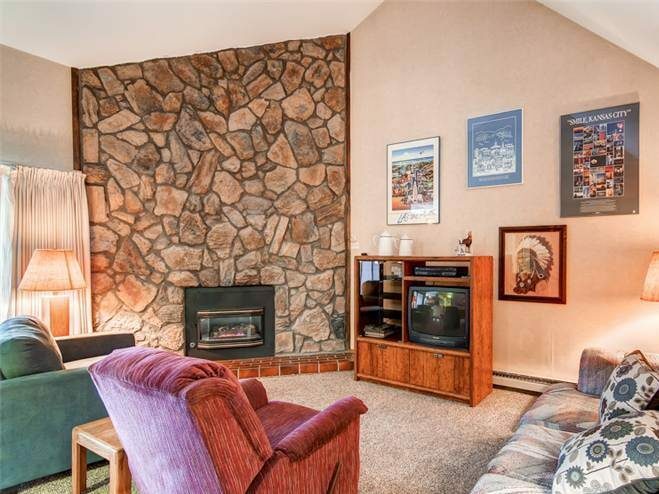 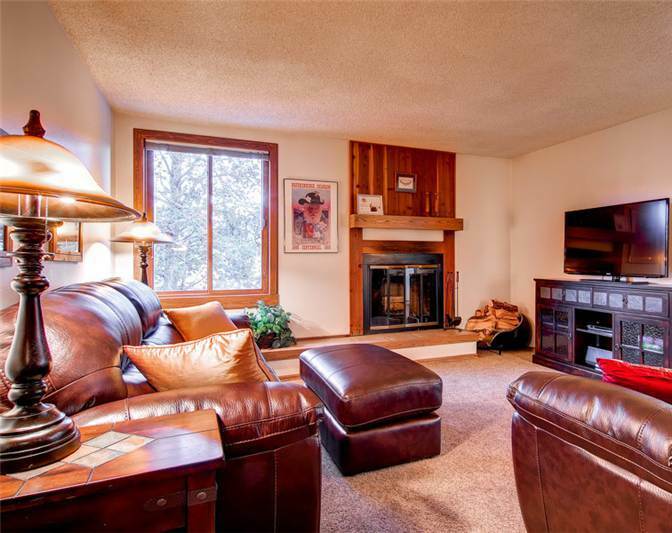 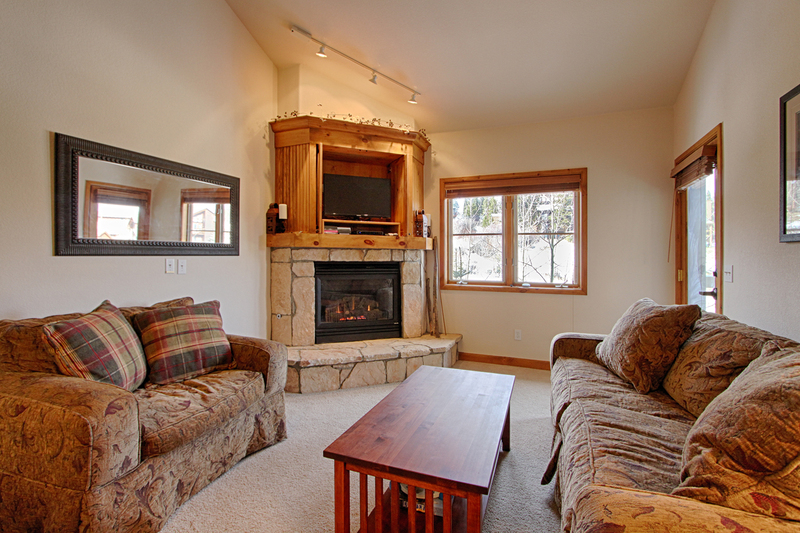 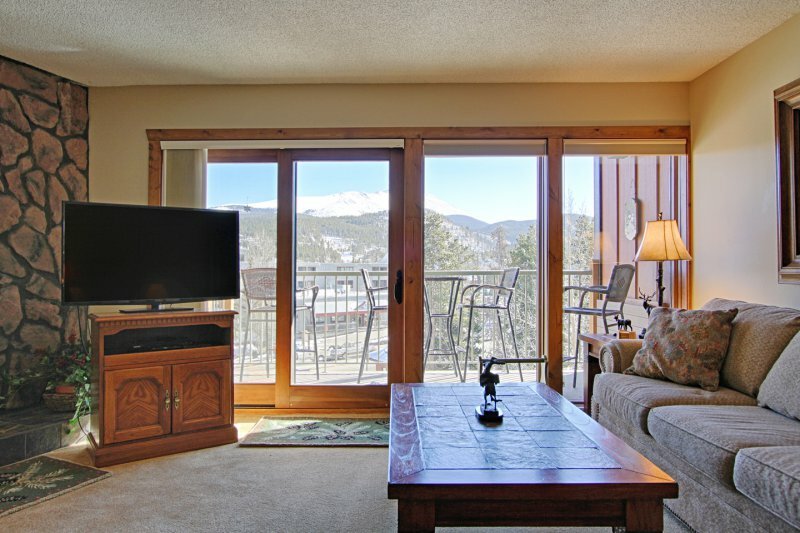 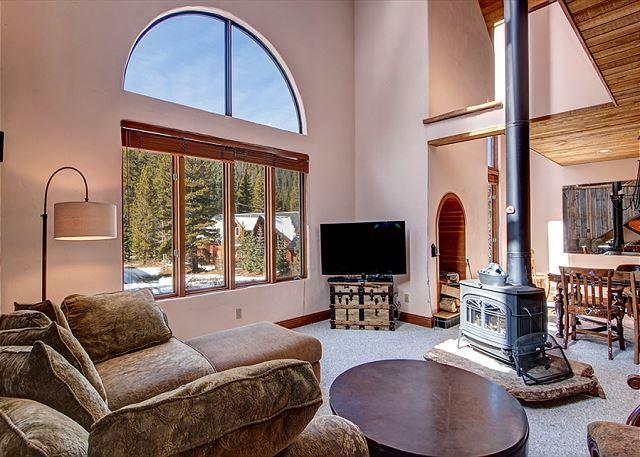 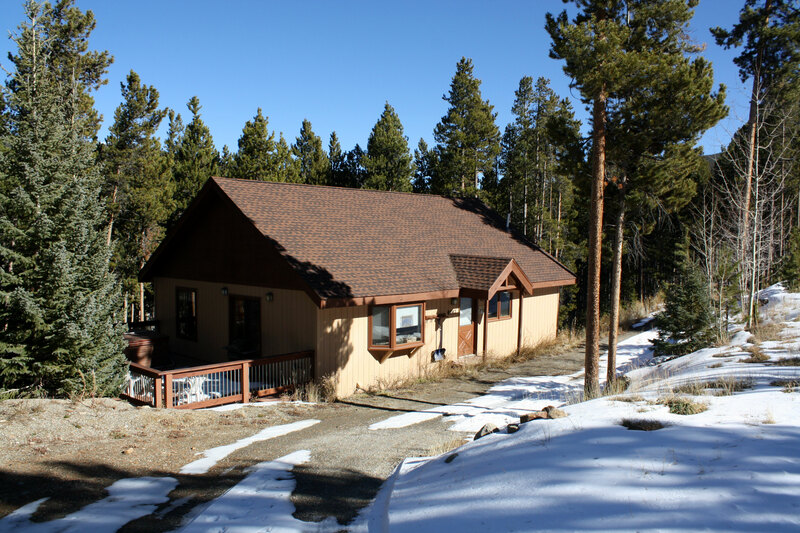 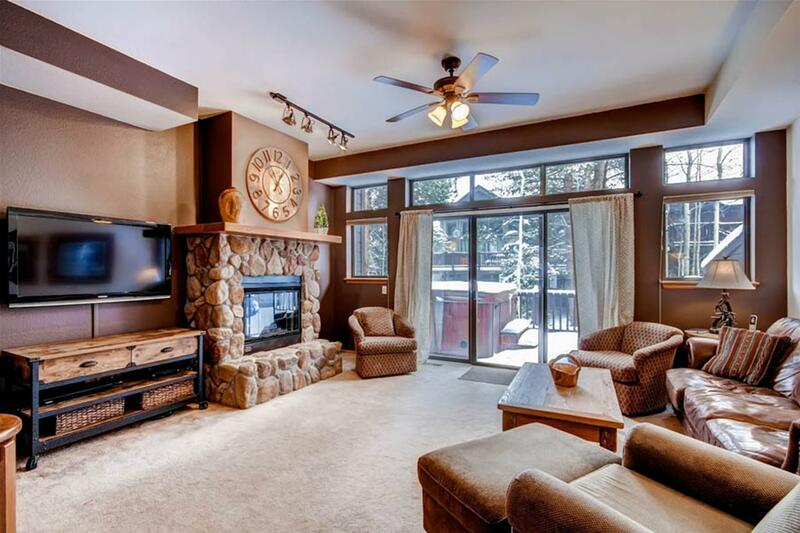 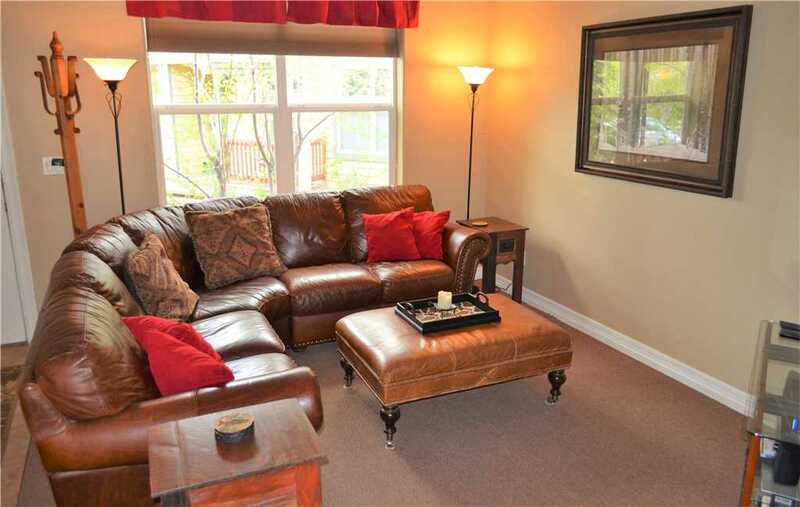 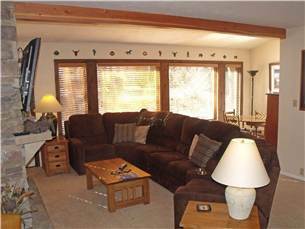 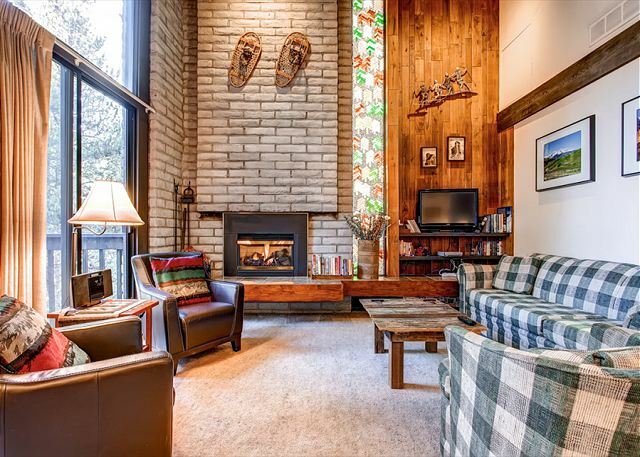 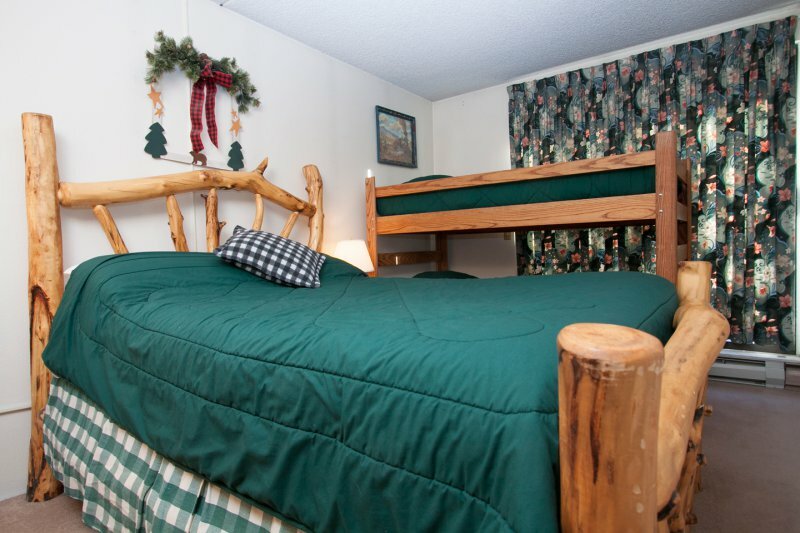 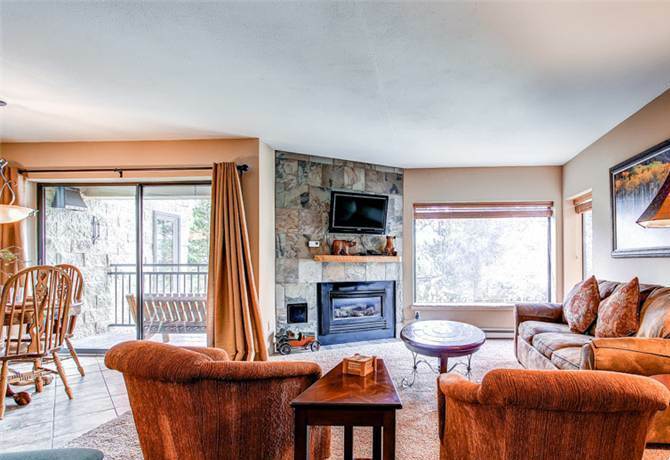 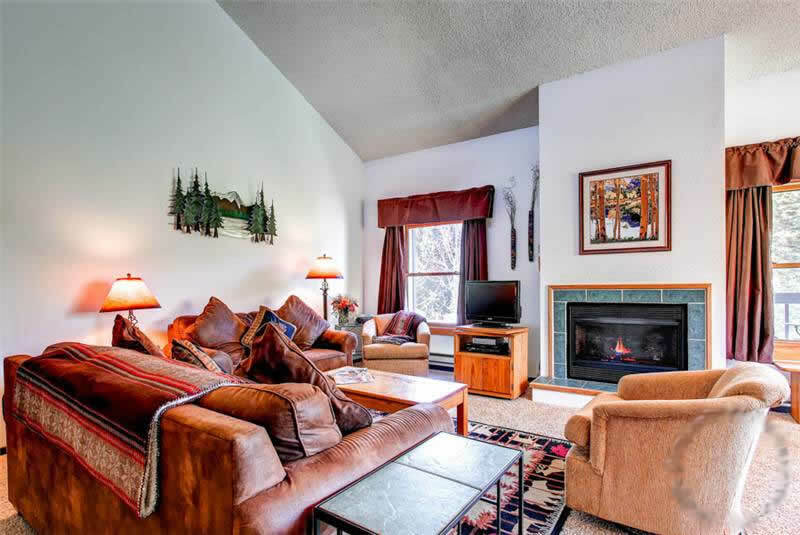 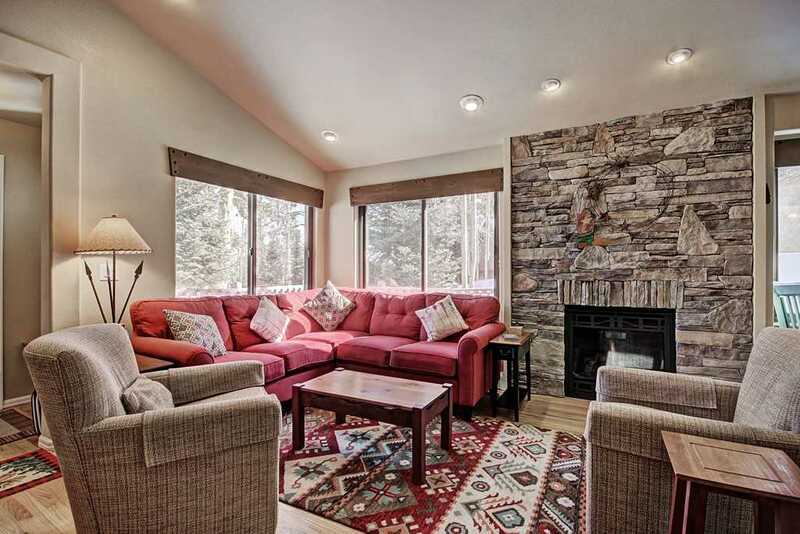 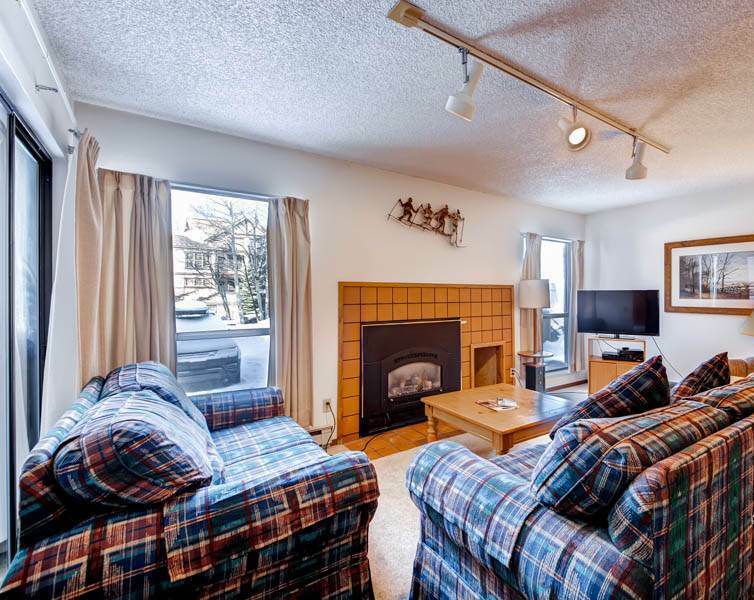 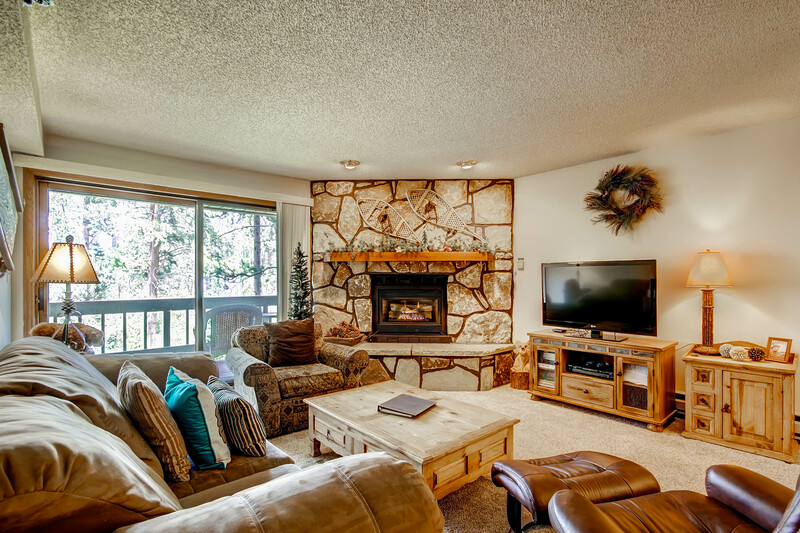 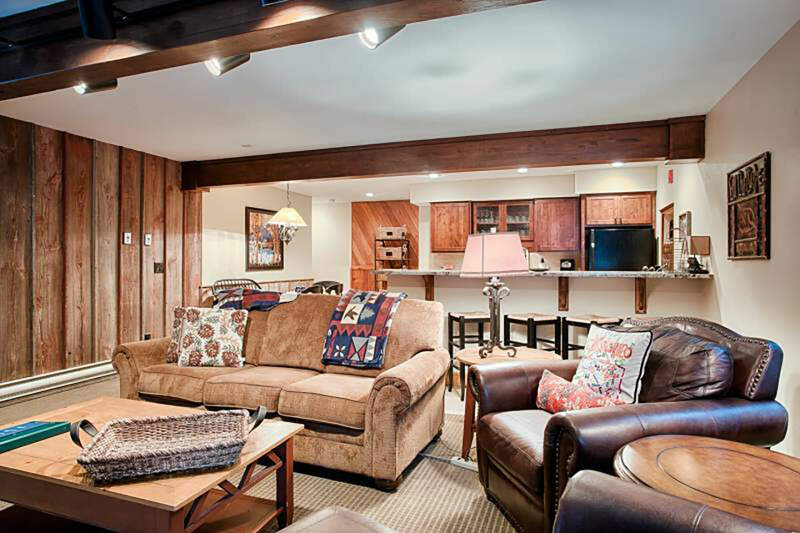 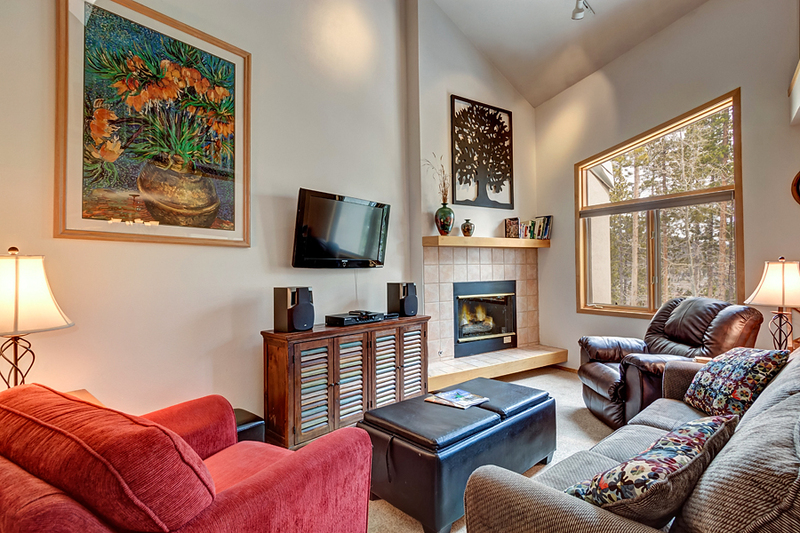 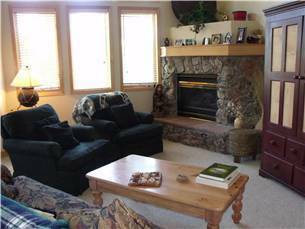 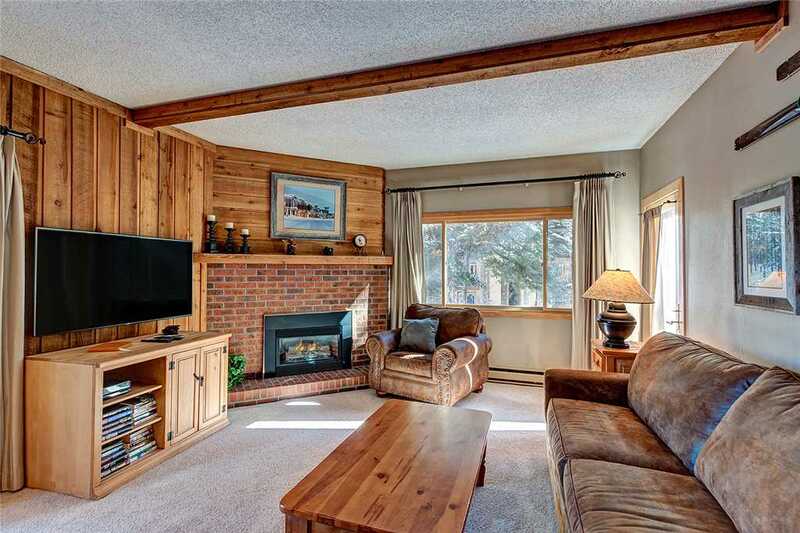 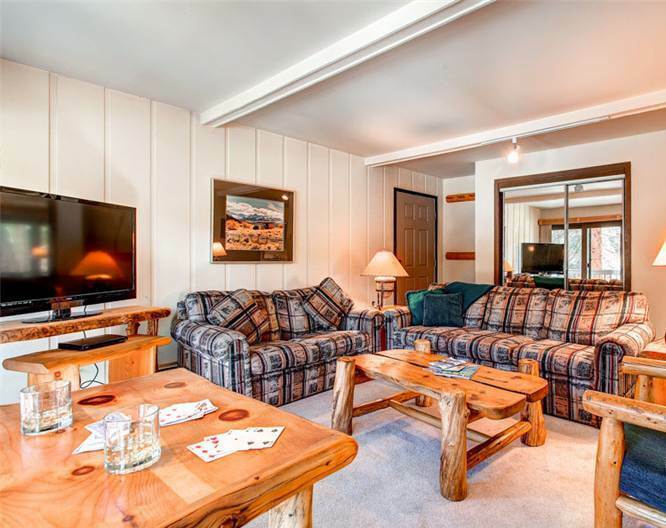 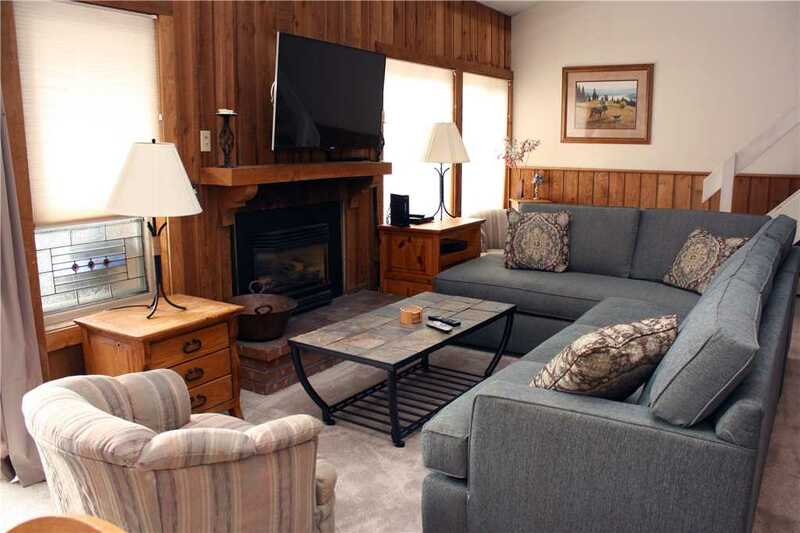 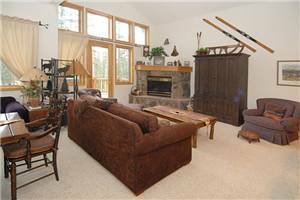 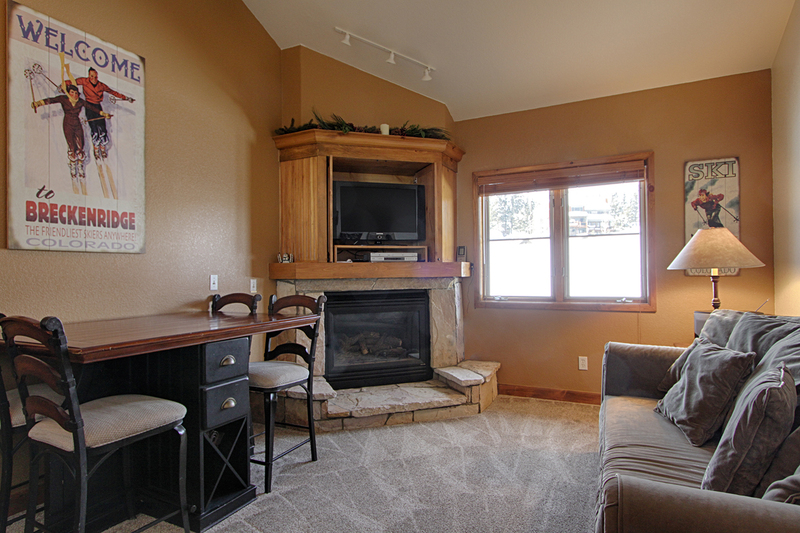 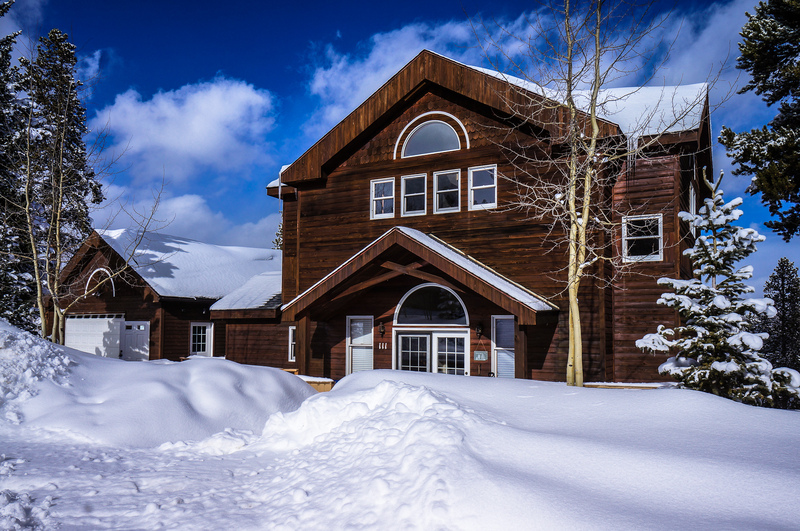 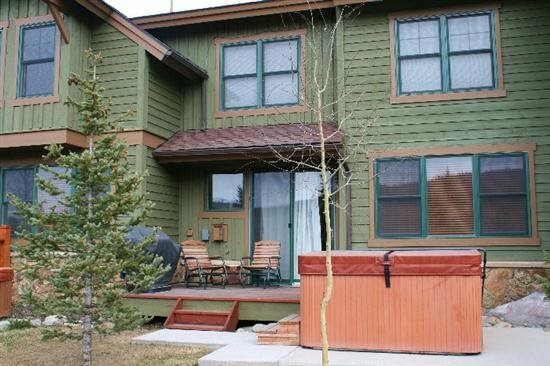 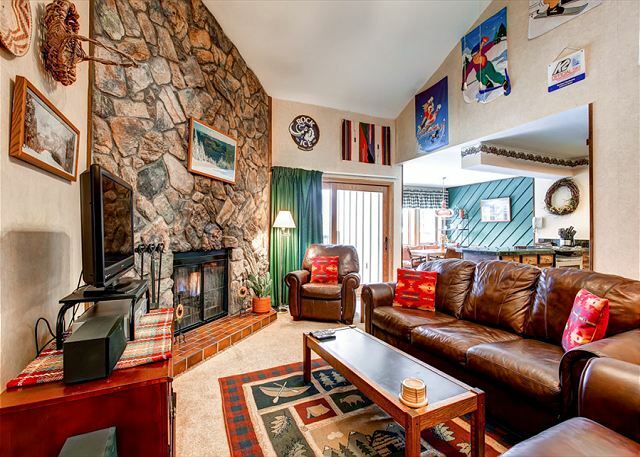 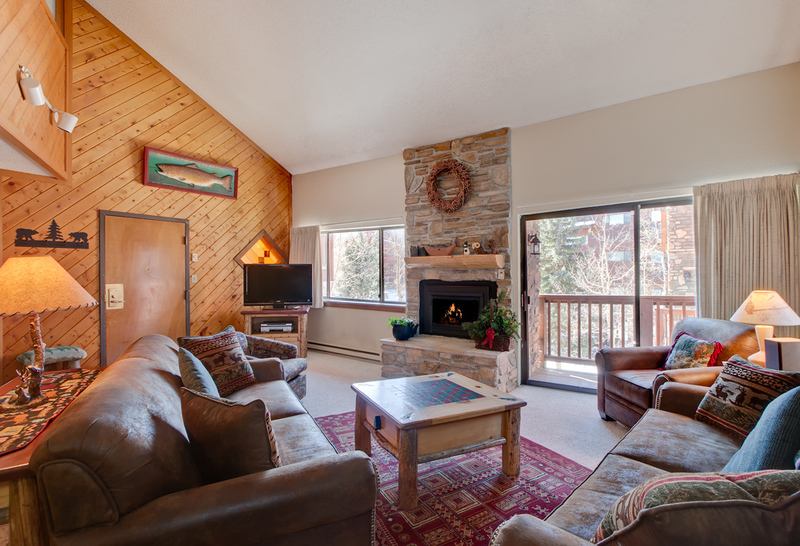 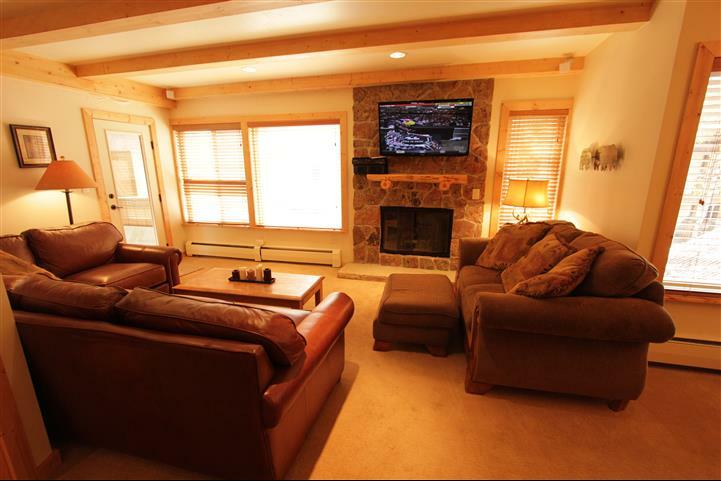 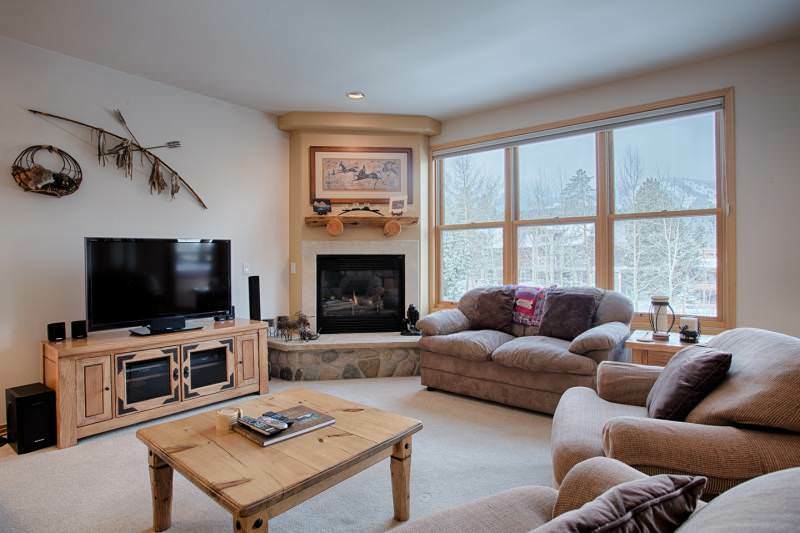 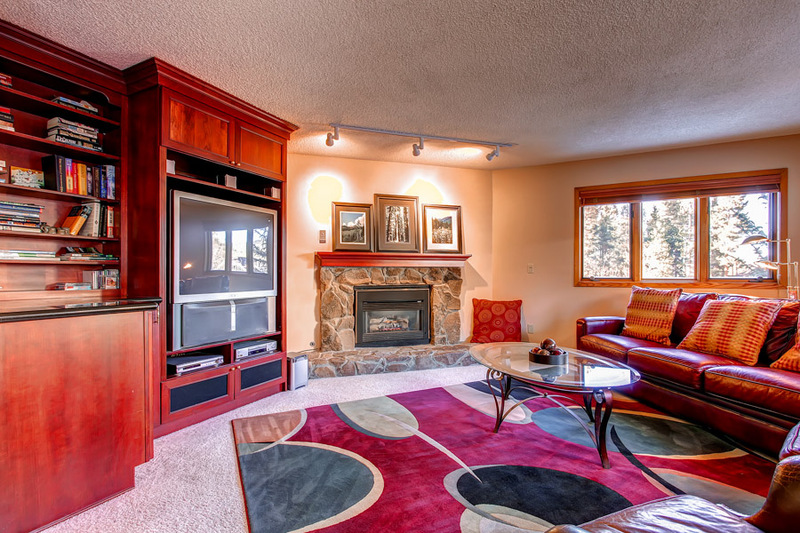 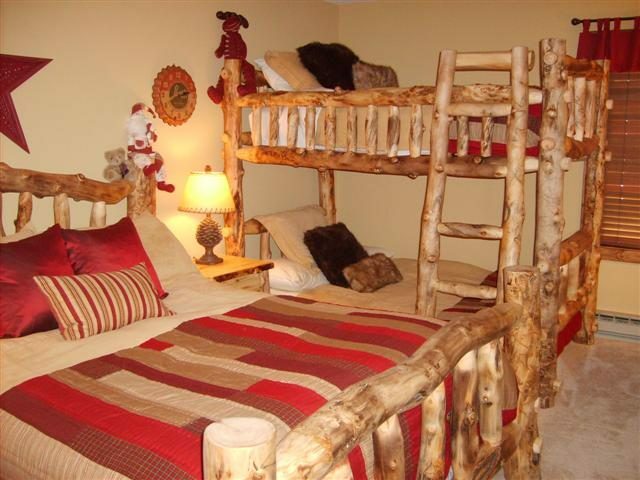 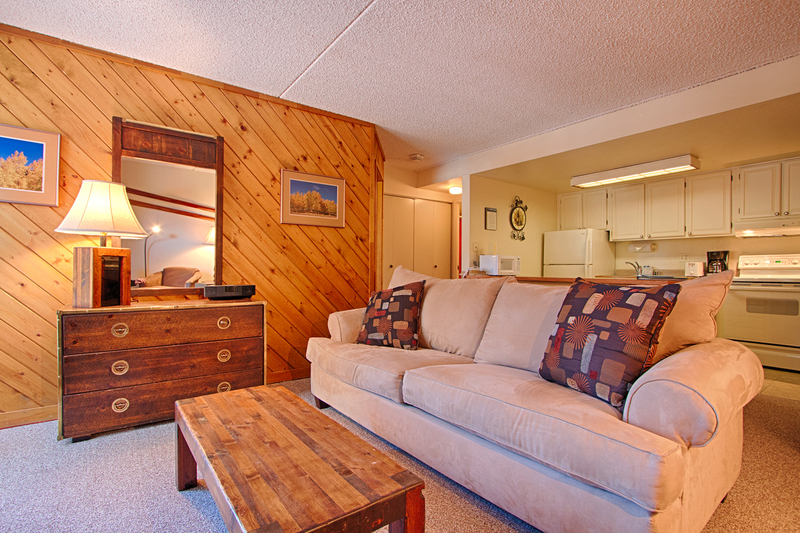 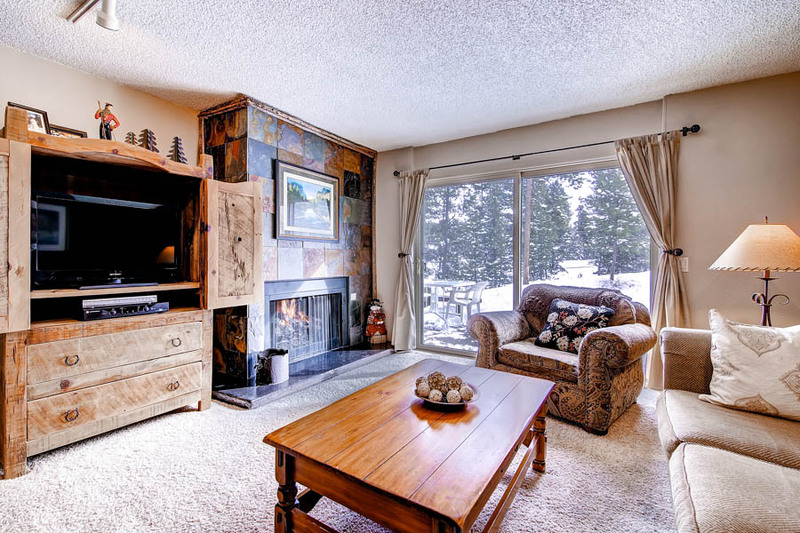 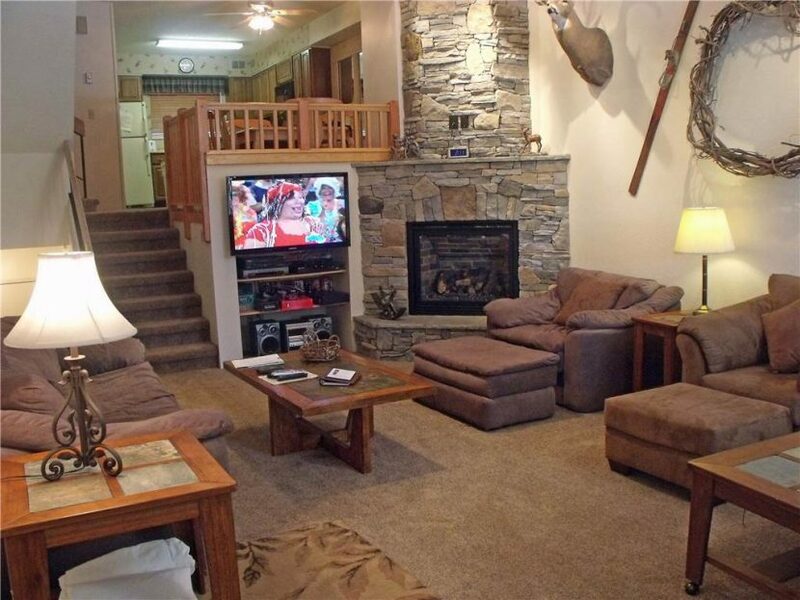 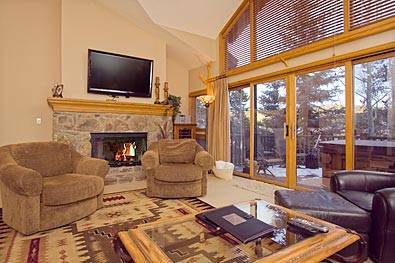 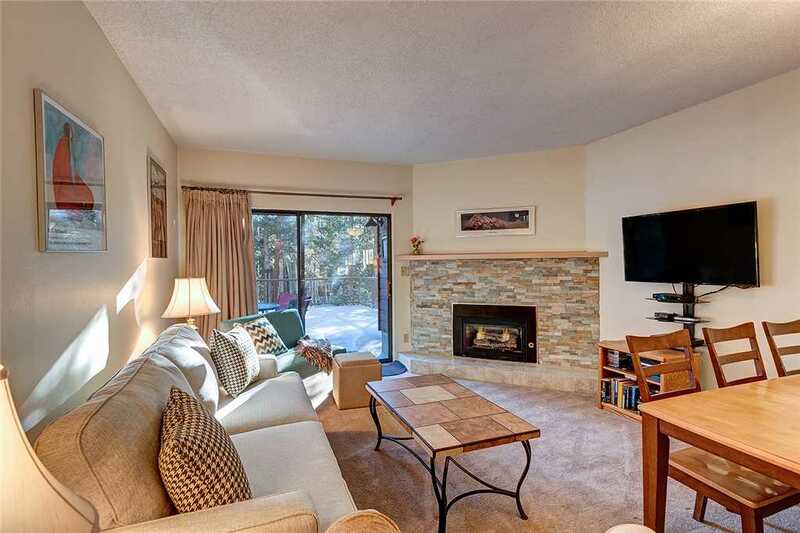 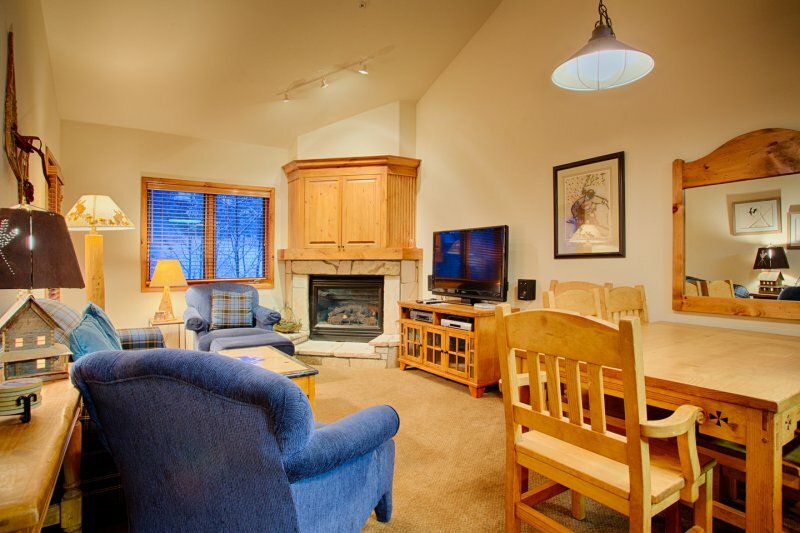 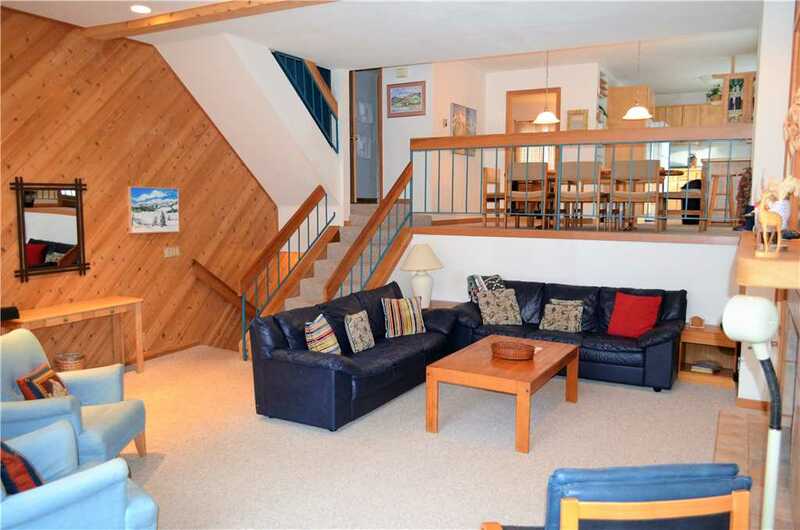 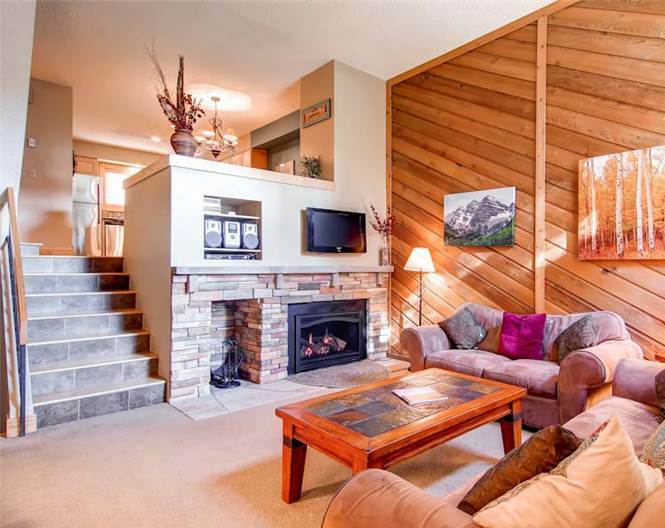 Located within short, easy walking distance the Quicksilver chairlift & ski school at Peak 9. 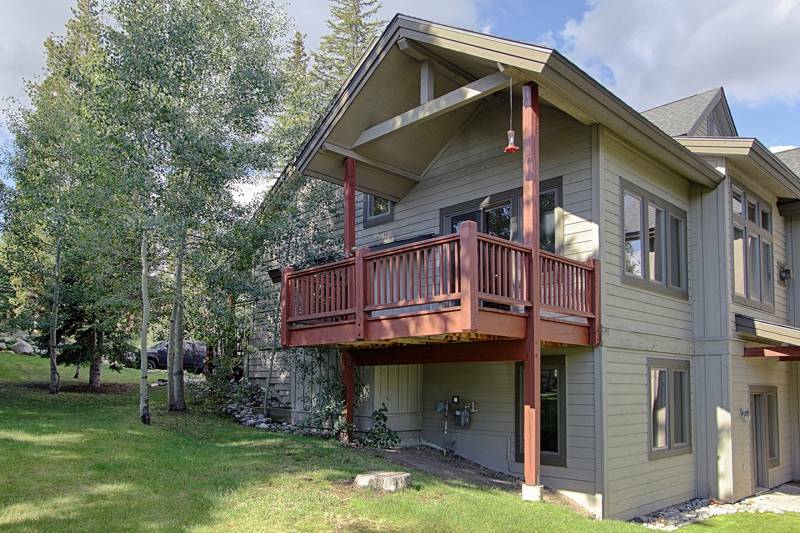 Just across the street from the property entrance is a foot path that leads you to to the Quicksilver chairlift. 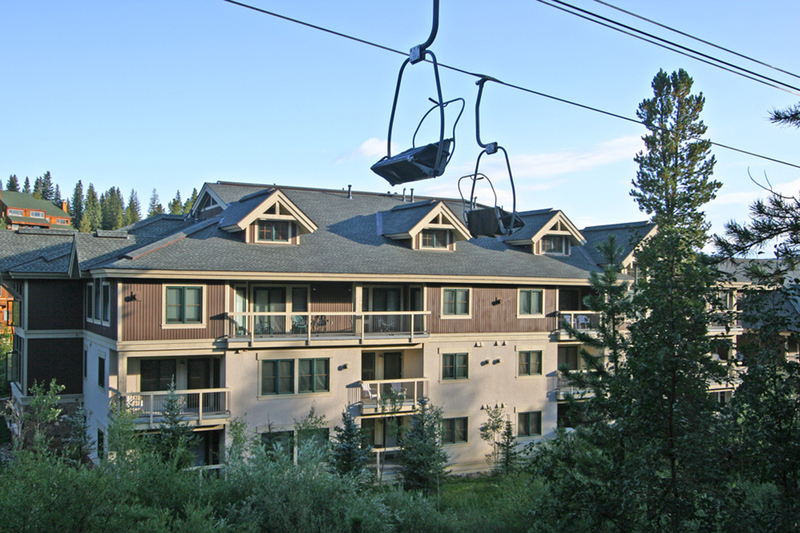 When you’re done skiing or riding make your way down to the base area and walk back across a bridge to the Snodallion entrance. 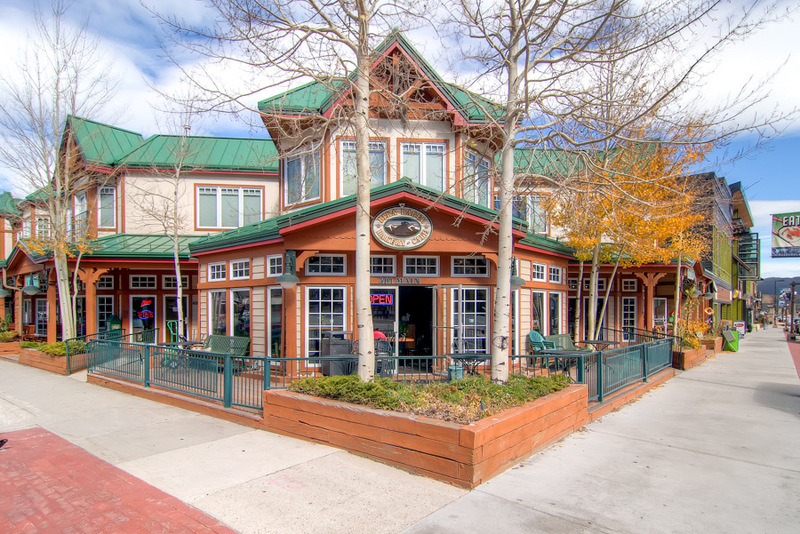 Main Street and the heart of town are just a couple of blocks away. 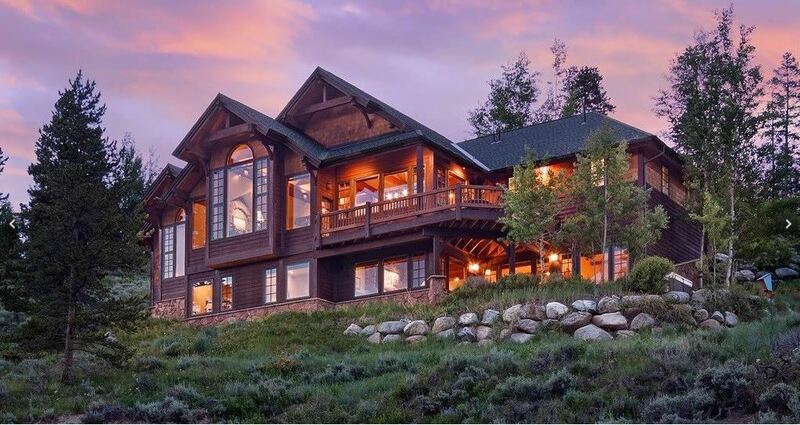 Easily walk everywhere! 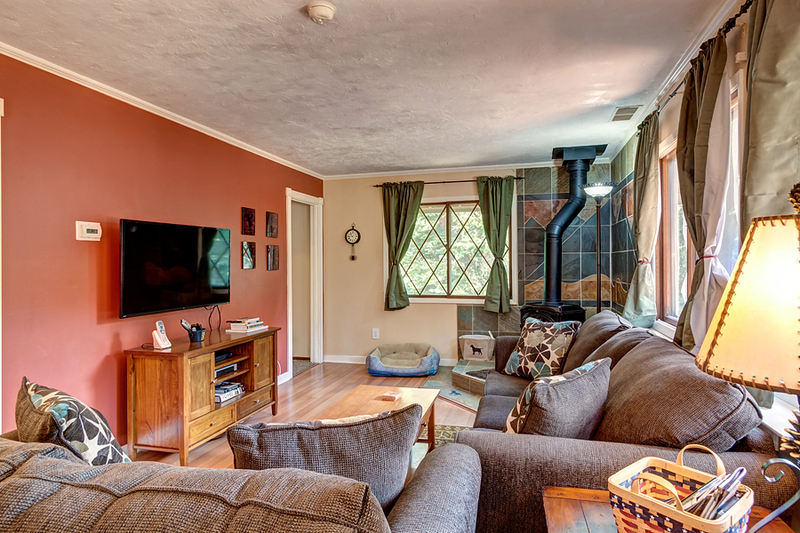 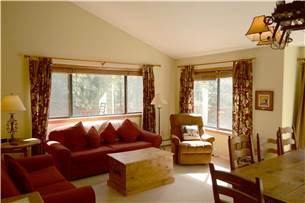 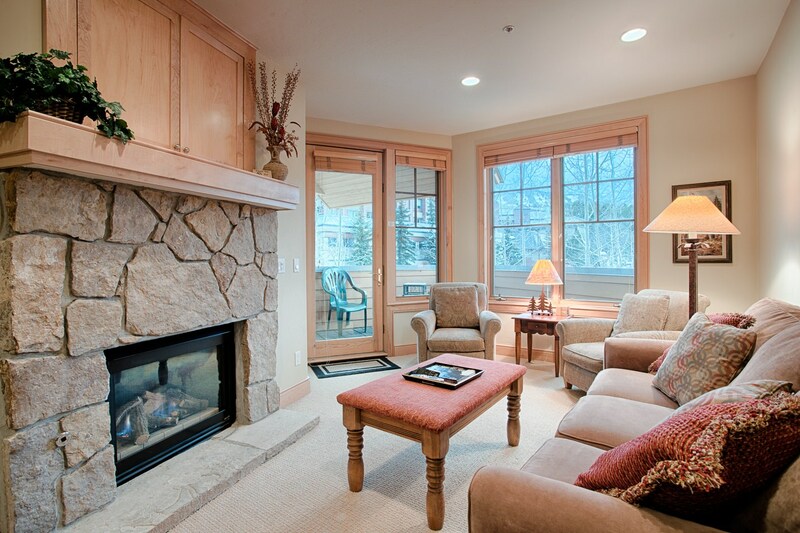 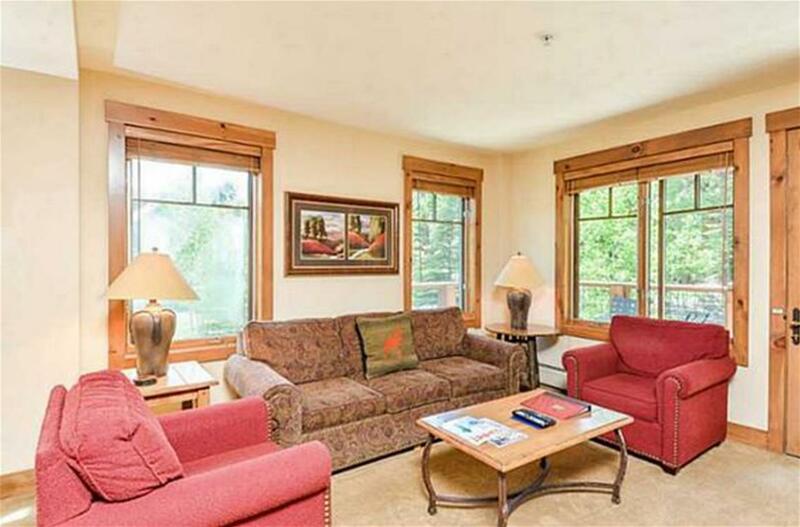 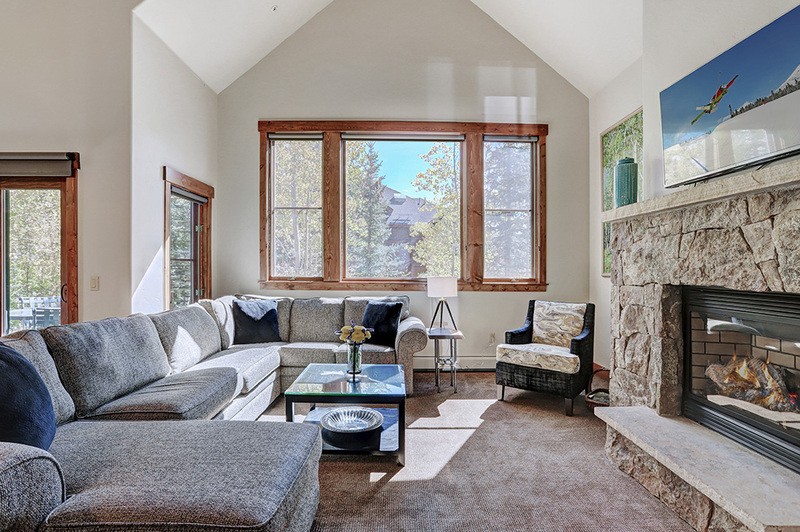 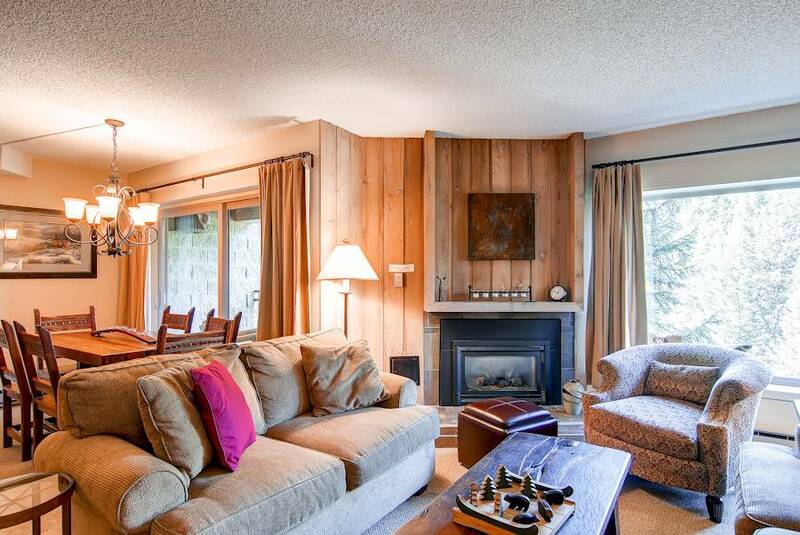 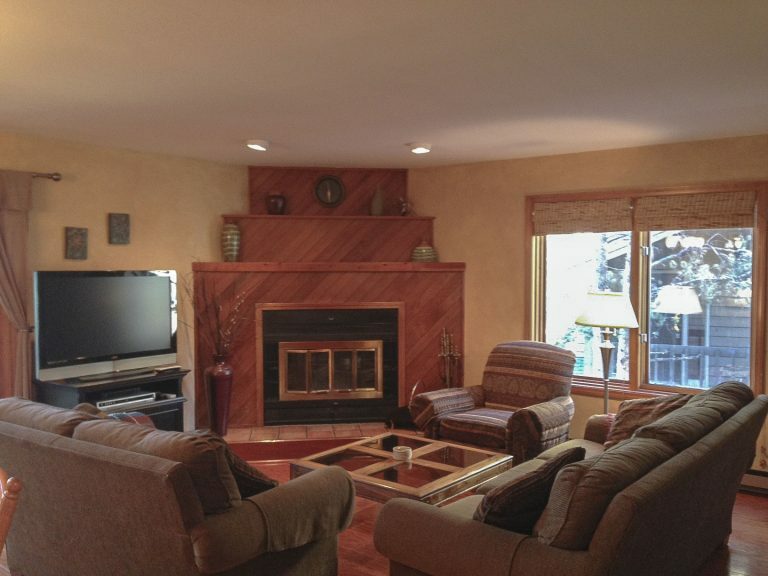 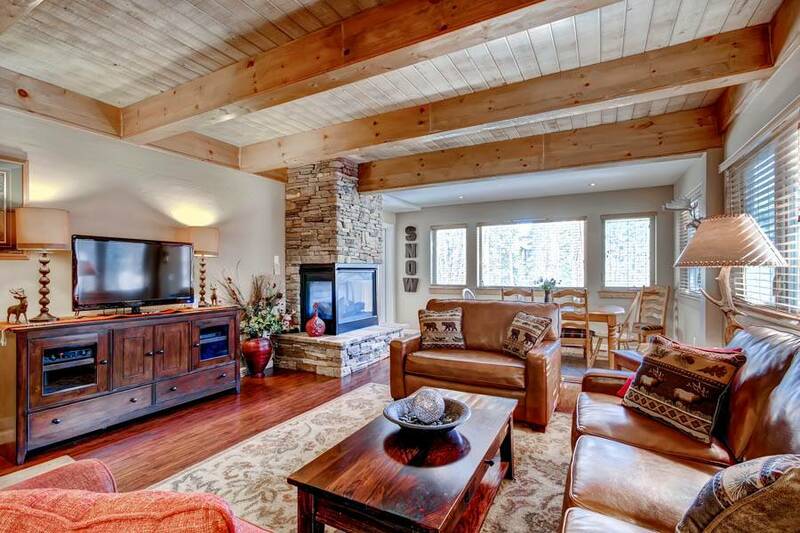 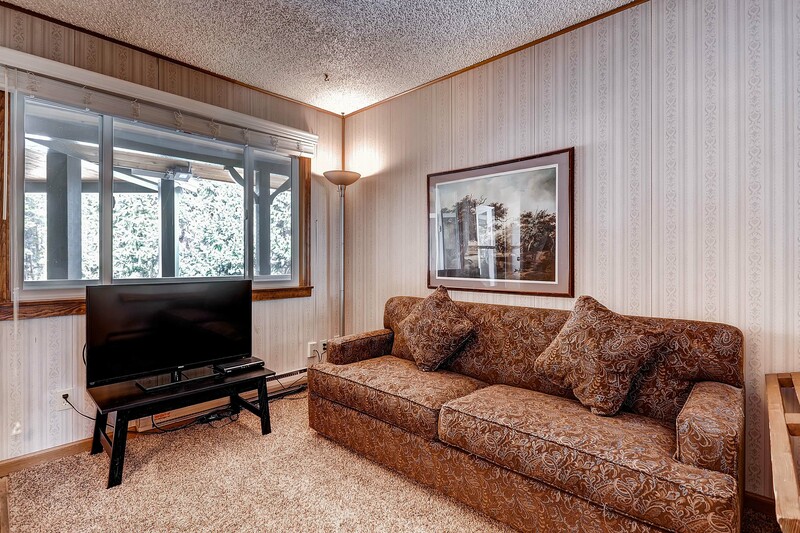 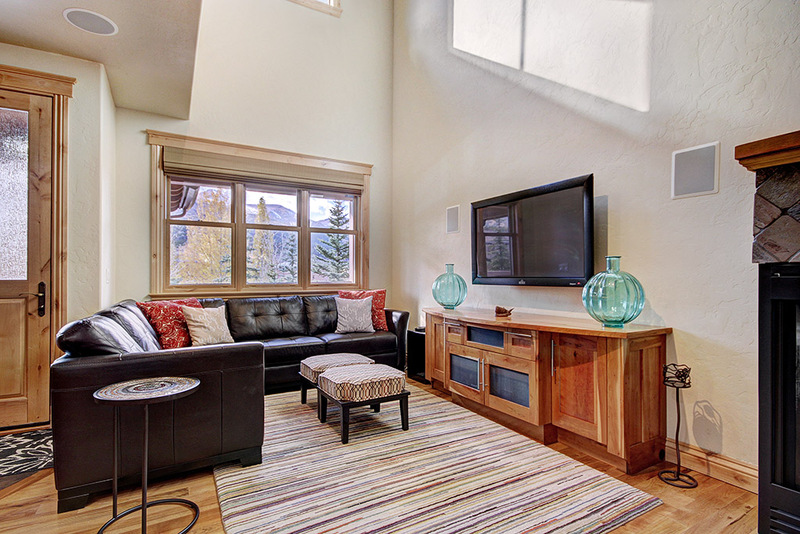 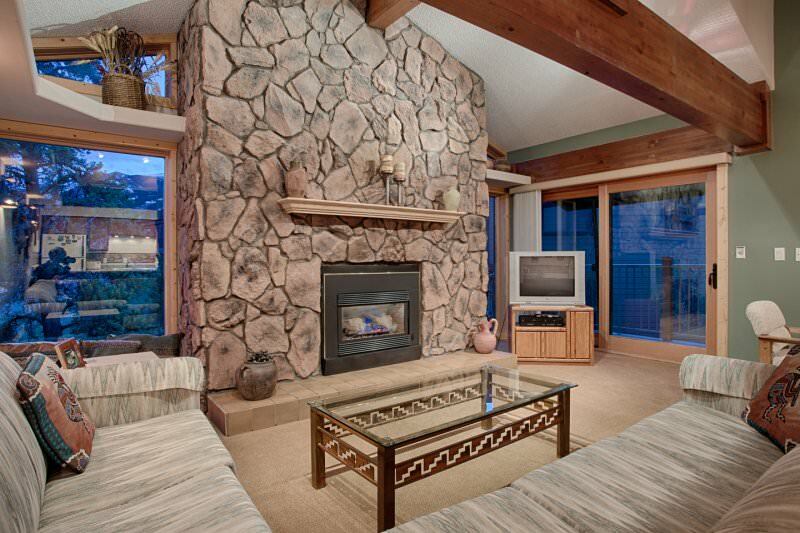 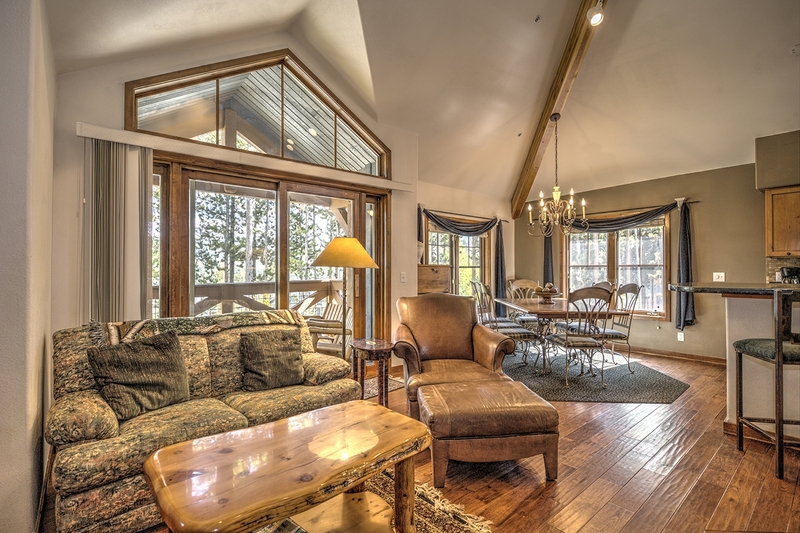 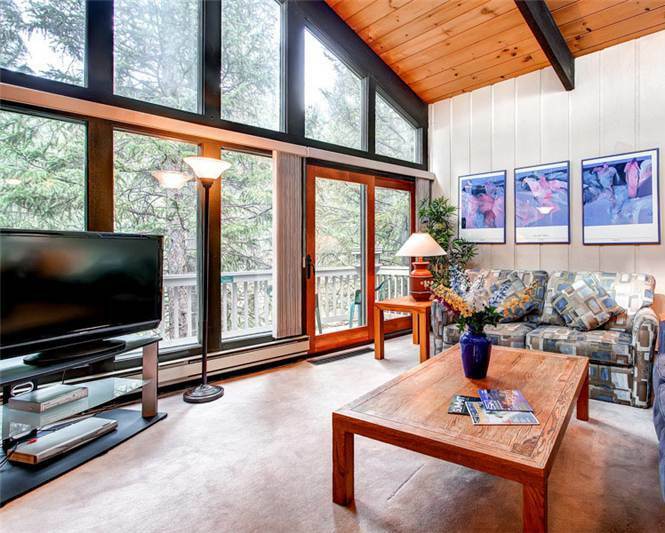 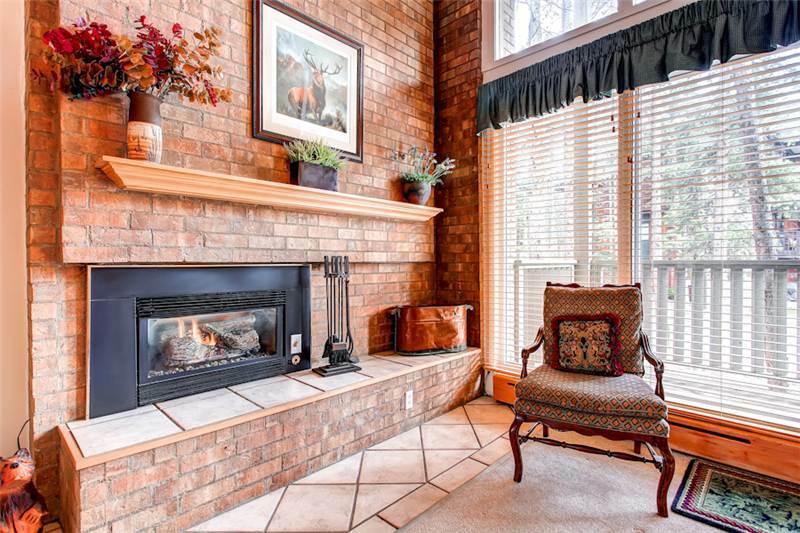 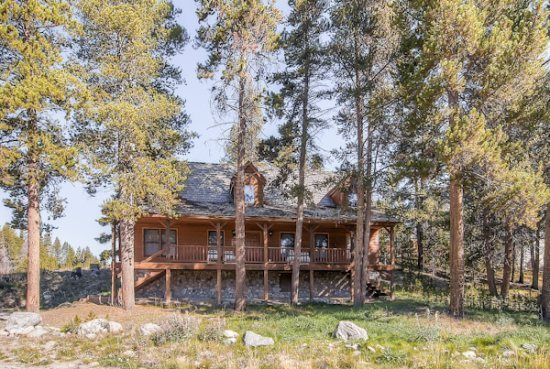 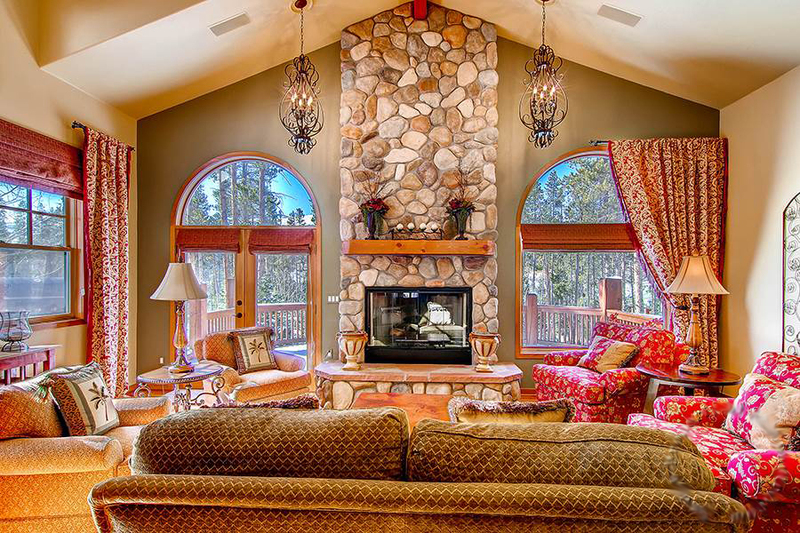 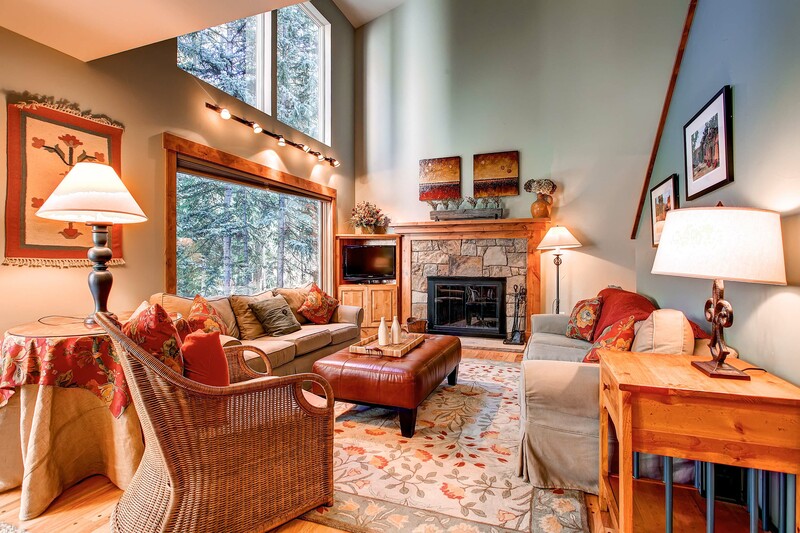 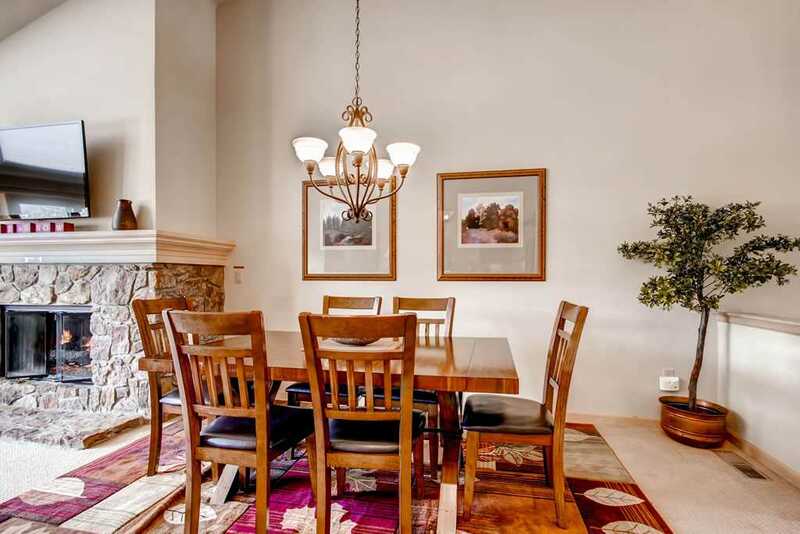 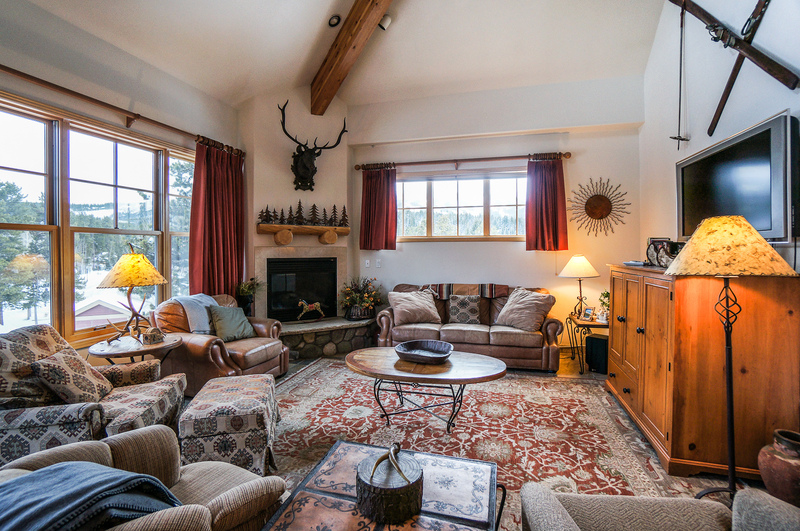 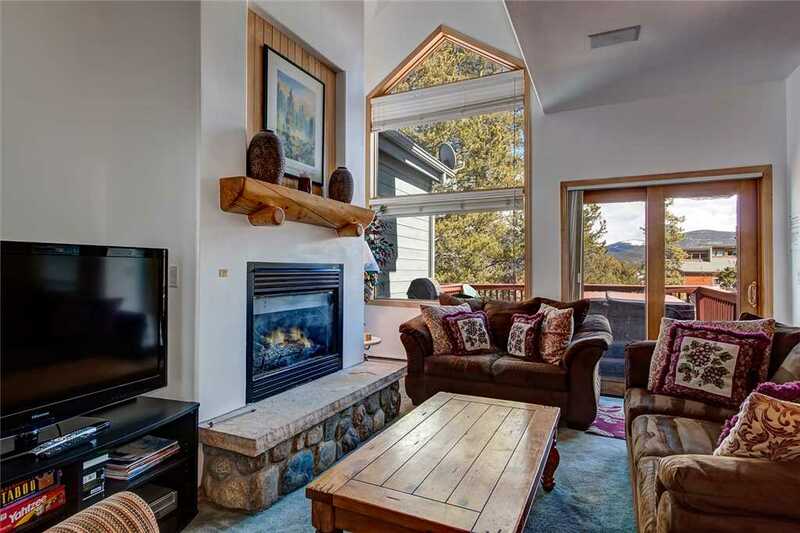 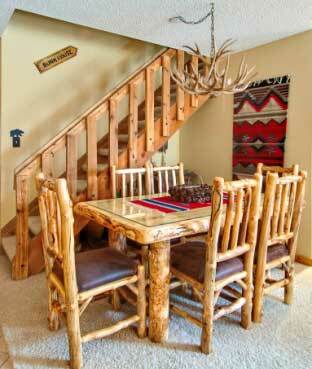 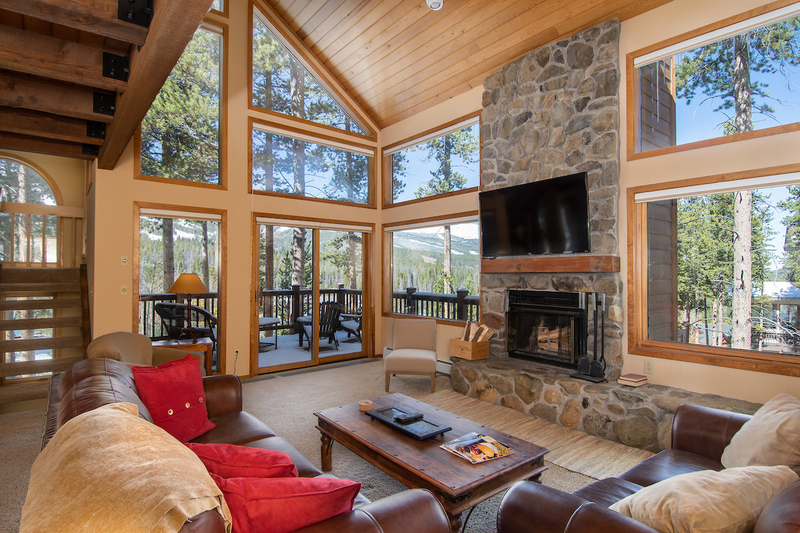 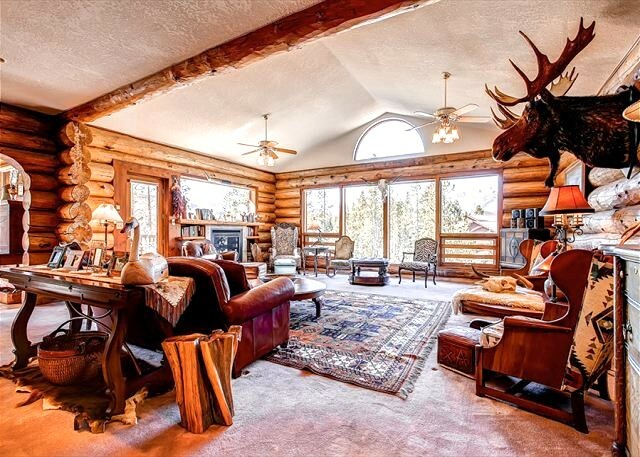 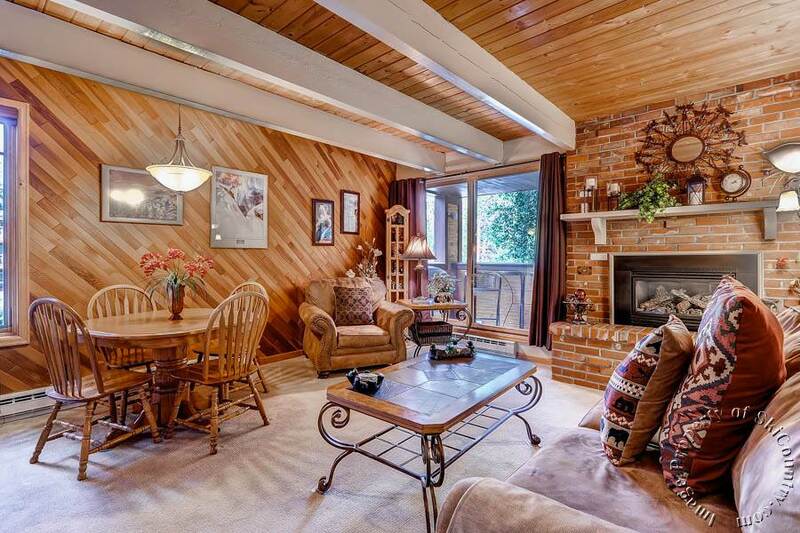 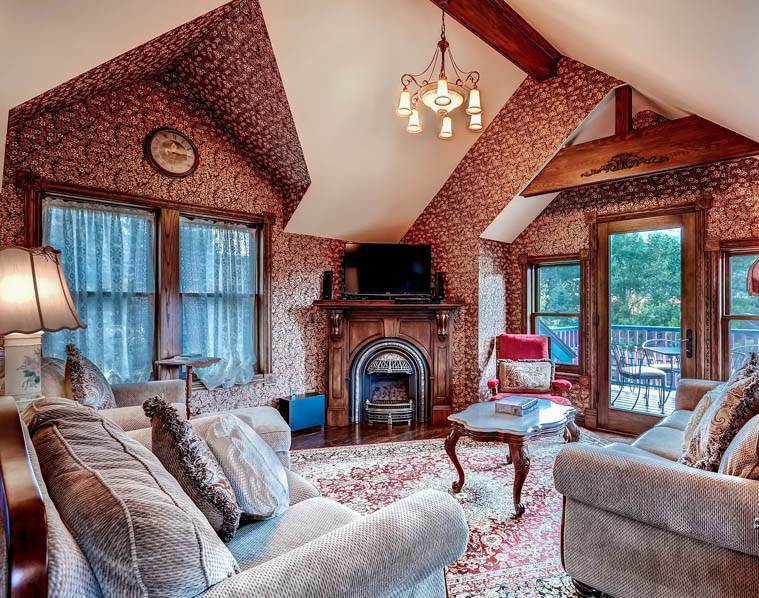 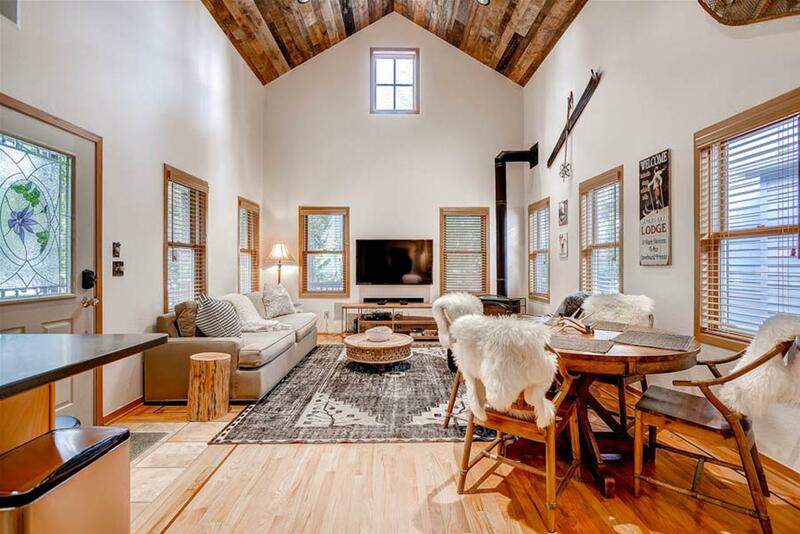 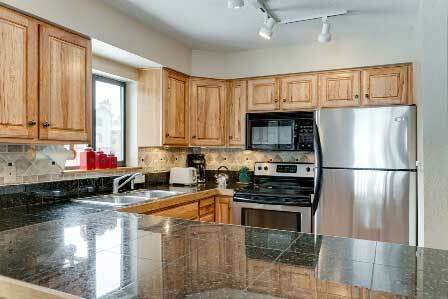 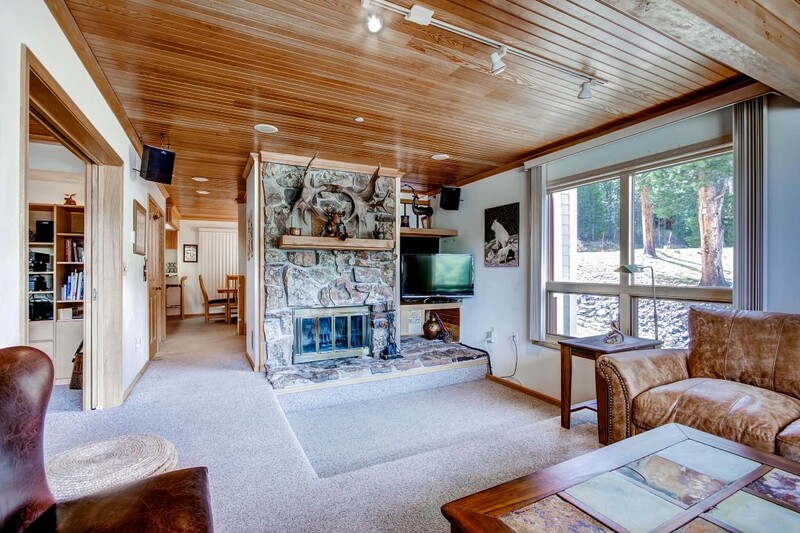 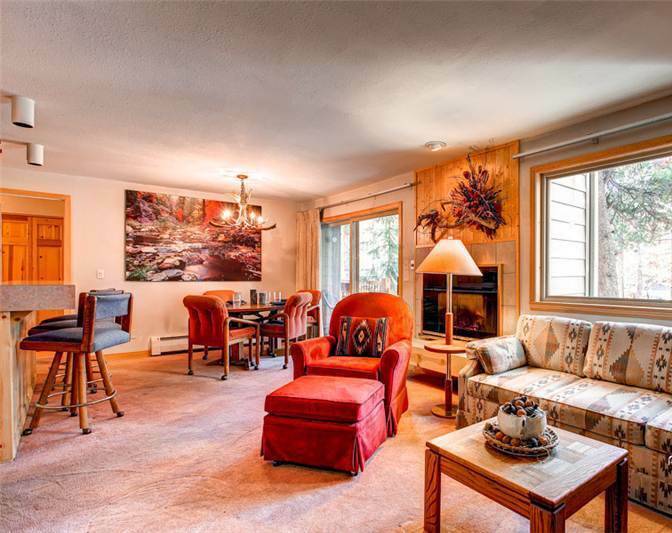 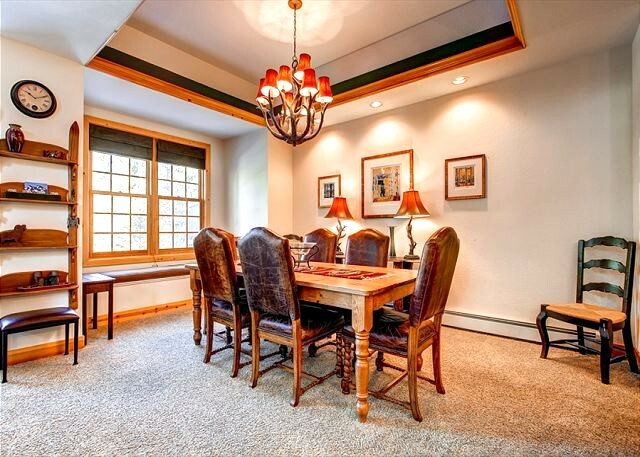 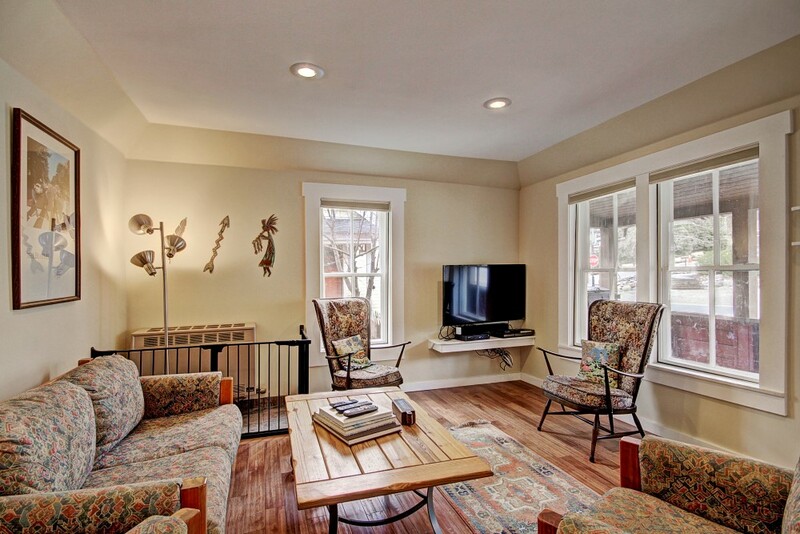 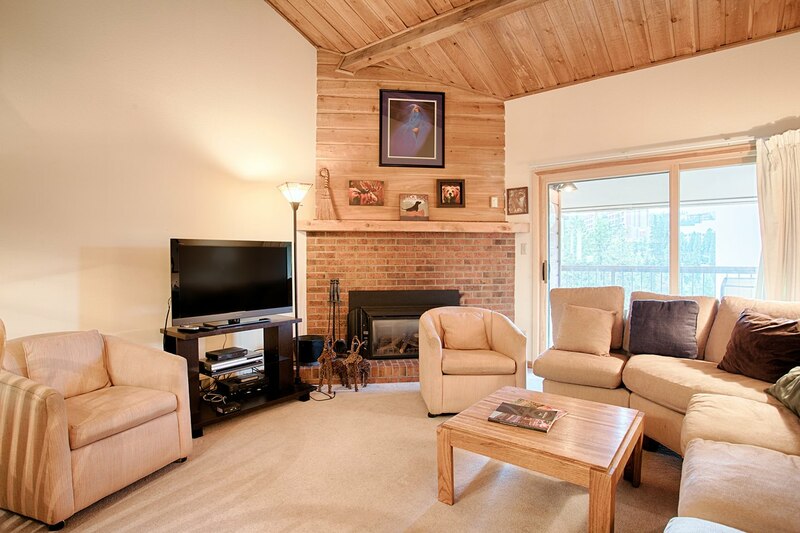 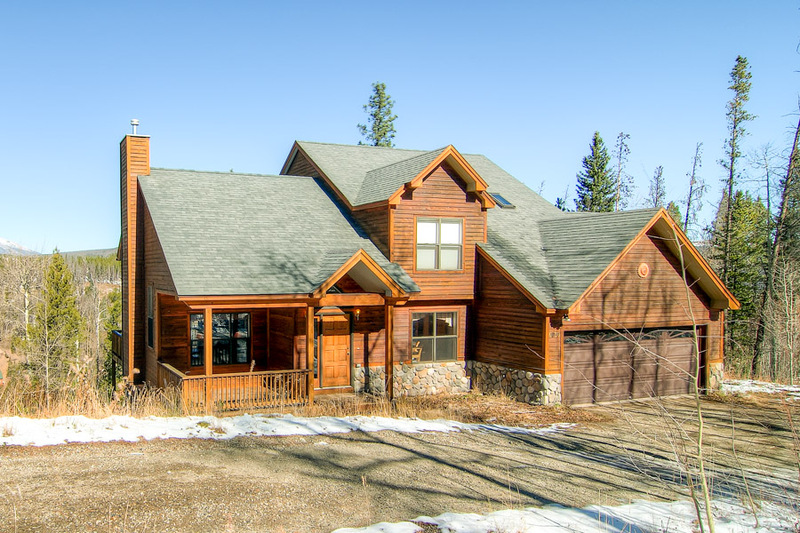 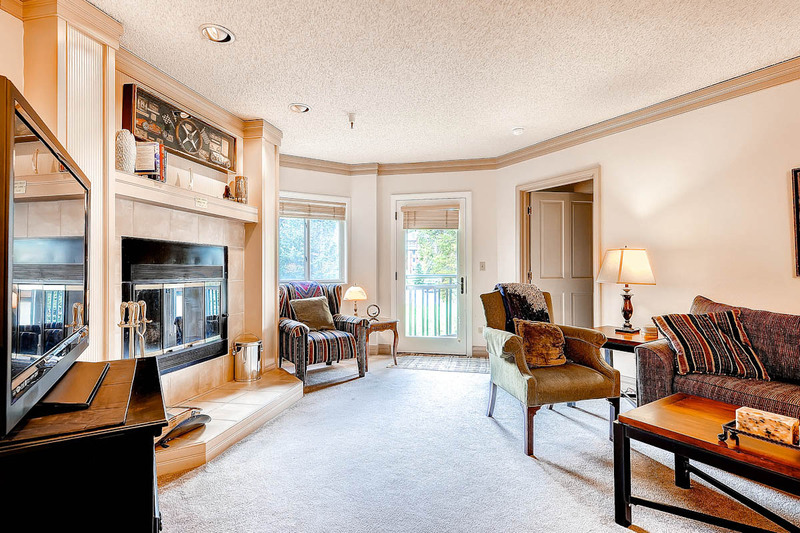 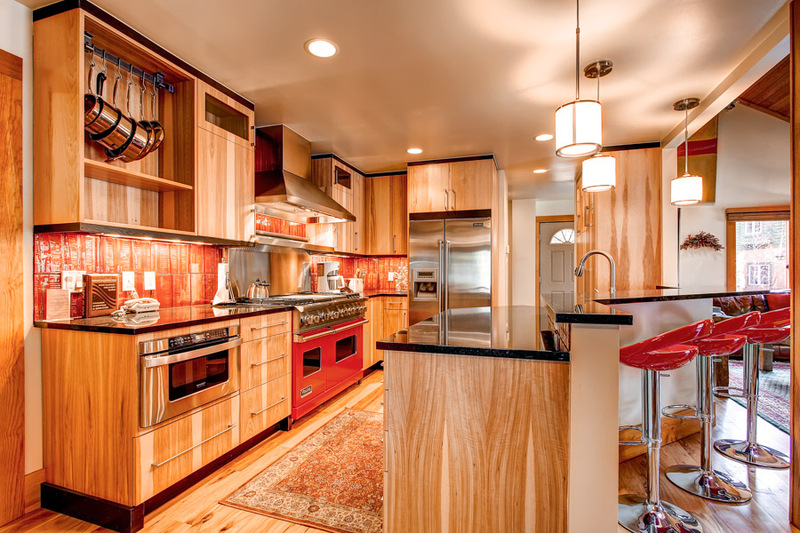 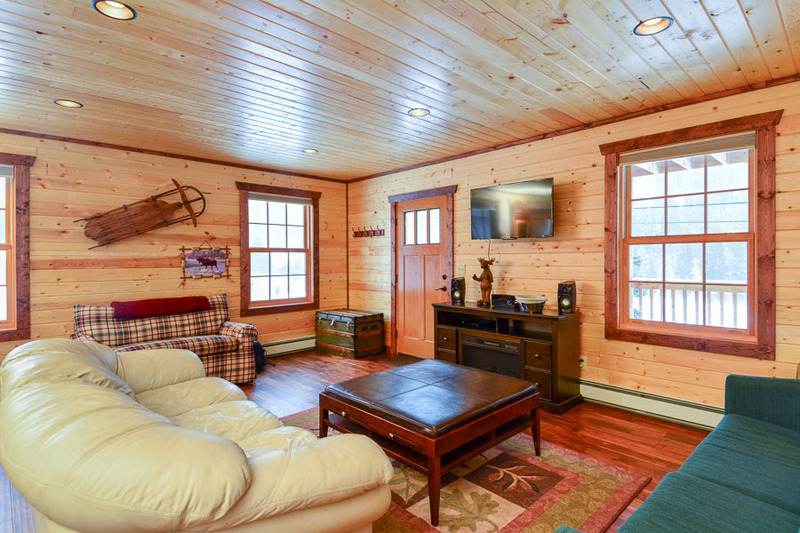 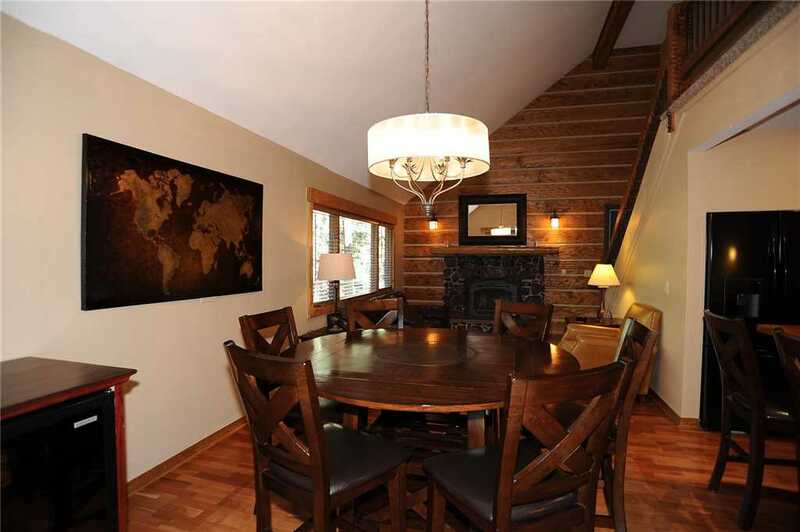 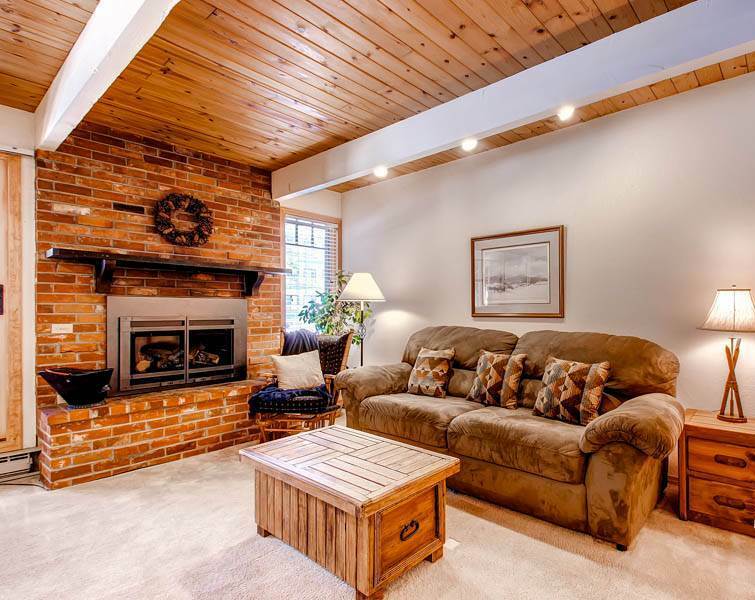 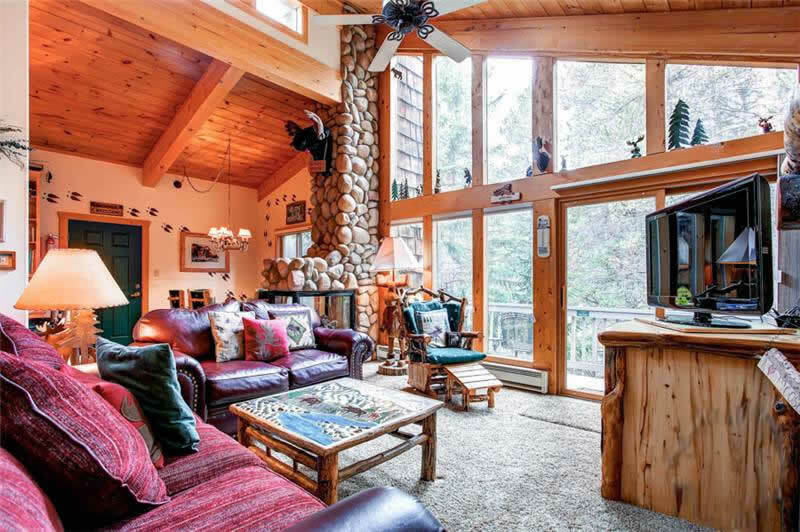 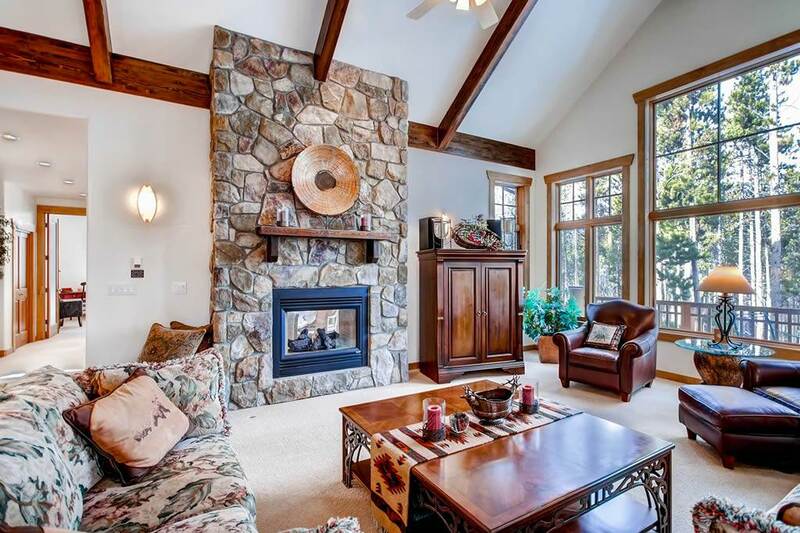 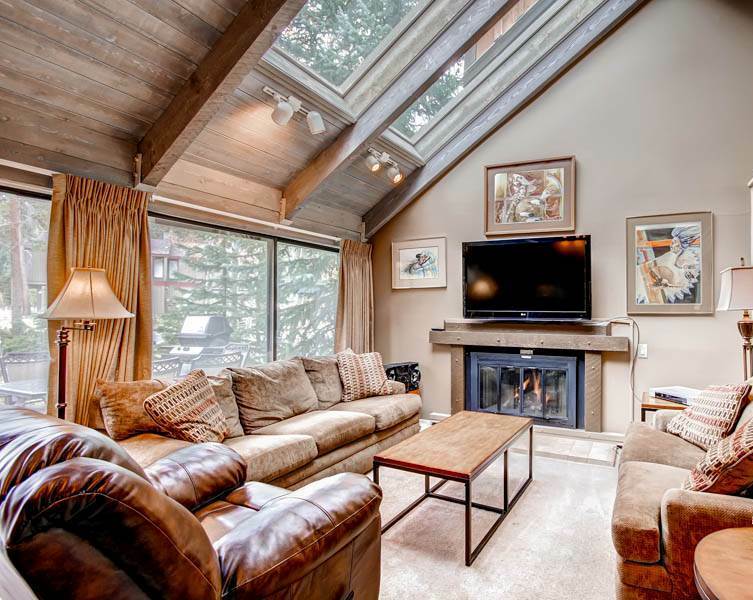 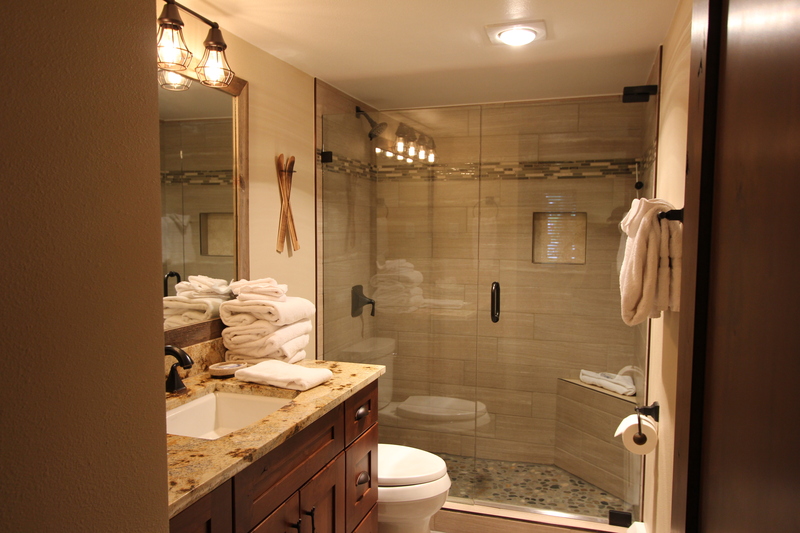 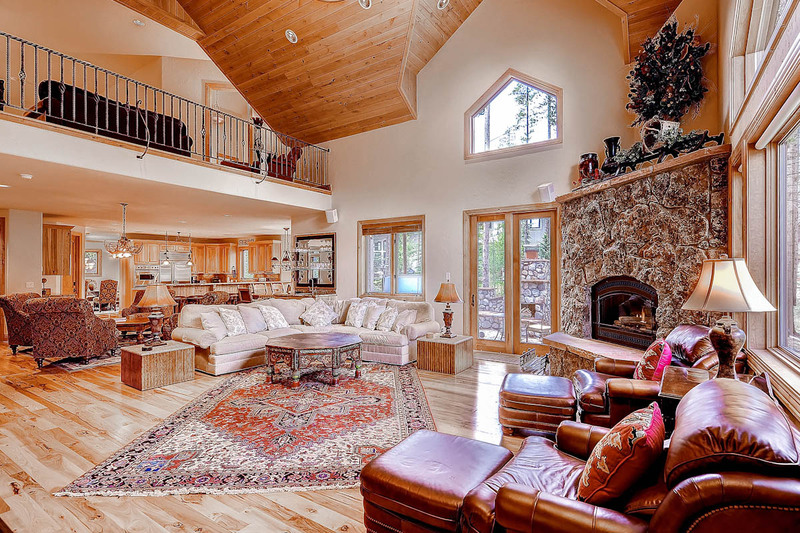 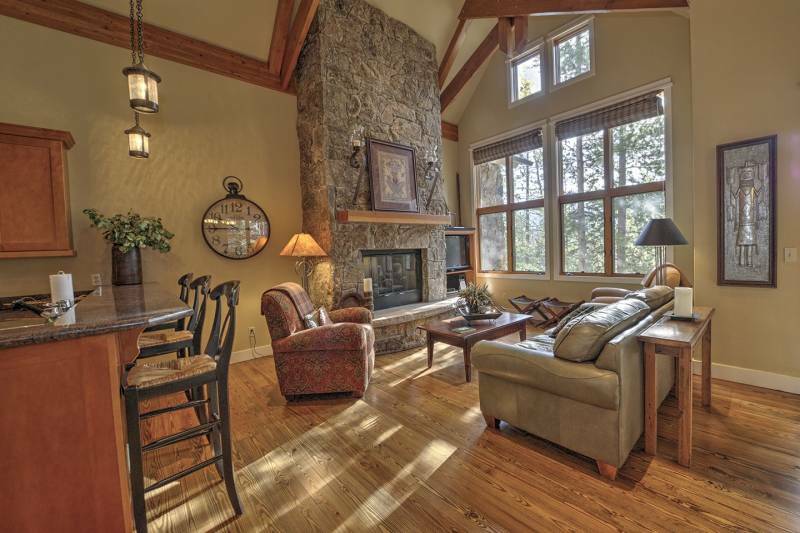 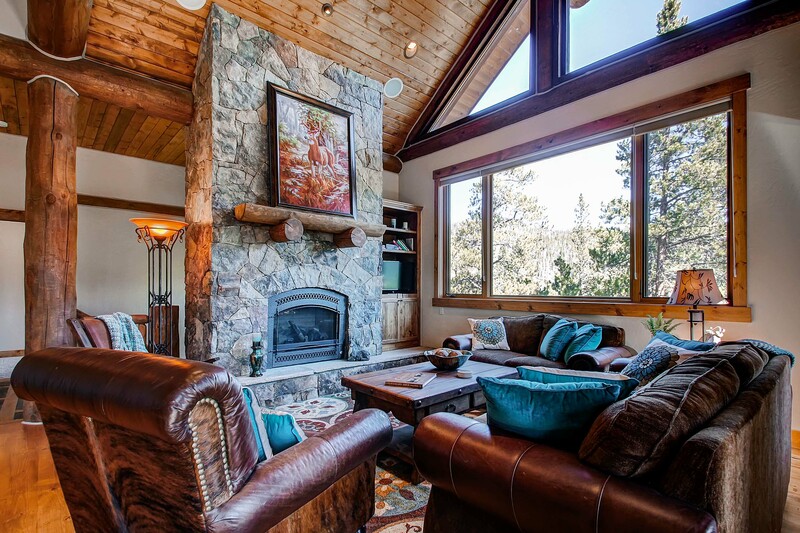 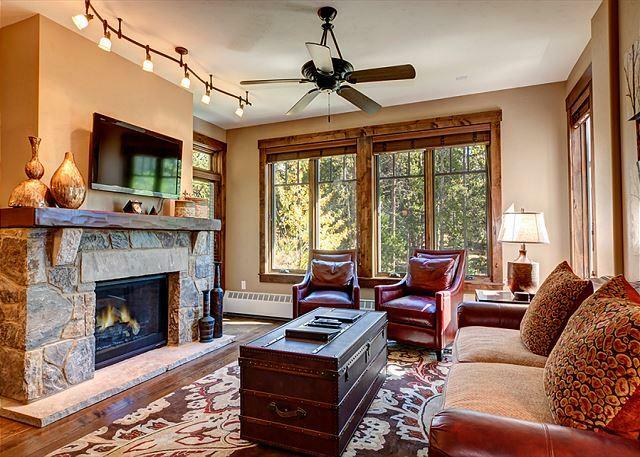 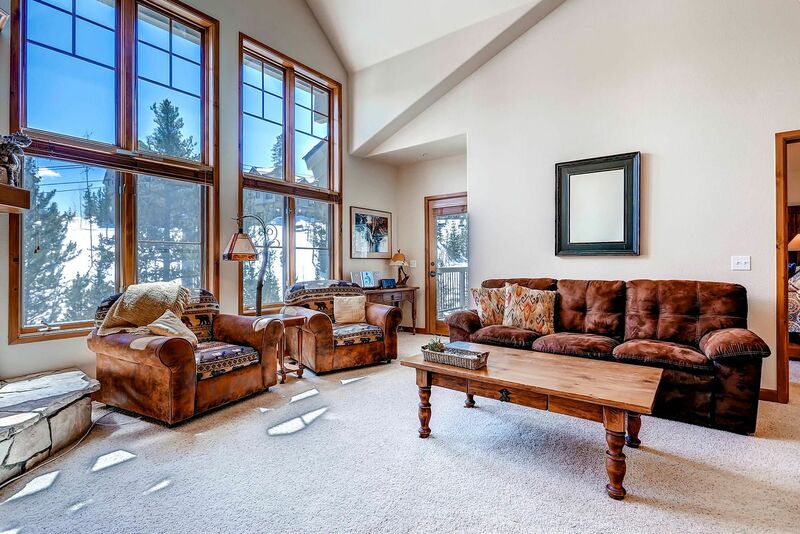 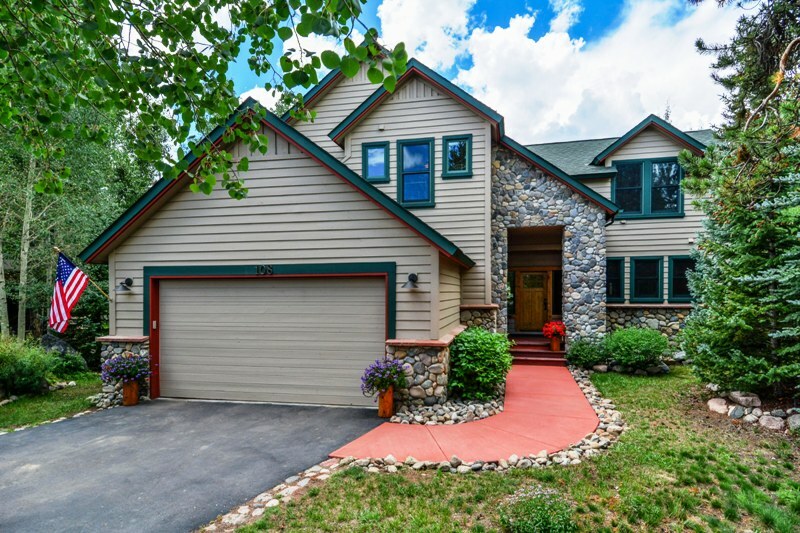 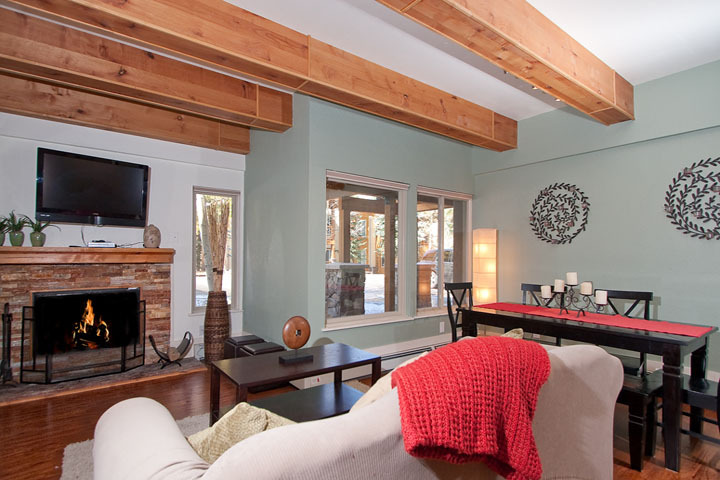 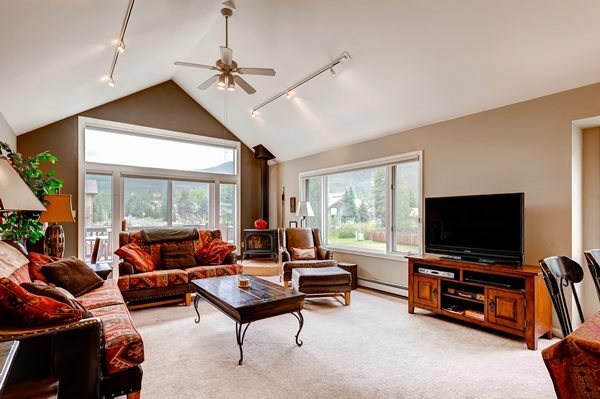 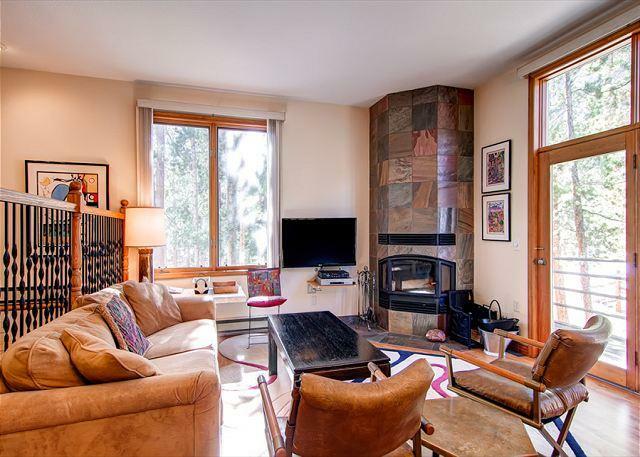 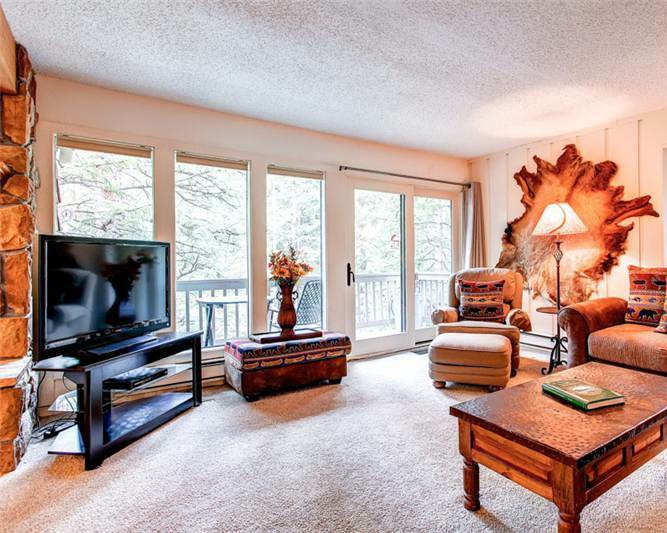 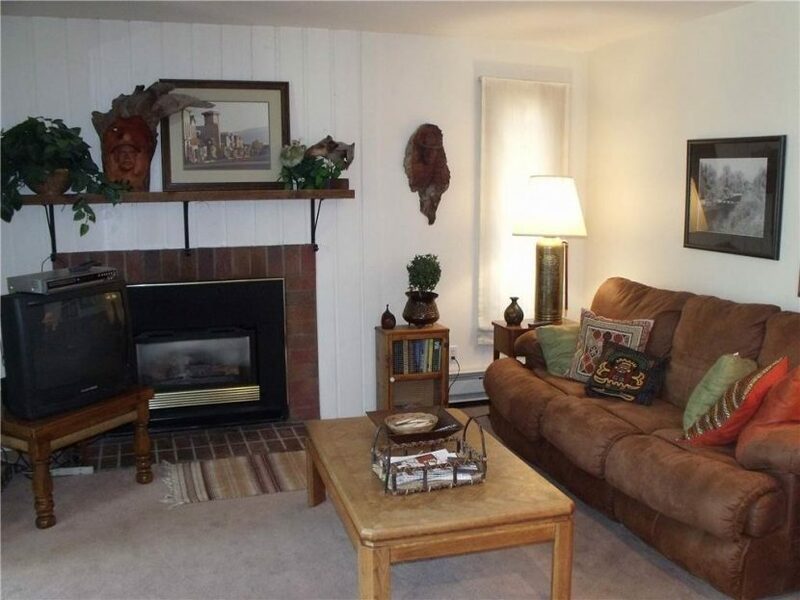 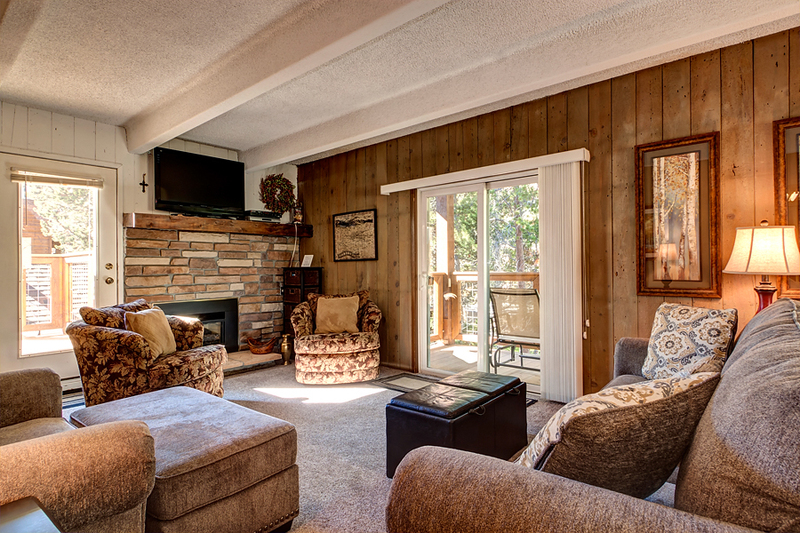 This renovated second floor property is surrounded by towering Pine trees. 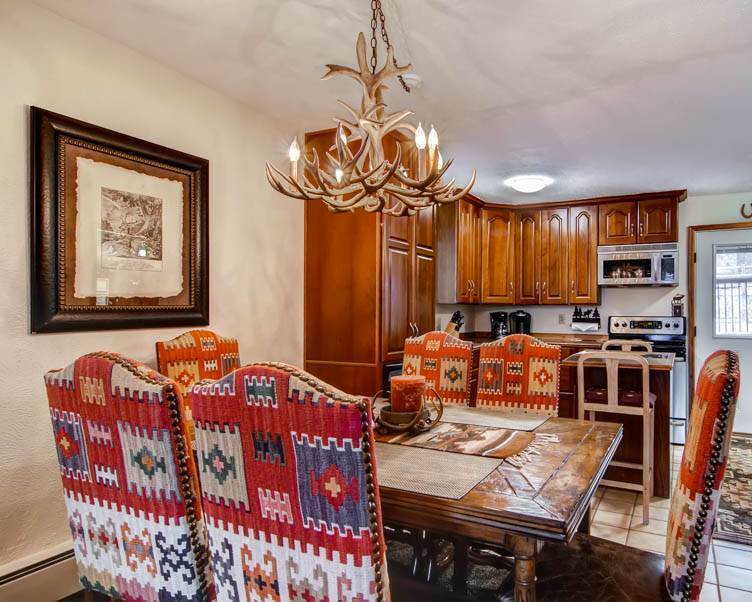 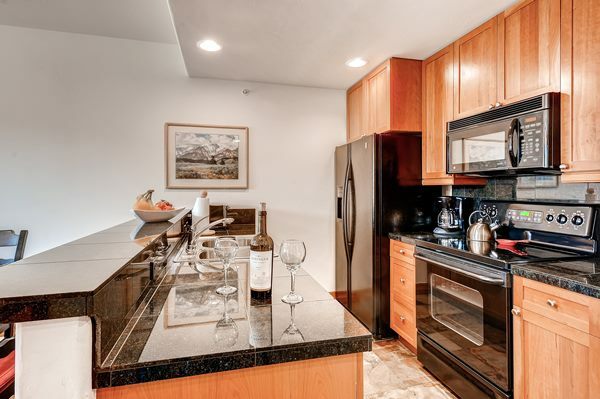 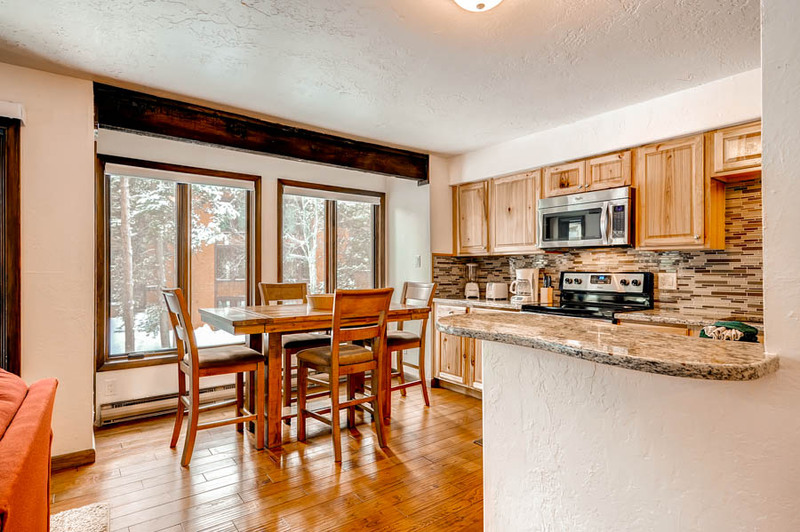 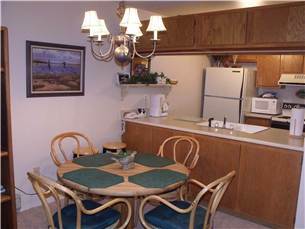 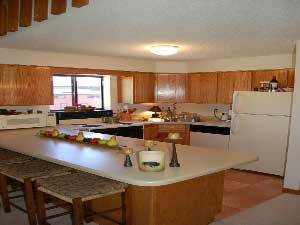 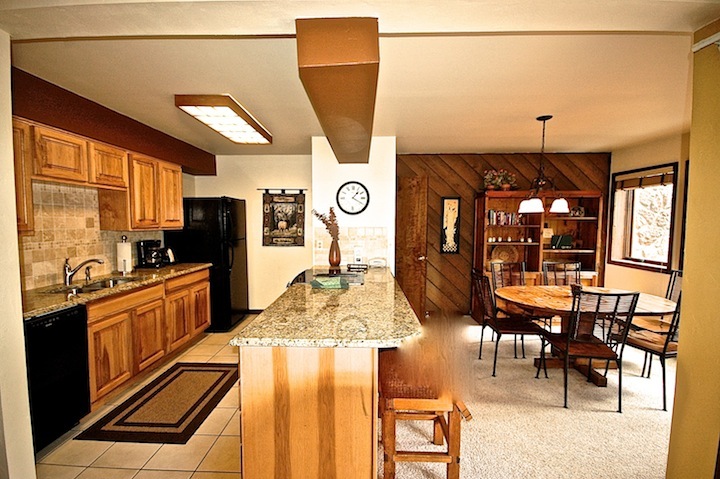 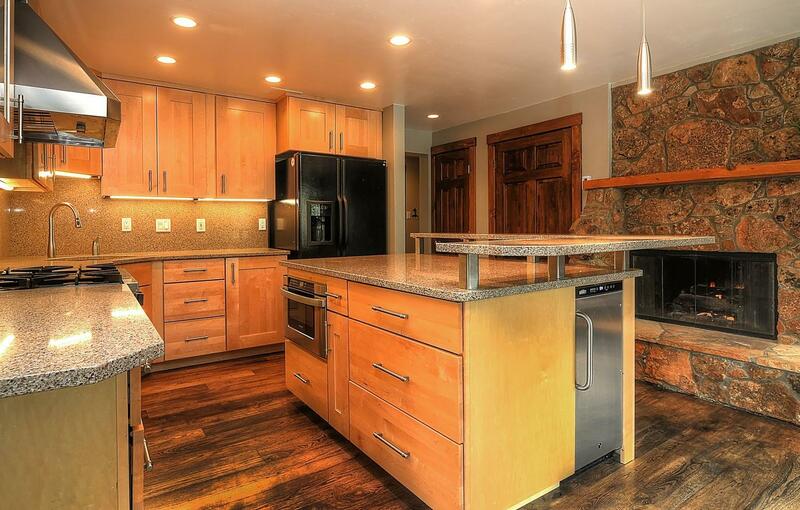 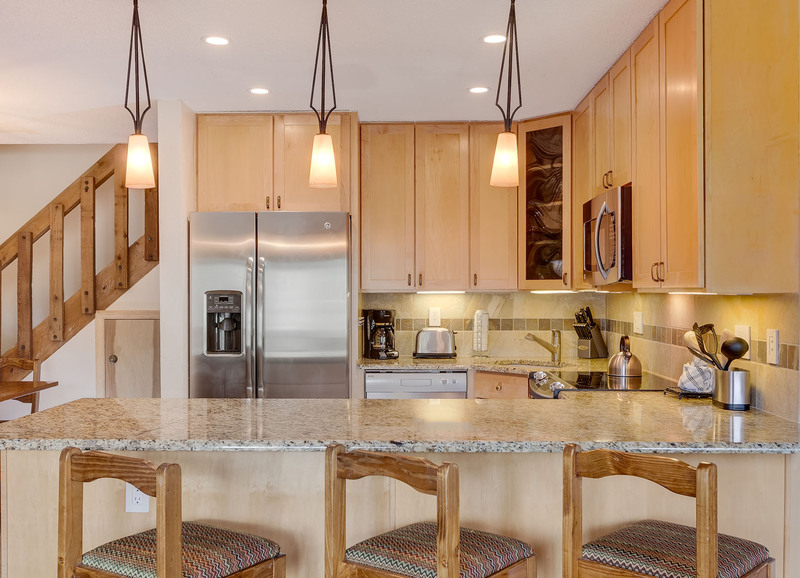 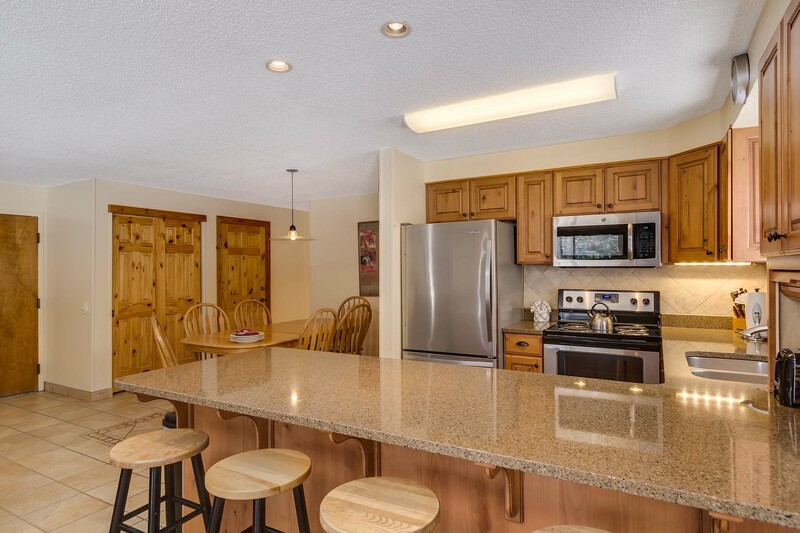 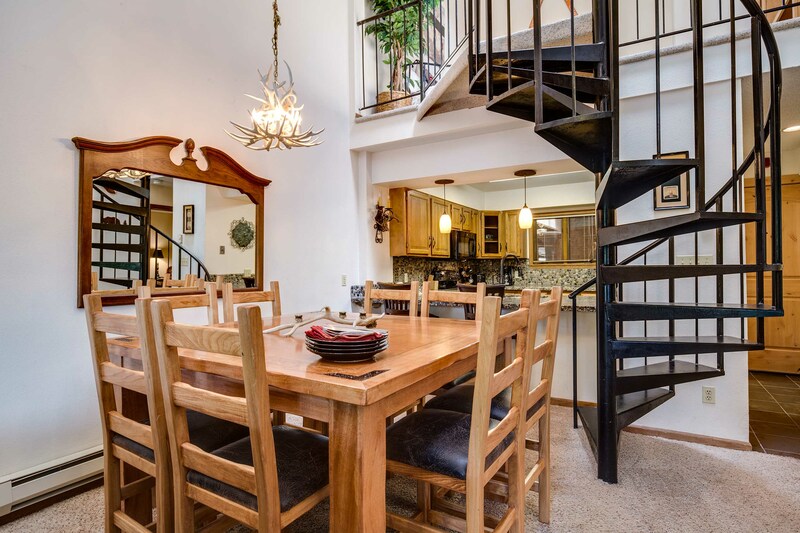 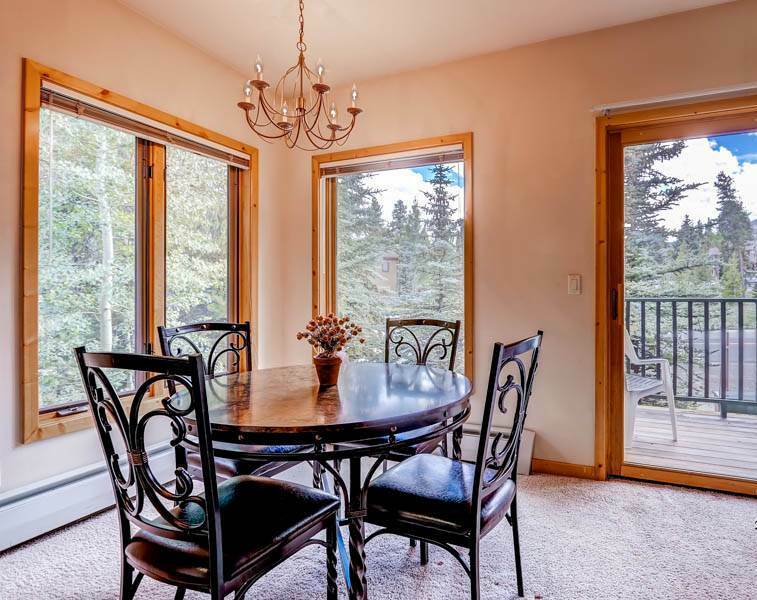 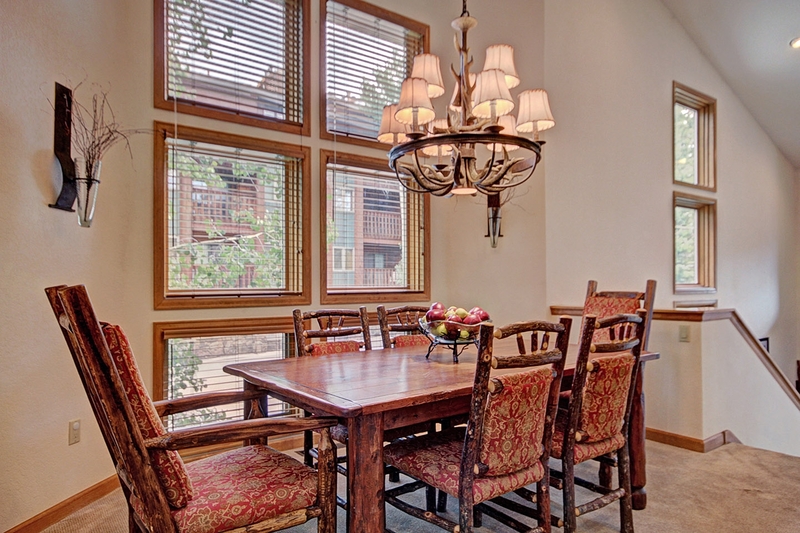 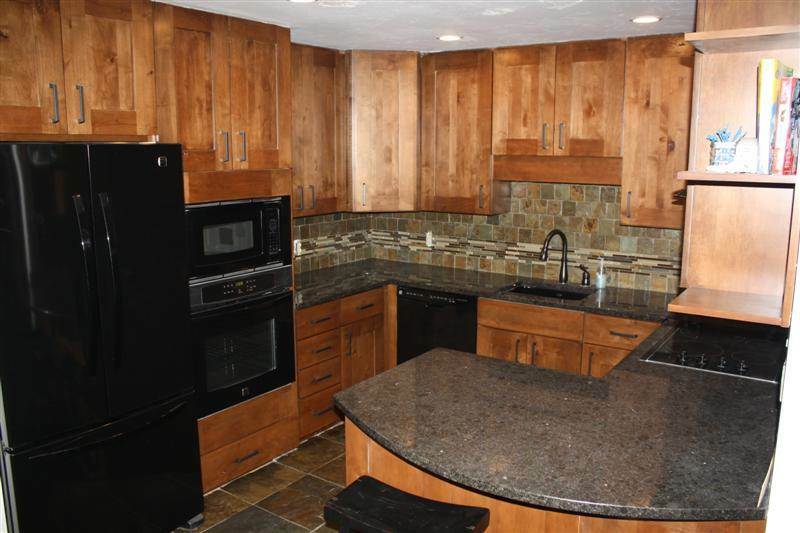 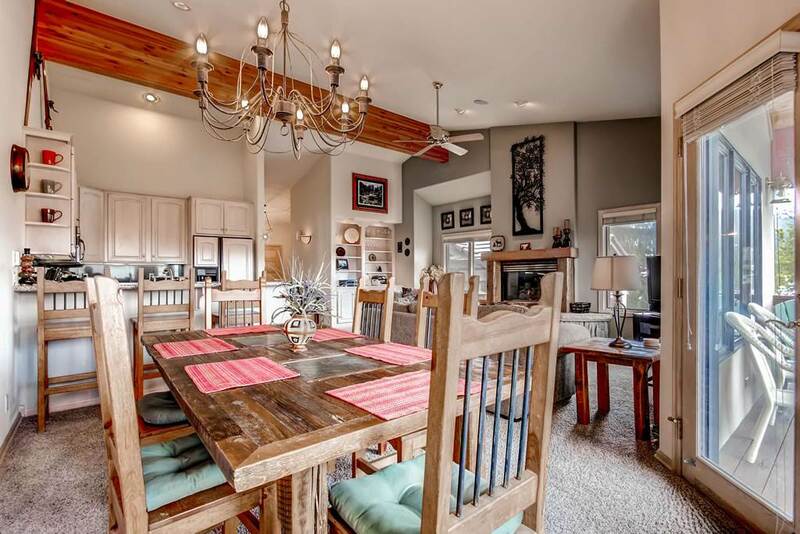 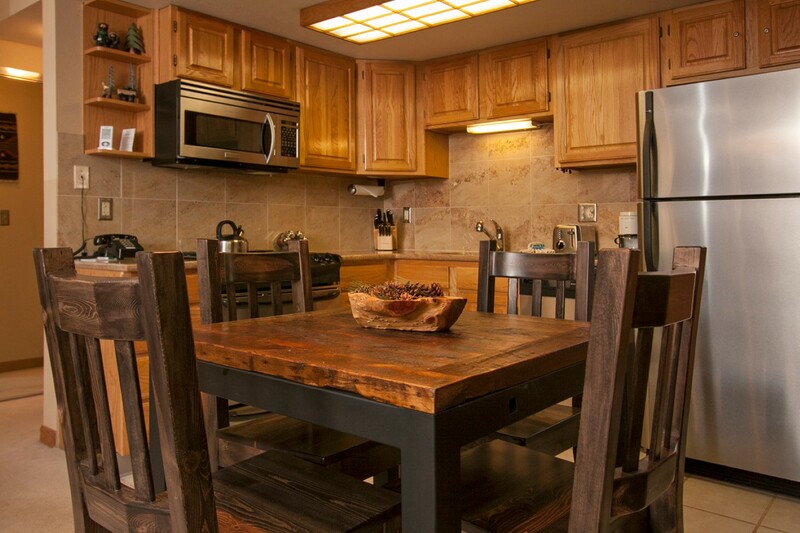 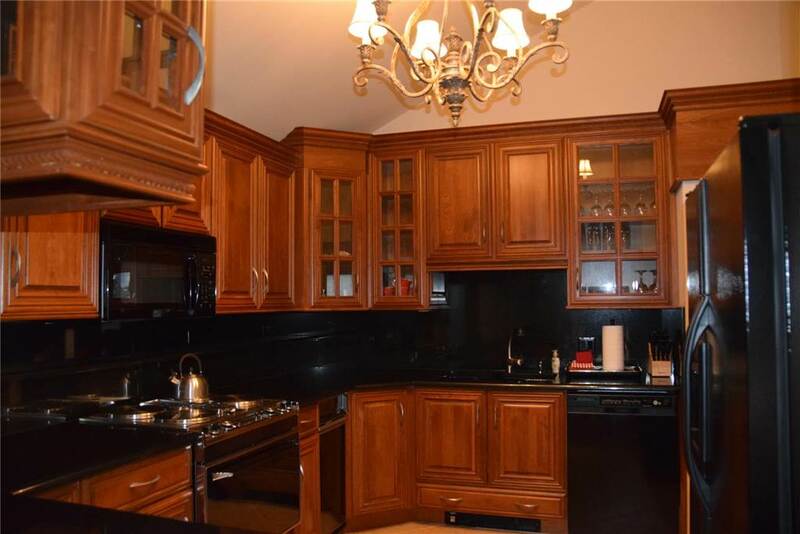 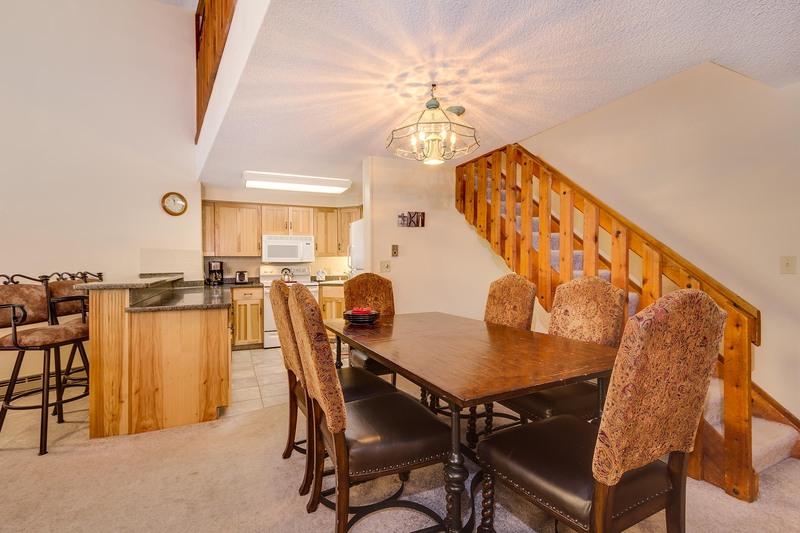 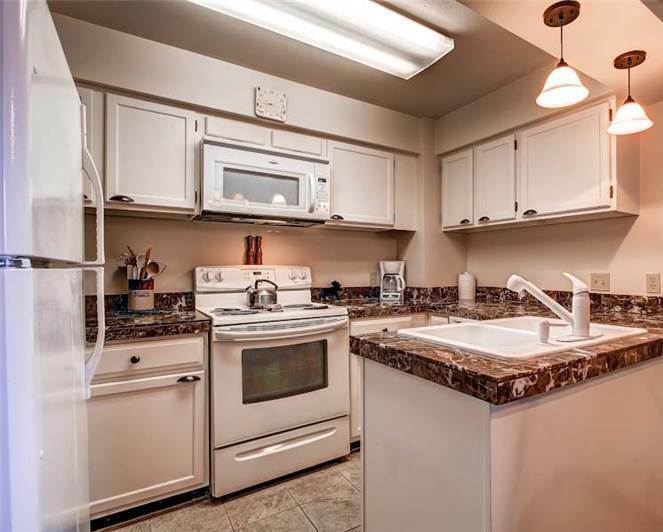 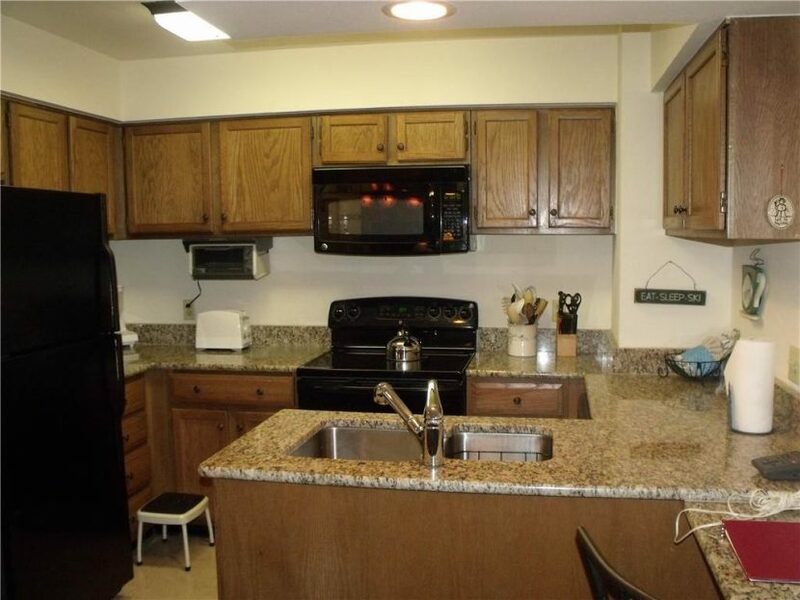 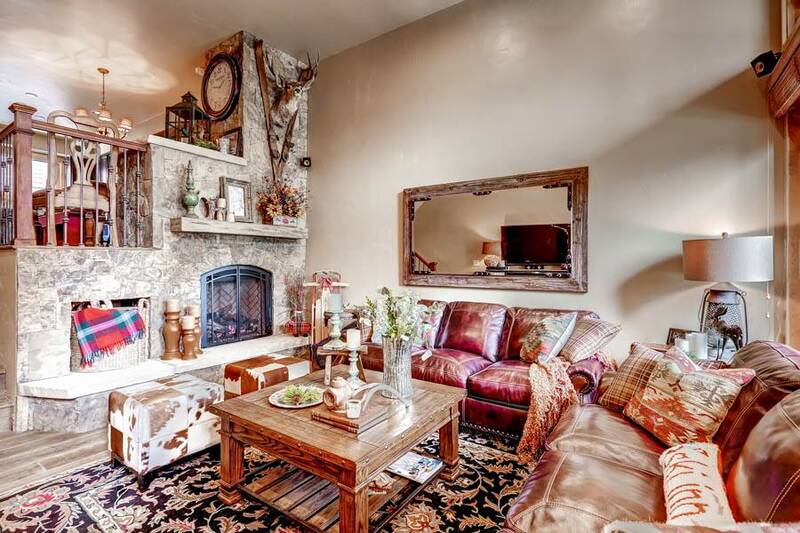 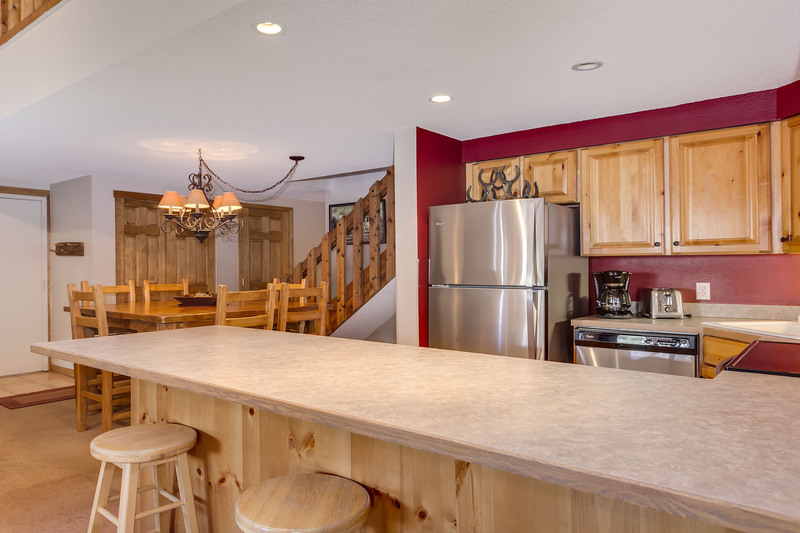 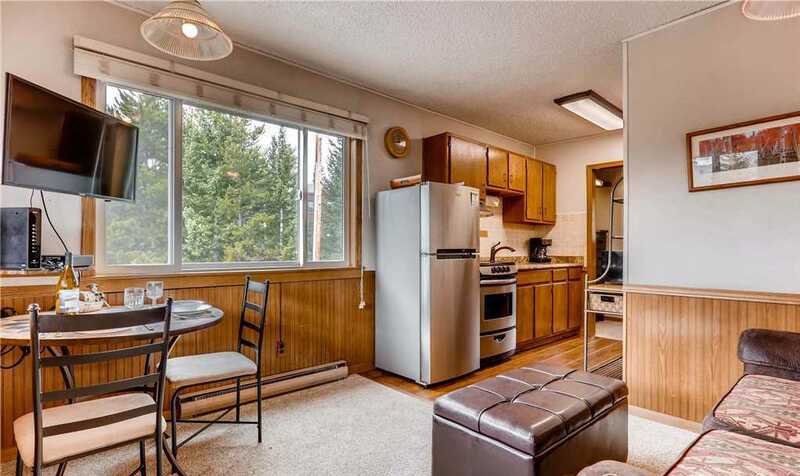 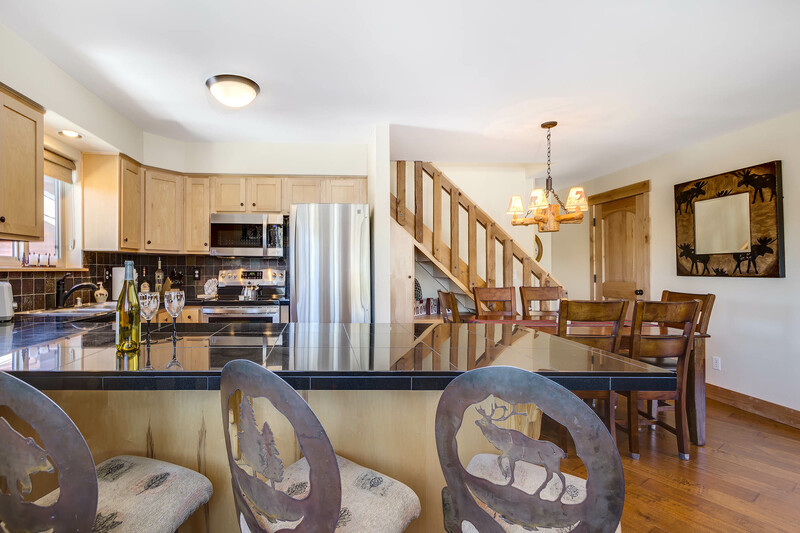 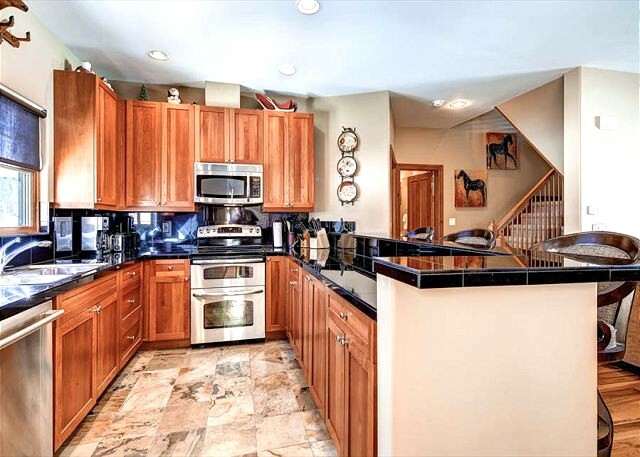 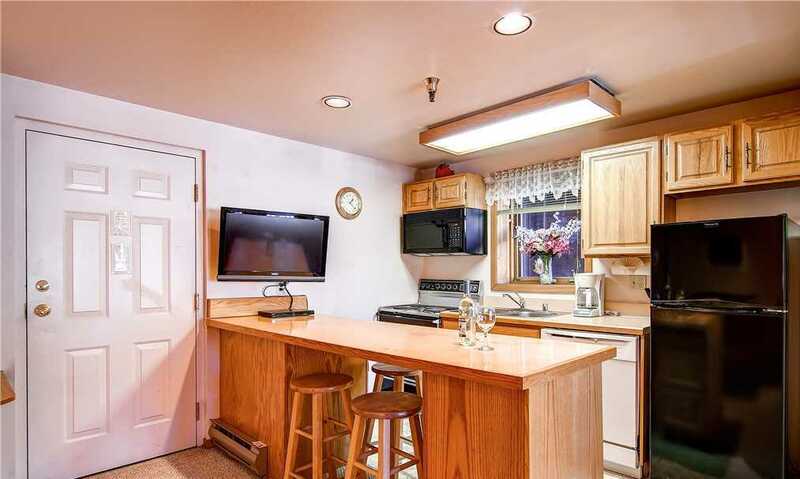 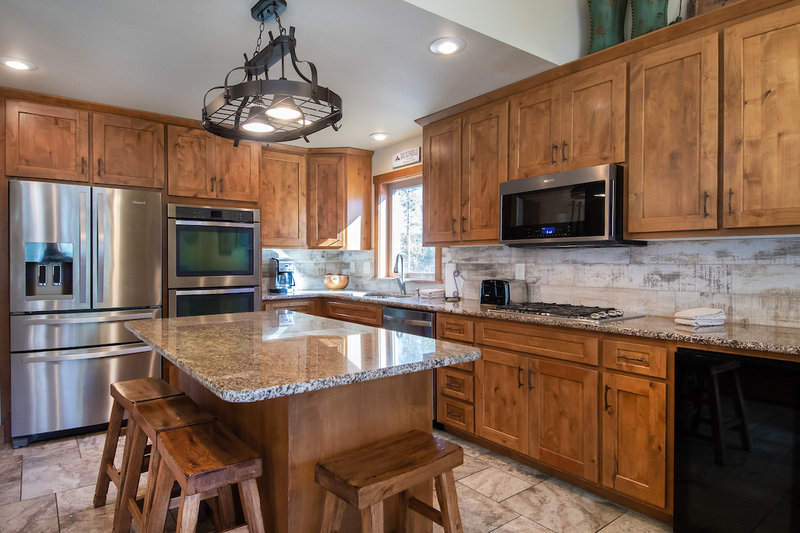 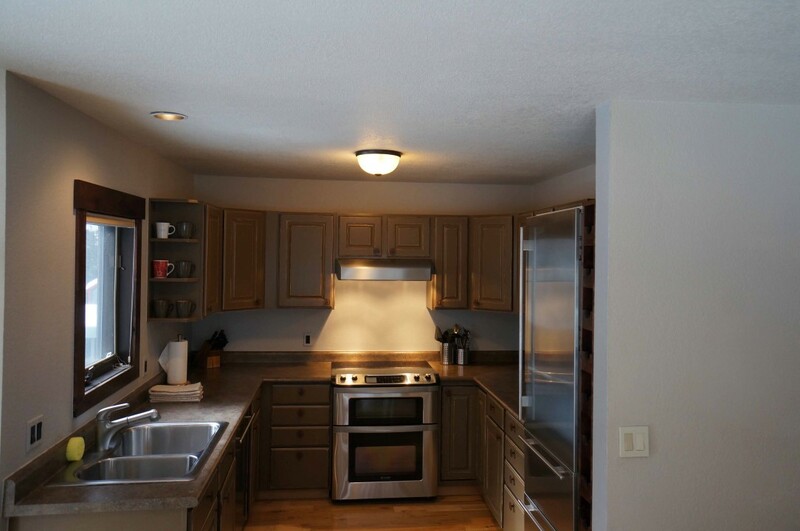 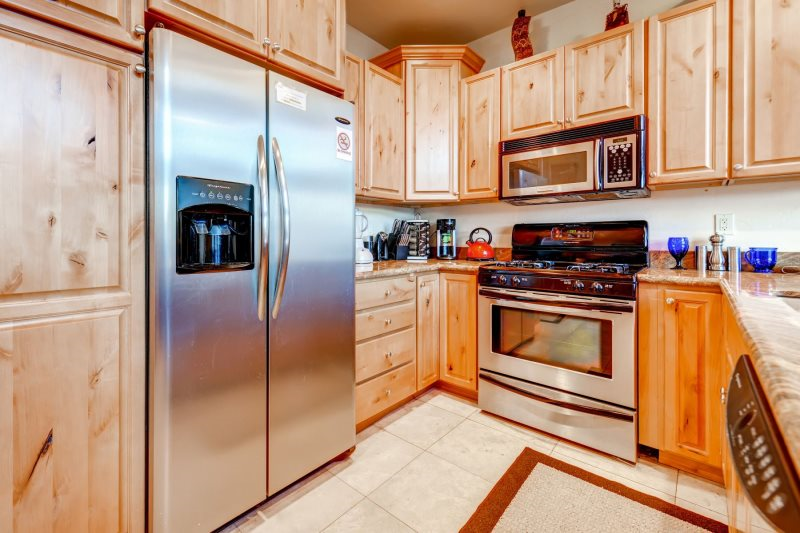 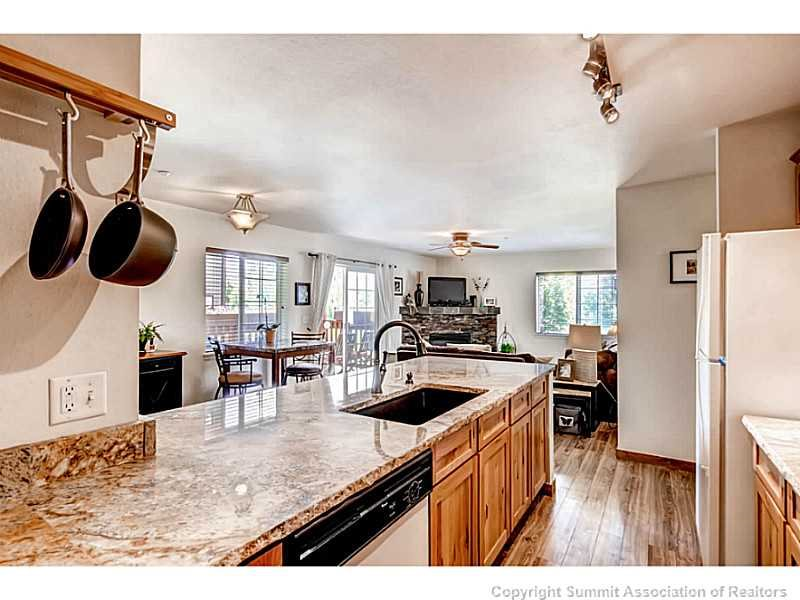 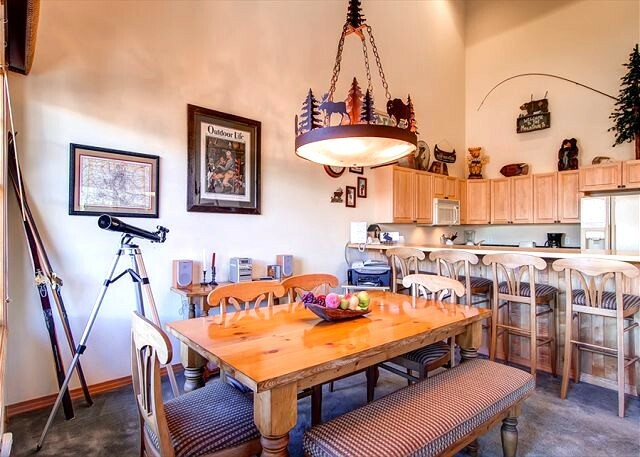 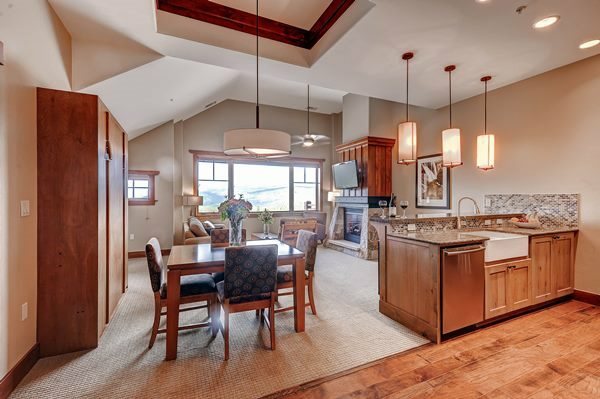 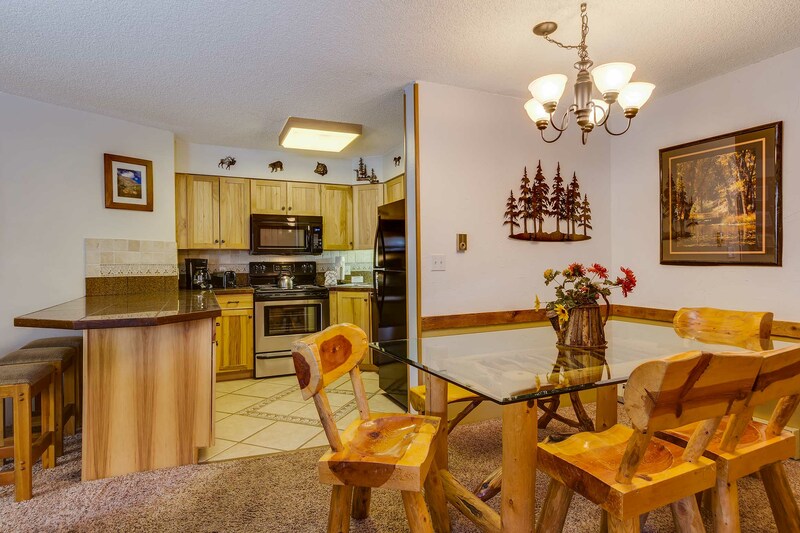 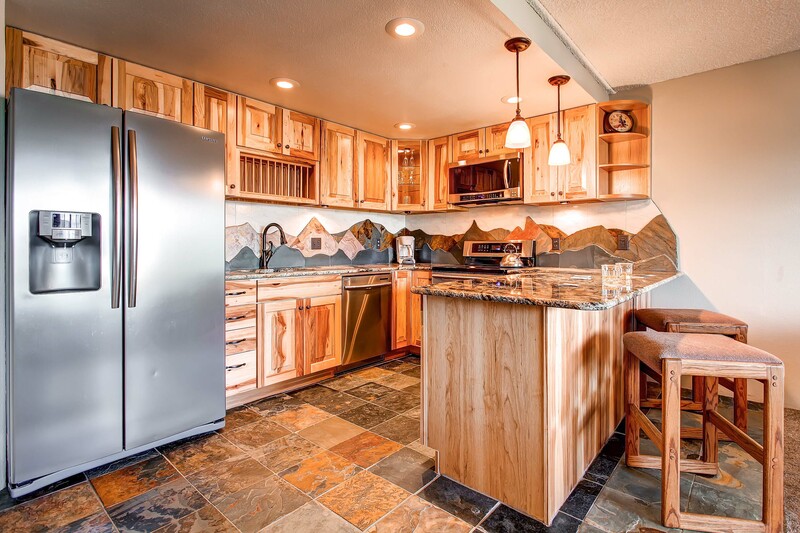 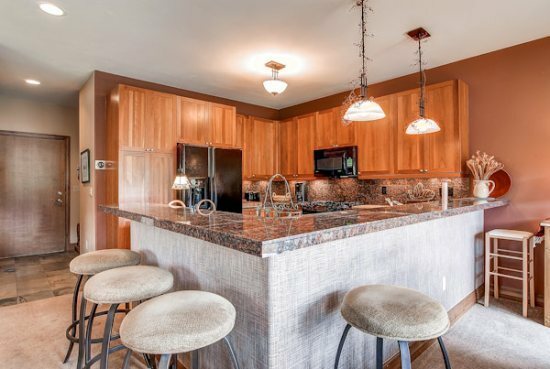 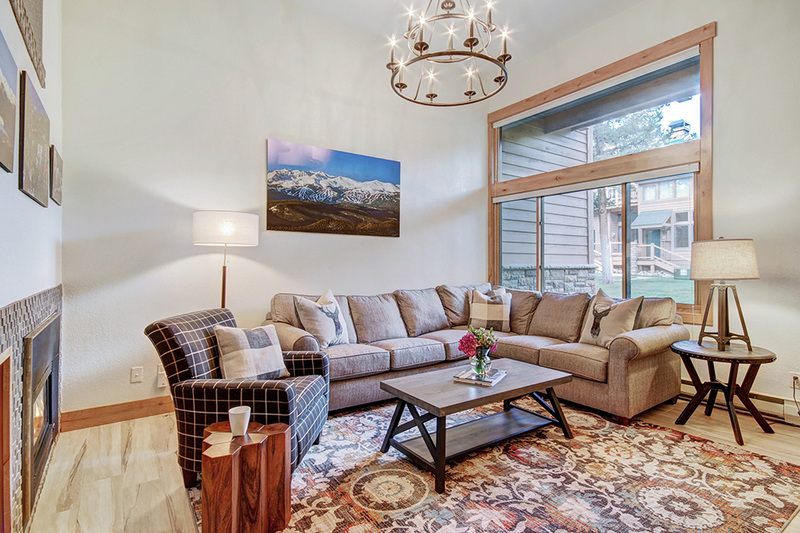 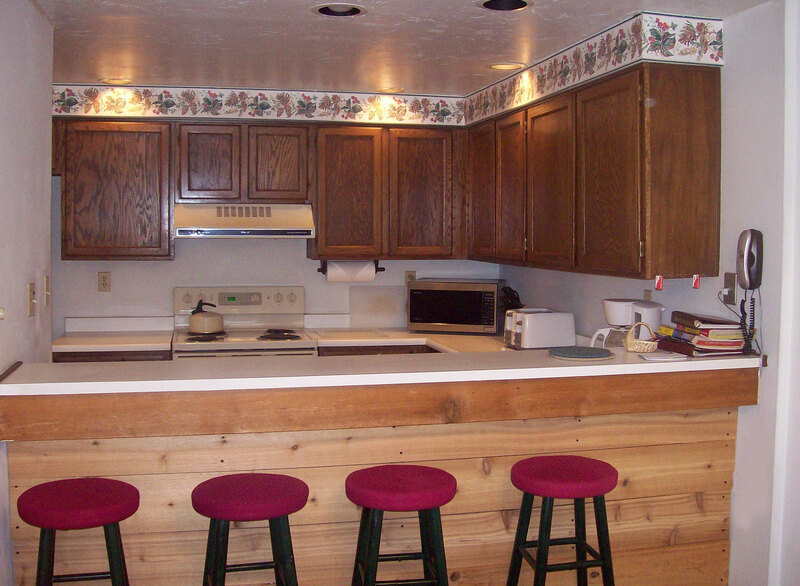 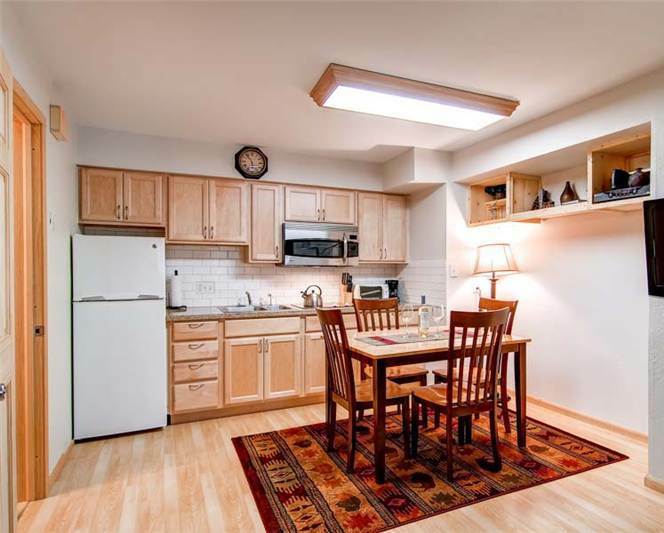 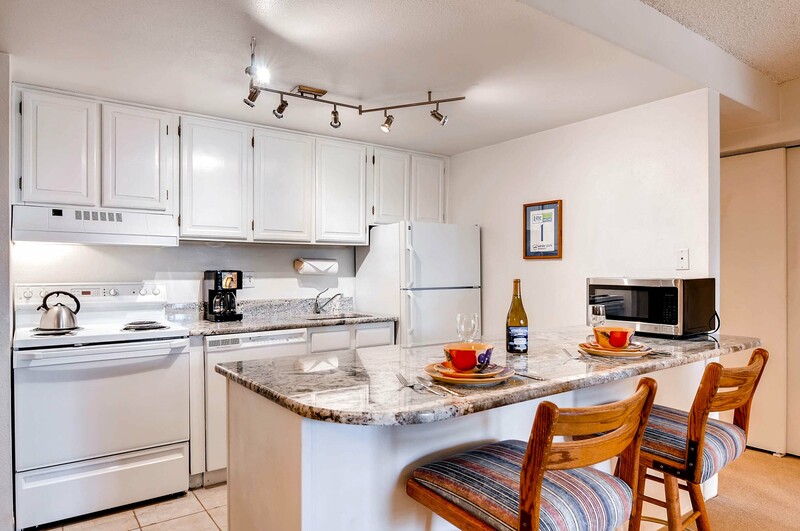 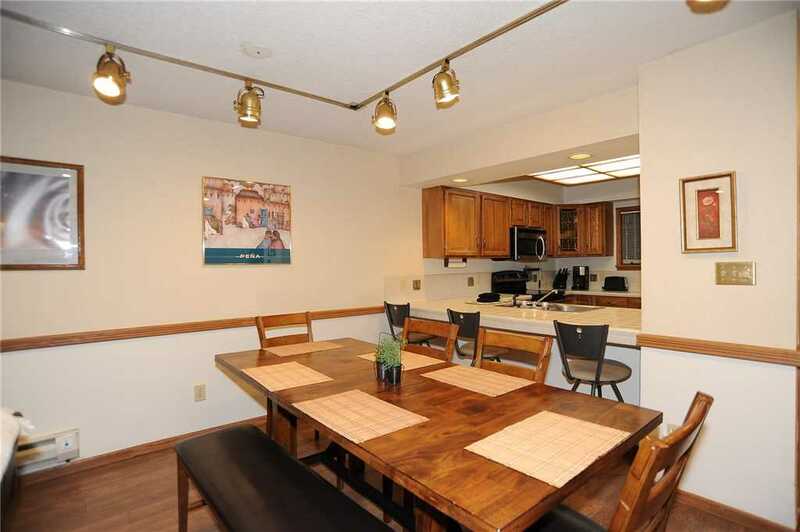 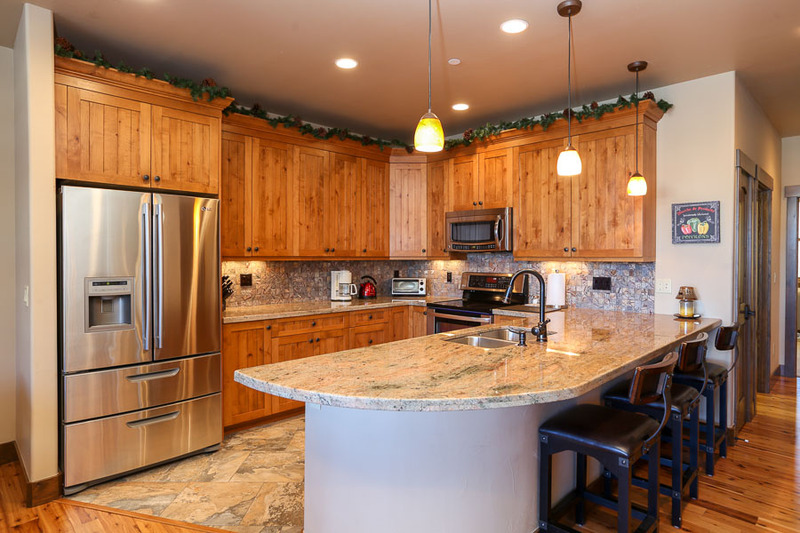 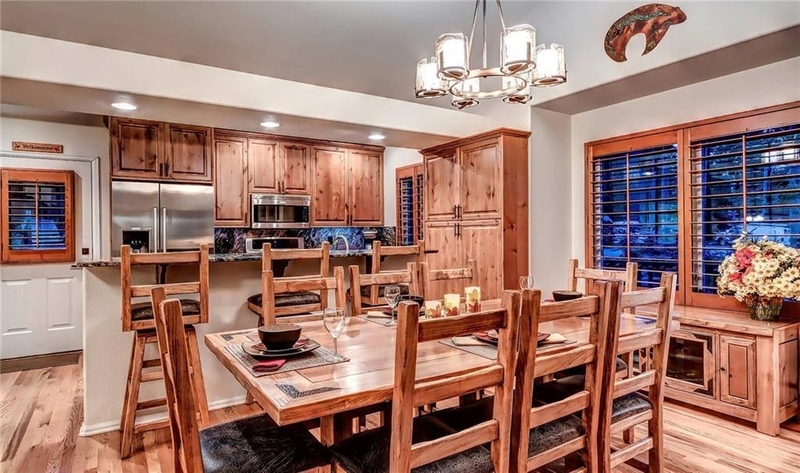 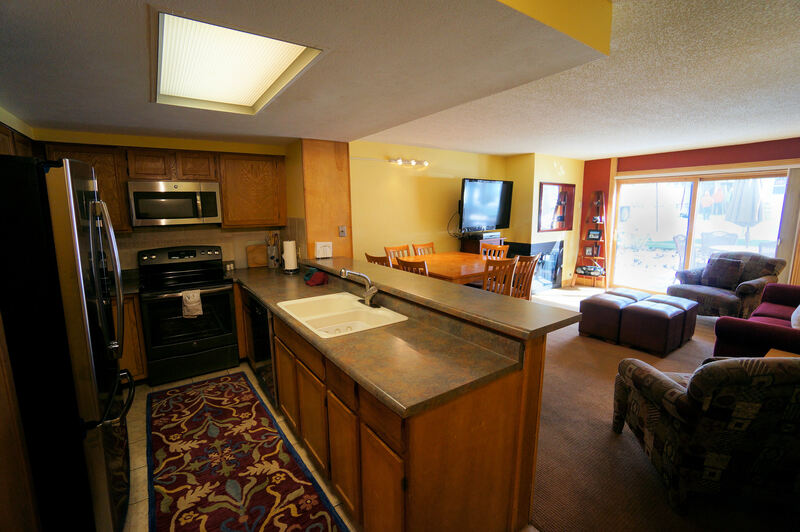 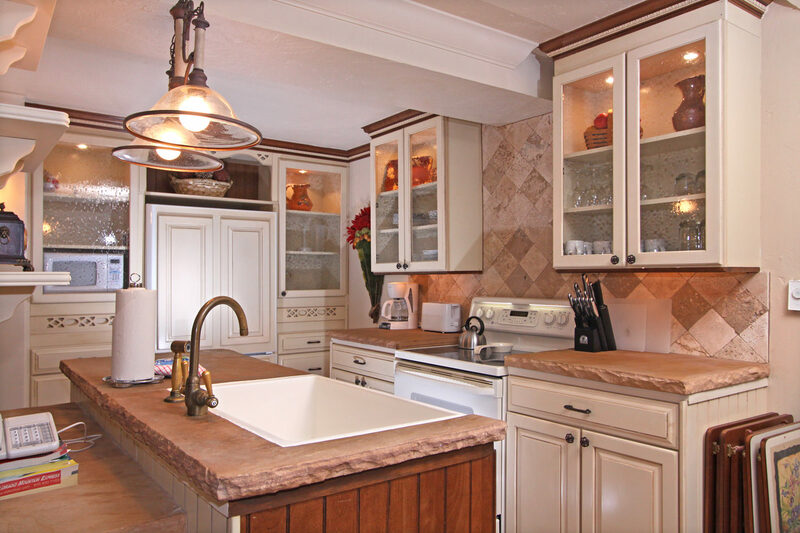 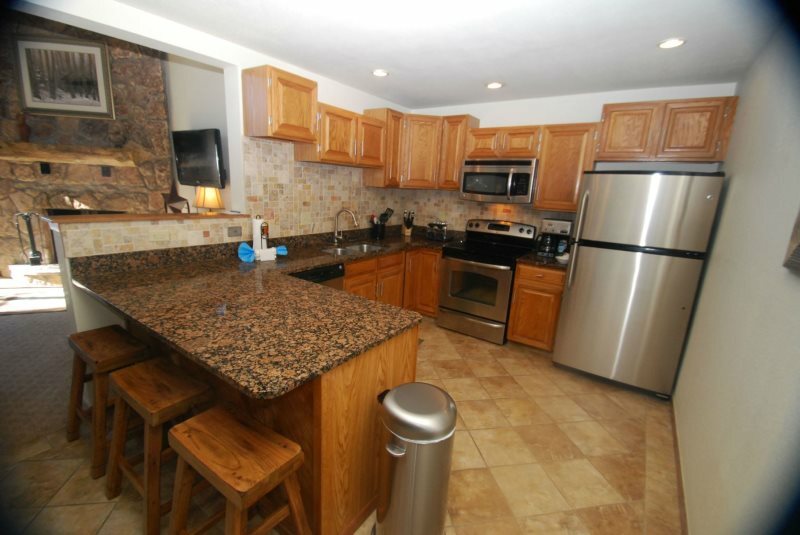 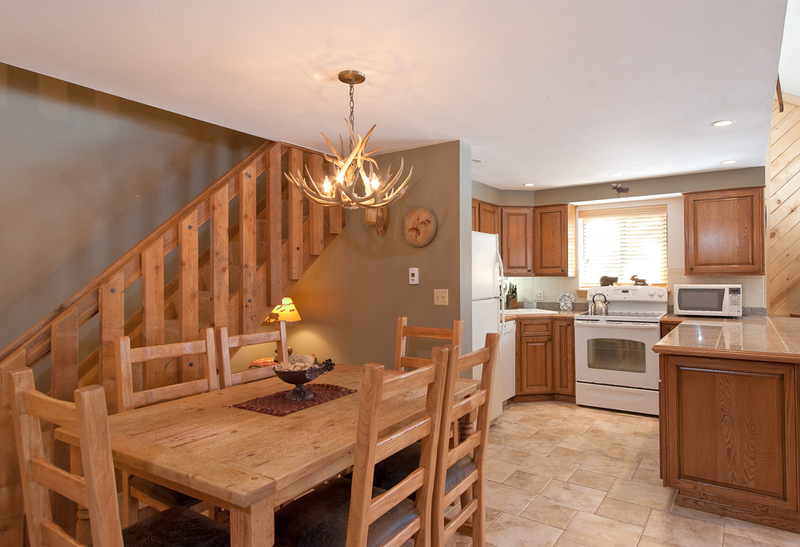 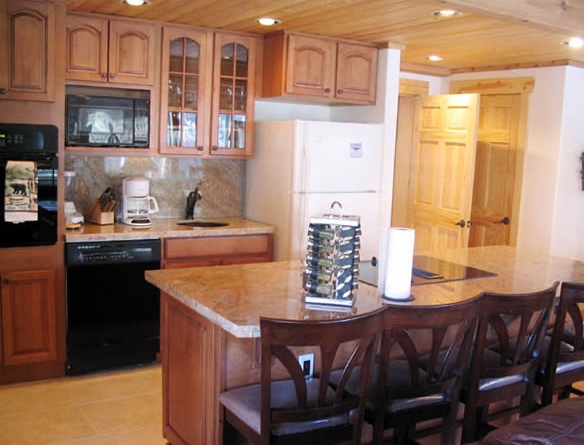 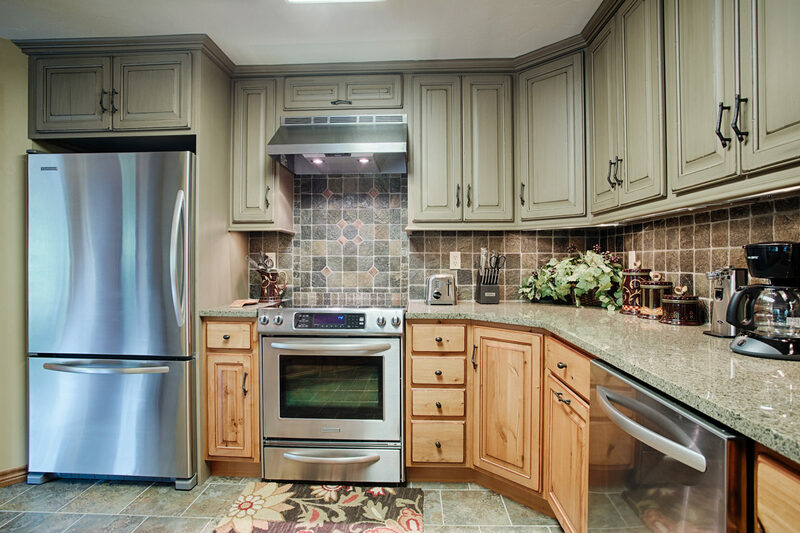 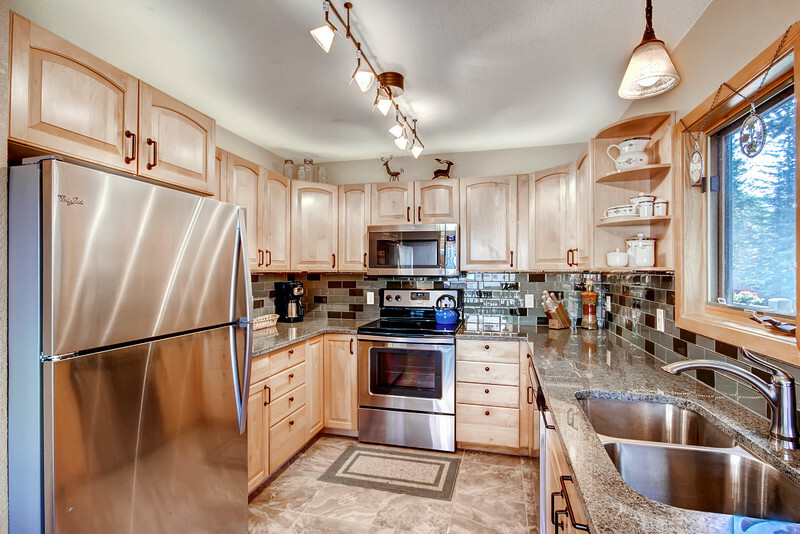 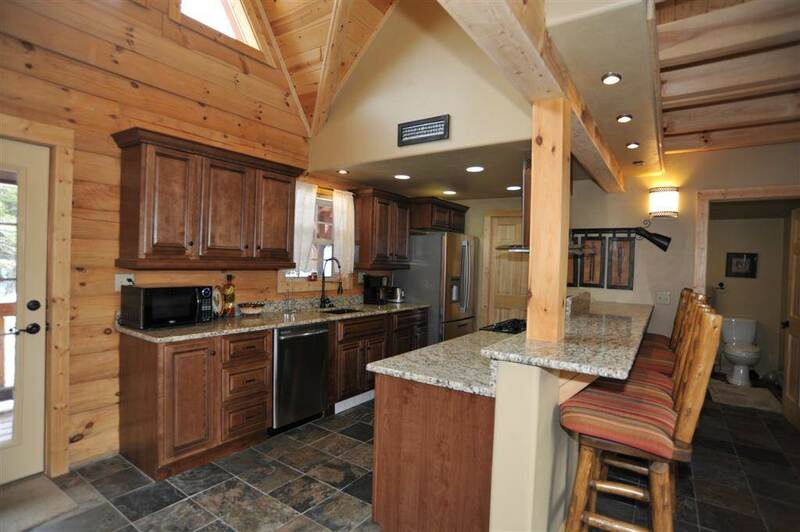 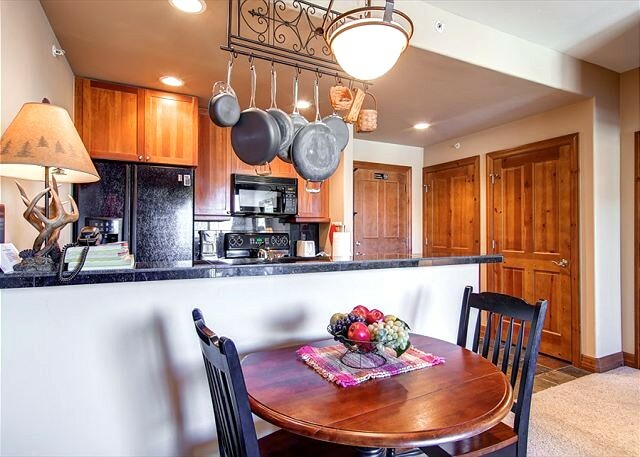 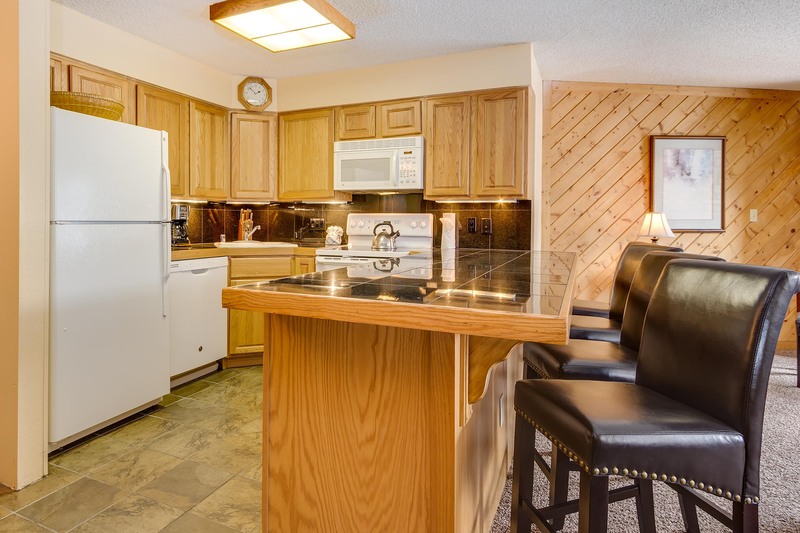 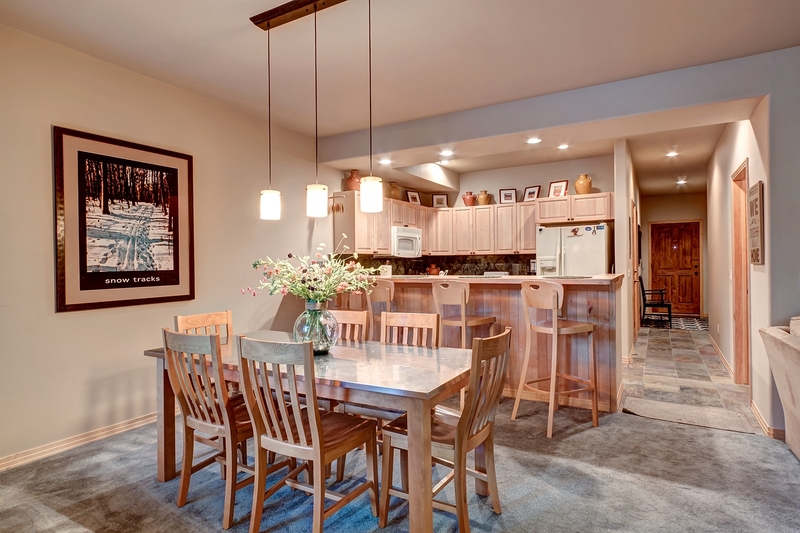 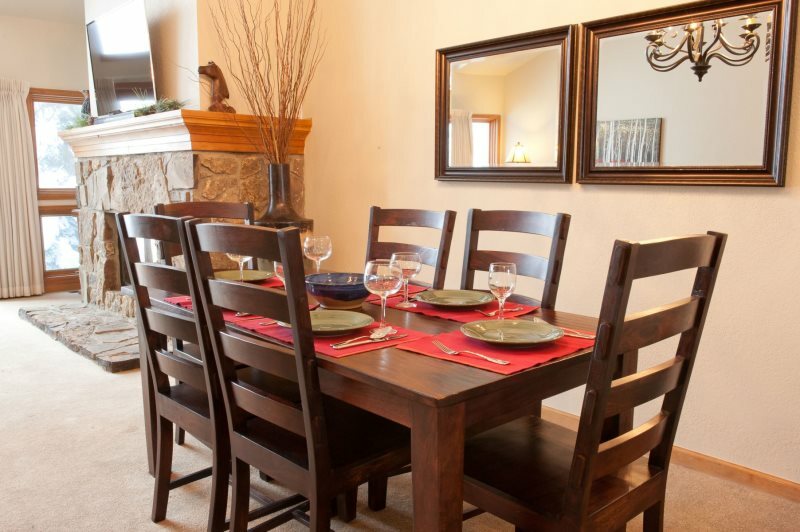 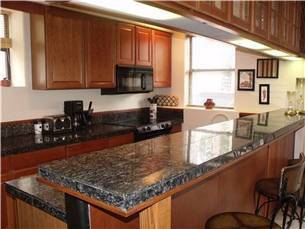 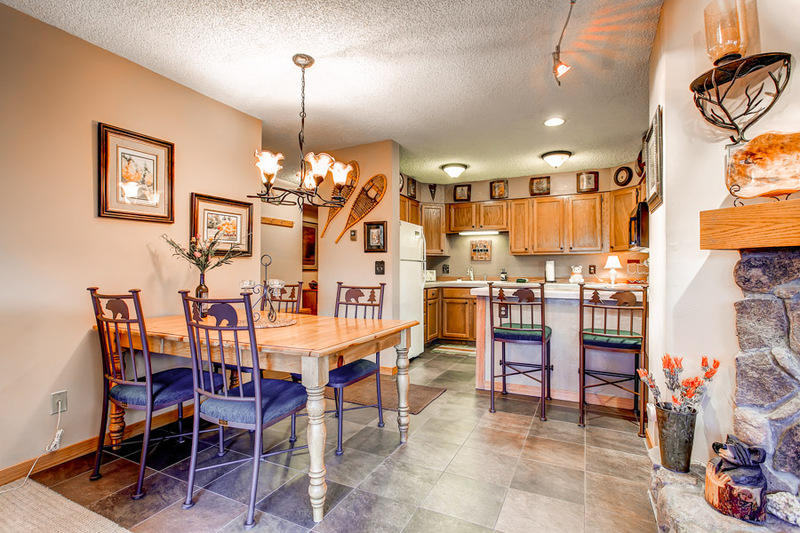 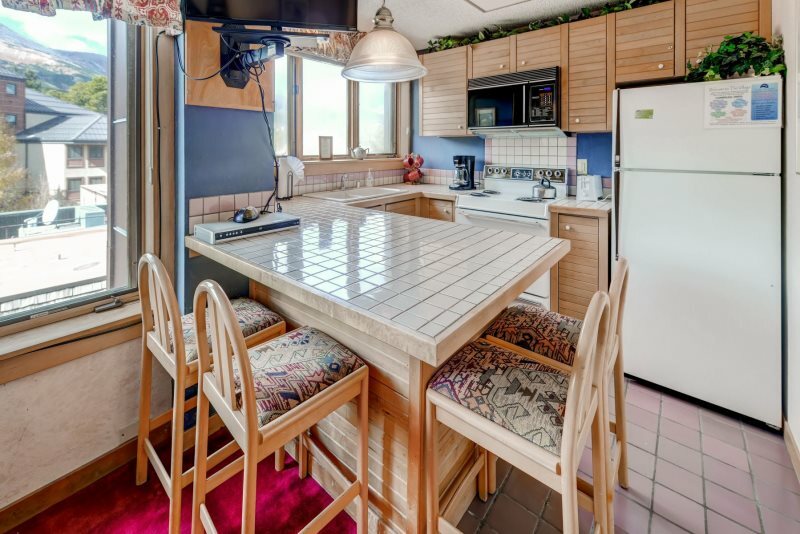 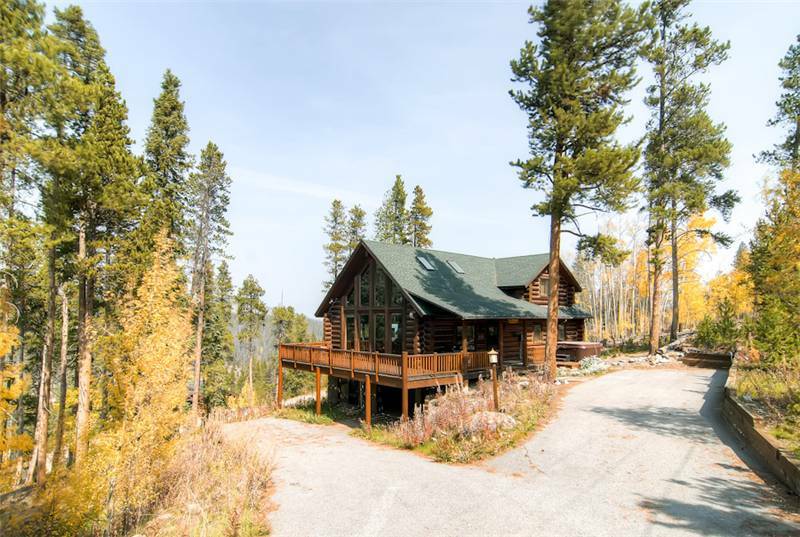 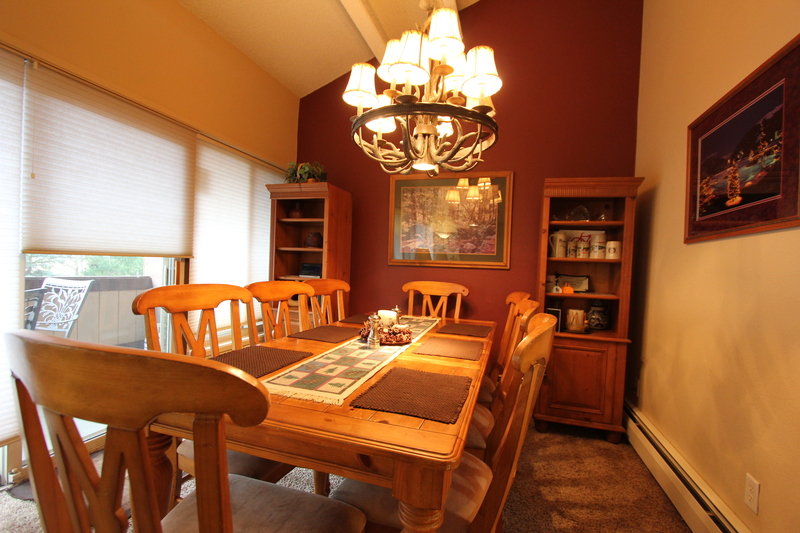 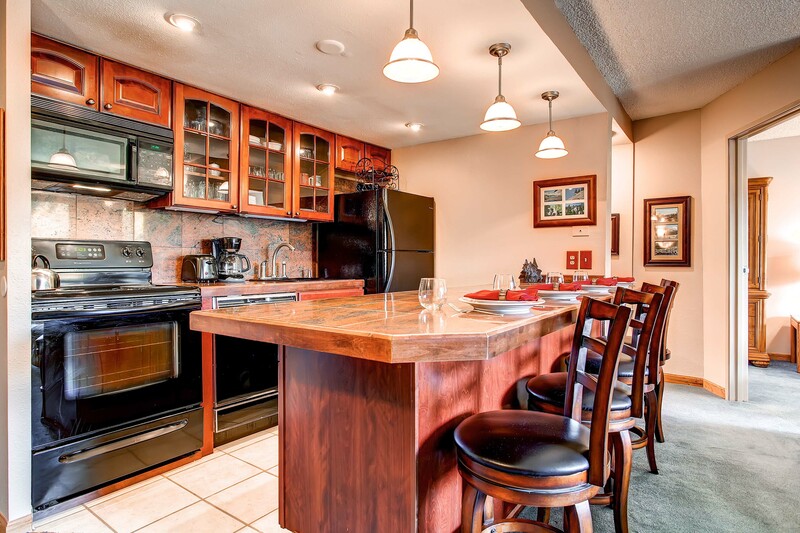 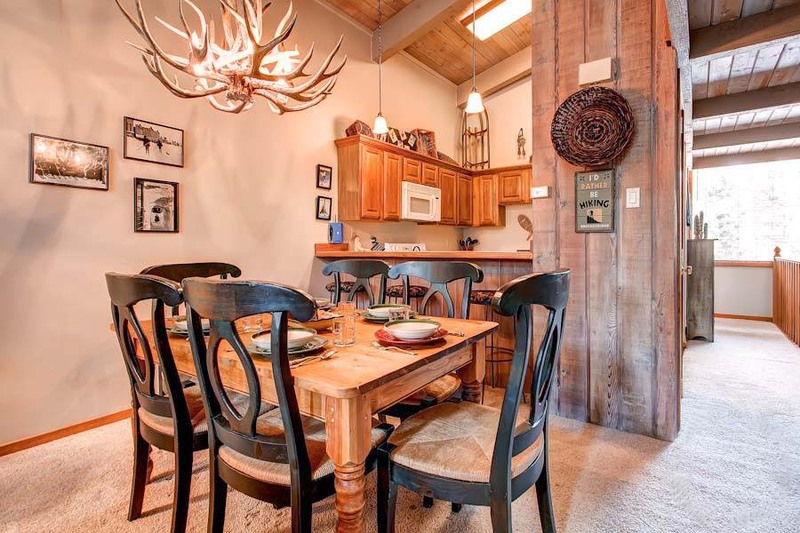 It features a fully equipped kitchen with stainless steel appliances, granite tile counts, and a rustic, mountain inspired dining table. 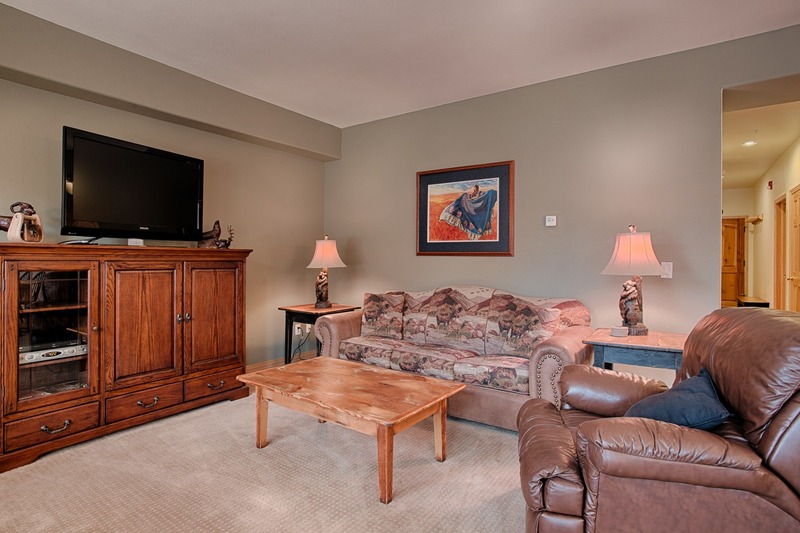 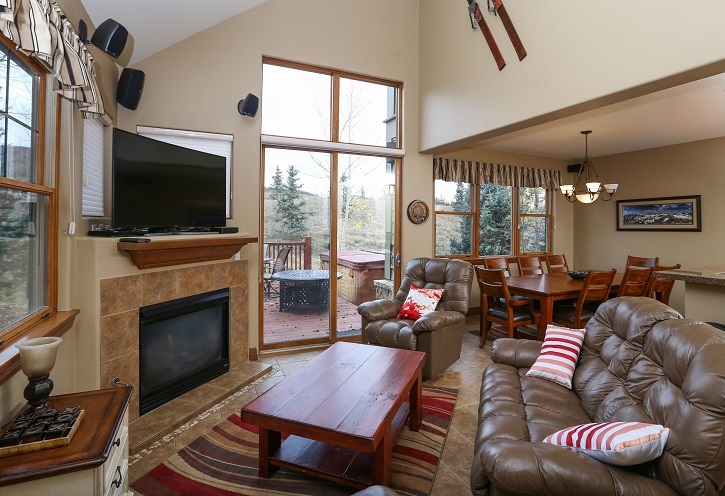 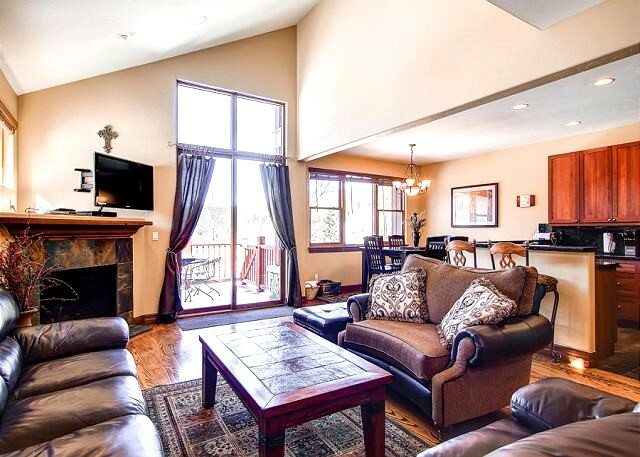 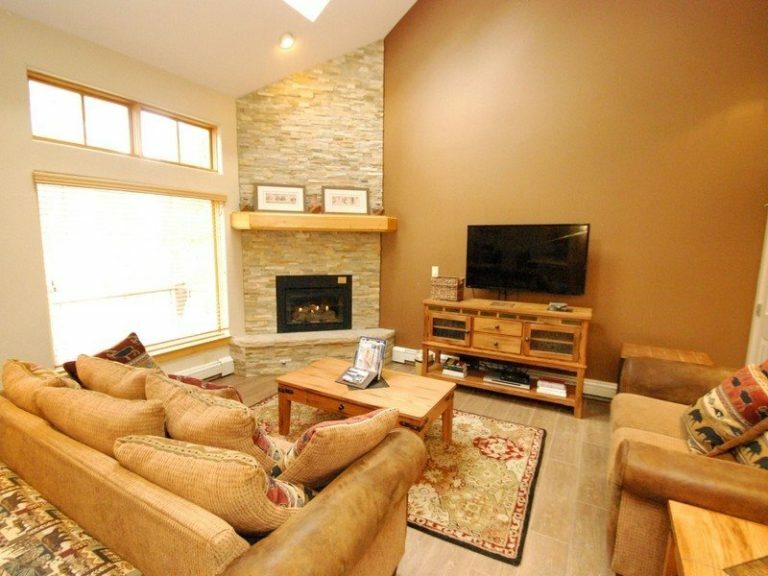 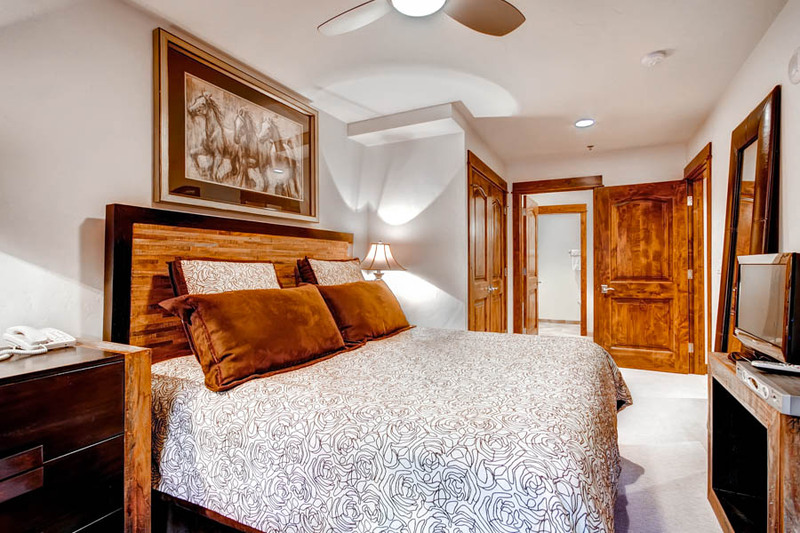 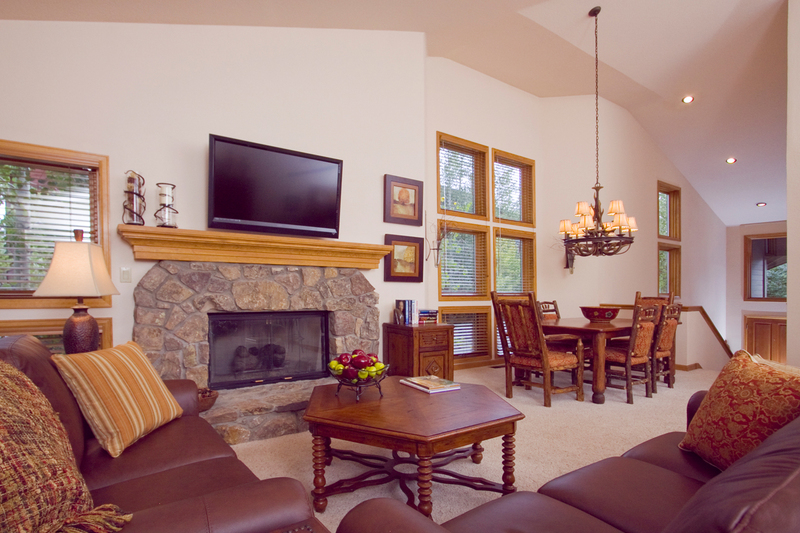 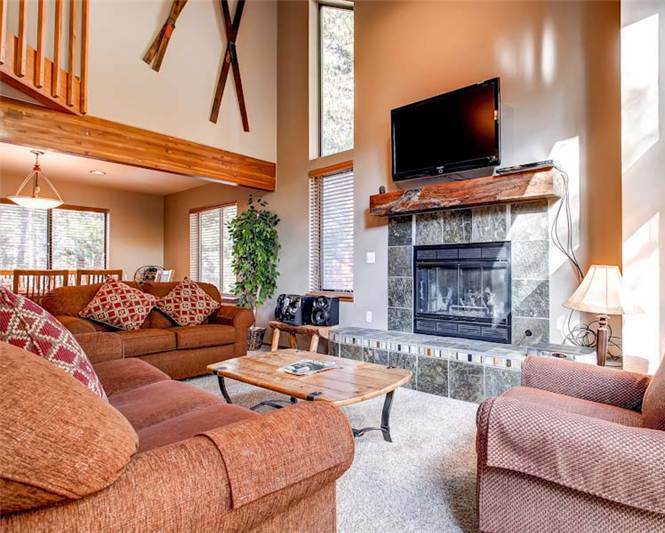 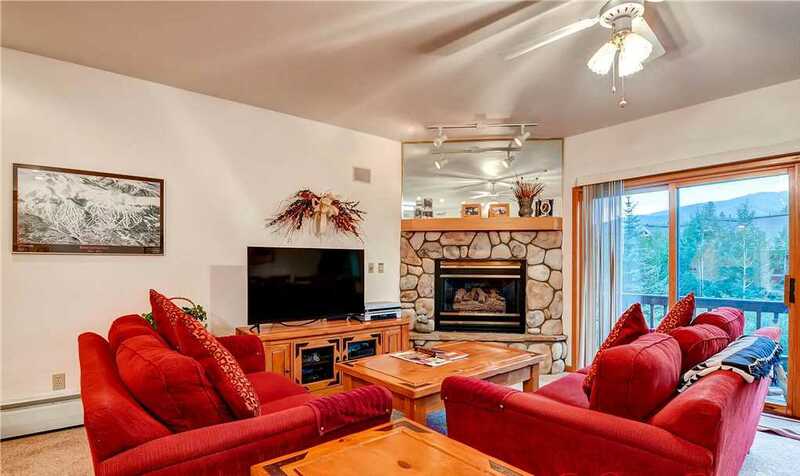 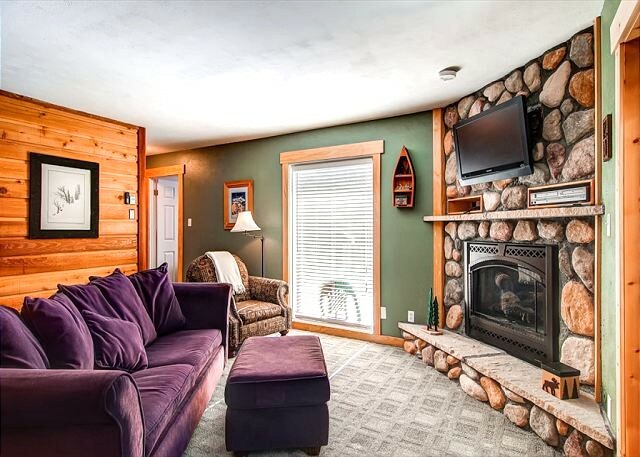 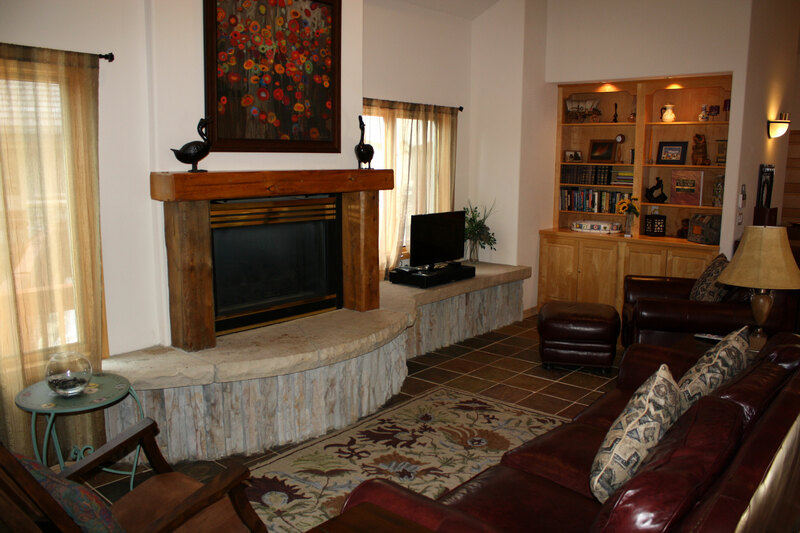 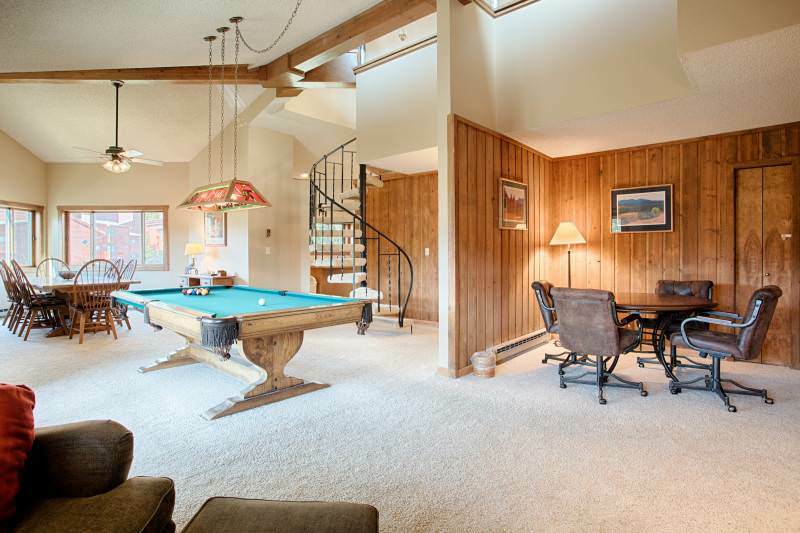 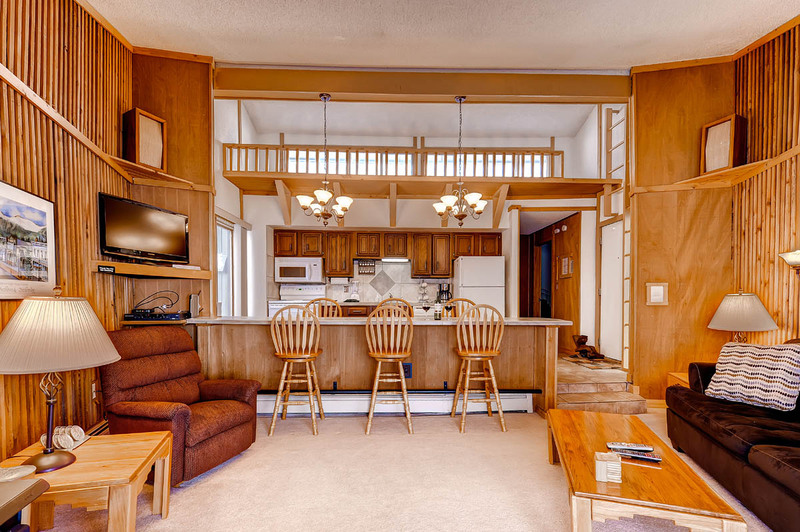 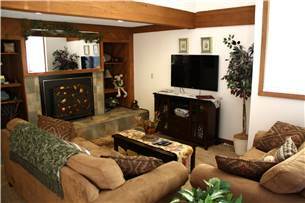 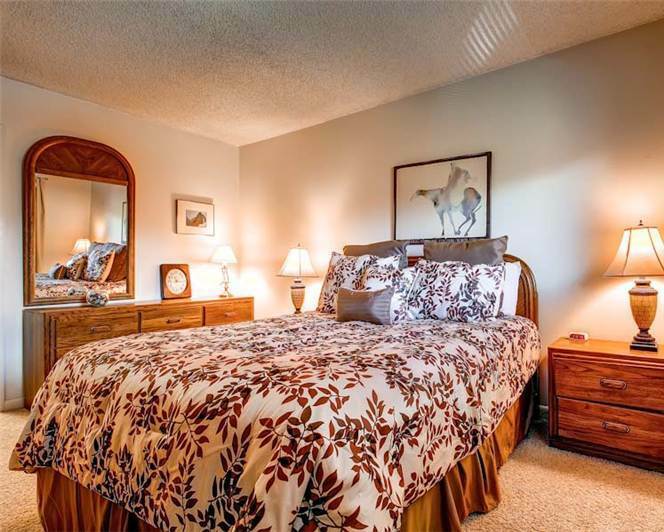 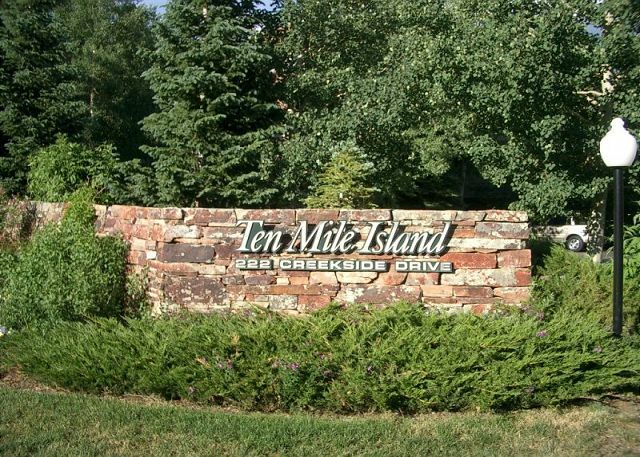 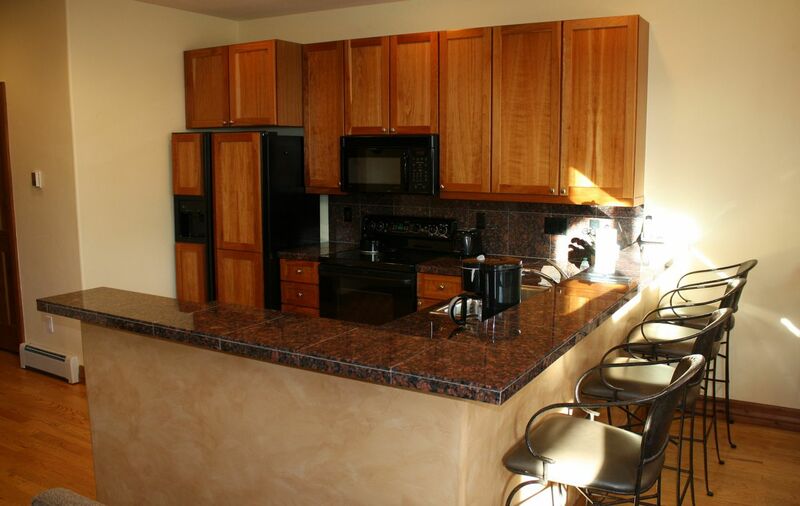 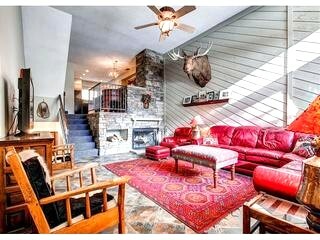 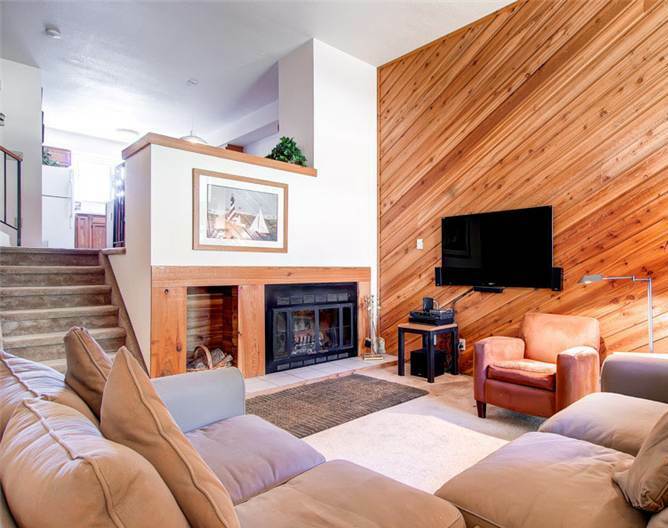 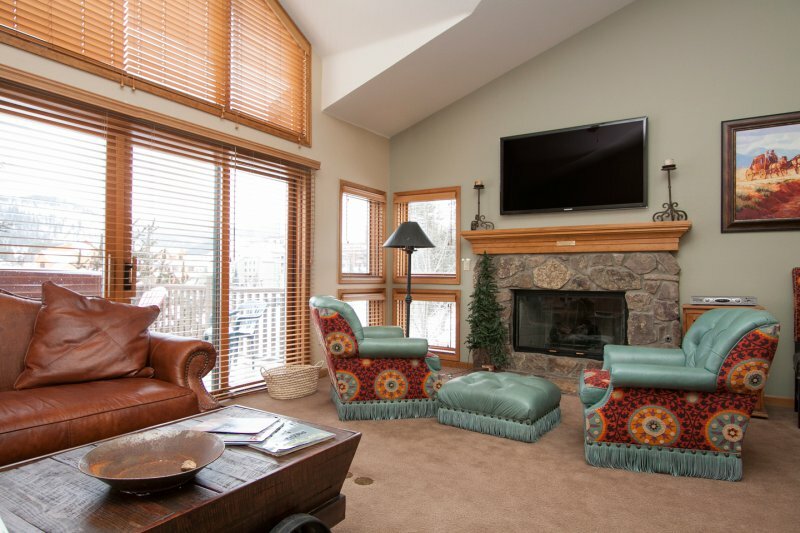 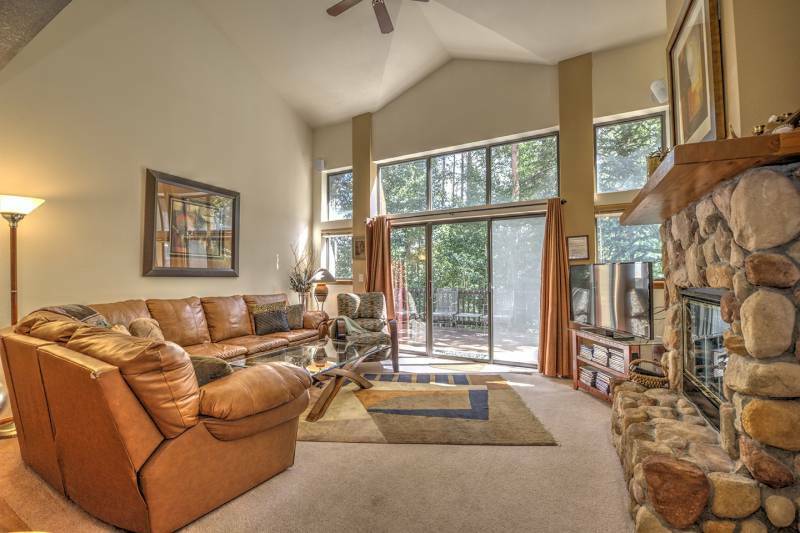 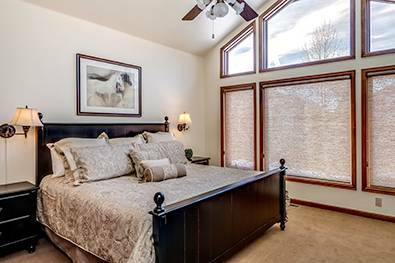 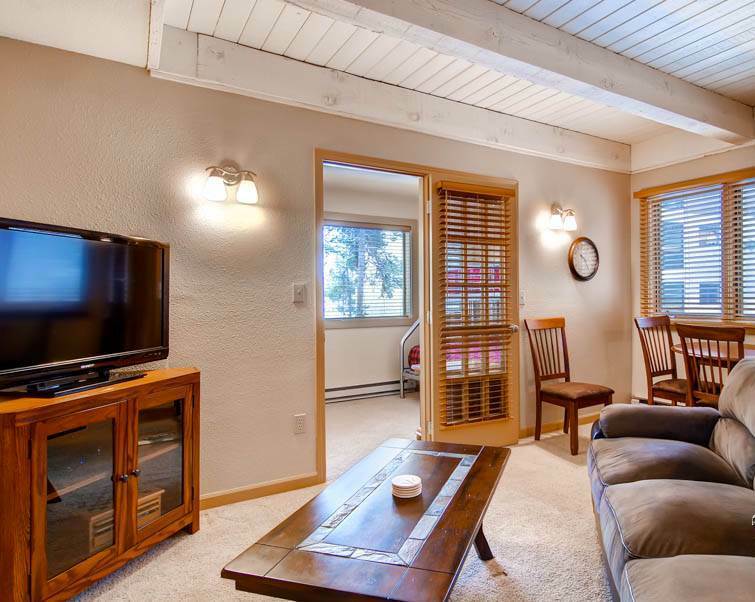 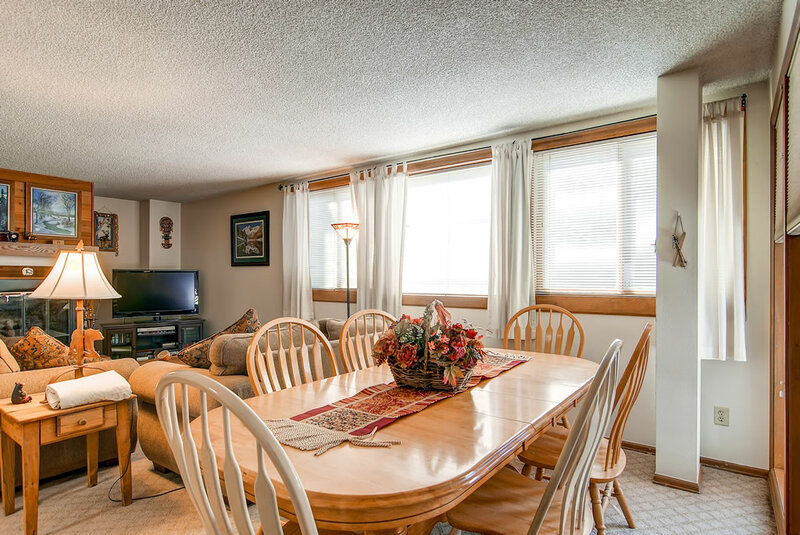 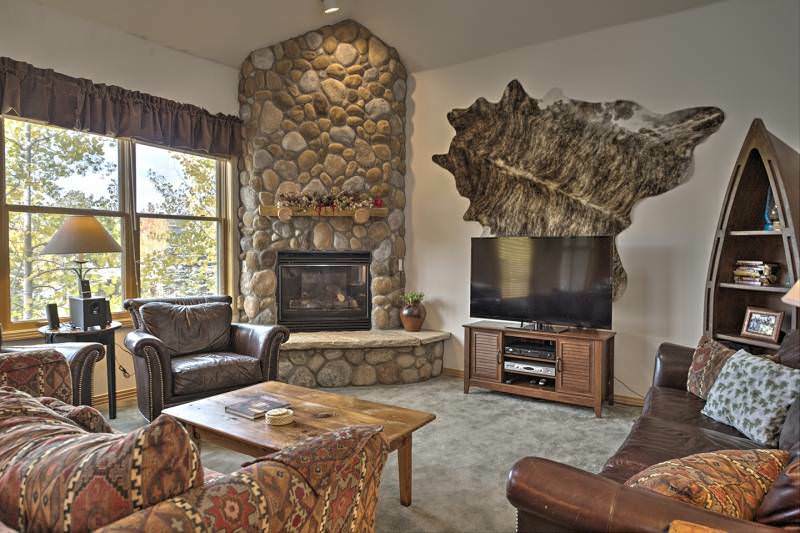 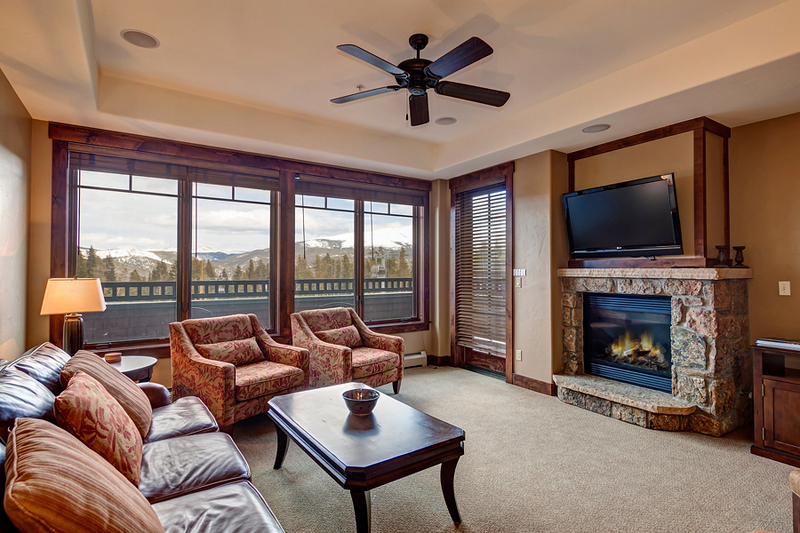 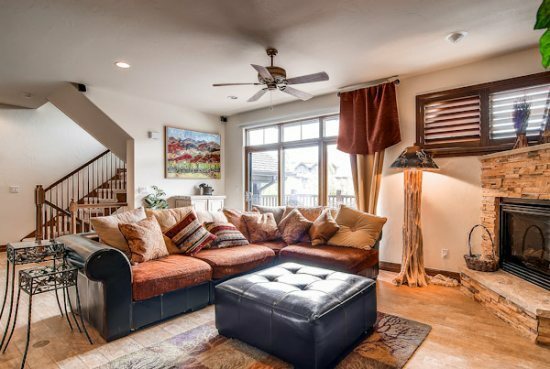 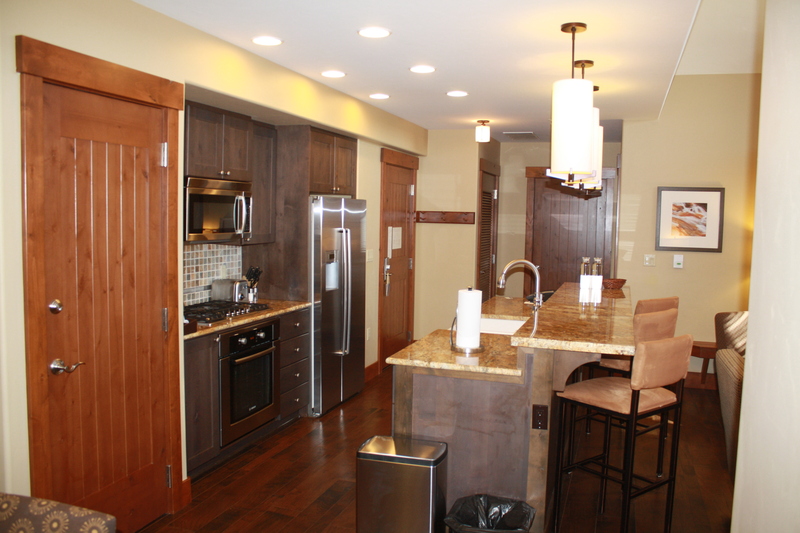 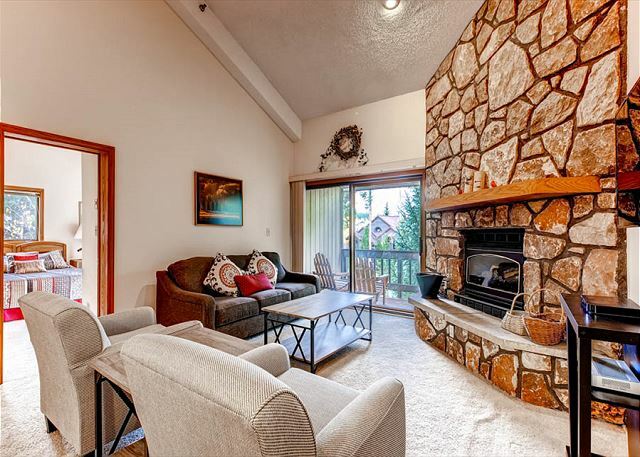 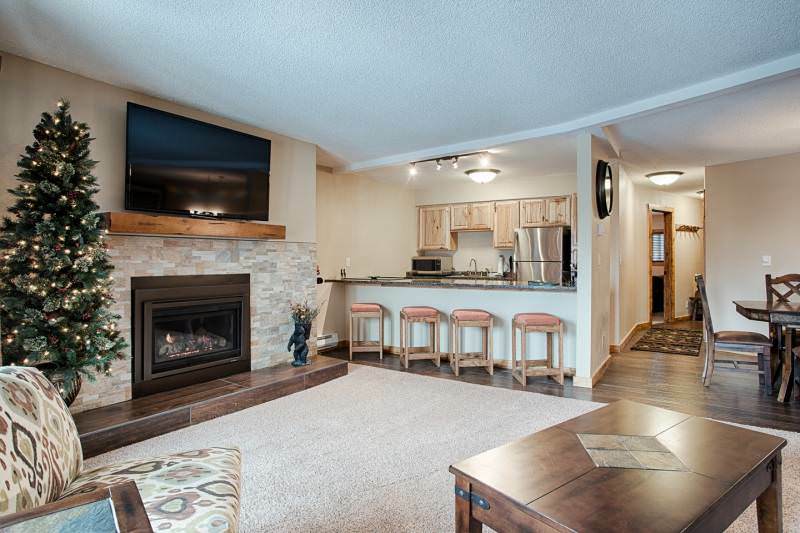 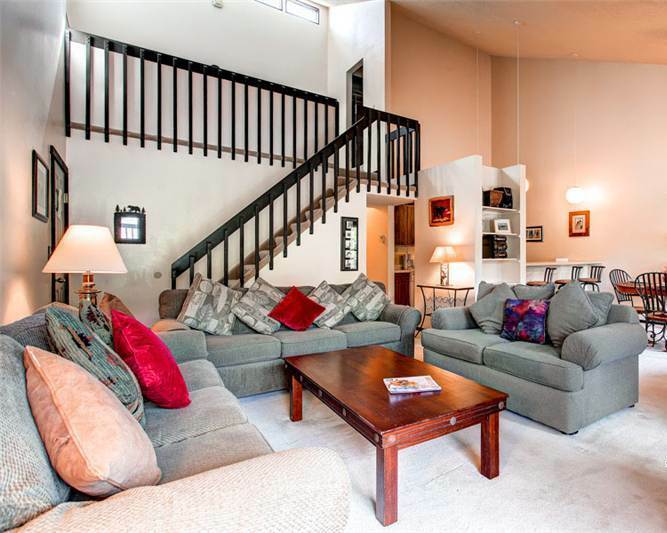 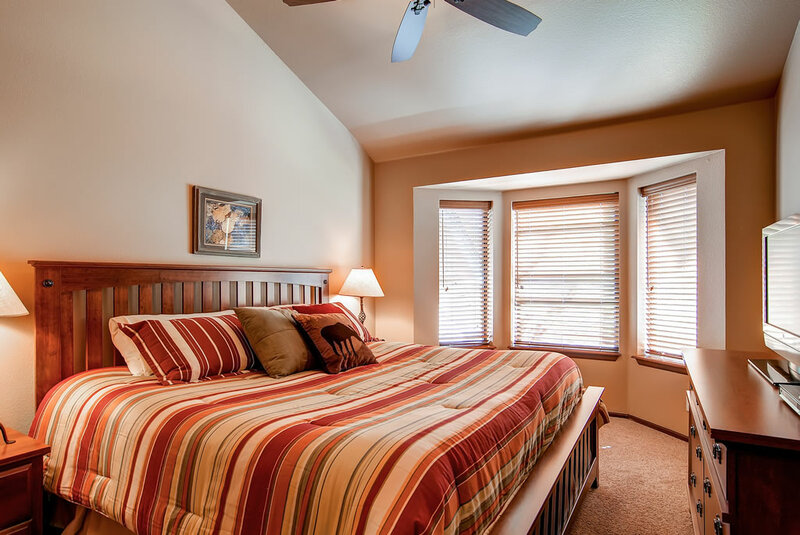 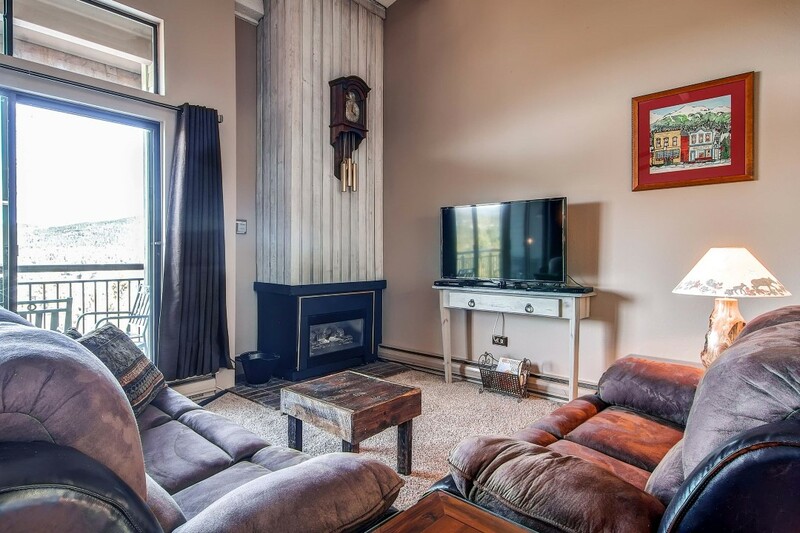 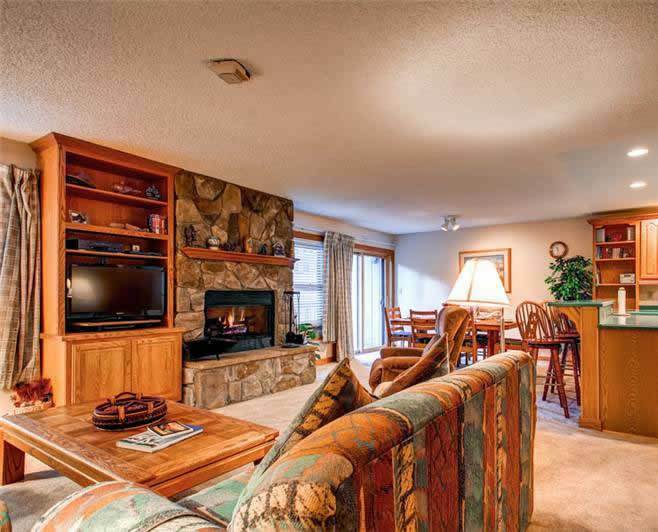 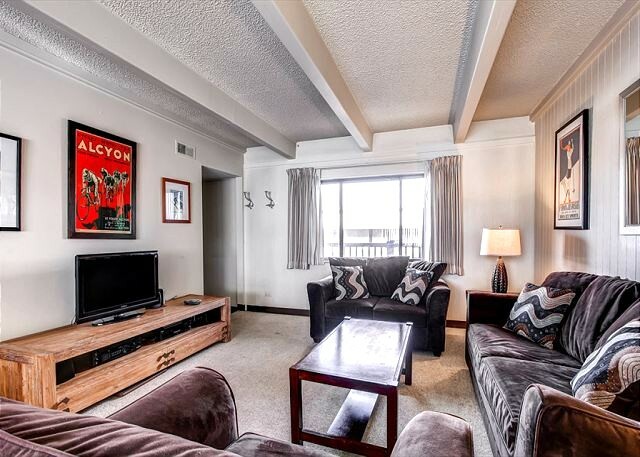 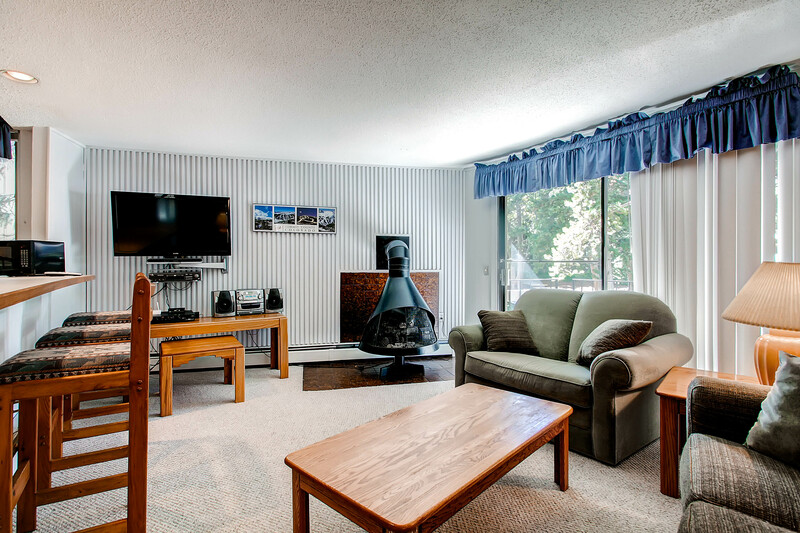 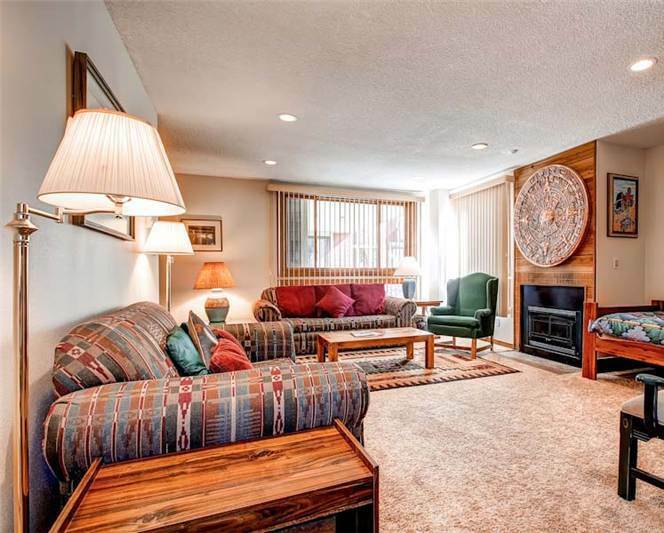 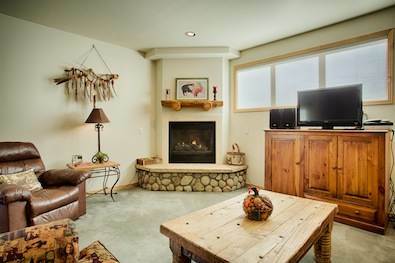 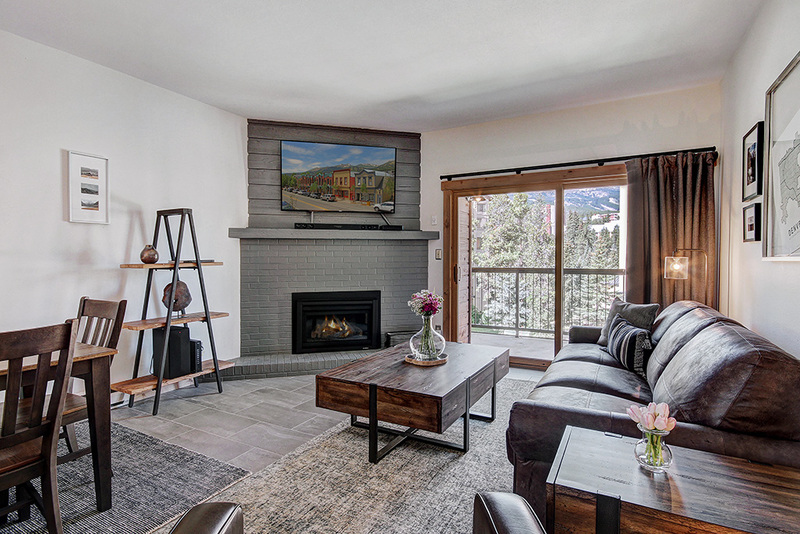 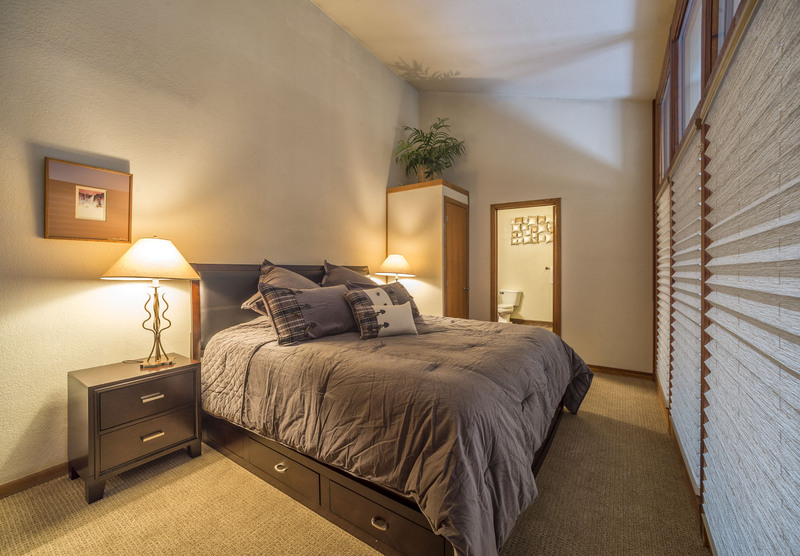 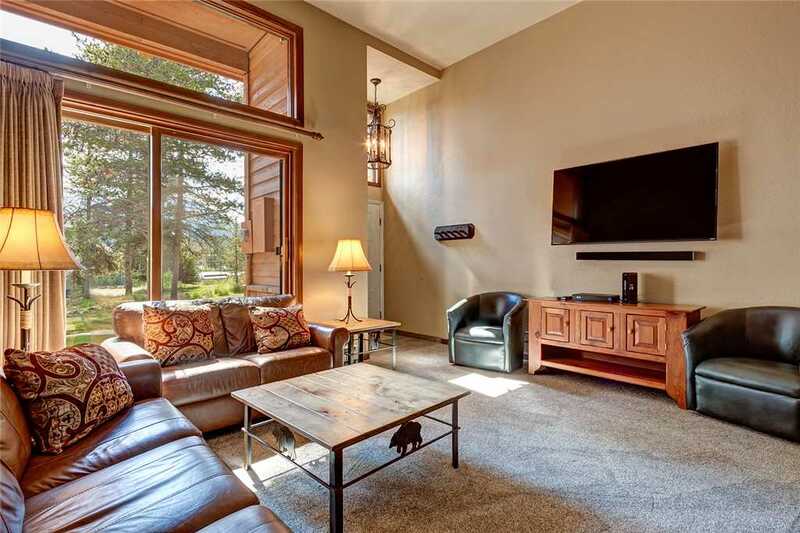 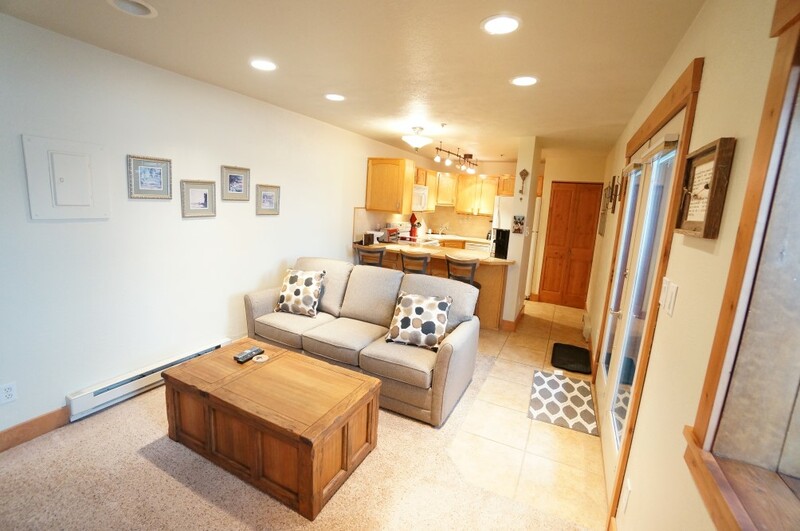 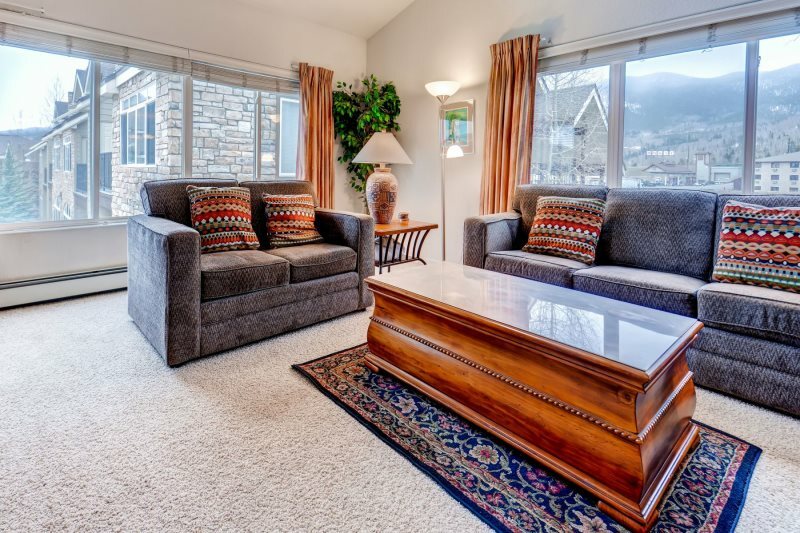 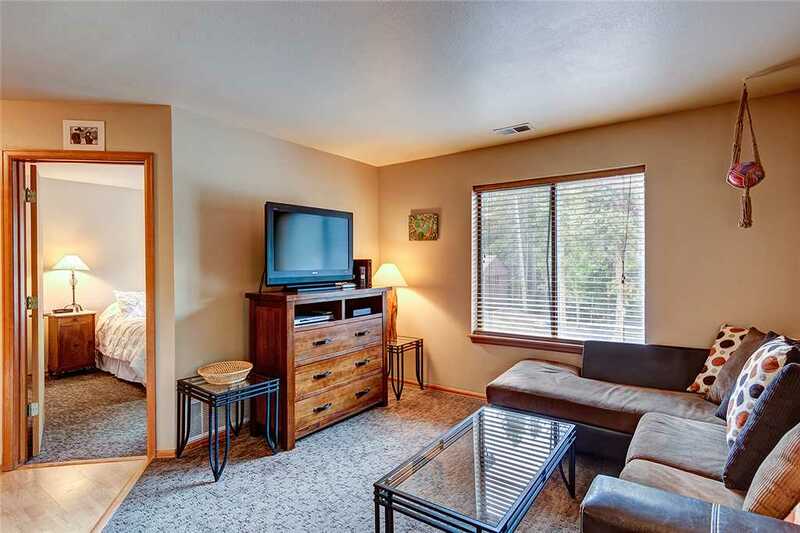 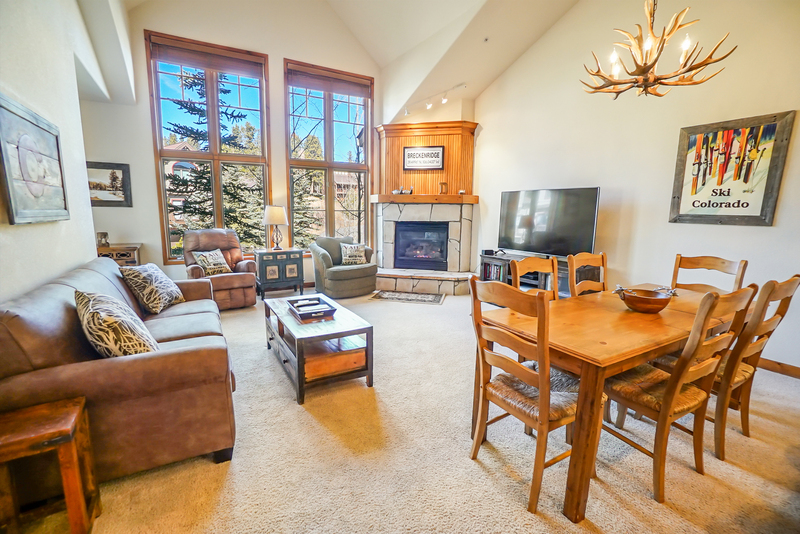 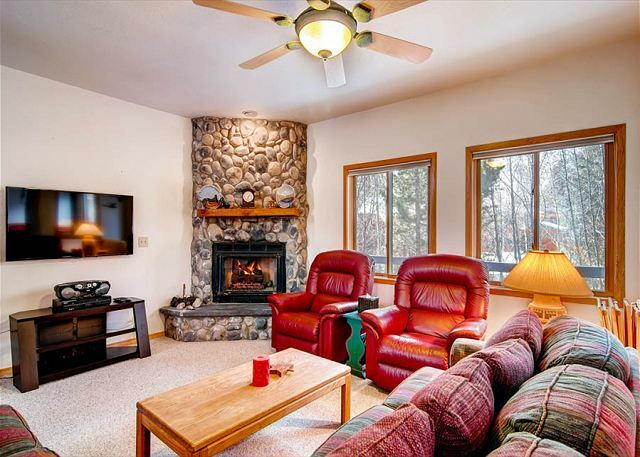 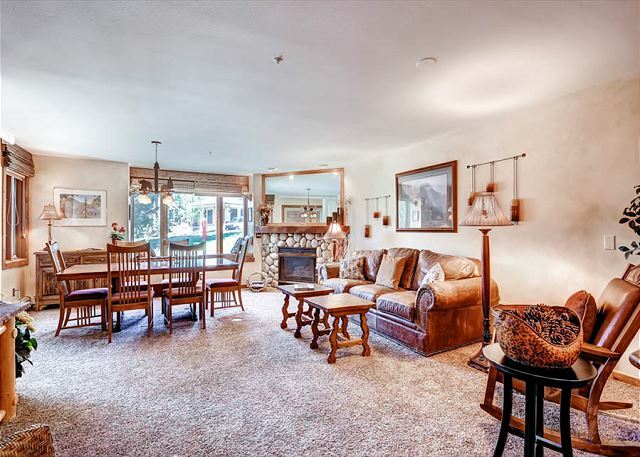 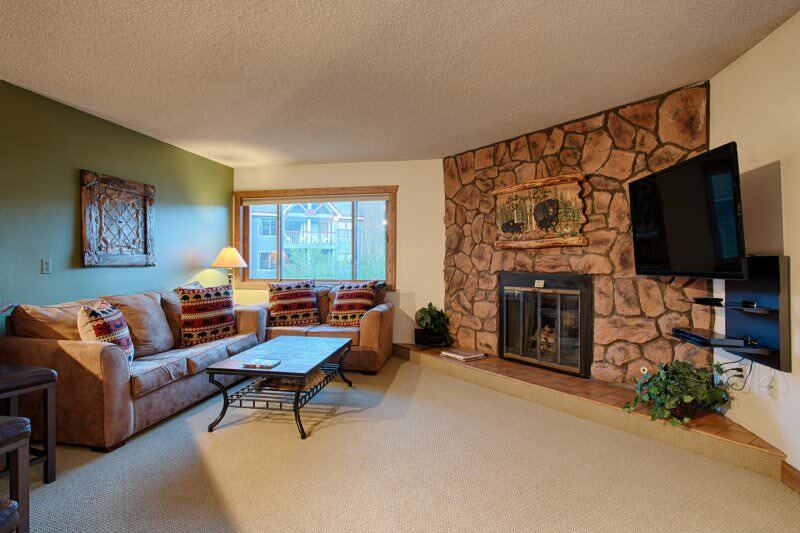 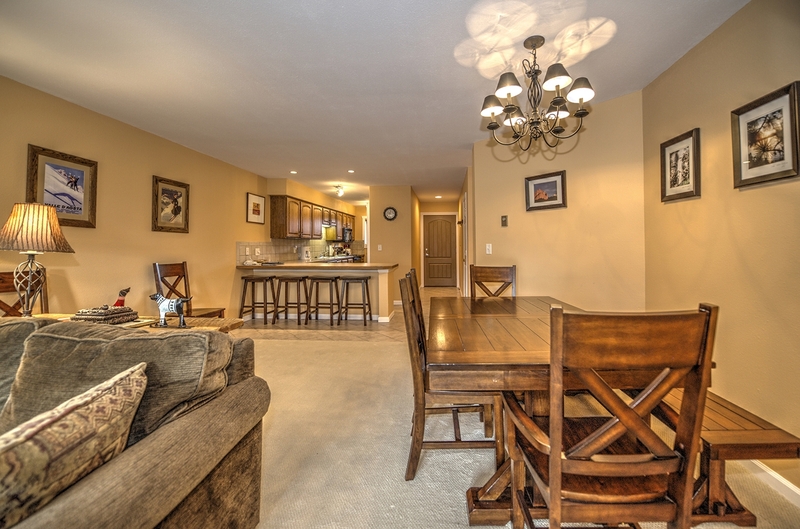 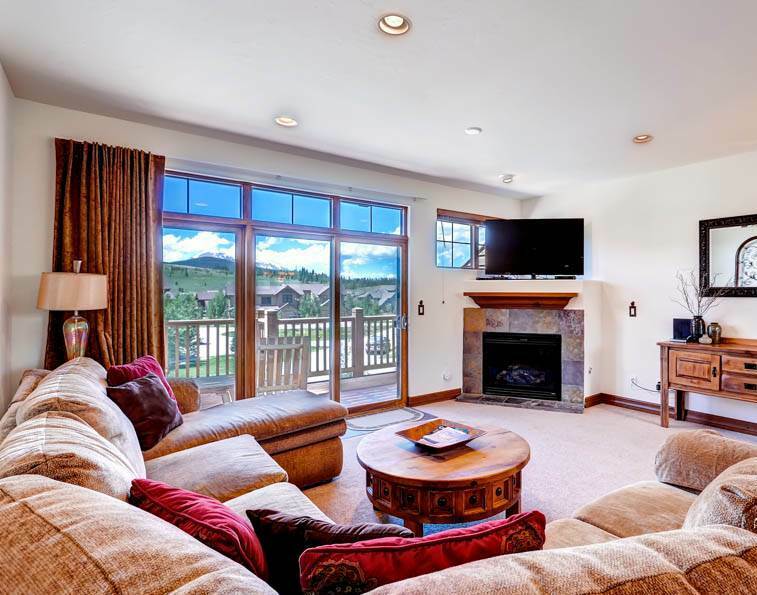 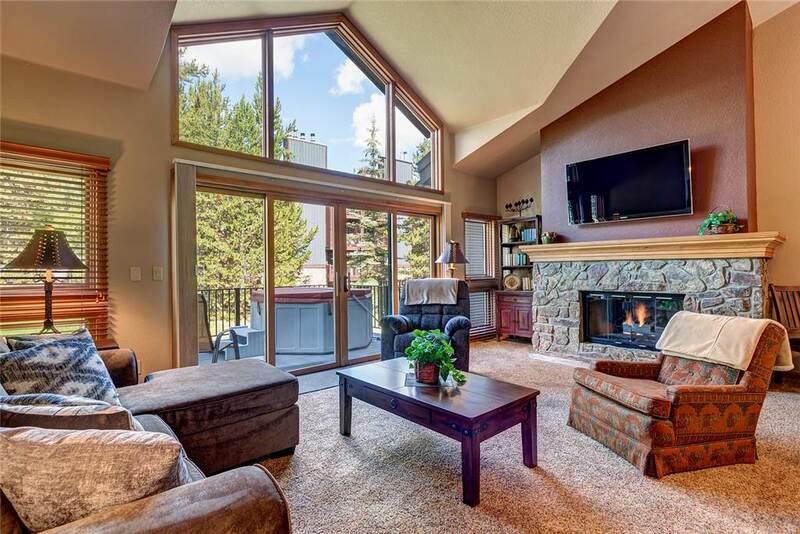 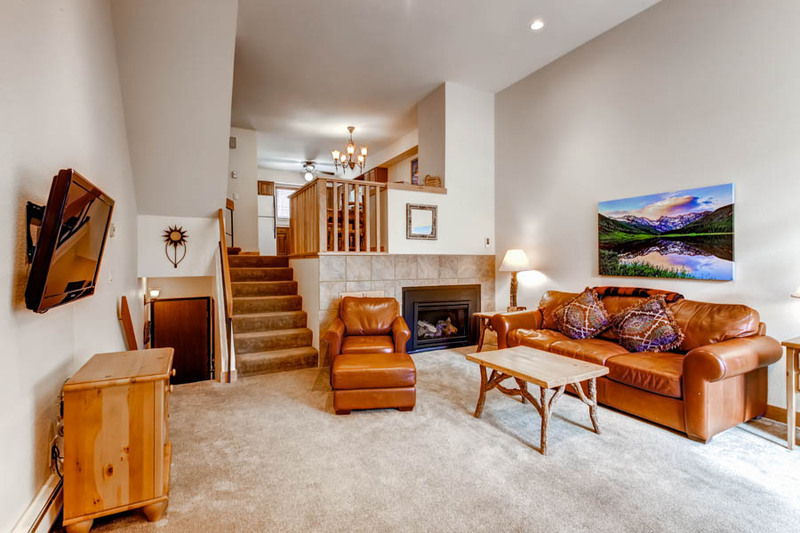 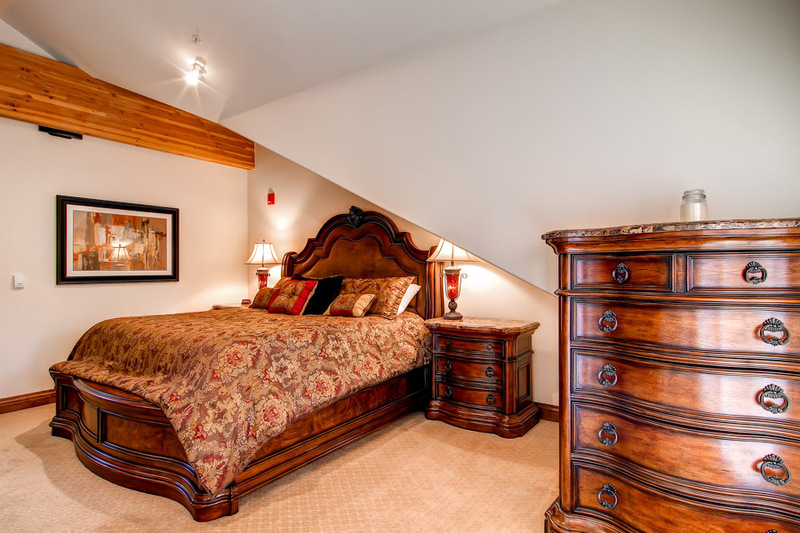 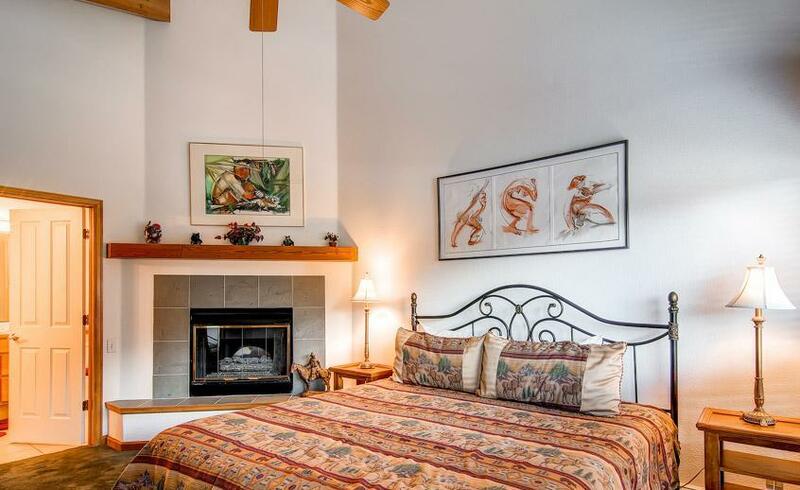 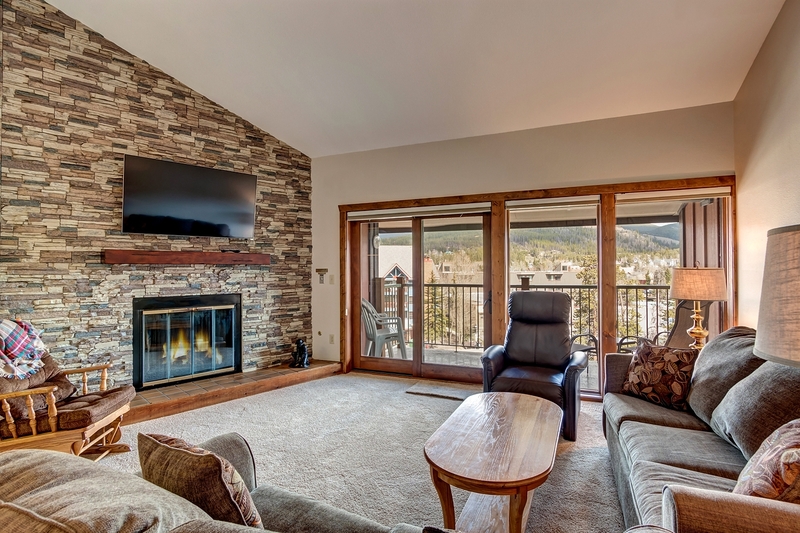 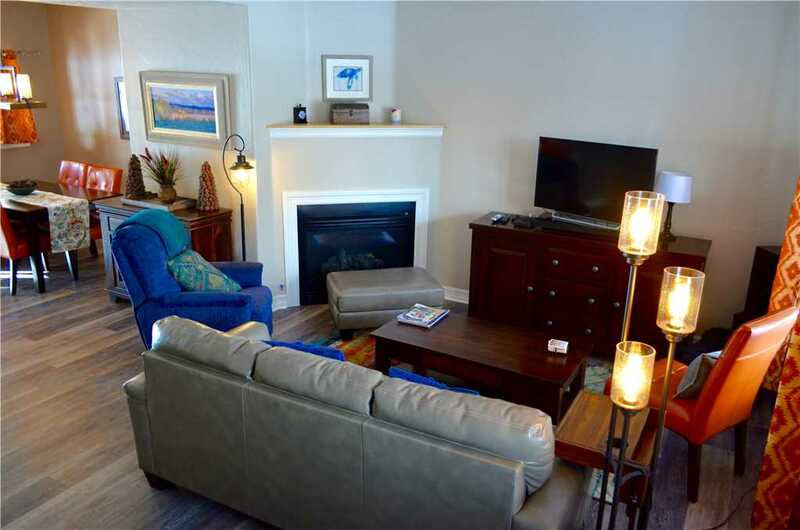 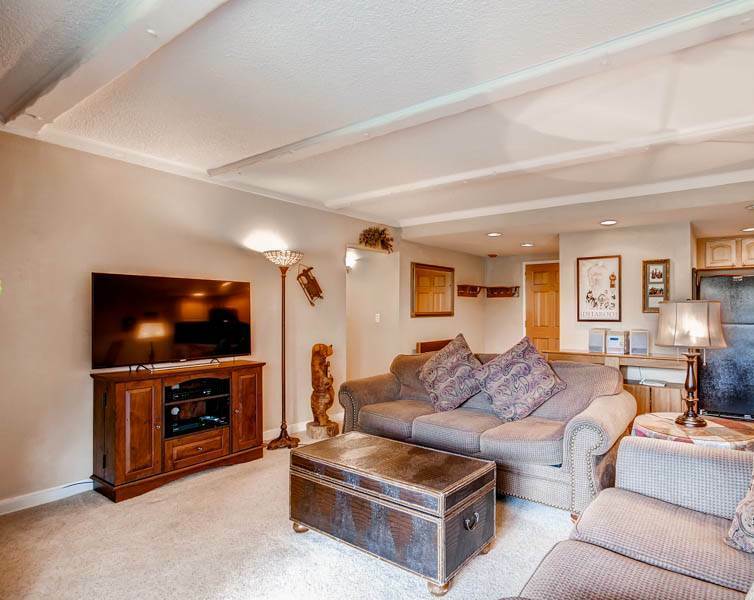 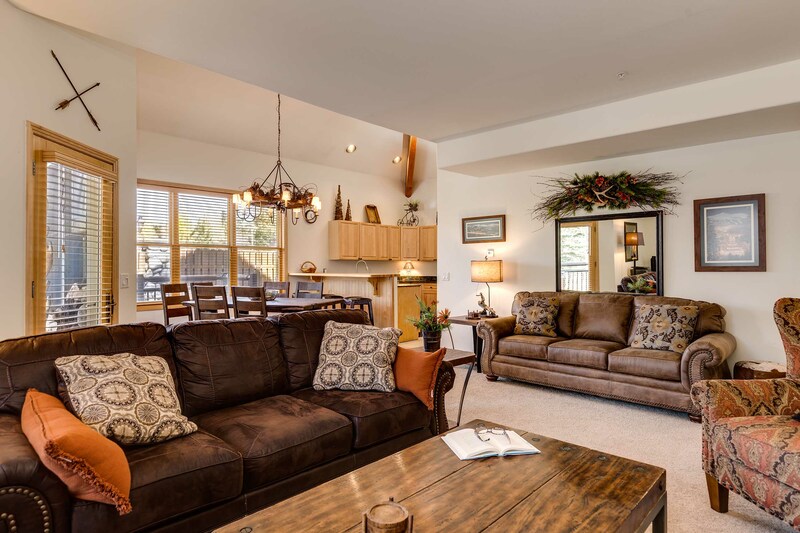 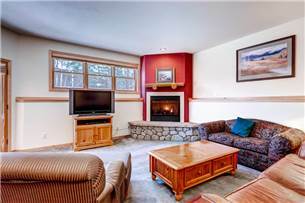 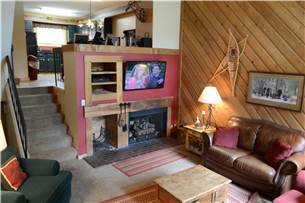 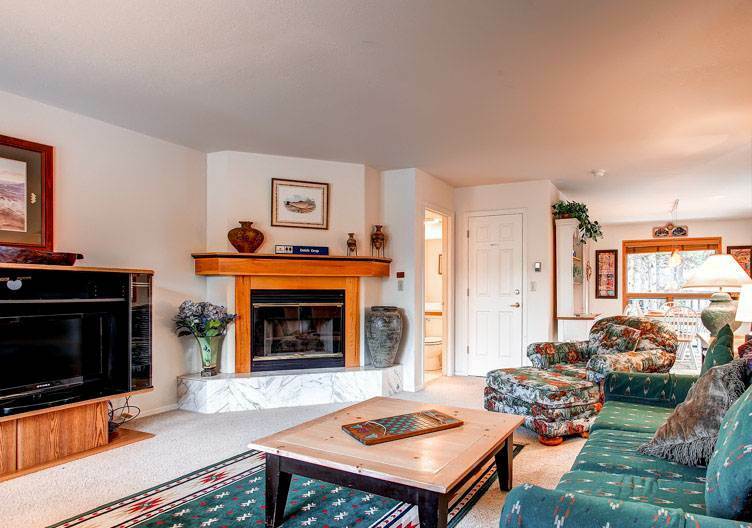 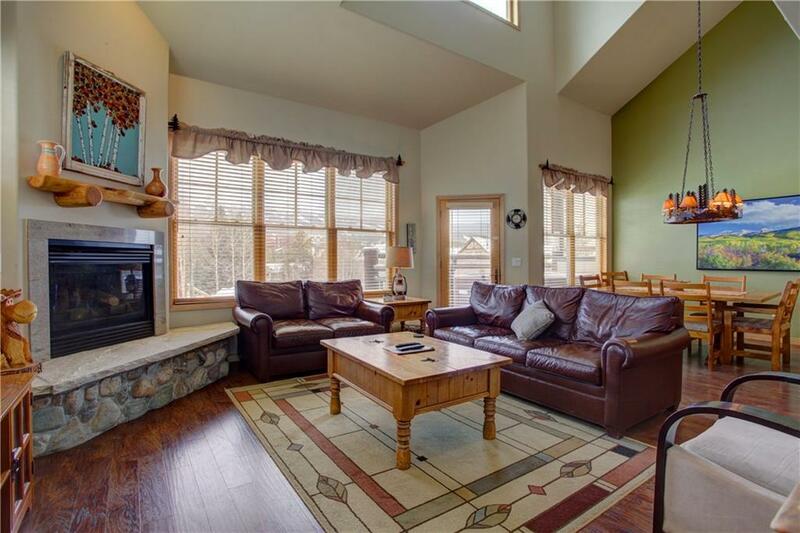 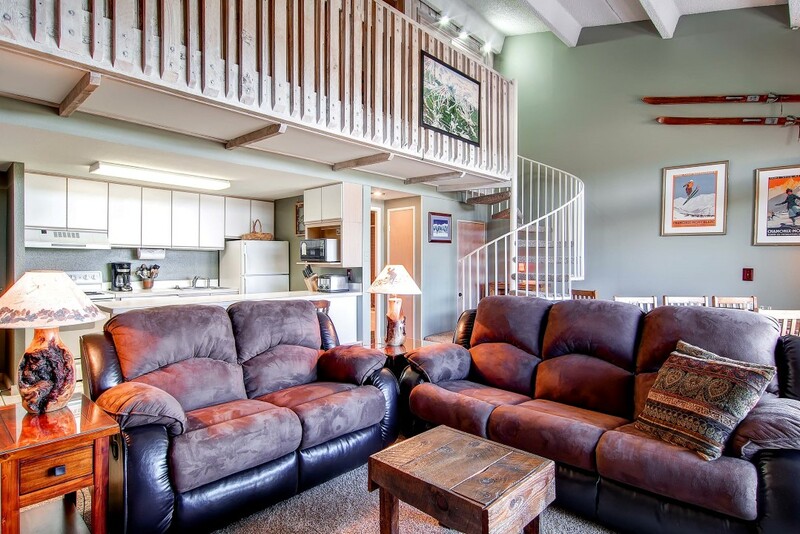 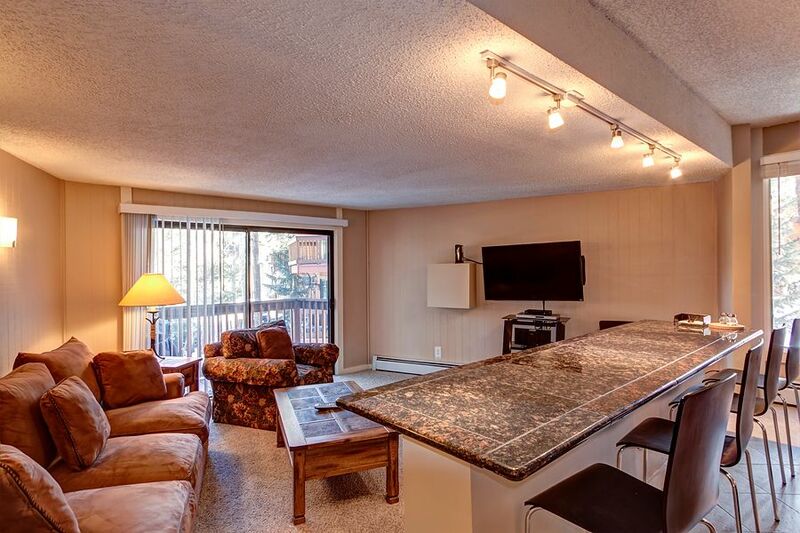 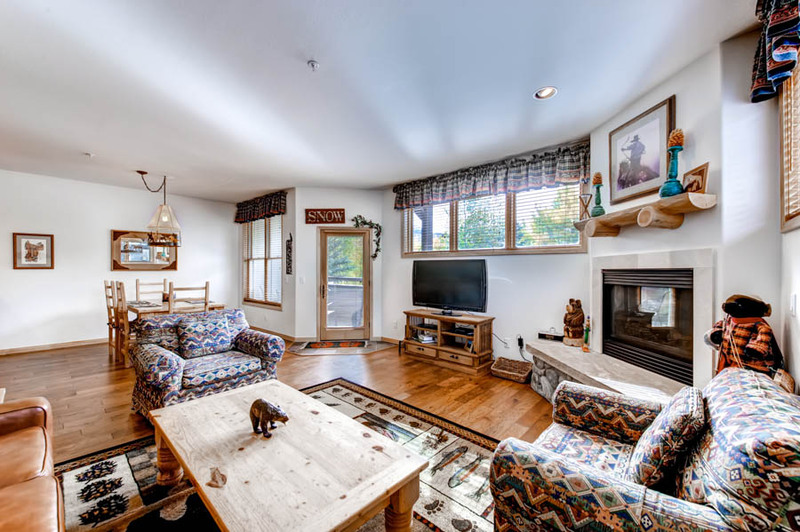 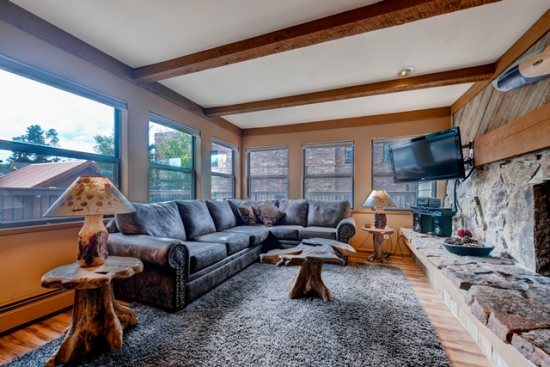 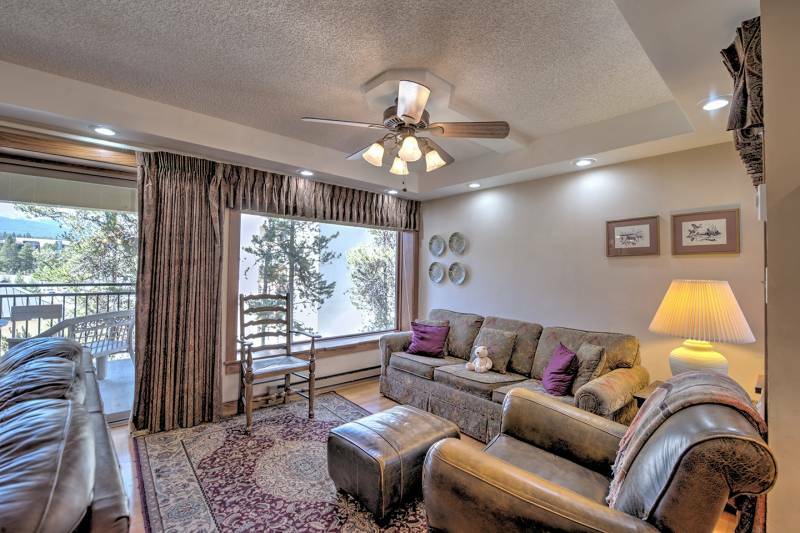 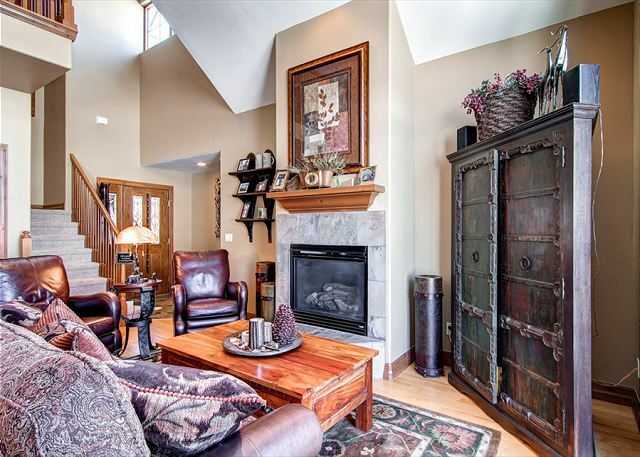 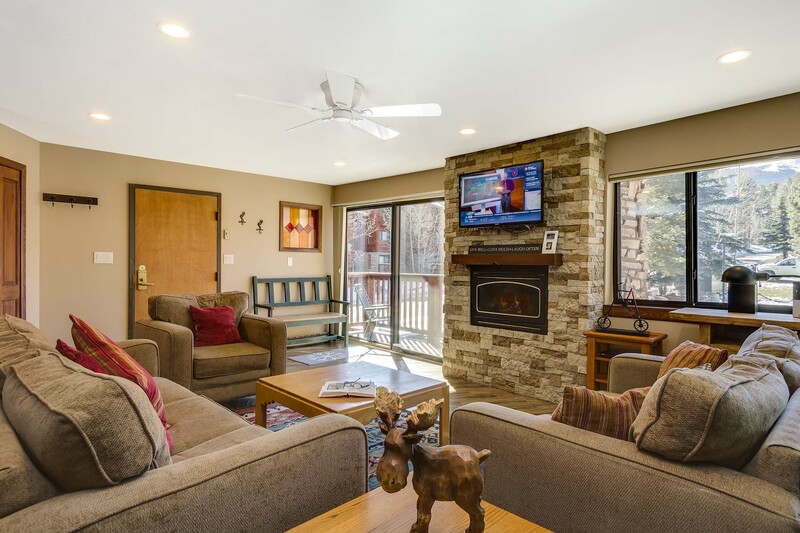 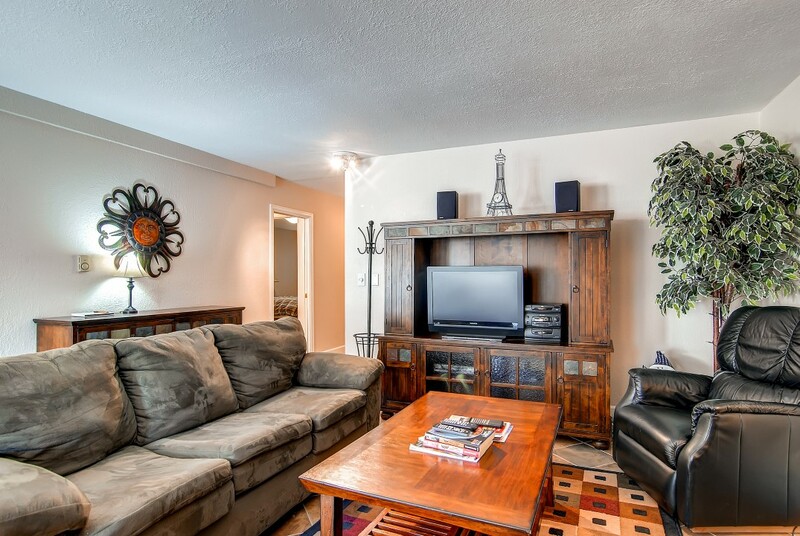 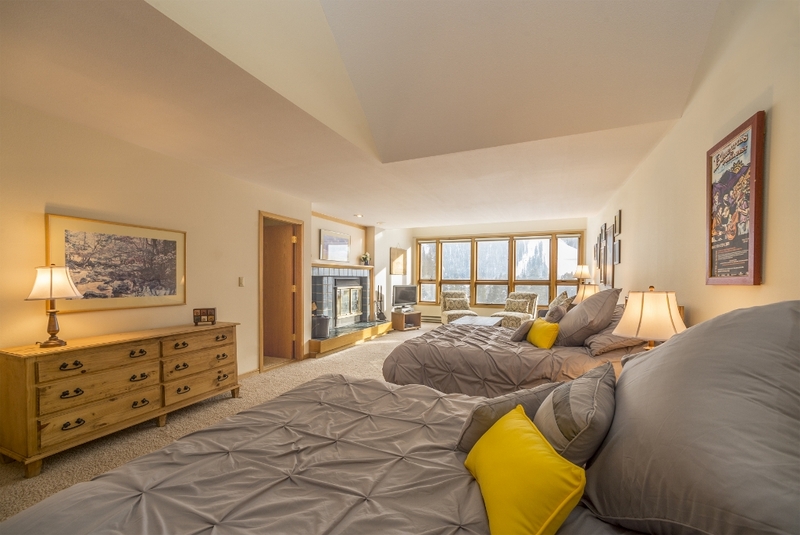 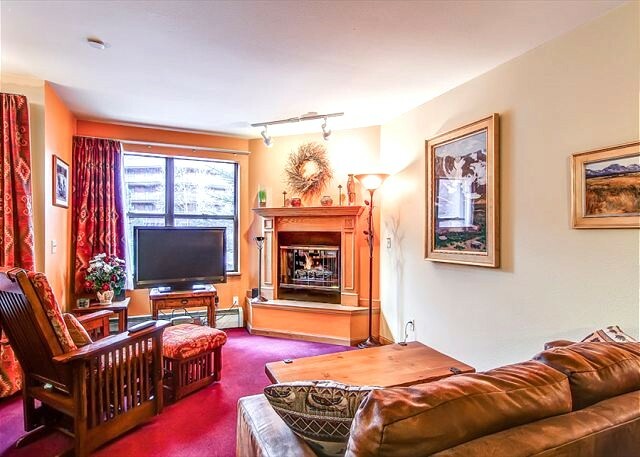 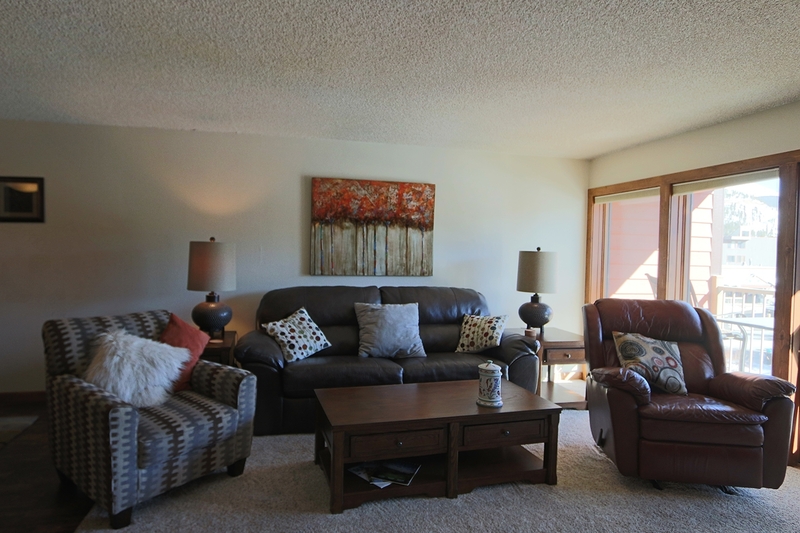 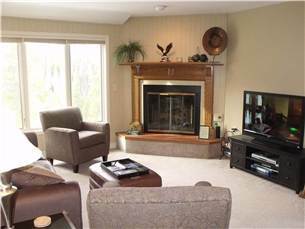 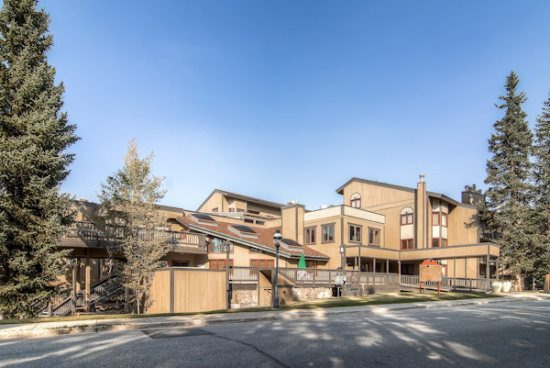 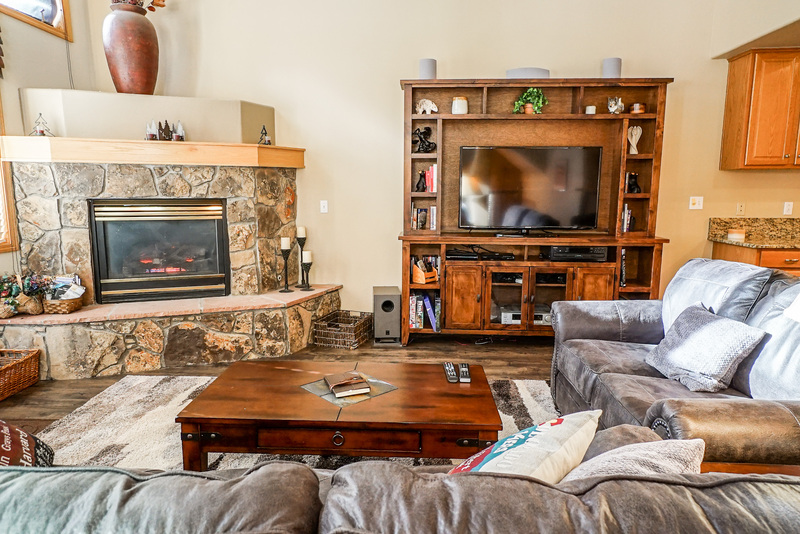 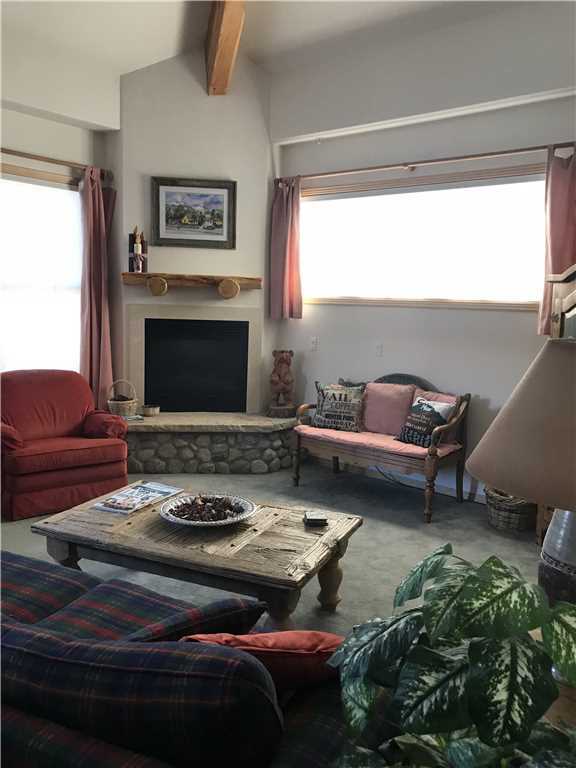 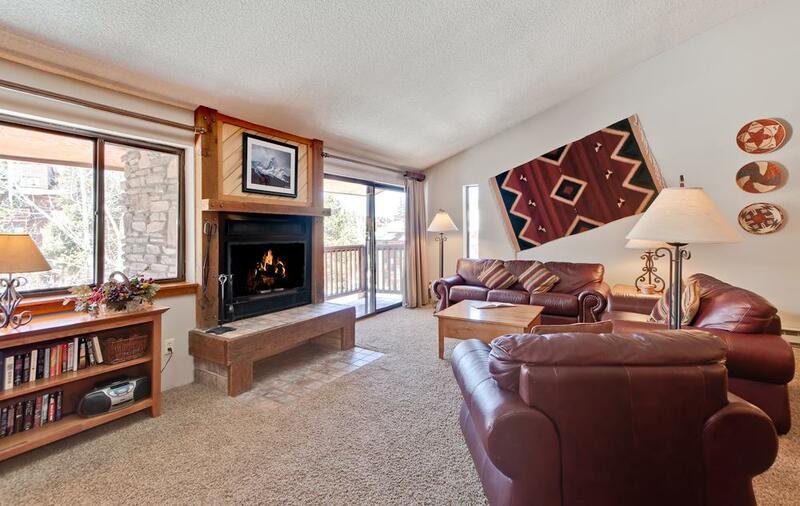 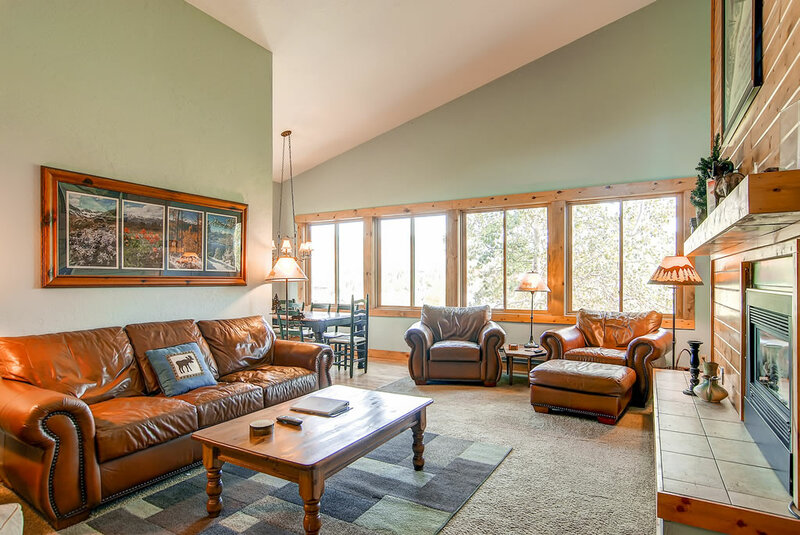 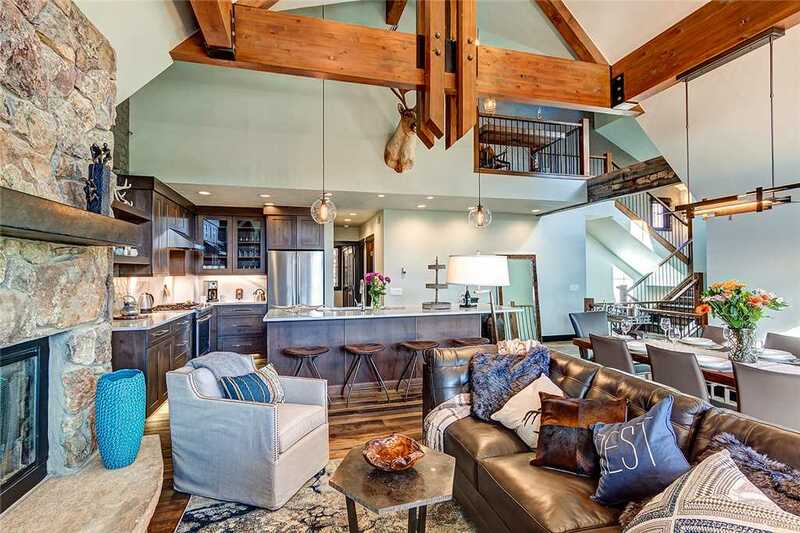 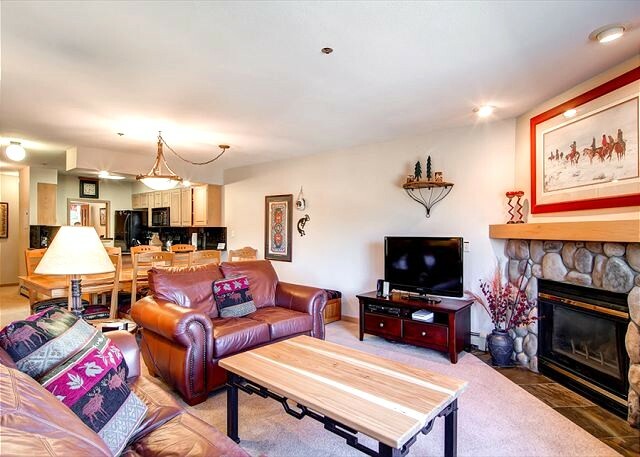 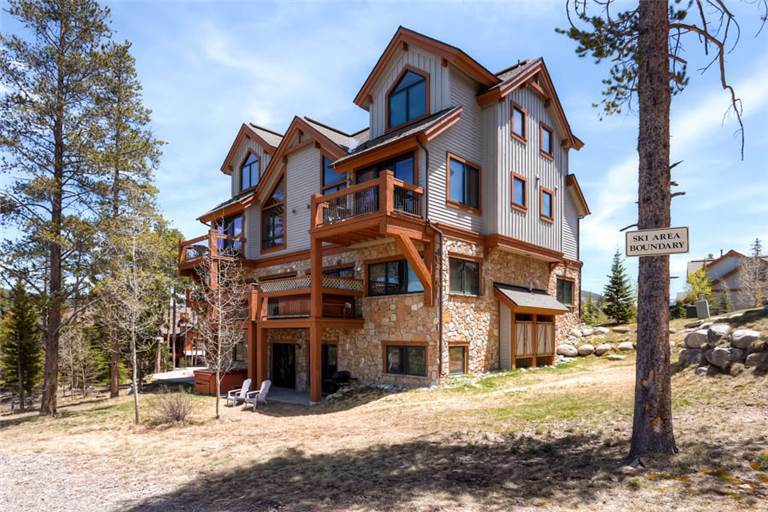 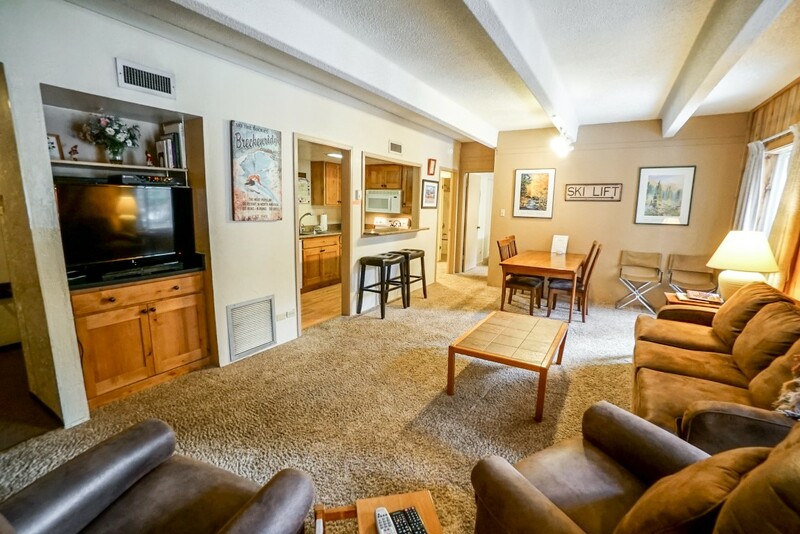 It also has a large private balcony, private washer/dryer, multiple modern TVs, WiFi, heated garage parking, ski lockers, and access to the clubhouse with an outdoor heated pool and 2-indoor/2-outdoor hot tubs.